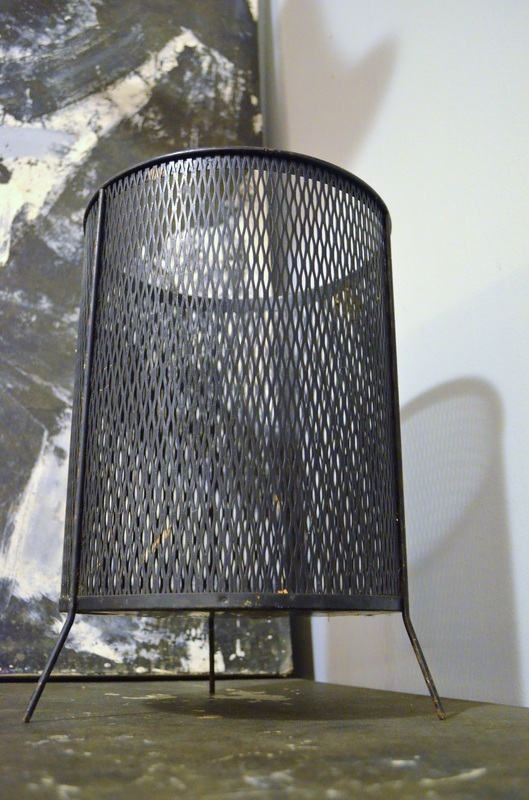 THIS LAMP IS IN GREAT SHAPE AND FUNCTIONS LIKE IT SHOULD. 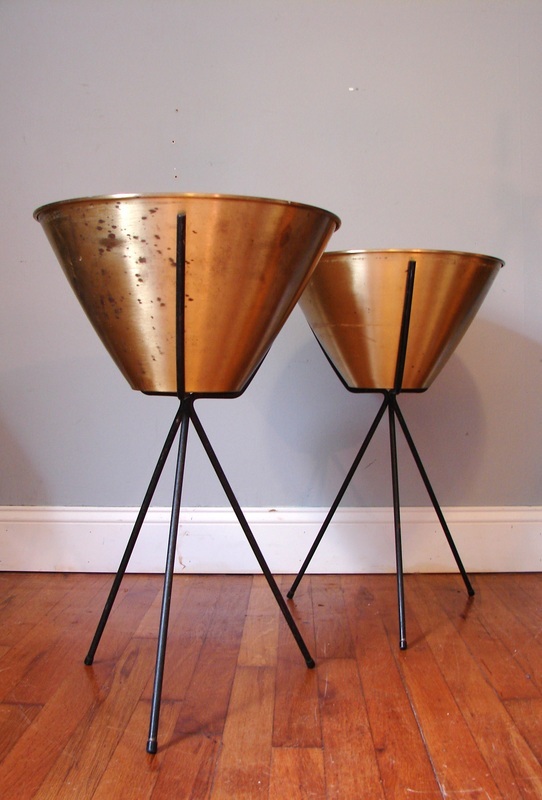 THE BRASS DOES HAVE SOME AGE RELATED PATINA BUT NOTHING THAT SHOULDN'T POLISH OFF. THIS SET OF TOOLS IS IN EXCELLENT CONDITION WITH ONLY VERY MINOR SIGNS OF AGE. THIS BOWL IS IN OKAY SHAPE. IT HAS SOME KNICKS AND DINGS BUT STILL LOOKS GREAT! THIS UNMARKED PAIR OF CHROME ARMCHAIRS ARE LIKELY A MILO BAUGHMAN DESIGN. THE CHROME IS IN EXCELLENT CONDITION BUT THE FABRIC WILL LIKELY NEED TO BE REDONE. IT SHOULD BE AN FAIRLY INEXPENSIVE JOB. THIS SET IS IN VERY NICE SHAPE. THE FABRIC ON THE SEATS NEEDS A GOOD CLEANING AND IT DOES HAVE A FEW BUMPS HERE AND THERE BUT OVERALL IT IS IN GREAT SHAPE READY TO USE! THS GREAT SET HAS REVERSIBLE TOPS. 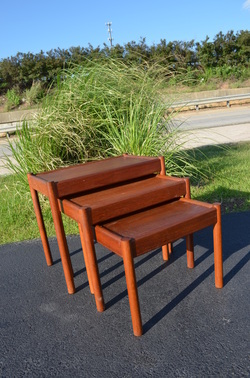 ONE SIDE IS LEATHER AND THE OTHER IS A TEAK TOP. 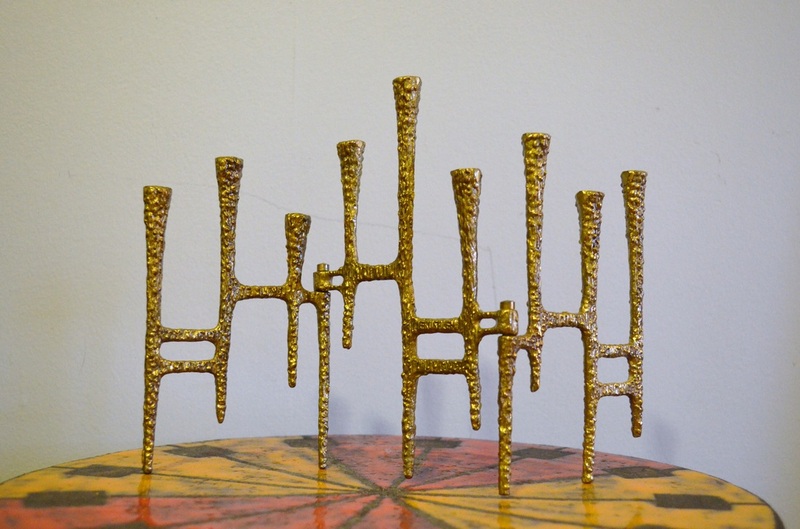 THE SET WAS MADE BY A-S ODDENSE MASKINSNEDKERI A-S, THE SAME COMPANY THAT PRODUCED ERIC BUCK'S DESIGNS. WE DO NOT KNOW WHO DESIGNED THS SET. EVERYTHING IS IN NICE SHAPE BUT THE WOOD SHOULD BE CLEANED AND TEAK OILED. THE UPHOLSTERY ON THESE CHAIR IS IN EXCELLENT SHAPE. ONE CHAIR IS IN REALLY GREAT CONDITION AND THE OTHER HAS HAD SOME REPAIRS THAT ARE SLIGHTLY NOTICEABLE. IT SHOULD BE EASY TO RECTIFY THE REPAIRS TO BE INVISIBLE. THESE CHAIRS ARE IN GREAT SHAPE. THEY SHOW SIGNS OF HONEST WEAR BUT NOTHING OUT OF THE ORDINARY. 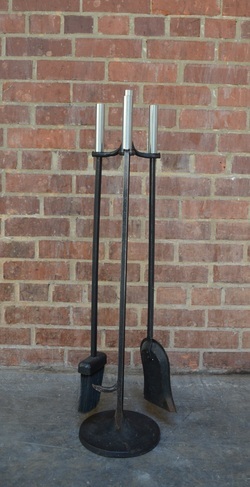 THEY ARE $250 FOR THE PAIR OR $150 EACH. THIS TRAY IS IN NEARLY PERFECT SHAPE. IT IS BLACK AND WOULD BE GREAT ON A DRESSER TO CATCH CHANGE OR KEYS! 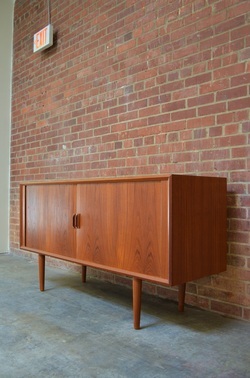 THIS CREDENZA IS IN AS FOUND CONDITION. THE CABINET IT SELF IS IN FAIRLY GOOD SHAPE BUT AT SOME POINT SOMEONE DECIDED TO REPAINT THE DOORS. ITS NOT TERRIBLE BUT YOU'LL PROBABLY WANT TO HAVE IT REDONE. 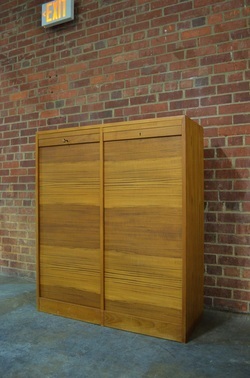 THIS CABINET IS IN REALLY GREAT SHAPE AND THE FRONT FOLDS DOWN TO EXPOSE A BAR AREA. 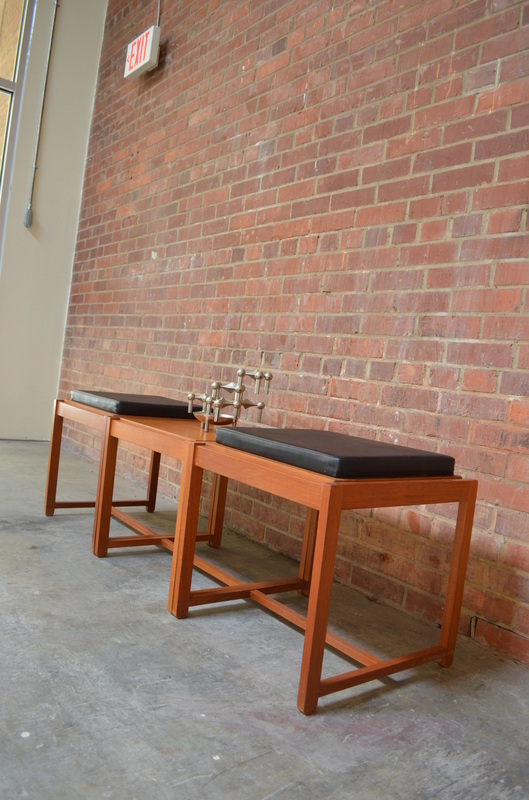 IT IS MENT TO BE ATTACHED TO A WALL AND COULD ALSO FUNCTION AS A DESK. THIS SET IS IN GREAT SHAPE, IT HAS THE ORIGINAL KEY. THE ONLY ISSUE IS ONE KEY HOLE IS MISSING THE METAL EDGING. 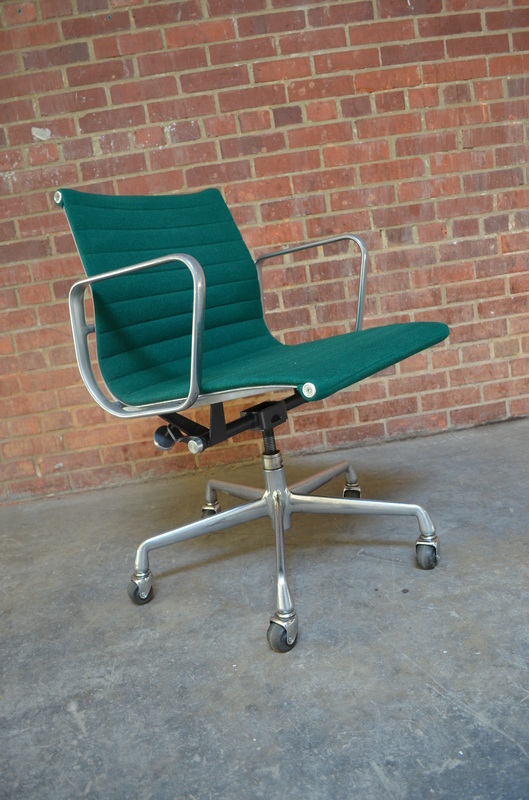 THIS EARLY KNOLL PRODUCTION IS IN GOOD SHAPE. THE FABRIC WILL NEED TO BE REDONE OR WE'RE FAIRLY CERTAIN THESE USED THE SAME FRAMES AS THE STRAP CHAIRS SO YOU COULD PROBABLY PUT STRAPS ON IT AS WELL. IT IS STRUCTURALLY SOUND, IT JUST NEEDS A NEW SEAT. 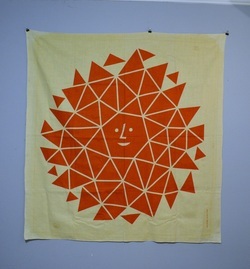 THIS IS ORIGINAL NEW OLD STOCK GIRARD FABRIC. IT HAS SOME LIGHT FOXING ON THE BACK BUT IT DOES NOT SHOW THROUGH ON THE FRONT SIDE. IT IS VERY BEAUTIFUL AND COLORFUL IN PERSON! 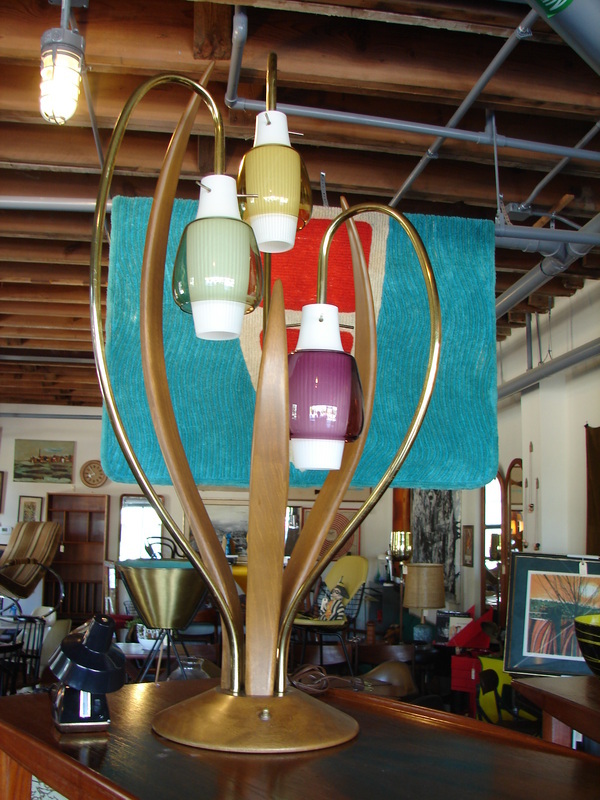 THIS LAMP IS APPROXIMATELY 43 INCHES TO THE TOP OF THE FINIAL. THAT'S OVER THREE FEET TALL! 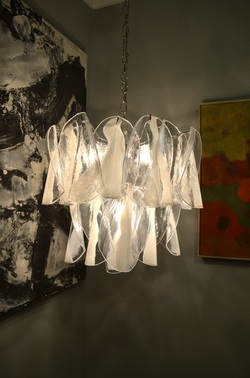 IT RETAINS ITS ORIGINAL SHADE BUT IT ISN'T PERFECT. YOU COULD CLEAN IT AND USE IT OR CHOOSE YOUR OWN. THIS PAIR IS IN EXCELLENT CONDITION WITH ALMOST NO SIGNS OF AGE. THEY WORK AS THEY SHOULD AND ARE 34 INCHES TO THE TOP OF THE FINIAL. 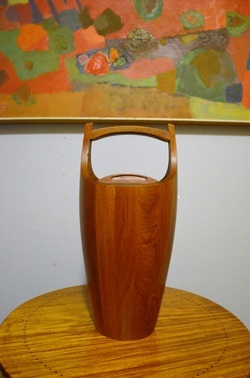 THIS JEWELRY BOX HAS WONDERFUL GRAIN AND IS IN EXCELLENT CONDITION. 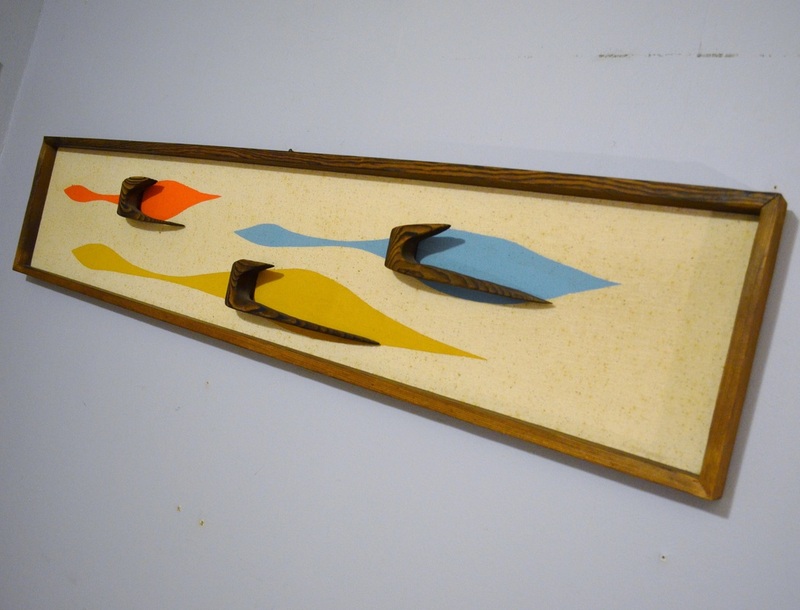 THIS EARLY PIECE IS IN NICE SHAPE. 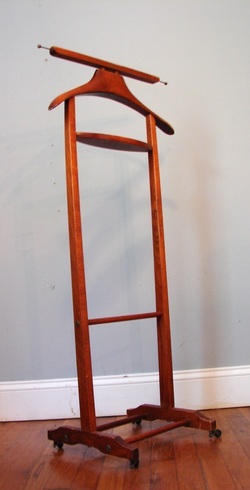 IT WILL PROBABLY NEED THE WOOD REFINISHED AND THE FABRIC REDONE OR WE'RE FAIRLY CERTAIN THE FRAME COULD TAKE STRAPS AS WELL. THIS ICE BUCKET IS IN GREAT SHAPE WITH NO MAJOR CONDITION ISSUES. READY TO USE! 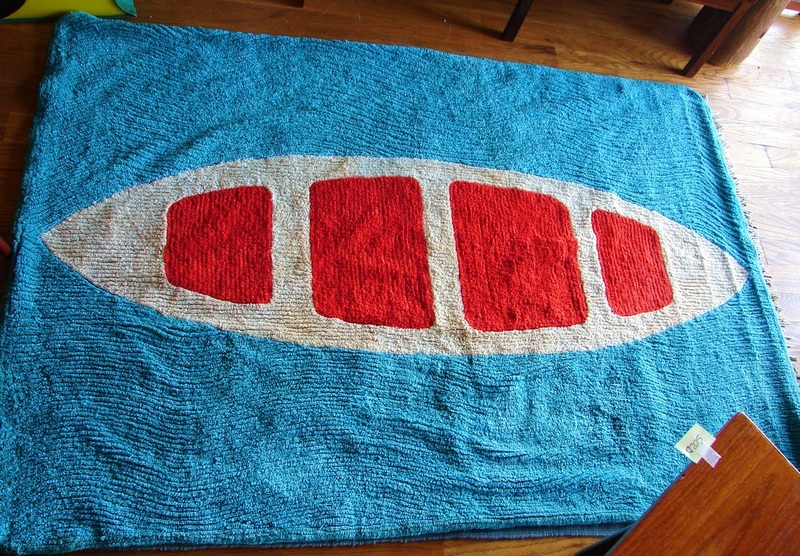 THIS GREAT AREA RUG WAS JUST PROFESSIONALL CLEANED. 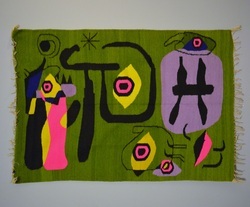 THE COLORS ARE BRIGHT, VIBRANT AND THE RUG IS SOFT AND FLUFFY. IT IS IN EXCELLENT CONDITION WITH A COUPLE OF EXTREMELY MINOR ISSUES. 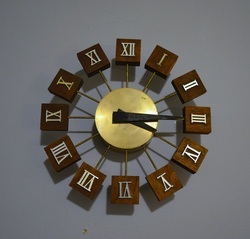 THIS CLOCK IS IN GREAT SHAPE WITH ONLY MINOR SIGNS OF WEAR. 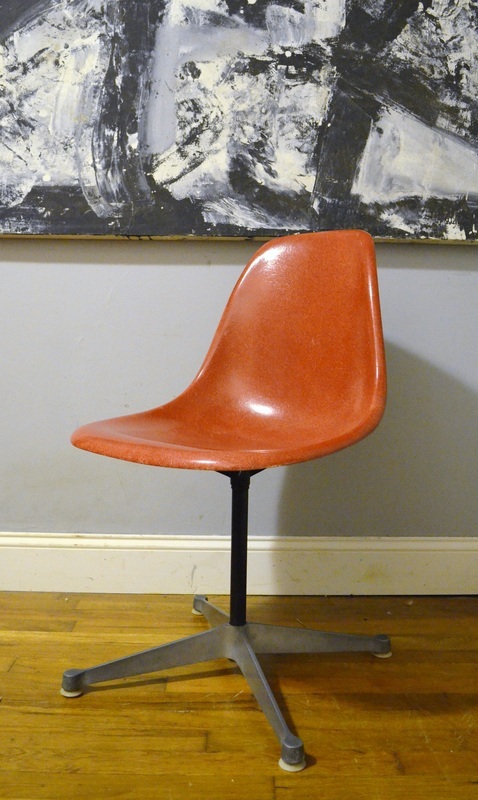 THIS EXCEEDINGLY RARE CHAIR IS IN 100% UNTOUCHED ORIGINAL CONDITION. 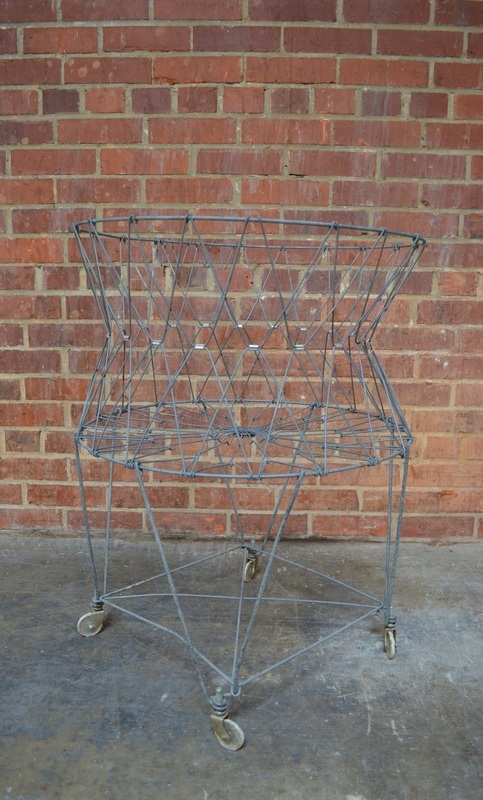 THIS IS ONE OF THE MOST DIFFICULT SHELL CHAIR DESIGNS TO COME ACROSS! IT IS IN USED CONDITION AND SHOWS ITS AGE. IT IS STILL FUNCTIONAL. 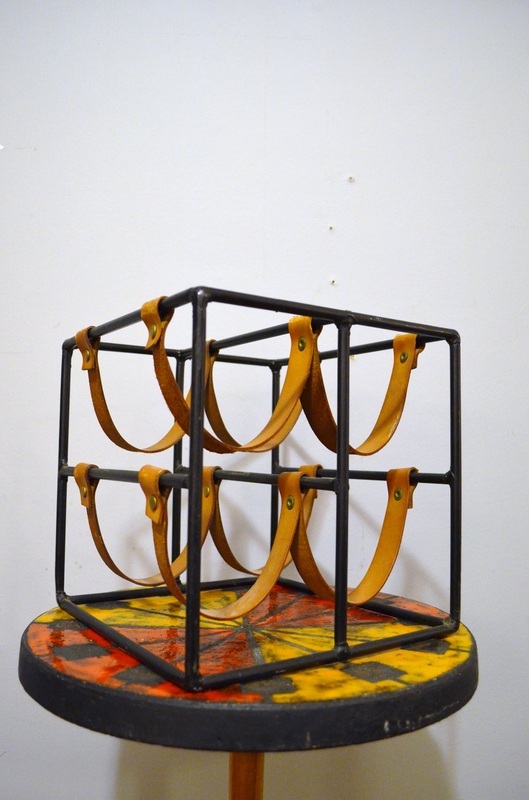 THIS REMARKABLE SET IS IN EXCELLENT CONDITION IT WILL NEED NEW ROPE BUT IT IS IN OVERALL GREAT SHAPE. THIS TABLE IS SUPER EARLY AND DOES SHOW SIGNS OF USE. IT HAS BEEN REFINISHED AND IT HAS SOME BLACK WATER MARKS ON TOP. YOU WILL LIKELY NEED TO STRIP IT, USE WOOD BLEACH AND THEN RESTAIN AND FINISH. 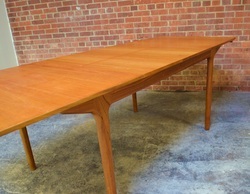 THIS DINING TABLE IS IN EXCELLENT ORIGINAL CONDITION. 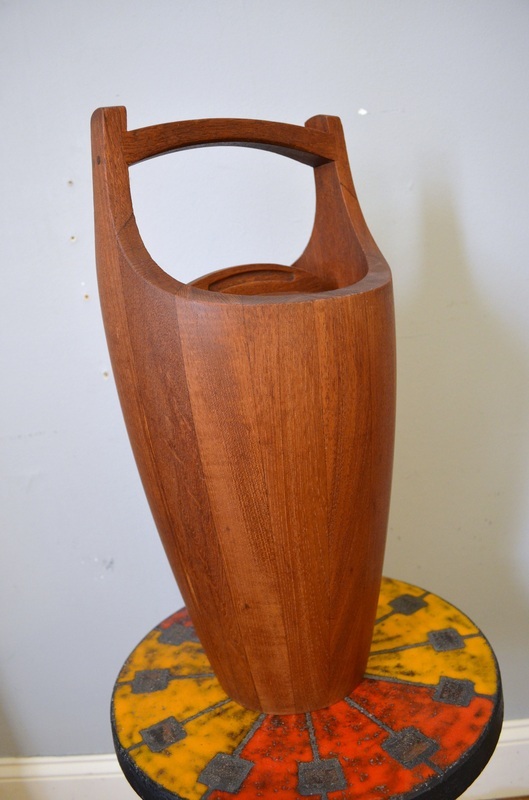 WE THINK IT IS MOLLER BUT HAVE BEEN UNABLE TO TRACK IT DOWN SINCE IT IS UNMARKED. 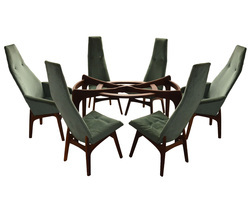 IT WAS PAIRED WITH MOLLER DINING CHAIRS. THE LEGS UNSCREW AND IT HAS TWO LEAVES. IT IS 45.5 WIDE AND EACH LEAF ADDS 19.75 INCHES. IT IS 29 INCHES TALL. 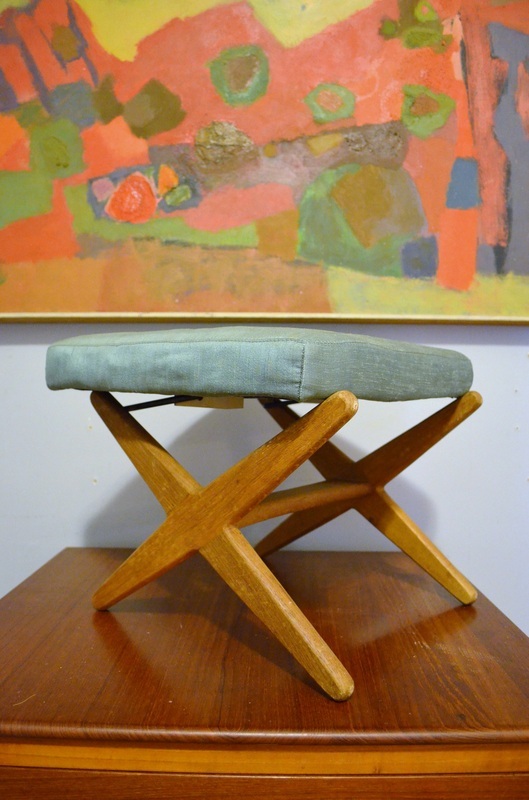 THIS CHAIR IS IN EXCELLENT STRUCTURAL CONDITION BUT WILL NEED NEW FABRIC. IT IS UNMARKED BUT IS SEEMS TO HAVE ALL THE HALLMARKS OF BEING MADE BY DUX. THIS CHAIR IS IN REALLY GREAT SHAPE. THE FABRIC IS IN NICE CONDITION BUT IT WILL NEED NEW FOAM. THIS PAIR OF BAR STOOLS IS IN GREAT CONDITION. 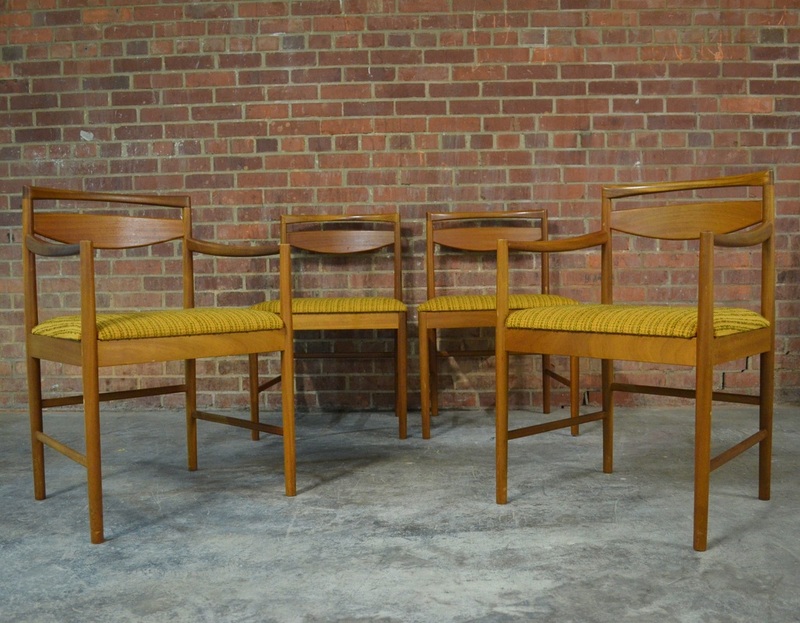 THE SOLID TEAK FRAMES ARE STILL VERY STURDY. THEY HAVE CONTRASTING SOLID ROSEWOOD FOOT RESTS. THE VINYL UPHOLSTERY IS IN OKAY SHAPE, IT DOES HAVE A FEW BLEMISHES. THIS INCREDIBLE PAIR OF CHAIRS IS SUPER COMFY. WE THINK THEY MAY BE SELIG BUT THEY ARE UNMARKED. THE FABRICS NOT IN BAD SHAPE, ITS JUST BAD. THIS DESK IS IN EXCEPTIONALLY GOOD SHAPE, READY TO USE! 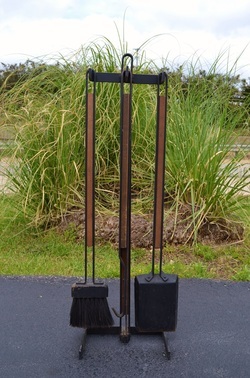 THIS SET IS IN GREAT SHAPE AND RETAINS ITS ORIGINAL BLACK LEATHER. THIS SET IS IN GREAT SHAPE, JUST NEEDS A POLISH! 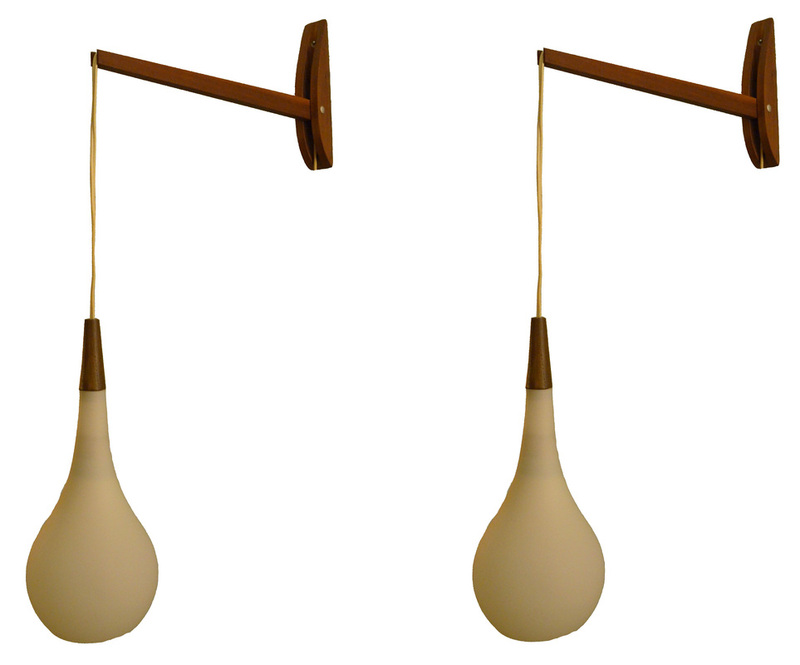 THIS PAIR OF ADJUSTABLE WALL LAMPS ARE GREAT. 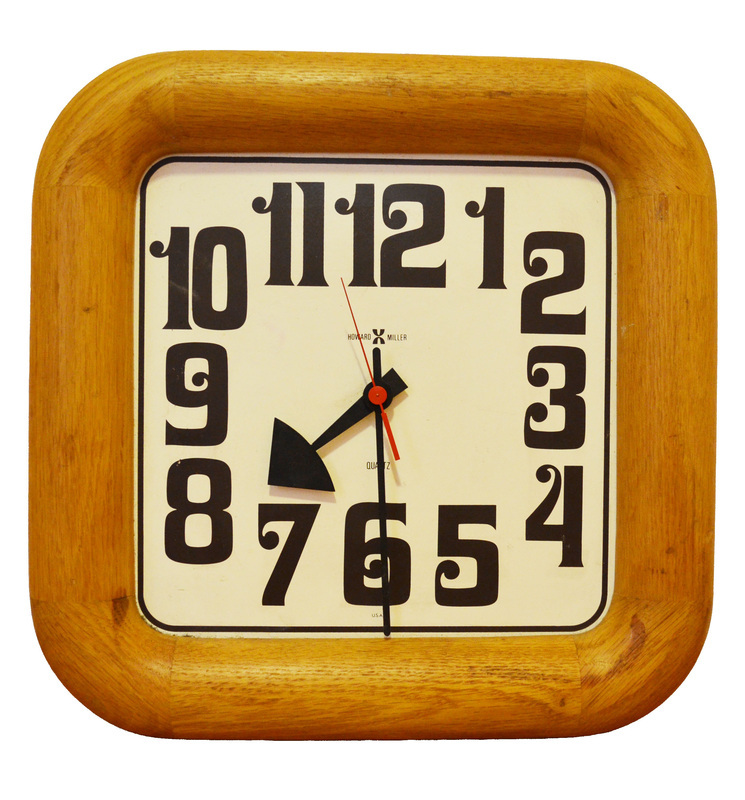 THEY ARE MADE FROM SOLID TEAK AND FROSTED GLASS. ONE LAMP HAS A COUPLE OF TINY CHIPS TO THE RIM OF THE GLASS. IT ISN'T NOTICEABLE UNLESS YOU FLIP IT. THIS LAMP IS IN EXCELLENT OPERATIONAL CONDITION. 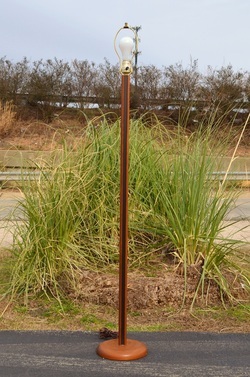 IT IS 34.75 INCHES TO THE TOP OF THE FINIAL. 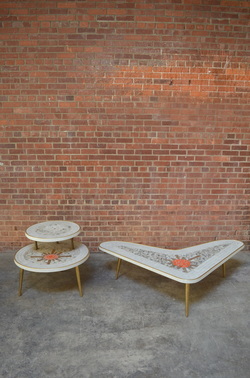 IF YOU PURCHASE THIS WITH THE MATCHING COFFEE TABLE WE HAVE THE SET WILL BE $850. 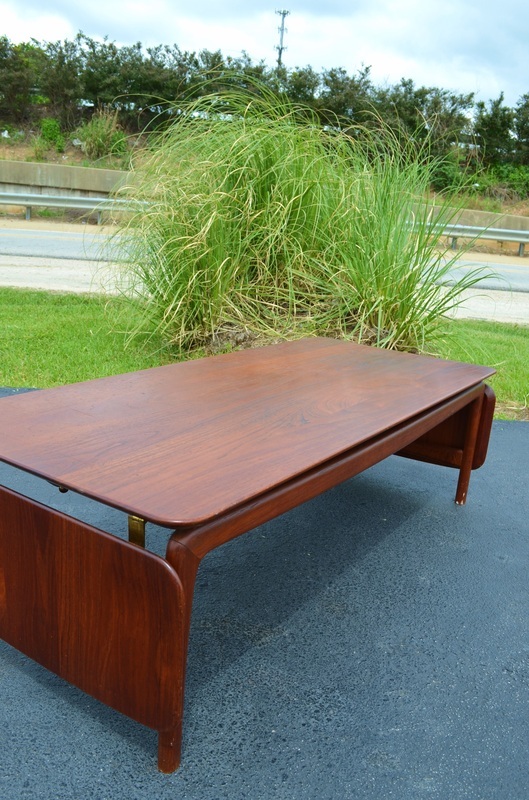 THIS COFFEE TABLE IS IN EXCELLENT CONDITION. 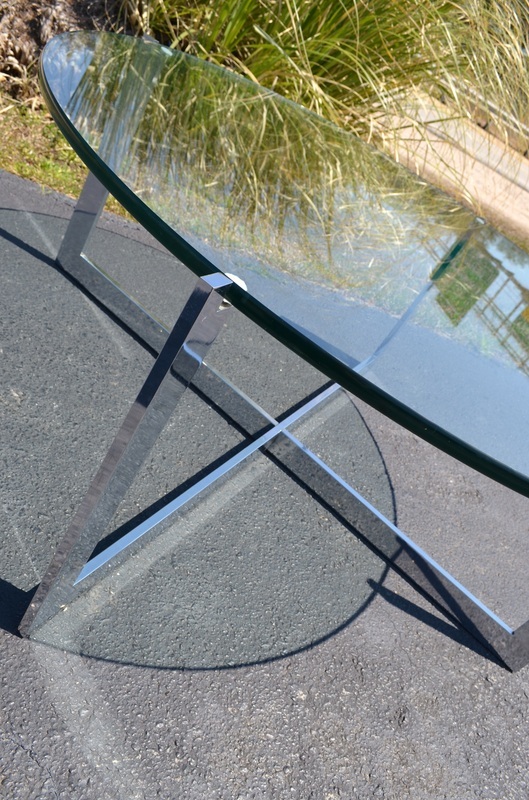 THE GLASS IS NEARLY FLAWLESS AND THE CHROME IS SHINY AND FLAW FREE. THE ONLY ISSUE IS THE WELD THAT HOLDS THE TWO PIECES TOGETHER HAS BECOME LOOSE BUT WHEN THE GLASS IS IN PLACE YOU WOULD NEVER KNOW. 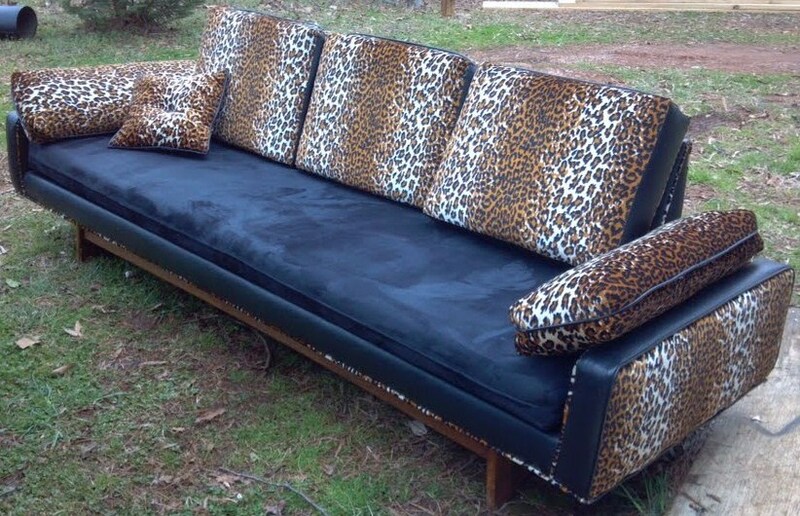 THIS SOFA HAS GREAT LOOKS BUT WILL NEED SOME WORK. THE WOOD IS IN VERY NICE SHAPE BUT THE UPHOLSTERY HAS TO GO. THE FRAME ON THE BACK SOFA DOESN'T SIT PERFECTLY FLAT, WE THINK IT WAS IN A HUMID ENVIRONMENT AND MAY GO BACK DOWN ON ITS OWN. OR YOU COULD TRY TO FIX IT, EITHER WAY IT SHOULD BE AN EASY-ISH REPAIR. 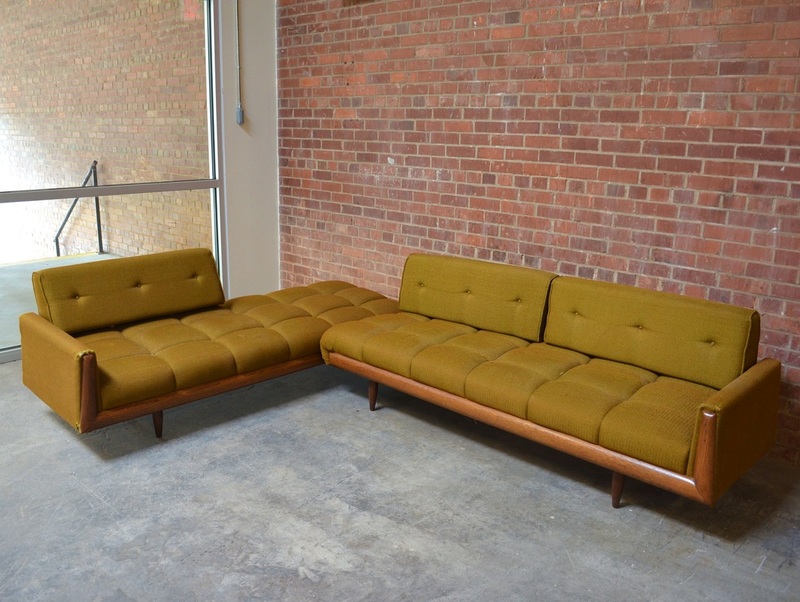 THIS SET WILL BE SUPER STUNNING ALL REDONE, IT CAN BE USED AS A SECTIONAL OR PUSHED TOGETHER TO MAKE AN INCREDIBLY LONG SOFA. 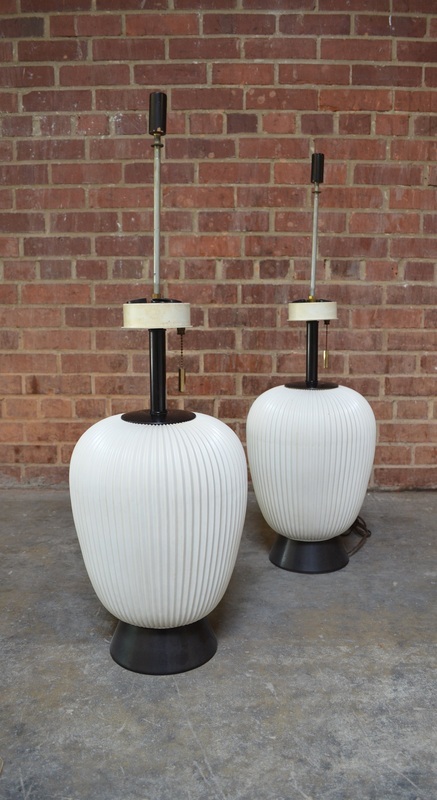 THIS PAIR OF LAMPS IS IN DECENT SHAPE. THEY COULD USE SOME GENERAL CLEANUP AND WILL NEED FINIALS AND SHADES. ONES SWITCH APPEARS NOT TO WORK. 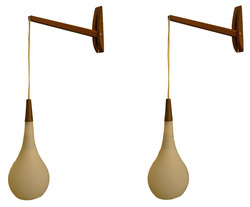 THIS PAIR OF LAMPS IS IN DECENT SHAPE. ONE HAS A SMALL HAIRLINE AND SOME OF THE APPLIED FINISH IS PEELING. THEY ARE IN OTHERWISE EXCELLENT USABLE CONDITION. 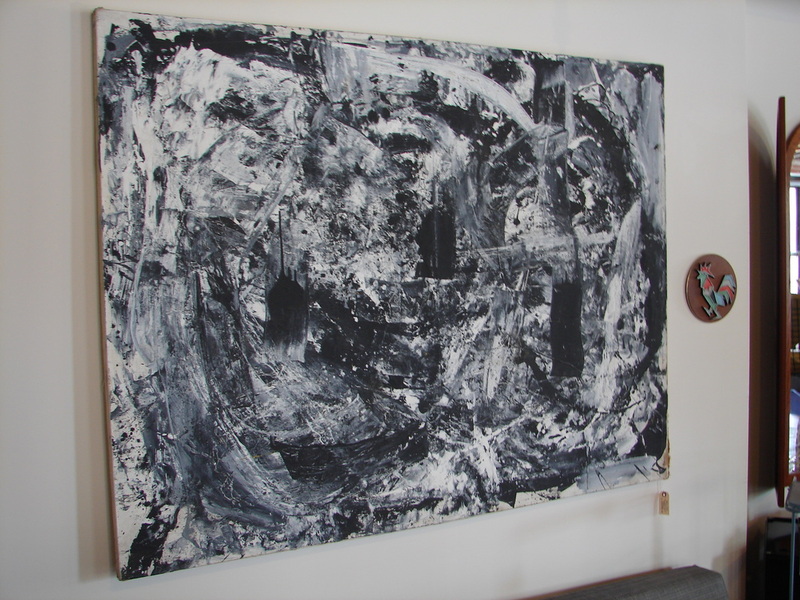 THIS MASSIVE PAINTING IS EXTREMELY WELL DONE AND APPEARS TO BE FROM THE 1960'S. 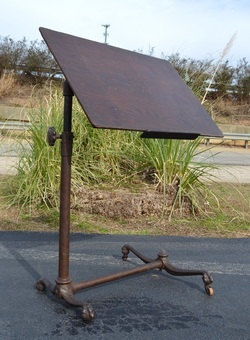 IT CAME OUT OF DC AND WAS LIKELY A WELL KNOWN ARTIST BUT WE CANNOT FIND OUT ANY INFORMATION AS IT IS ONLY SIGNED D J M.
THIS TABLE IS IN GREAT SHAPE AND HAS BRASS INSERTS ON THE INSIDE OF THE LEGS. 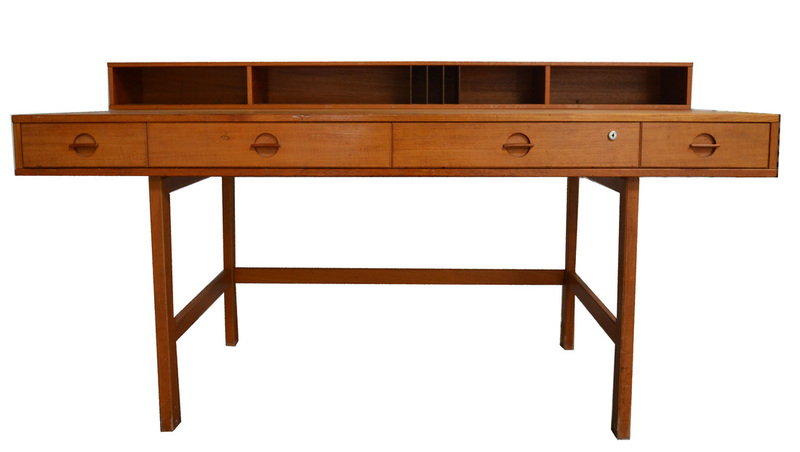 IT IS COMPRISED OF MOSTLY SOLID TEAK AND BREAKS DOWN BY UNSCREWING FOUR ALLEN KEY SCREWS FROM THE LEGS AND FOUR SCREWS FROM THE TOP. SUPER SIMPLE. 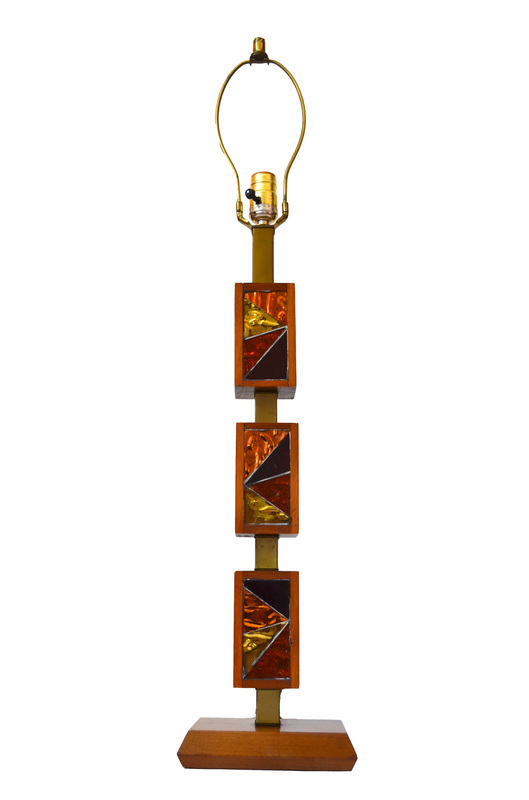 IT IS 27.5 BY 27.5 INCHES BY 19 TALL. IT CAN EITHER BE USED AS A SMALL COFFEE TABLE OR A LARGE END TABLE. THIS SET IS IN VERY NICE SHAPE, NO MISSING TILES! 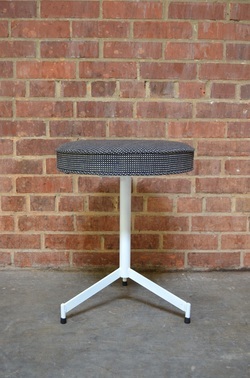 THIS STOOL IS IN EXCELLENT READY TO USE CONDITION. IT HAS A REALLY NICE LABEL, SOFT FOAM AND THE FABRIC IS VERY CLEAN AND FREE OF ANY WEAR. 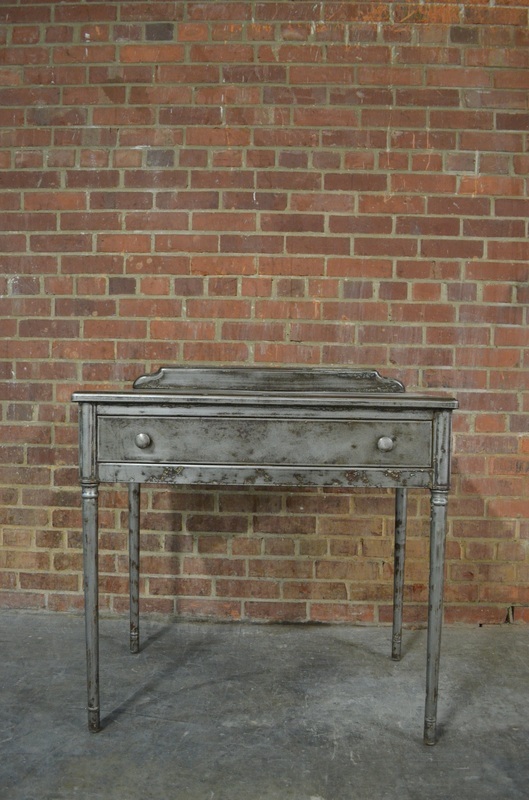 THIS CHEST IS IN GREAT VINTAGE CONDITION WITH WEAR CONSISTENT WITH AGE. 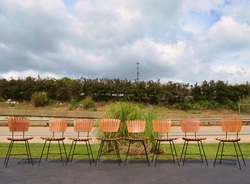 THIS SET OF CHAIRS IS IN GREAT SHAPE. THEY ARE VERY STURDY. YOU WILL LIKELY WANT TO HAVE THEM RECOVERED. EXCELLENT CONDITION WITH ONLY MINOR SIGNS OF AGE. THIS LITTLE JEWELRY BOX IS STUNNING IN PERSON. WE'VE SEEN IT ATTRIBUTED TO ARTHUR UMANOFF. 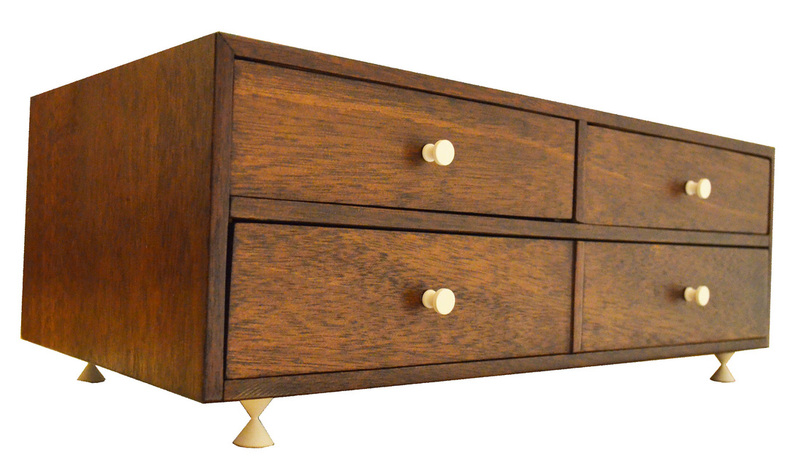 THE WHITE KNOBS CONTRAST WITH THE WALNUT SO WELL. THE HOURGLASS SHAPED FEET MAKE THE BOX LOOK LIKE ITS FLOATING. 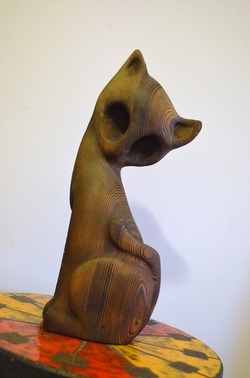 THIS CAT IS IN GREAT SHAPE AND IS MUCH MORE IMPRESSIVE IN PERSON. THIS CHAIR HAS GREAT EXPOSED JOINERY AND IS IN EXCELLENT STURDY CONDITION. 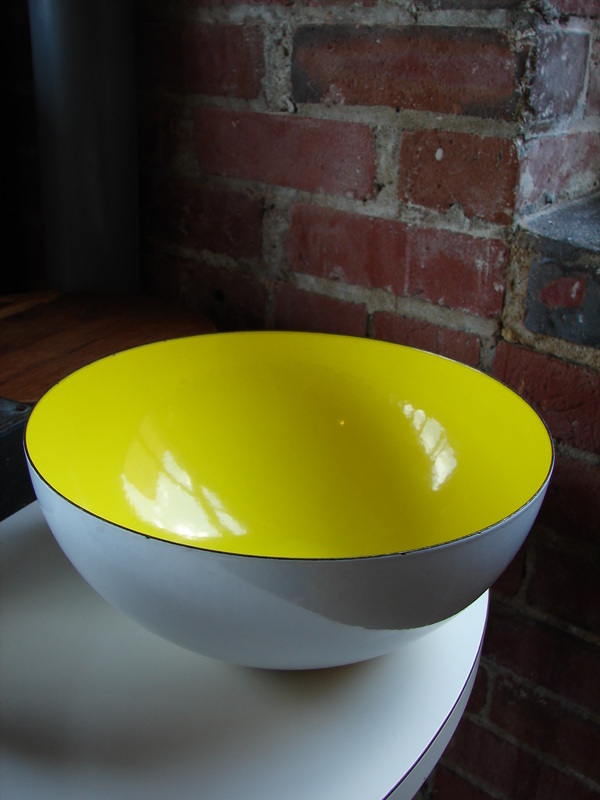 THIS BOWL IS IN NEARLY PERFECT SHAPE. I BELIEVE IT IS THE 10" VERSION. THIS BOWL IS IN GREAT SHAPE. IT HAS A COUPLE OF DINGS BUT NOTHING MAJOR. IT HAS A REALLY NICE CLEAR MARK, I BELIEVE IT IS THE 10" VERSION. 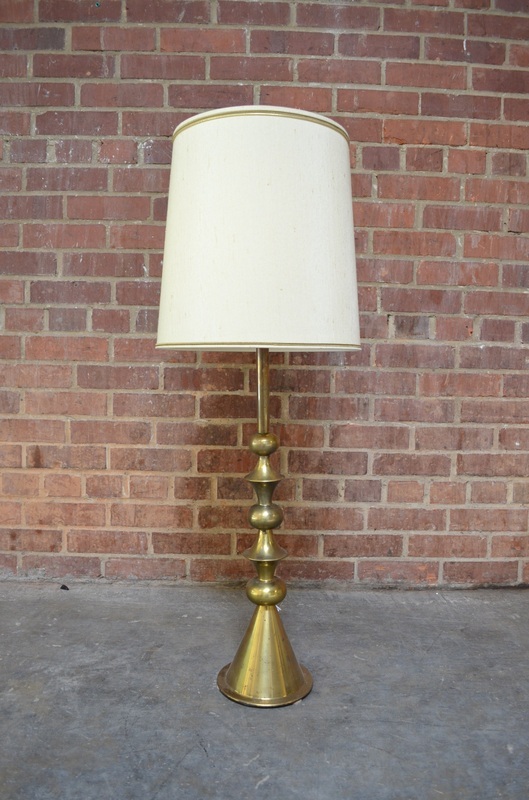 THIS LAMP IS IN NEARLY PERFECT CONDITION. IT IS READY TO USE! 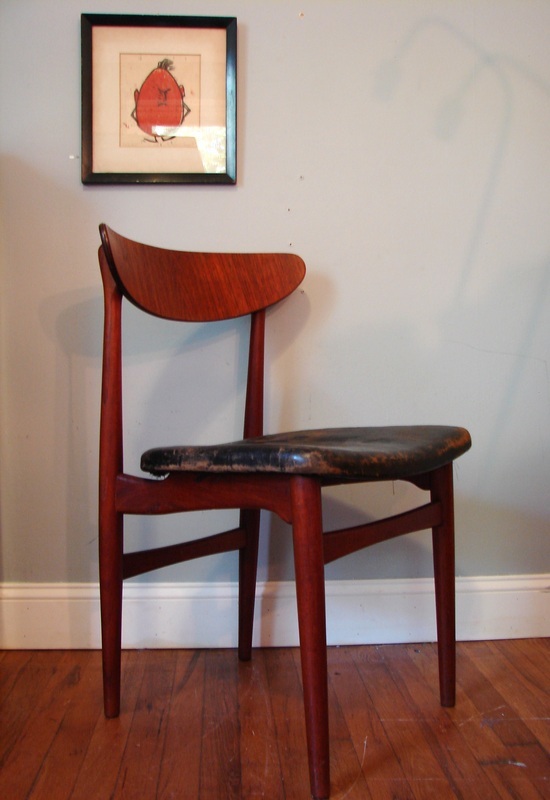 THIS CHAIR IS IN EXCELLENT CONDITION AND THE PROPORTIONS ARE VERY GENEROUS. 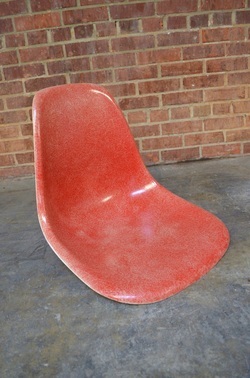 THIS SHELL IS A BEAUTIFUL COLOR AND RETAINS ITS ORIGINAL, SUPER HARD TO FIND ROCKER BASE. IT IS NOT A REPRO! 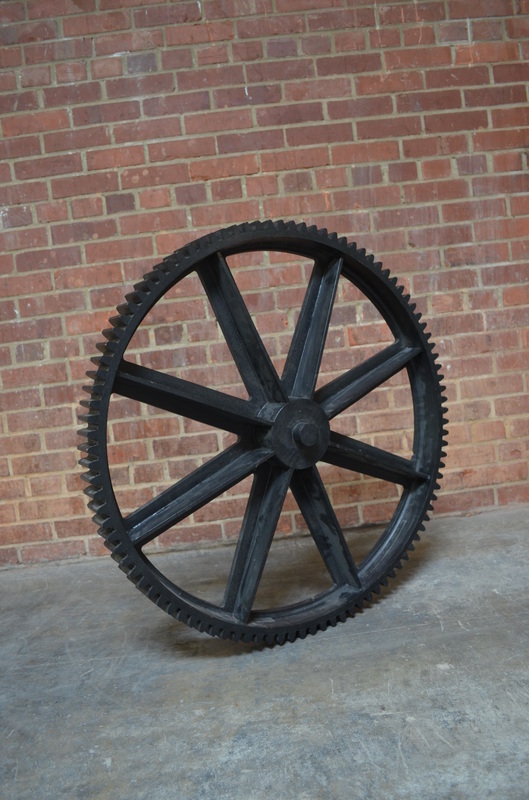 THIS IS ONE OF THE RAREST MILLS AND IT IS IN EXCELLENT CONDITION. 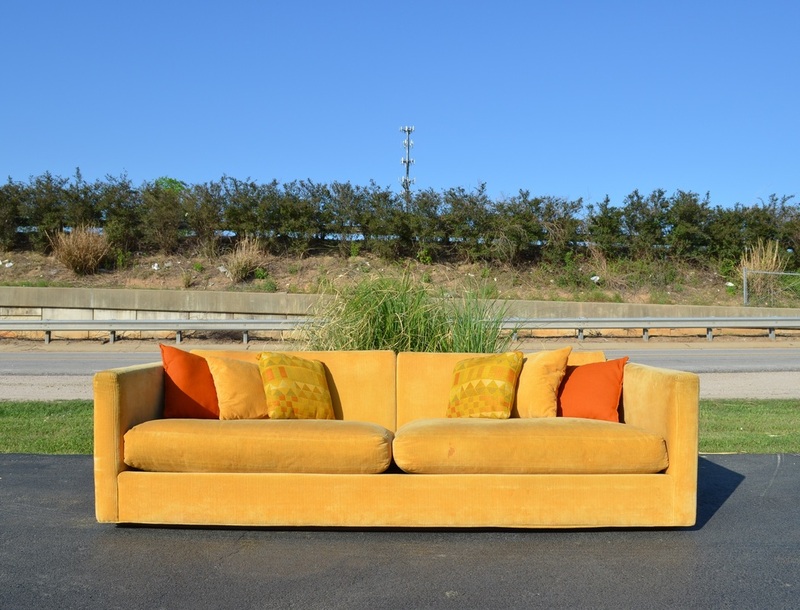 THIS SMALL SOFA IS IN GREAT CONDITION. IT DOES HOWEVER NEED NEW FABRIC. THIS DESK IS IN EXCELLENT CONDITION. 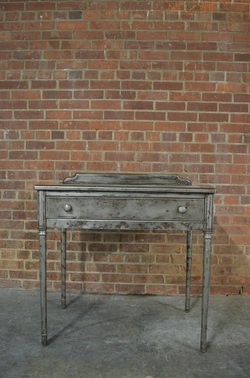 IT IS CURRENTLY ON HOLD BUT WE HAVE A THREE DRAWER VERSION AVAILABLE AS WELL! IT WILL BE PHOTOGRAPHED SOON. 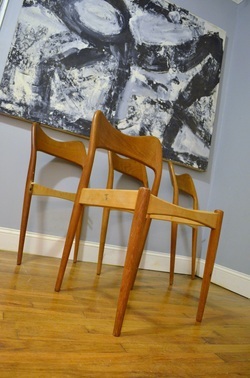 THIS SET OF FOUR CHAIRS IS IN REALLY NICE SHAPE. THE FABRIC WAS REDONE IN THE 1990'S BUT YOU'LL PROBABLY WANT TO REDO IT AGAIN. THE CHROME HAS ONLY MINOR SIGNS OF WEAR. 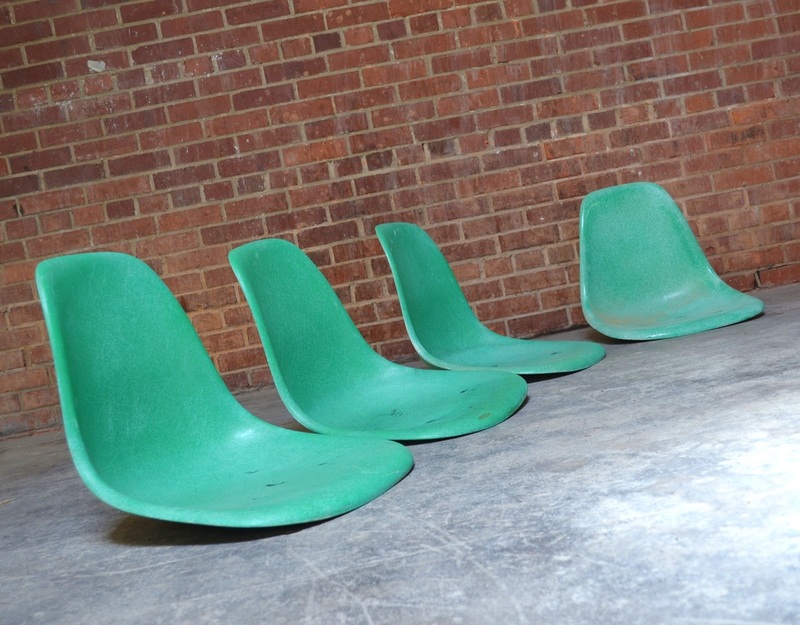 THESE CHAIRS ARE UNMARKED BUT WE ARE FAIRLY CERTAIN THEY ARE MILO. THIS SHELL IS IN GREAT SHAPE. 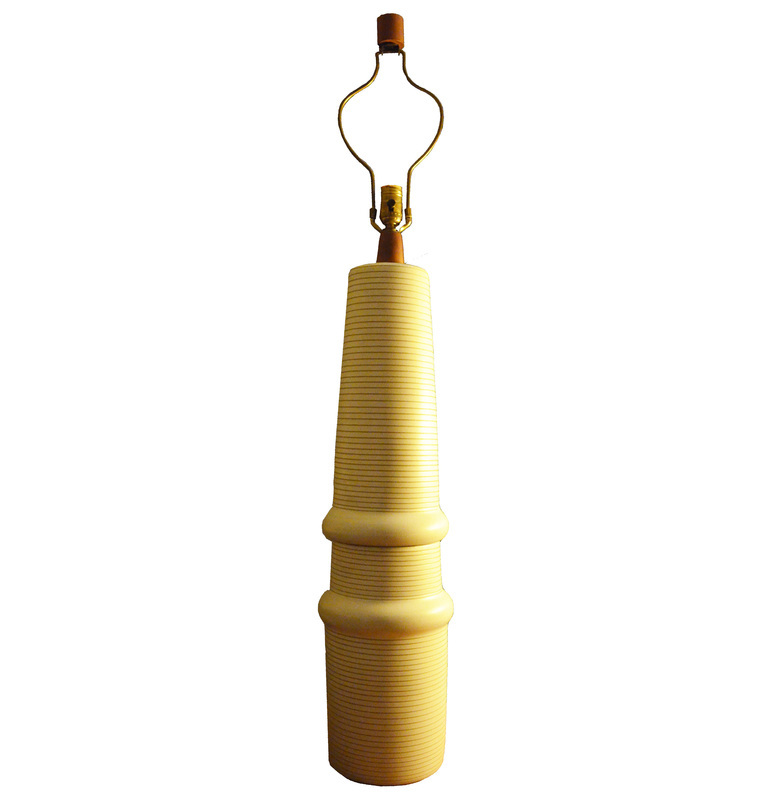 IT IS NARROW MOUNT AND IS ALMOST READY TO USE. IT CAME FROM A PUBLIC BENCH SO IT IS FAIRLY DIRTY ON THE BOTTOM (GUM, GRIME, ETC...). IT WILL NEED A GOOD SCRUBBING, THE BACK AND FRONT ARE FAIRLY CLEAN. 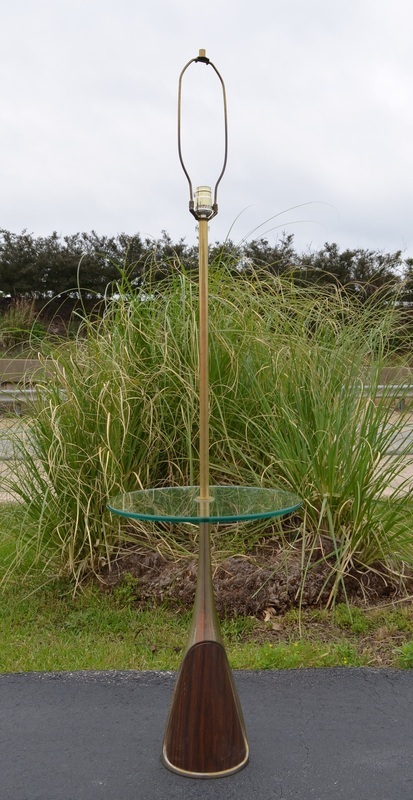 WE HAVE TONS OF DIFFERENT BASES TO CHOOSE FROM, THEY ARE PRICED INDIVIDUALLY. 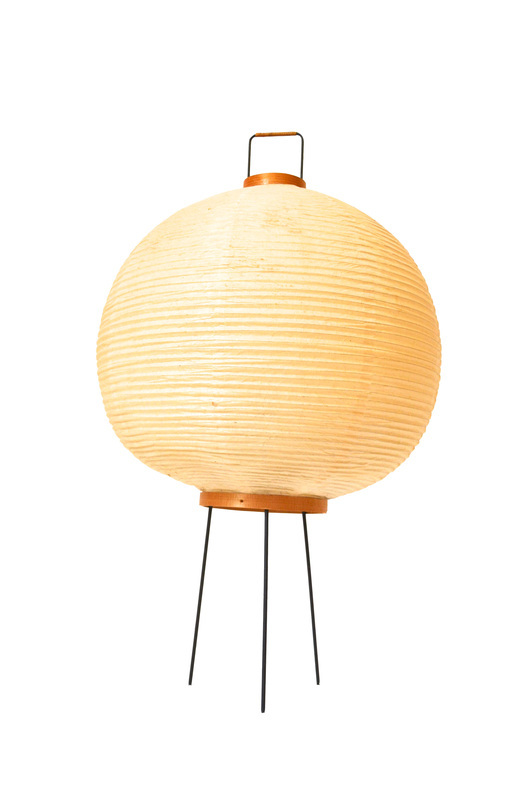 THIS LAMP IS IN NICE SHAPE, EVERYTHING IS THERE WITH THE EXCEPTION OF THE SHADE. YOU WILL NEED TO FIND ONE THAT FITS OR HAVE ONE MADE. 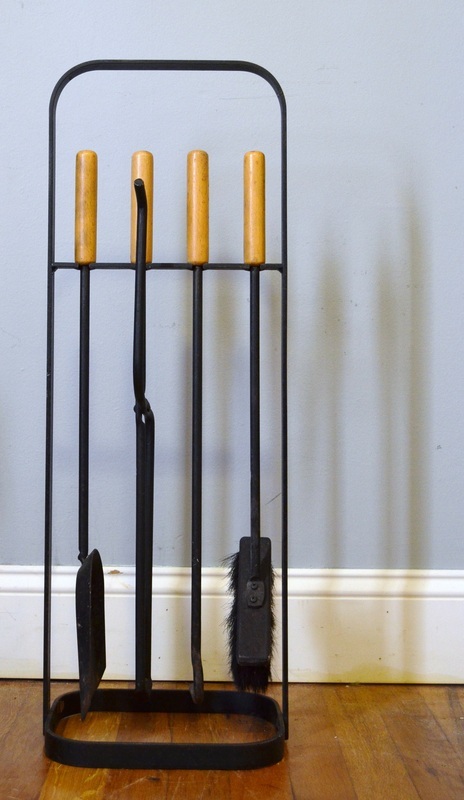 THIS IS A GREAT SET OF VINTAGE FIREPLACE TOOLS. 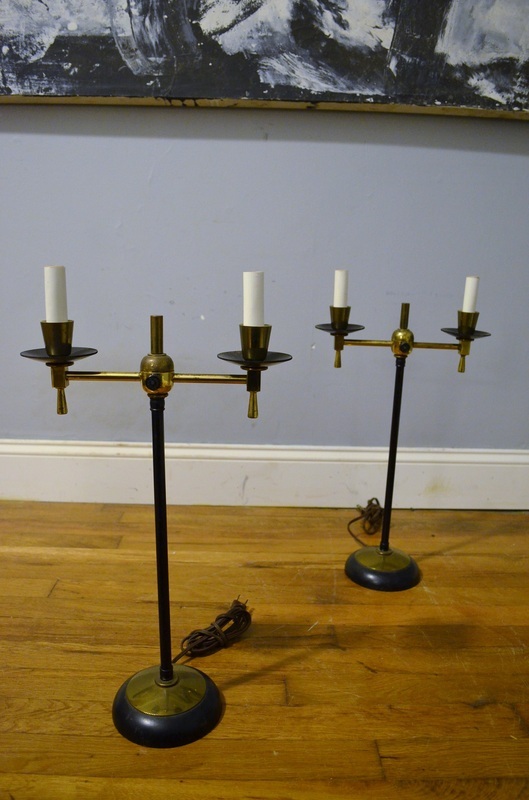 THEY HAVE A BIT OF WEAR TO THE PAINT AND WOOD BUT THEY COULD BE REDONE EASILY. THIS PAIR OF LAMPS IS IN REALLY NICE SHAPE WITH ONLY THE MOST MINOR SIGNS OF AGE. THEY ARE 51 INCHES TO THE TOP OF THE FINIAL. 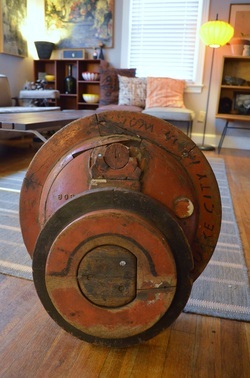 THIS LARGE SCALE FOUNDRY MOLD IS IN OKAY SHAPE. IT REALLY NEEDS A LIGHT SANDING AND A COAT OF POLY TO BE PRESENTABLE. CONSIDERING THE SIZE THIS IS A GREAT DEAL IF YOU DON'T MIND PUTTING IN A BIT OF LABOR. IT IS A LITTLE OVER THREE FEET TALL. 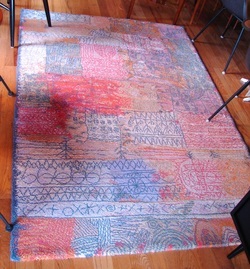 THIS RUG IS AMAZING IN PERSON. IT IS IN EXCELLENT CONDITION. THE PICTURE DOESN'T CONVEY HOW BRIGHT THE PINK AND OTHER COLORS ARE. IT IS VERY VIBRANT! 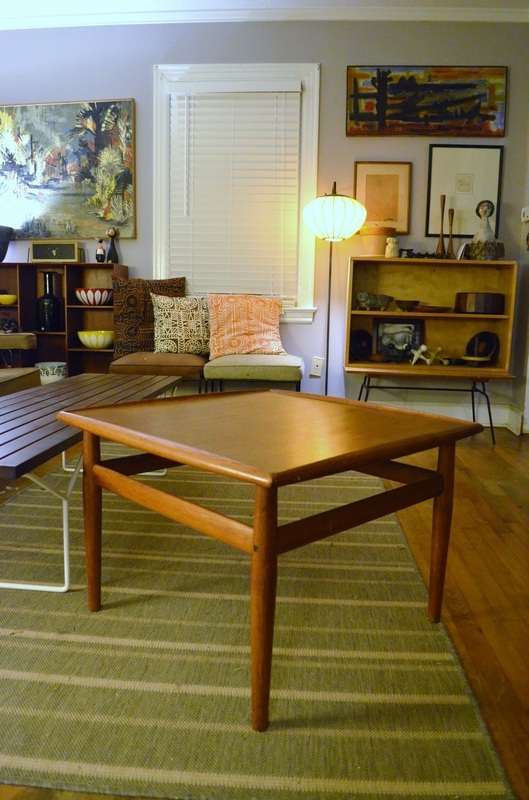 THIS COFFEE TABLE IS IN NICE VINTAGE CONDITION. IT DOES NEED A QUIK SIMPLE CLEANING AND OILING OR A MINOR REFINISH. WE DO NOT HAVE THE GLASS, WE CAN POINT YOU IN THE RIGHT DIRECTION TO GET A PIECE MADE FOR CHEAP. 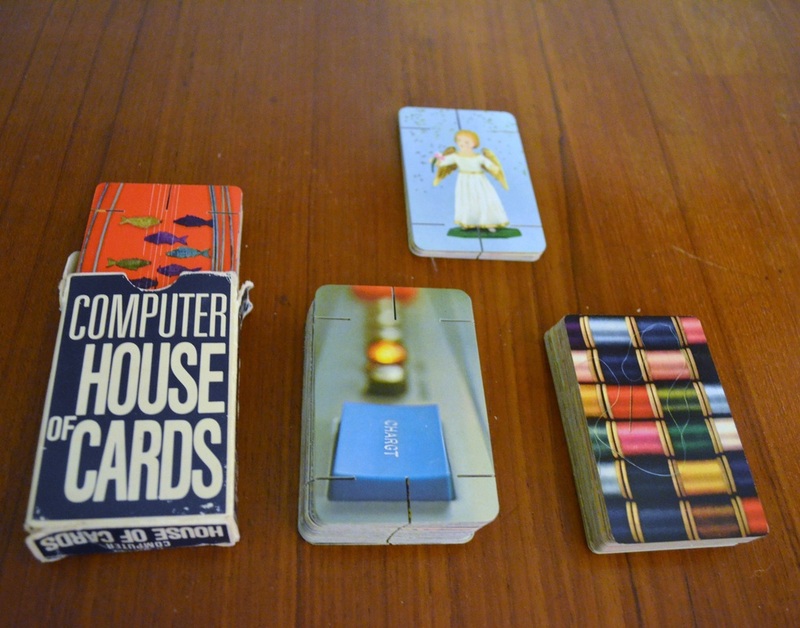 THIS SET IS IN NICE ORIGINAL CONDITION. IT WILL NEED TO BE RECOVERED. THIS CHAIR IS IN NEARLY PERFECT SHAPE AND IS READY TO USE. 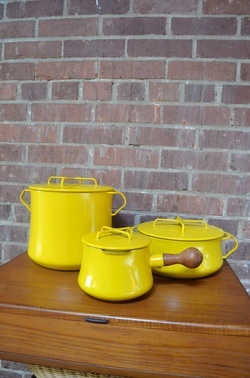 ALL THREE PIECES ARE IN EXCELLENT CONDITION. THEY ARE PRICED AS A SET. THIS SET IS IN GREAT SHAPE. THEY ARE PRICED AS A SET. THIS TABLE LAMP IS IN GOOD SHAPE CONSIDERING ITS AGE. THE SHADE DOES HAVE SOME SMALL HOLES AND A SMALL TEAR ON THE BACK OF THE SHADE. CONSIDERING IT IS MANY DECADES OLD THE WEAR IS MINIMAL FOR SUCH A DELICATE PIECE. IT IS 23.75 BY 12 INCHES WIDE. THIS CHAIR IS IN GREAT SHAPE. IT COMES WITH TWO COVERS. ONE IS BLACK AND ONE IS RED. 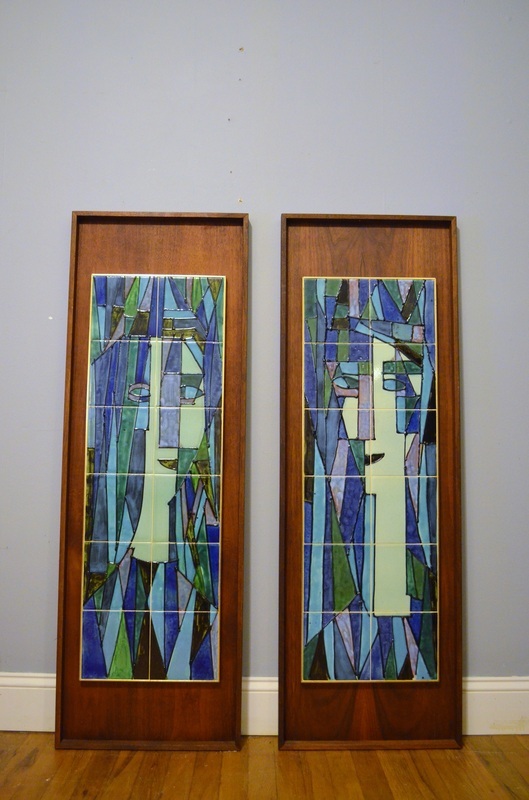 THEY ARE BOTH SLIGHTLY FADED AND HAVE A FEW MINOR PINHOLES BUT THEY ARE BOTH STILL USABLE. THE CHAIR COMES WITH PLASTIC GLIDES FOR THE FEET (NOT PICTURED). 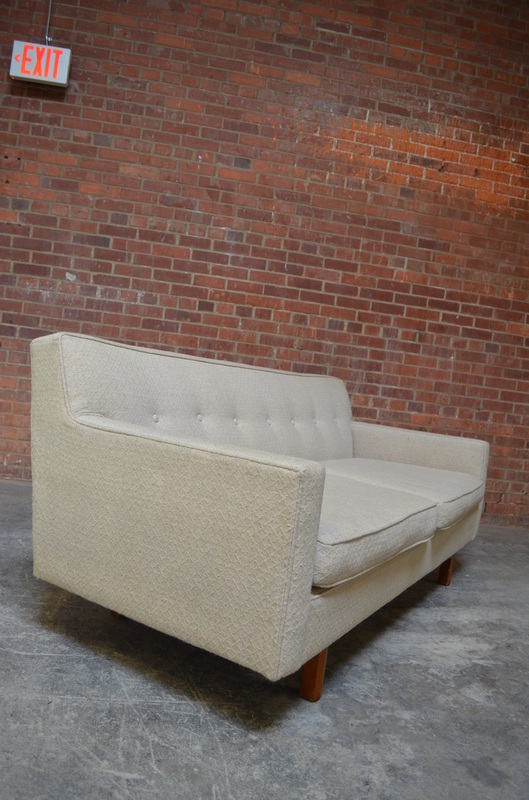 THIS SMALL SCALE SOFA IS IN EXCELLENT ORIGINAL CONDITION. 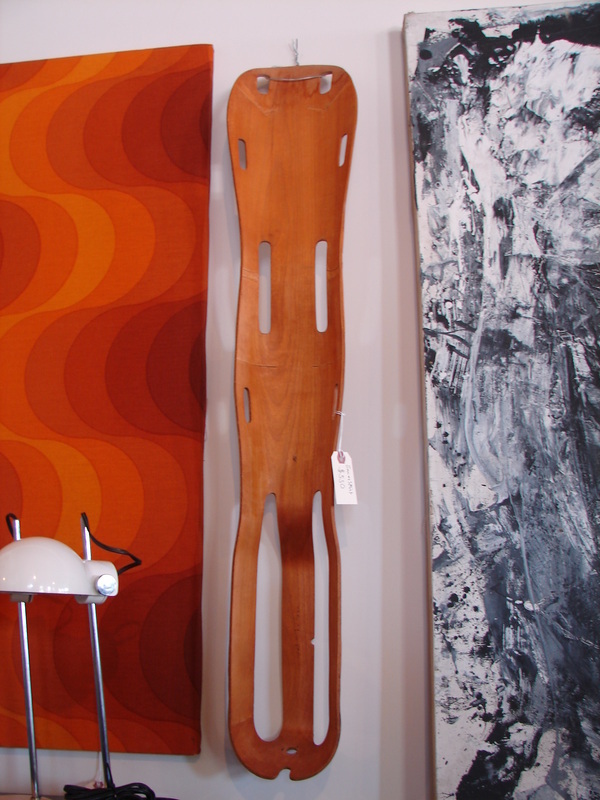 THE ORIGINAL FINISH ON THE WOOD IS IN NICE SHAPE AND THE FABRIC IS FREE FROM RIPS, SMELLS, TEARS OR WEAR. IT DOES HAVE A FEW SMALL DISCOLORED SPOTS THAT WILL LIKELY COME OUT WITH A GENTLE CLEANING, WE HAVE LEFT IT AS IS. THE DECK RETAINS ITS ORIGINAL DUNBAR CLOTH. THIS HUGE FOUNDRY MOLD IS THE NICEST WE'VE EVER HAD THE PLEASURE OF OWNING! IT IS ALSO ONE OF THE NICEST WE'VE SEEN. 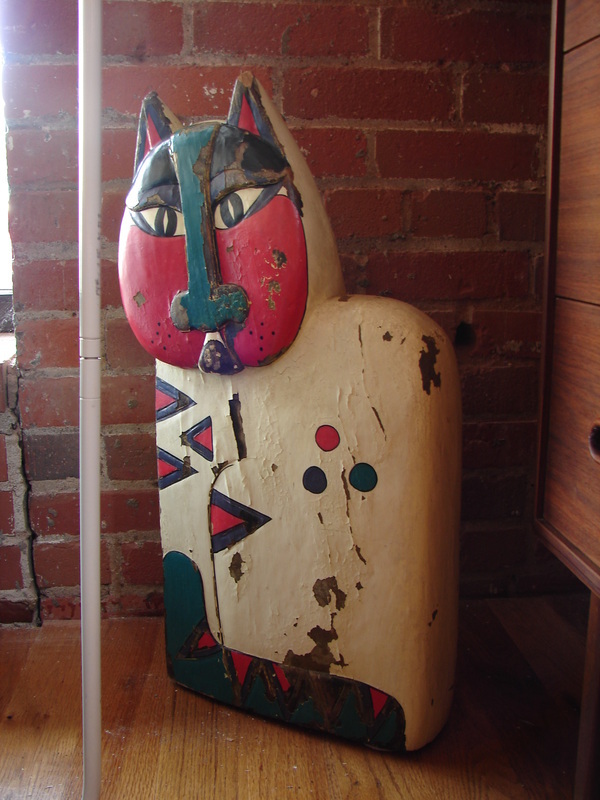 IT IS ABOUT THREE FEET TALL AND IN EXCELLENT CONDITION. ABSOLUTELY STUNNING! 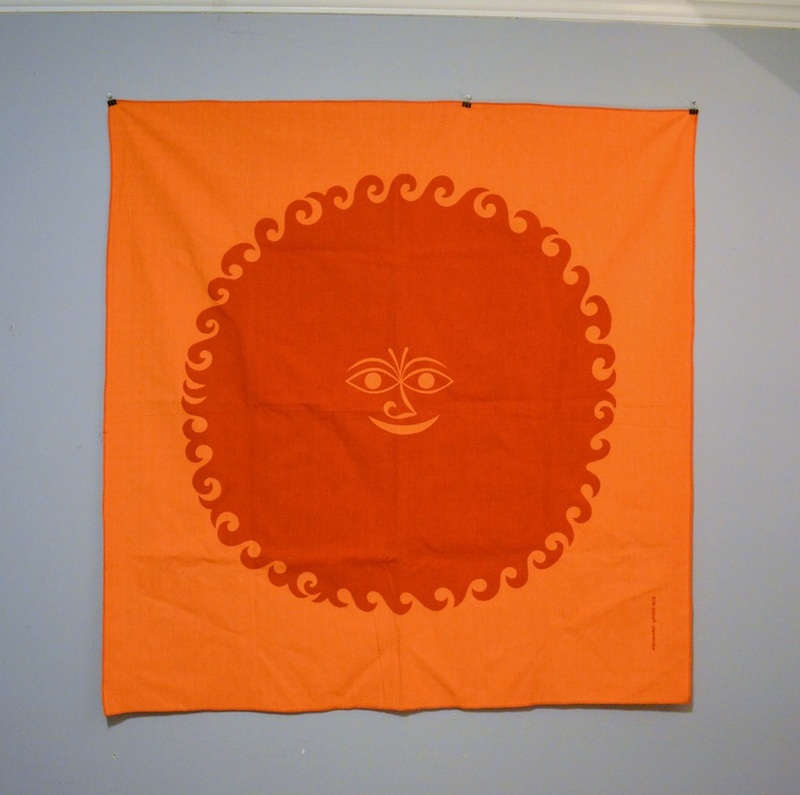 IT IS FLAT ON THE BACK SO IT WOULD BE SUPER EASY TO HANG. 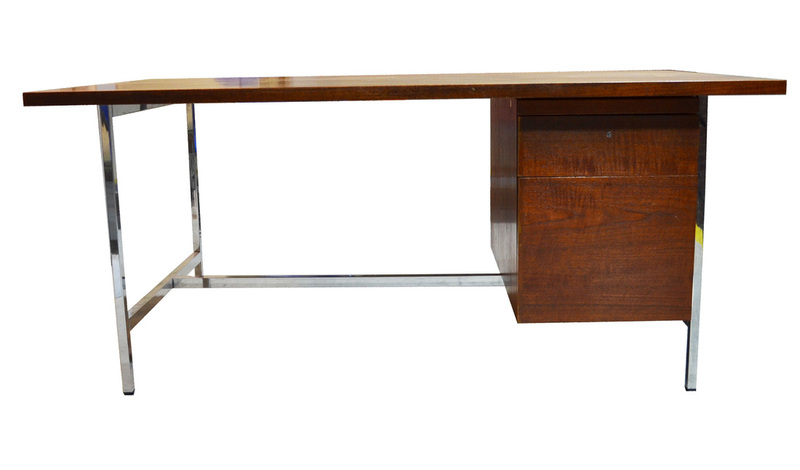 THIS DESK IS IN DECENT ORIGINAL CONDITION BUT IT WILL NEED SOME MINOR RESTORATION. THIS ROCKER IS IN NEARLY PERFECT CONDITION WITH THE EXCEPTION OF ONE TINY SPOT ON THE UPHOLSTERY THAT SHOULD COME OUT. WE HAVE NOT TRIED. 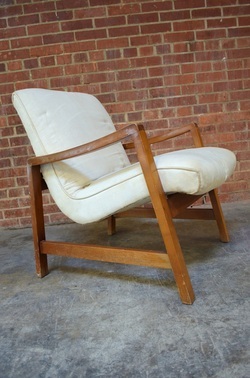 SUPER COMFY AND SOLID ROCKING CHAIR. 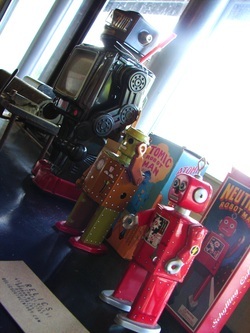 THE BIG ROBOT IS AN ORIGINAL HORIKAWA (HE SOLD) AND THE TWO LITTLE GUYS ARE REPRO BUT THEY WORK AND HAVE THE BOXES! WE NOW HAVE TWO OF THESE IF YOU NEED A PAIR! THIS ONE HAS AN ORANGE LINER AND THE EARLY MARK. IT IS IN GREAT SHAPE WITH A COUPLE OF VERY MINOR BUMPS, NOTHING MAJOR. THIS LAMP IS IN GREAT SHAPE. 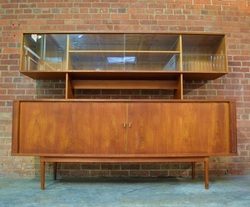 IT HAS SOLID TEAK THROUGHOUT AND FROSTED GLASS. THE 15ISH FOOT LONG CORD HAS SOME DISCOLORATION BUT IT WOULD BE AN EASY CHANGE. IT HAS A PULL SWITCH INSIDE. ABSOLUTELY STUNNING SET, ONE OF THE BEST! THIS CHAIR IS FRESH FROM THE UPHOLSTERY SHOP. IT RECEIVED BRAND NEW SOFT BUTTERY LEATHER AND THE METAL WAS POLISHED. IT DOESN'T LOOK BRAND NEW BECAUSE OF A FEW BUMPS TO THE ALUMINUM THAT WERE POLISHED OVER. 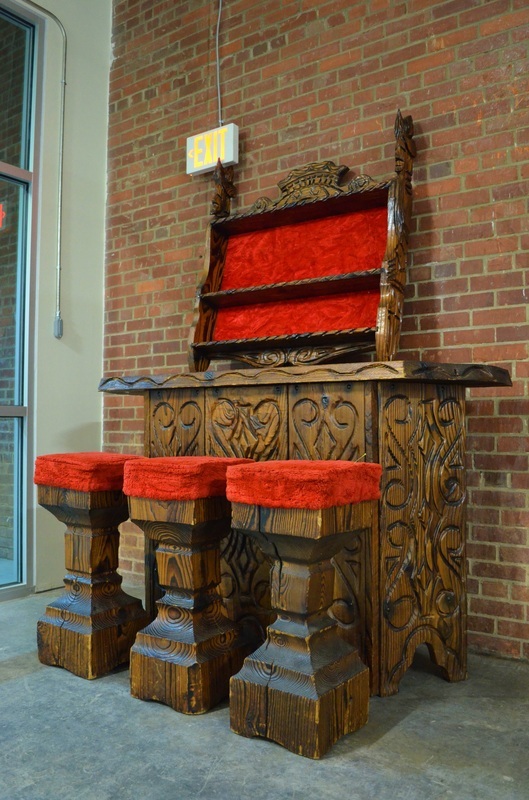 WE THINK IT ONLY ADDS CHARACTER TO THE CHAIR. IT IS INSANELY COMFORTABLE. 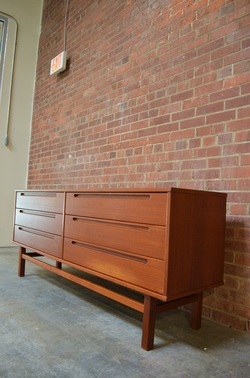 THIS CREDENZA IS IN EXCELLENT READY TO USE CONDITION! THIS CHAIR IS IN NEED OF A FULL RESTORATION. THE LEGS ARE IN GOOD SHAPE BUT NOTHING ELSE IS! THIS SET IS COMMONLY ATTRIBUTED TO ALBRIZZI BUT WE'VE NEVER SEEN POSITIVE PROOF OF THIS ATTRIBUTION. EITHER WAY IT IS A VERY HIGH END AND QUALITY SET IN GREAT SHAPE. THE ONLY REAL BLEMISH OTHER THAN NORMAL WEAR IS THE BROOM. 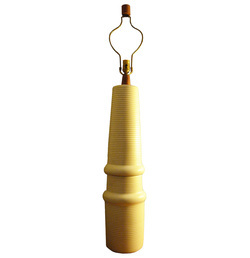 YOU CAN SEE THAT THE FIBERS ARE WORN, THIS CAN BE REPLACED IF IT BOTHERS YOU. 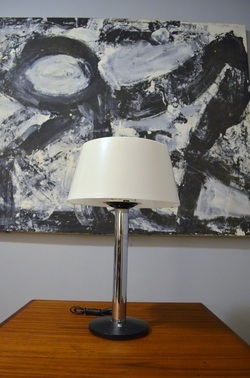 THIS LAMP IS IN EXCELLENT CONDITION. IT HAS ALMOST NO WEAR. THE TOP PART HAS SOME VERY MINOR PAINT LOSS BUT IT REALLY IS MINOR. 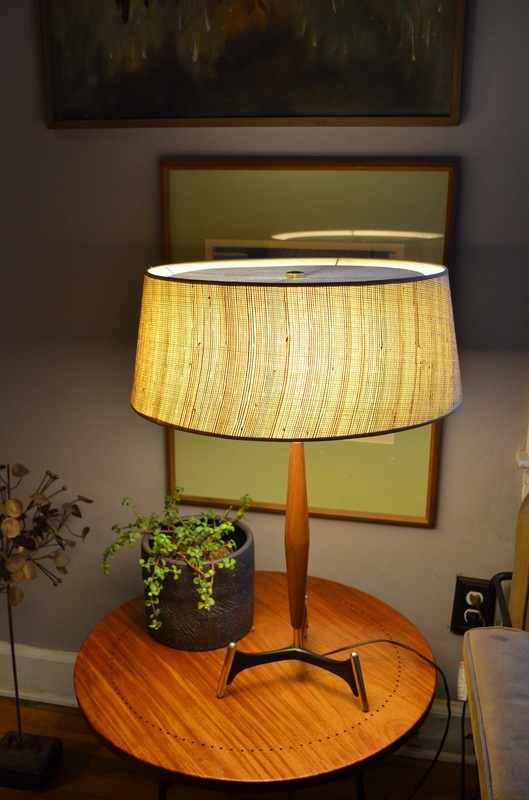 THIS LAMP IS IN GREAT SHAPE WITH ONLY A COUPLE MINOR BLEMISHES. 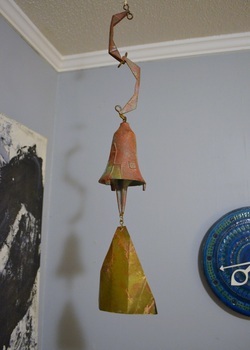 IT IS 32.5 INCHES TO THE TOP OF THE FINIAL. THIS INCREDIBLY RARE PIECE IS IN EXCELLENT CONDITION. IT HAS A FEW VERY MINOR BLEMISHES BUT IT IS IN OVERALL GREAT SHAPE. THE WALNUT CONSTRUCTION IS ABSOLUTELY STUNNING IN PERSON. 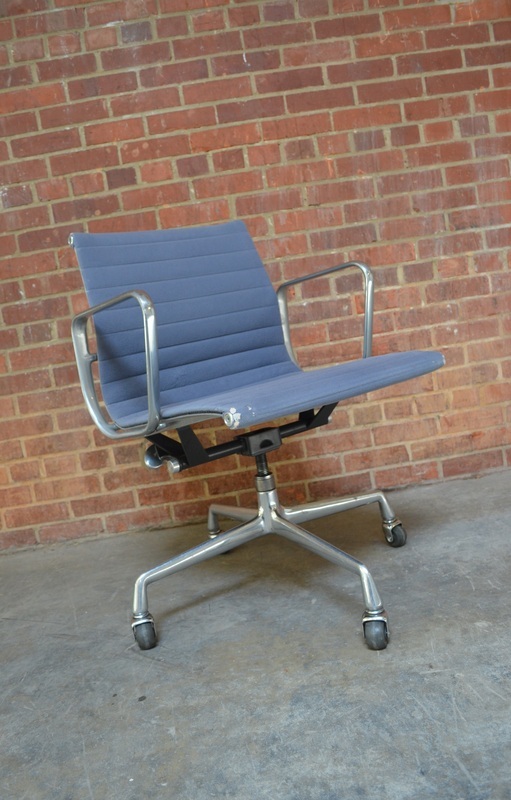 THIS CHAIR IS A REALLY NICE BLUE GREY. IT HAS SOME WEAR TO THE UPHOLSTERY ON THE CORNERS, THE WORST SPOT CAN BE SEEN ON THE SEAT CORNER IN THE PICTURE. THE ARMS HAVE SOME MILD WEAR TO THE ALUMINUM. IT FUNCTIONS AS IT SHOULD. 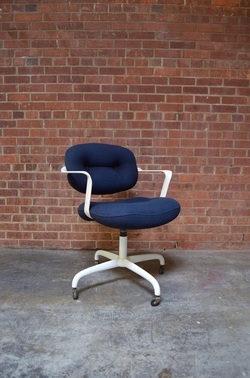 THIS CHAIR HAS A REALLY NICE GREY WOOL FABRIC IN EXCELLENT CONDITION. THE ARMS HAVE NORMAL WEAR FROM DECADES OF USE. IT IS STILL VERY PRESENTABLE AND FUNCTIONS AS IT SHOULD. 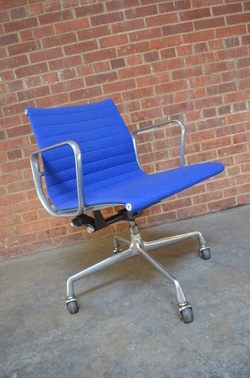 THIS CHAIR IS IN GREAT SHAPE THE BRIGHT BLUE FABRIC IS FREE FROM FLAWS AND THE ALUMINUM HAS LESS THAN NORMAL WEAR TO THE METAL. IT OPERATES JUST AS IT SHOULD! 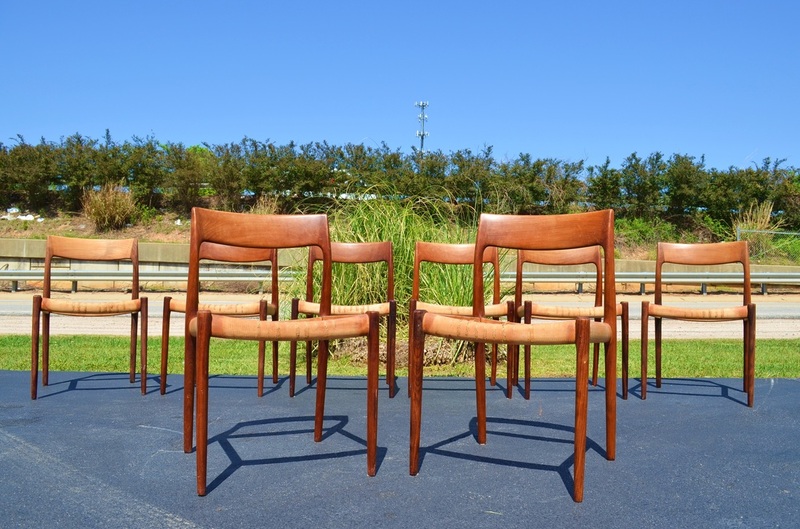 THIS SET OF EIGHT DINING CHAIRS IS IN GREAT SHAPE CONSIDERING THEY ARE ABOUT 40 YEARS OLD! 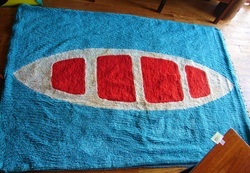 THE FABRIC WAS REDONE IN THE 1990'S AND IS STILL USABLE AS IS OR YOU COULD HAVE THEM REDONE. THE METAL IS IN GOOD SHAPE WITH ONLY MINOR SIGNS OF AGE. THERE ARE TWO ARM CHAIRS AND THEY ARE VERY COMFY! THESE CHAIRS ARE UNMARKED BUT THEY CAME WITH A HUGE PACE DINING TABLE SO WE ARE FAIRLY CERTAIN THE ATTRIBUTION IS CORRECT. THIS CHAIR IS IN VERY NICE SHAPE. THE WOOL FABRIC IS SUPER CLEAN AND FREE FROM FLAWS. THE ARMS HAVE NORMAL WEAR FROM DECADES OF USE. 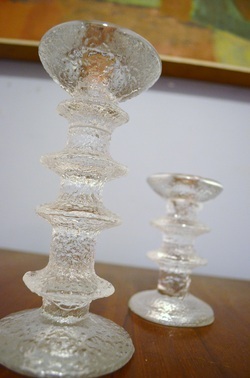 IT IS STILL PRESENTABLE AND COULD BE POLISHED TO LOOK LIKE NEW AGAIN. IT OPERATES JUST AS IT SHOULD. MINOR WEAR TO THE PAINT AND THE CHROME COULD USE A CLEANING BUT OVERALL THIS IS A GREAT SET! 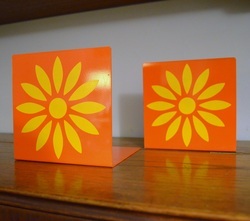 THESE BOOKENDS ARE IN GREAT SHAPE, READY TO BE USED! 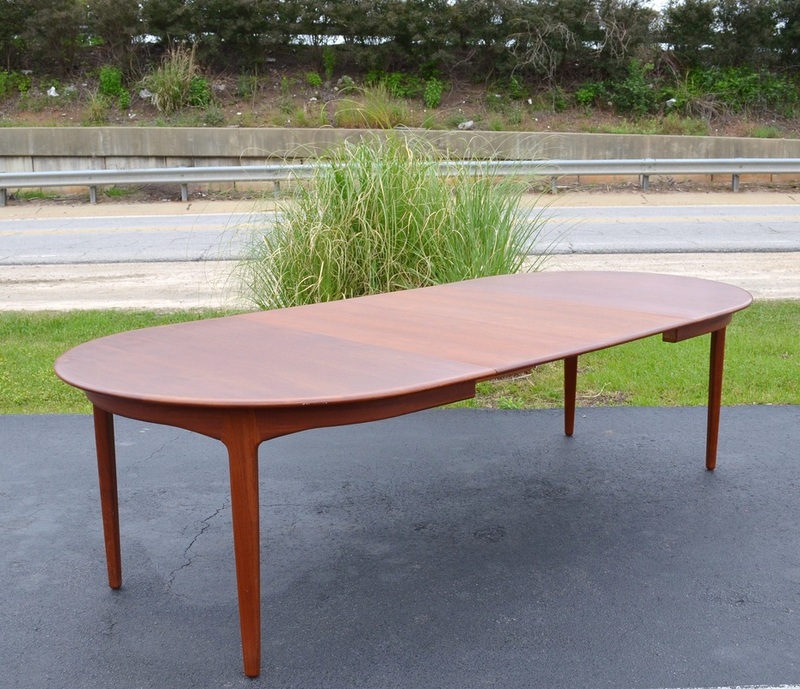 THIS DINING TABLE IS IN NICE SHAPE. 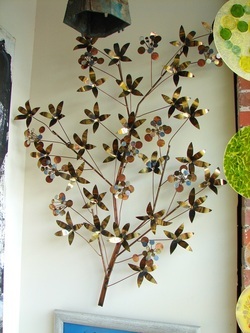 IT HAS TWO LEAVES, (PICTURED). IT WILL NEED A BRIEF STEEL WOOL SCRUBDOWN DUE TO AN UNEVEN OILING JOB BY THE PREVIOUS OWNER. OTHER THAN THAT IT IS READY TO USE! 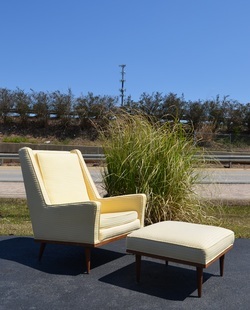 WE HAVE THIS EXACT SET BEING REUPHOLSTERED IN A LIGHT GREY FABRIC. THE WOOD IS BEING COMPLETELY REGLUED AND REFINISHED. IT WILL BE FLAWLESS WHEN COMPLETE! 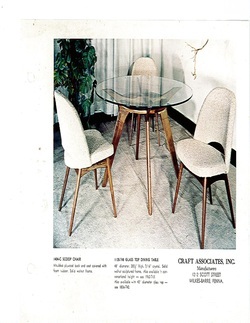 IT HAS FOUR CHAIRS AND THE TABLE. THIS SET IS ABSOLUTELY STUNNING. OBVIOUSLY THEY NEED SOME ATTENTION. THEY NEED A LIGHT SANDING, OILING AND UPHOLSTERY. THE FRAMES ARE VERY TIGHT AND SOLID. 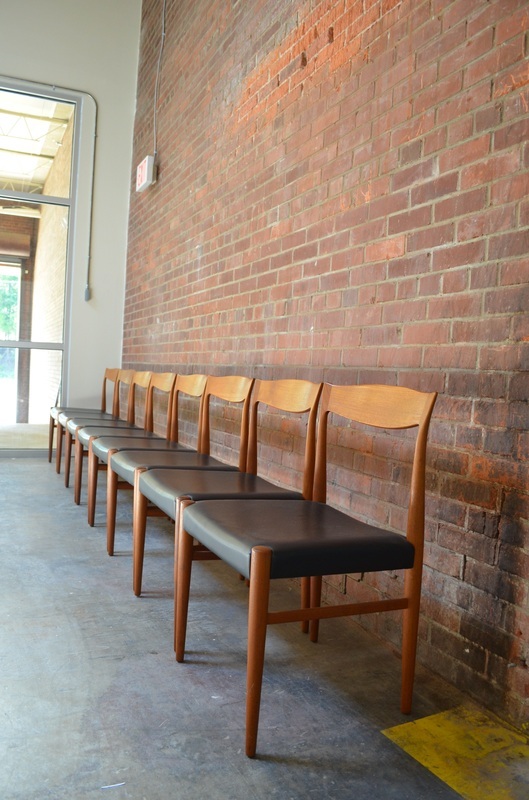 THESE CHAIRS START AT $805 NEW FOR THE BASE MODEL AND ROSEWOOD IS NO LONGER AN OPTION! YOU CAN GET THIS WHOLE SET FOR LESS THAN THE PRICE OF THREE NEW ONES! THEY ALL HAVE BURNT IN MOLLER AND DANISH CONTROL LABELS. 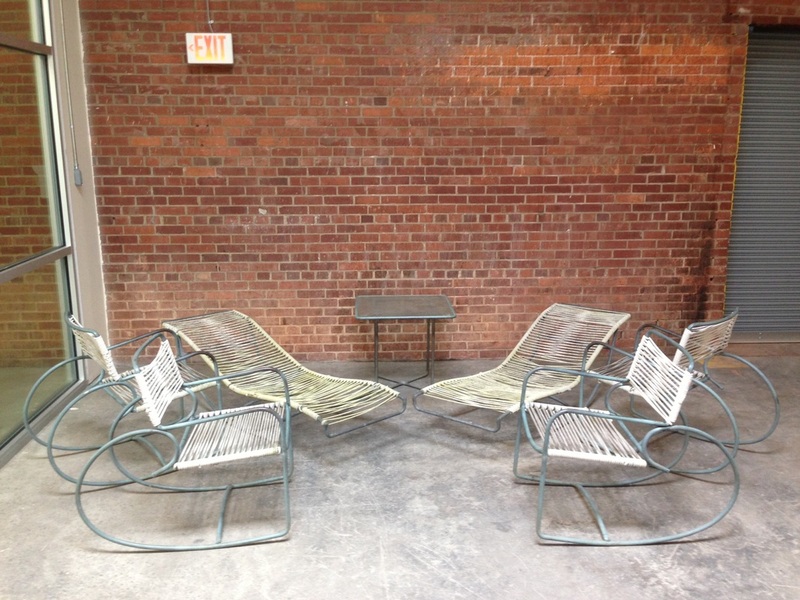 THIS PAIR OF CHAIRS IS IN NICE SHAPE. THE FABRIC AND VINYL IS FREE FROM RIPS OR TEARS BUT IT HAS PULLED AWAY FROM THE FOAM. YOU COULD USE THEM AS IS OR YOU COULD REMOVE THE UPHOLSTERY, PATCH THE BREATHER HOLES AND GET A PAIR OF WHITE SHELLS FOR THE PRICE OF ONE! THIS SCULPTURE IS IN NICE SHAPE. IT HAS A COUPLE OF MINOR IMPERFECTIONS BUT YOU REALLY HAVE TO LOOK FOR THEM . IT IS SIGNED AND DATED. 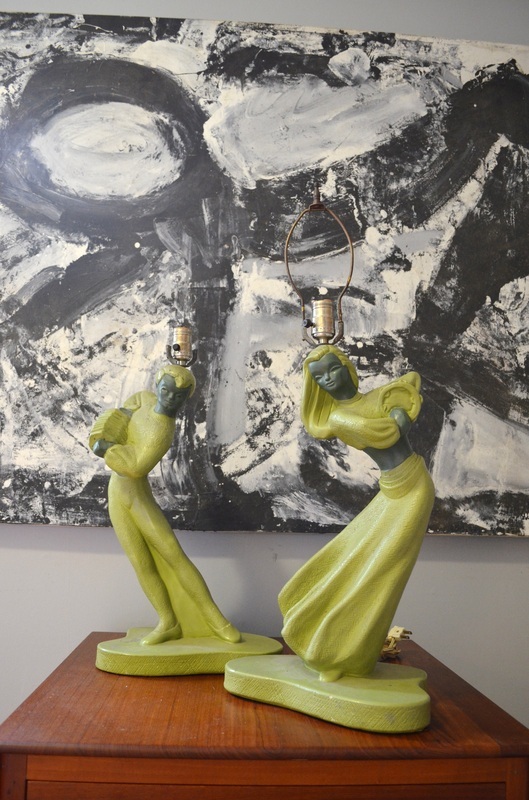 THESE LAMPS ARE IN GREAT SHAPE WE HAVE THE ORIGINAL FINIALS BUT YOU WILL NEED ONE HARP. THESE NIGHT STANDS ARE ABSOLUTELY STUNNING IN PERSON. 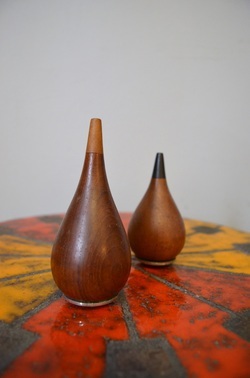 THE WALNUT IS GORGEOUS AND THEY ARE IN EXCELLENT CONDITION WITH ONLY MINOR WEAR FROM GENTLE USE. THEY RETAIN THEIR ORIGINAL PORCELAIN KNOBS AND THE DRAWERS OPERATE SMOOTHLY. 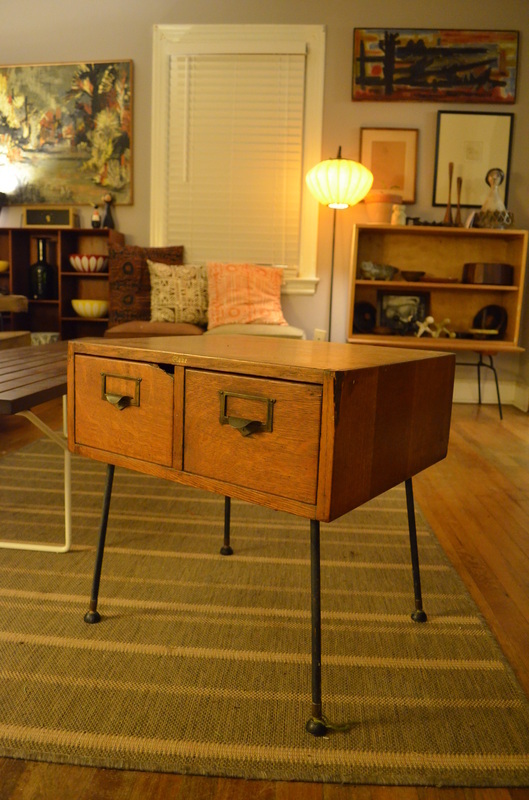 THIS FILE CABINET HAS ROOM FOR FILES ON ONE SIDE AND SMALL DRAWERS ON THE OTHER. THE TAMBOUR DOORS SLIDE UP AND DOWN EASILY. IT WILL NEED TO BE CLEANED AND OILED TO LOOK PERFECT OR JUST USE IT AS IS. IT COMES WITH THE KEY. 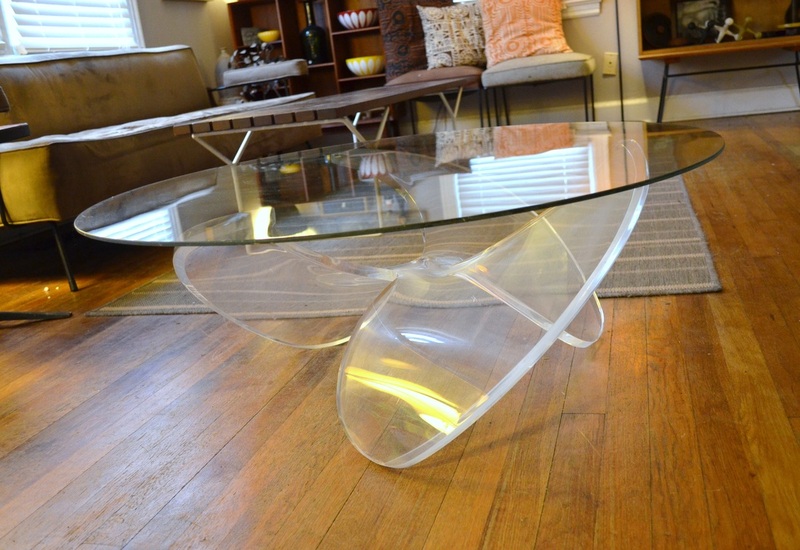 THIS COFFEE TABLE IS REALLY, REALLY COOL! 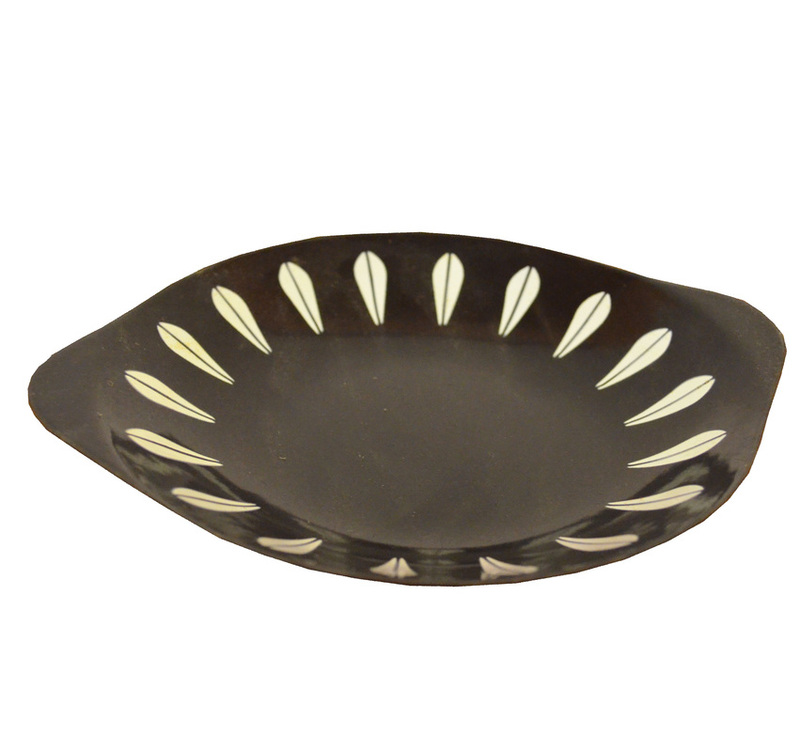 IT HAS TWO LEAVES THAT PULL OUT TO EXTEND THE SURFACE. ONE LEAF HAS A REALLY AWSOME ORIGINAL FORMICA INSERT FOR DRINKS, THE PATTERN IS REALLY GREAT IN PERSON. 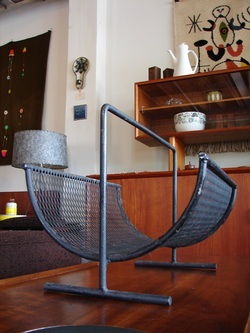 IT HAS A RATTAN MAGAZINE SHELF WITH NO BREAKS. OBVIOUSLY THIS SOFA ISN'T ACTUALLY "BRAND NEW". ALTHOUGH, IT WAS COMPLETELY STRIPPED DOWN. THE WOOD WAS REFINISHED, THE FOAM, STRAPS AND UPHOLSTERY WERE REPLACED AND IT LOOKS BRAND NEW! YOU DON'T NEED TO DO A THING BUT BRING IT HOME! THIS HARD TO FIND PAIR IS IN EXCELLENT ORIGINAL CONDITION. THEY BOTH OPERATE AS THEY SHOULD AND LOOK SPECTACULAR IN PERSON! 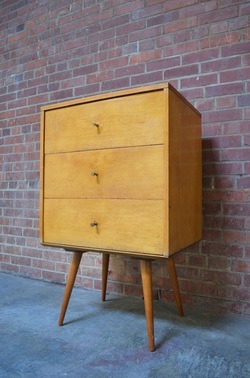 THIS DRESSER IS IN GREAT SHAPE. 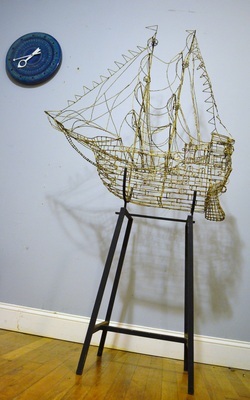 IT HAS A COUPLE OF MINOR IMPERFECTIONS BUT OVERALL IT IS IN NICE, READY TO USE CONDITION. THIS SUPER CLEAN WALL UNIT INCLUDES RARELY SEEN SOLID TEAK WALL POLES. 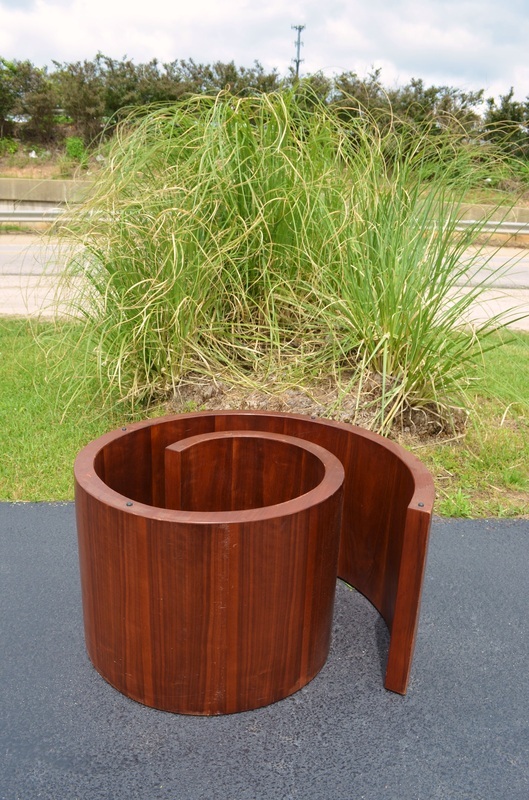 THEY ARE USUALLY TEAK VENEER OVER SOLID WOOD. THE CABINETS HAVE REALLY NICE BRASS HARDWARE. 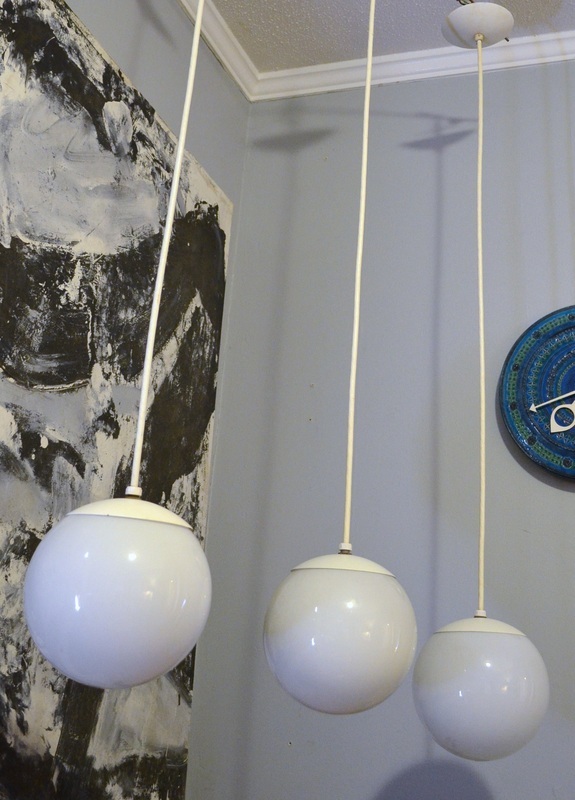 THIS SET IS READY TO HANG AND CAN BE CONFIGURED ANY WAY YOU LIKE. 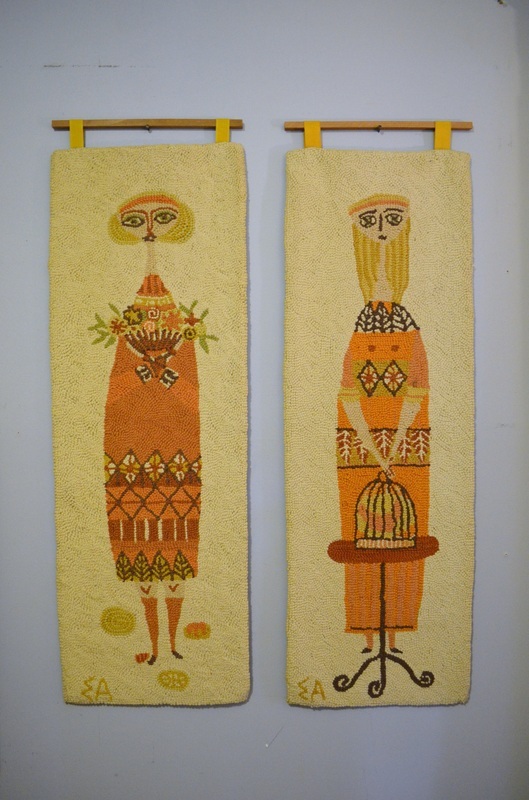 THIS PAIR IS IN EXCELLENT CONDITION. 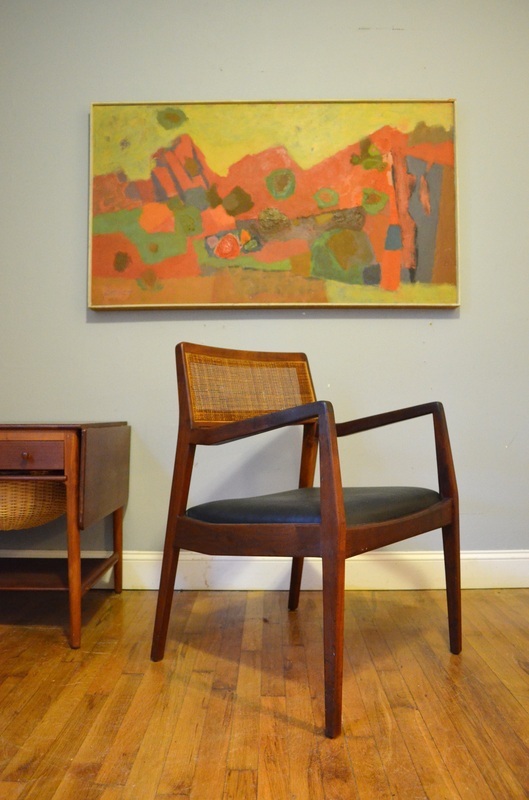 THE RICH DARK PATINA TO THE TEAK IS GORGEOUS AND THE BLACK FRAMES ONLY HAVE A FEW MINOR BLEMISHES THAT COULD BE TOUCHED UP EASILY. THE BASES FOLD DOWN FLAT FOR EASY TRANSPORT/SHIPPING. THEY ARE MARKED. 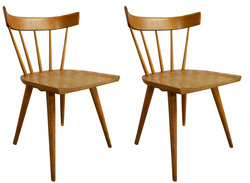 ONE HAS SOLD, THE PRICE IS FOR A SINGLE CHAIR. 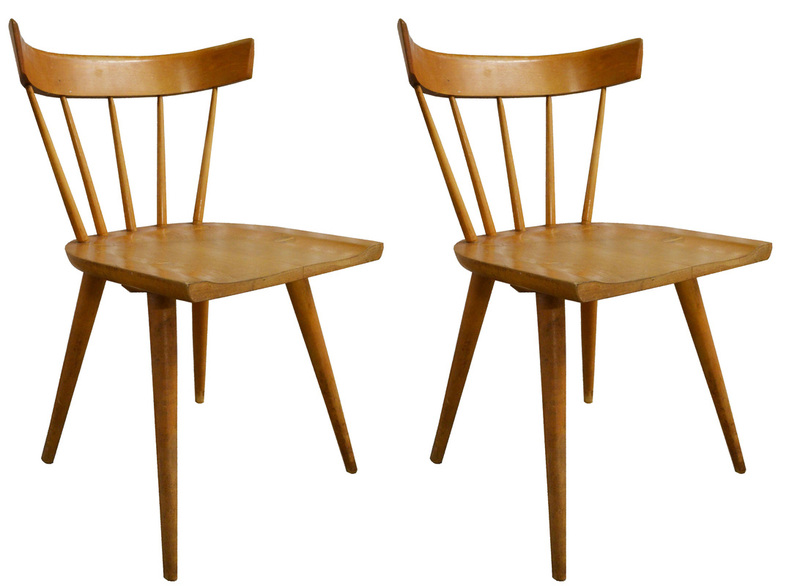 THIS PAIR OF HANS WEGNER CHAIRS IS IN ABSOLUTELY EXCELLENT CONDITION WITH VERY MINIMAL WEAR. THE CUSHIONS ARE LIKE NEW AND THE WOOD AND BRASS HIGHLIGHTS HAVE AN EXCELLENT DEEP DARK PATINA. 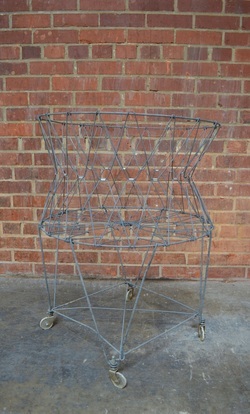 OTHER THAN SLIGHTLY SAGGING WEBBING THESE CHAIRS ARE IN NEARLY NEW SHAPE! THIS CHAIR IS IN GREAT SHAPE. IT IS READY TO USE! 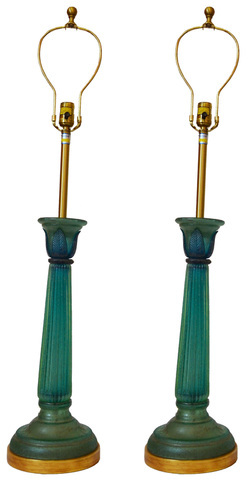 WE HAVE TWO MORE OF THIS COLOR, THEY ARE NARROW MOUNT BUT ARE WITHOUT BASES. 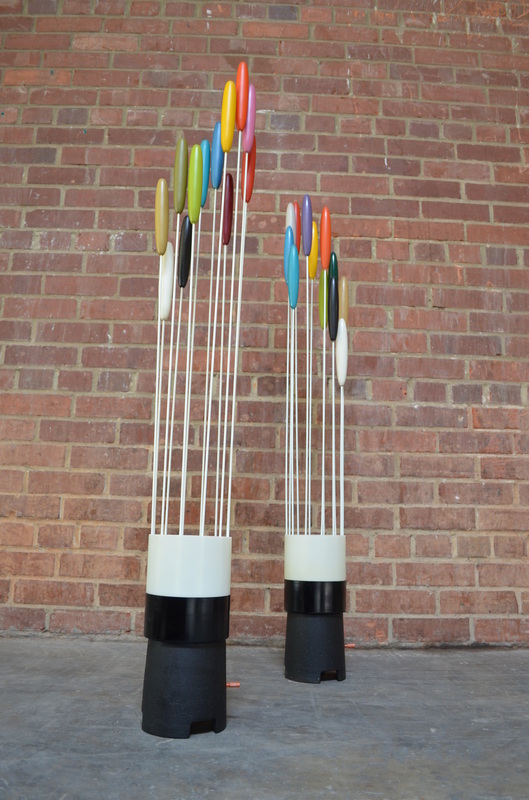 YOU CAN PURCHASE THEM FOR $275 A PIECE WITHOUT THE BASE. 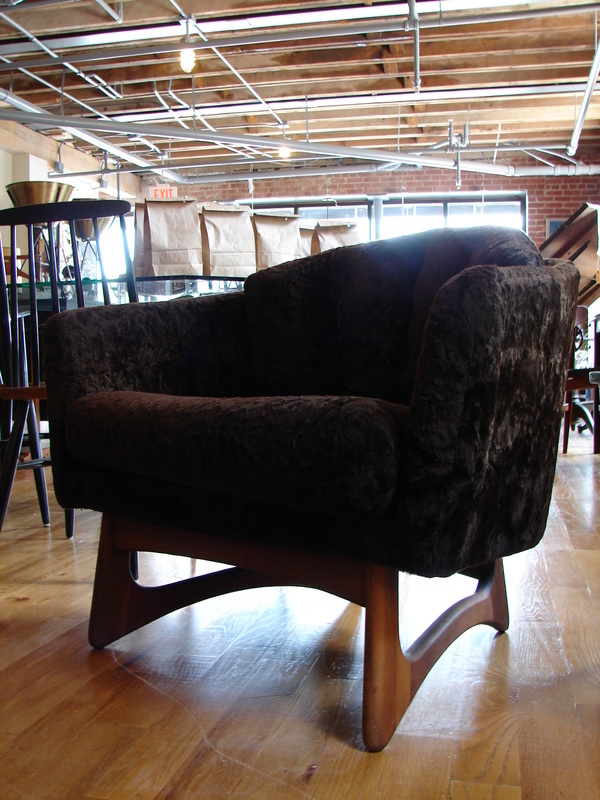 THIS ROCKER RETAINS ITS ORIGINAL UPHOLSTERY AND IS IN NICE SHAPE. IT COULD USE SOME NEW STRAPS AND A GOOD CLEANING AND OILING OR JUST USE IT AS IS! 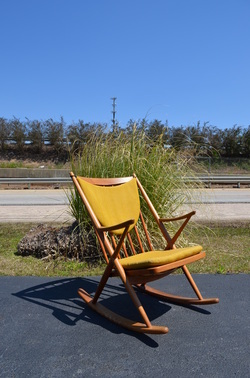 THIS CHAIR IS IN NICE SHAPE, IT HAS A BIT OF MILD SUN FADING BUT IT LOOKS COOL THAT WAY. IT REALLY MAKES THE FIBERS STAND OUT, IT IS A LIGHT RED COLOR. IT IS NARROW MOUNT. 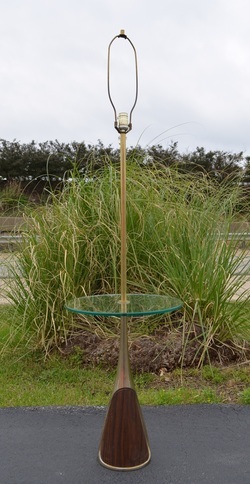 WE HAVE TONS OF DIFFERENT BASES TO CHOOSE FROM, THEY ARE PRICED INDIVIDUALLY. 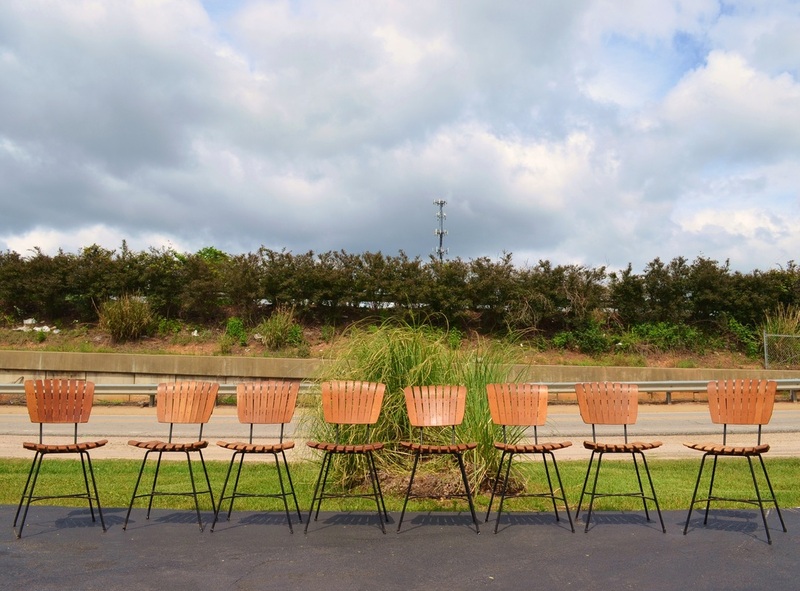 THIS SET OF SHELLS IS READY FOR A RESTAURANT OR A VERY LARGE KITCHEN TABLE. SOME OF THEM JUST NEED TO BE CLEANED, OTHERS WILL REALLY NEED TO BE SCRUBBED, SOME ARE WIDE MOUNT, A FEW HAVE STAINS AND A FEW NEED SHOCK MOUNTS. THERE ARE SEVERAL DIFFERENT COLORS IN THE LOT. 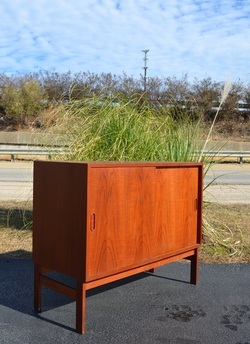 THIS CREDENZA IS IN EXCELLENT CONDITION. IT HAS A FEW MINOR BLEMISHES BUT NOTHING MAJOR. THE WORST OF WHICH ARE A FEW WATER MARKS ON THE TOP, AN EASY FIX. THIS IS ONE OF THE BEST CREDENZA'S OUT THERE! IT IS IN EXCELLENT ORIGINAL CONDITION WITH ONLY MINOR SIGNS OF WEAR. THE TOP CAN EASILY BE REMOVED IF YOU'D LIKE TO USE IT FOR YOUR TELEVISION. 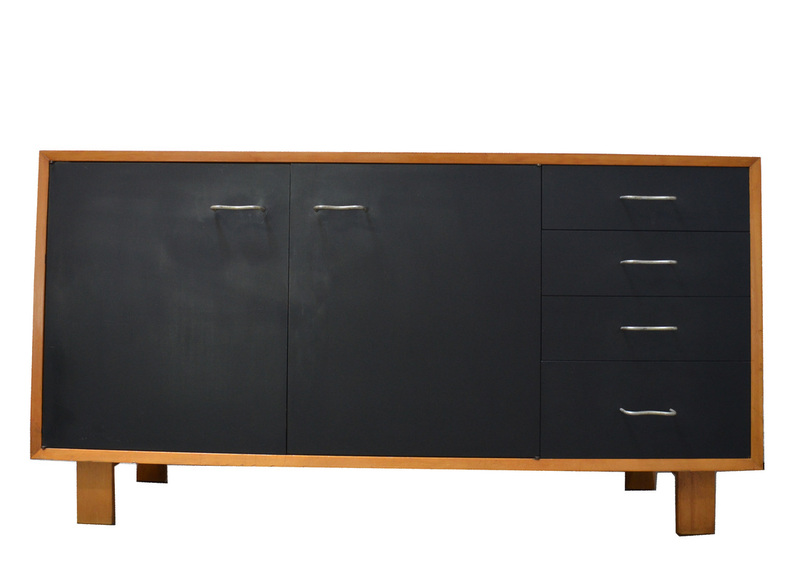 THIS DRESSER HAS VERY BEAUTIFUL VENEER AND THE BLACK BASE REALLY SETS IT OFF. IT IS BUILT RIGHT AND IS VERY HEAVY! 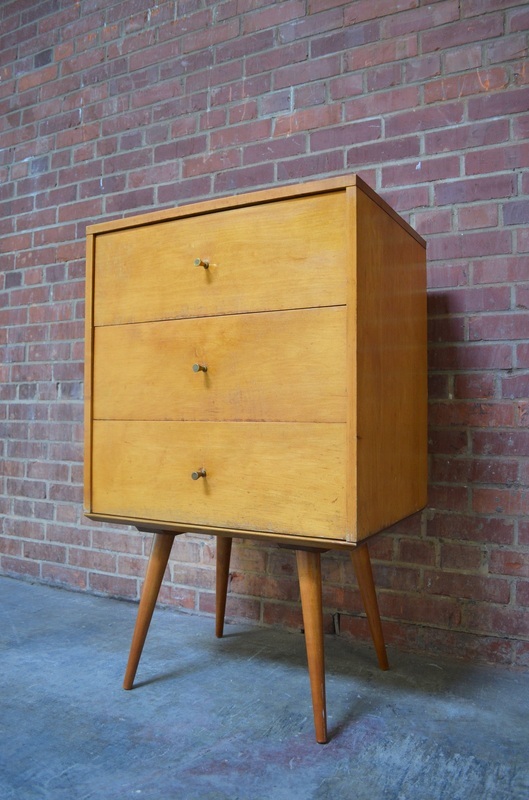 THE PRICE FOR THIS DRESSER INCLUDES SOME MINOR RESTORATION NEEDED. THE PLYNTH BASE IS FAIRLY MESSED UP ON THE OTHER SIDE, IT WILL BE REPLACED/REMADE. 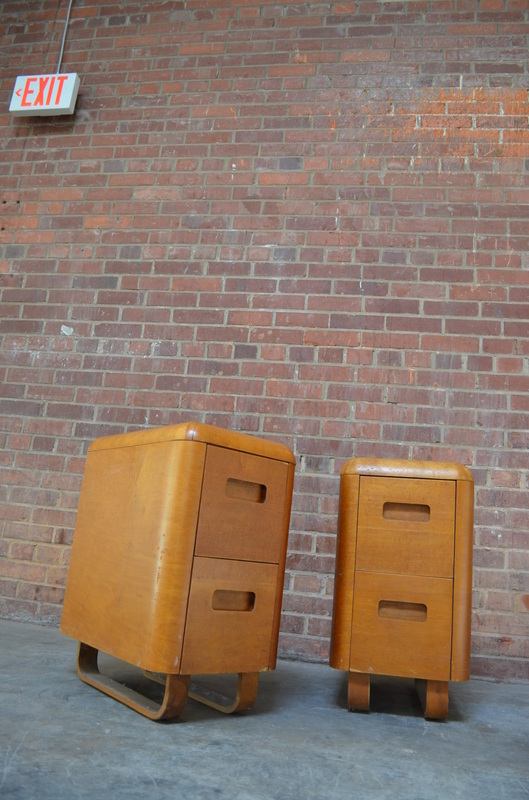 THE DRAWERS NEED SOME MINOR REPAIRS AS WELL, NOTHING MAJOR. IF YOU TAKE IT AS IS IT WILL BE $450. 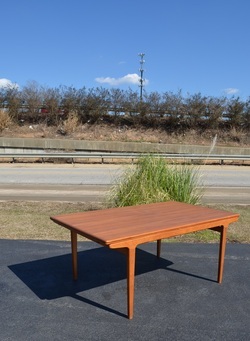 THIS LITTLE TABLE IS IN EXCELLENT CONDITION. 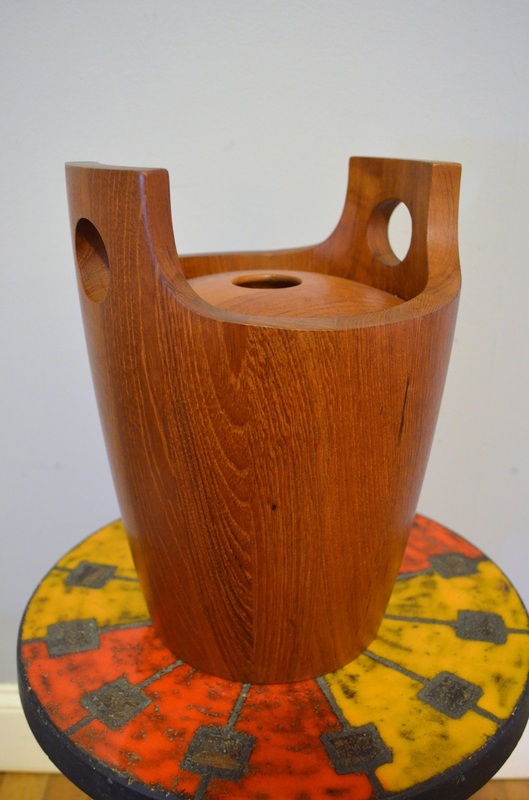 IT HAS A FEW VERY MINOR BLEMISHES THAT SHOULD EASILY COME OUT WITH A GOOD CLEANING AND TEAK OIL. THE TOP LIFTS UP FOR TONS OF STORAGE. THIS IS ACTUALLY THE SECOND ONE OF THESE SCULPTURES WE'VE HAD IN THE PAST COUPLE OF MONTHS. WEIRD... ANYWAY IT IS IN EXCELLENT CONDITION AND WAS EXTREMELY WELL DONE. THIS WOULD BE GREAT DURING THE HOLIDAYS TO DECORATE! 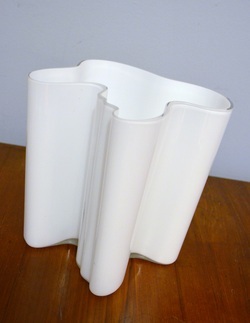 THIS SIGNED VASE IS IN EXCELLENT CONDITION WITH NO CHIPS, CRACKS OR KNICKS. THIS THING IS AWSOME! IT HAS A STAND THAT IT WILL STAND UP IN, IT HAS TO LEAN AGAINST SOMETHING OTHERWISE. OR YOU COULD ADD SOMETHING TO THE FEET FAIRLY EASILY SO THAT IT CAN BALANCE. THIS LITTLE STUDENT DESK HAS AWSOME BOOKSHELVES ON EACH SIDE AND IS BUILT LIKE A TANK. 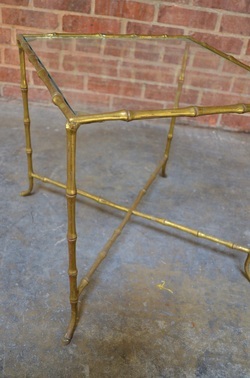 IT IS MOSTLY STEEL AND THE EDGES HAVE VISIBLE BRASS WELDED INTO THE EDGES. THE DESK HAS A BIT OF PAINT POKING THROUGH FROM IT'S PREVIOUS LIFE. 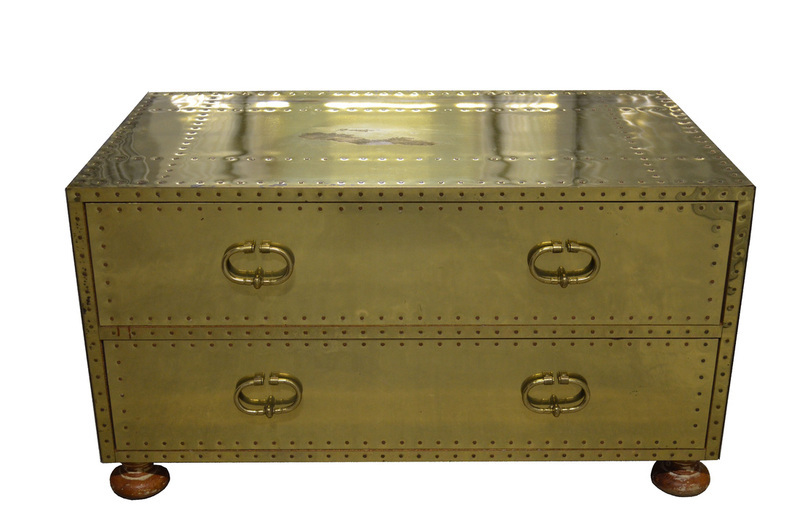 IT CAN BE FLOATED IN A ROOM SINCE IT HAS A BEAUTIFUL FINISHED BACK OR USE IT AS AN ENTRY TABLE. 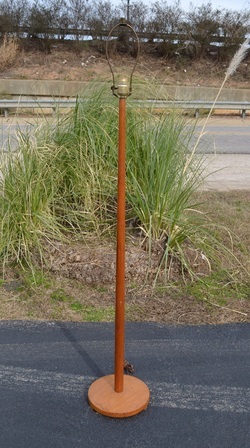 AFTER THE FINISH WAS REMOVED A COAT OF PENETROL WAS APPLIED TO GAURD AGAINST RUST. 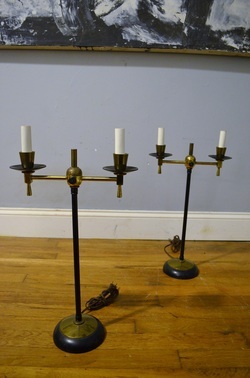 THIS SET IS IN GREAT SHAPE WITH ONLY MINOR SIGNS OF WEAR. THESE CHAIRS HAD THE UPHOLSTERY REMOVED BECAUSE IT WAS IN TERRIBLE SHAPE. THE CHAIRS WERE A LITTLE WIGGLY SO WE TOOK THEM APART. THEY SIMPLY NEED ONE DOWEL REPLACED, (EXTREMELY EASY) AND REGLUED. THEY COULD STAND TO BE CLEANED AND OILED AS WELL. THE UPHOLSTERY SHOULD COST ABOUT $250-$400 DEPENDING ON WHERE YOU GO. WE CAN HAVE IT DONE FOR YOU IF YOU LIKE. WE JUST DON'T WANT TO REASSEMBLE THEM IN CASE THEY NEED TO GO ON EBAY SO THAT WE CAN SHIP THEM EASILY! 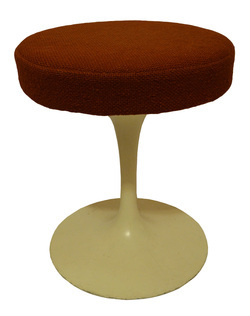 THIS IS A REALLY COOL LITTLE STOOL. YOU CAN FLIP THE SEAT UP AND THE BASE CAN BE SET THE OTHER WAY FOR AN EXTRA COUPLE INCHES OF HEIGHT. THE ORIGINAL UPHOLSTERY IS IN GOOD SHAPE BUT THE FOAM IS NOT. IT RETAINS ITS ORIGINAL TAGS. 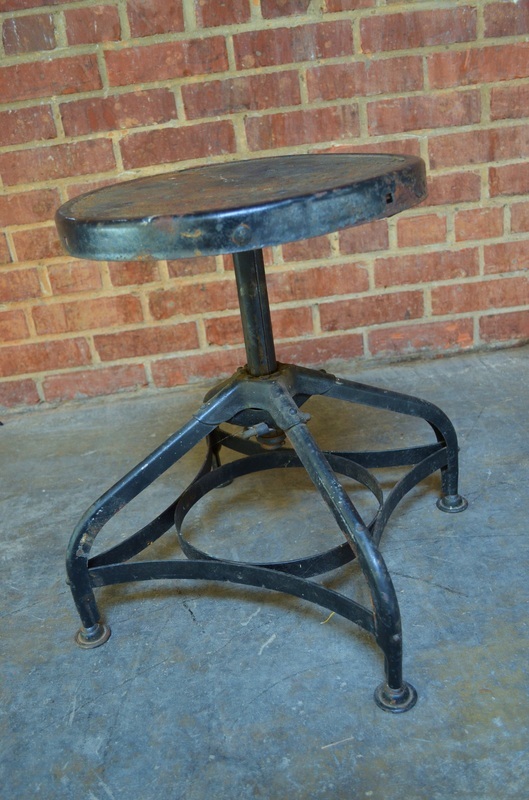 THIS STOOL IS IN OKAY SHAPE, IT DOES HAVE A COUPLE BREAKS AND IT'S MISSING SOME OF IT'S INTERIOR SUPPORT. IT COULD BE REPAIRED OR JUST USE IT AS IS. WE'RE FAIRLY CERTAIN IT'S THE REAL DEAL! THIS IS A REALLY NEAT LITTLE WASTE BIN. IT SITS AT AN ANGLE. 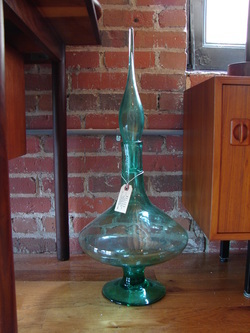 IT IS MARKED HELLER AND IS A REALLY GREAT BRIGHT GREEN COLOR. IT HAS ONE MINOR SPLIT ON THE BOTTOM. YOU CAN'T SEE IT UNLESS YOU FLIP IT. THIS SET IS IN GREAT SHAPE. YOU WILL PROBABLY WANT TO OIL THE WOOD. THEY ARE IN OTHERWISE EXCELLENT READY TO USE CONDITION. NICE LARGE SCALE MURANO CHANDELIER CIRCA 1970'S IN NEARLY PERFECT CONDITION. THE GLASS IS FLAWLESS AND THE CHROME IS IN GREAT SHAPE BUT COULD STAND A GOOD CLEANING. 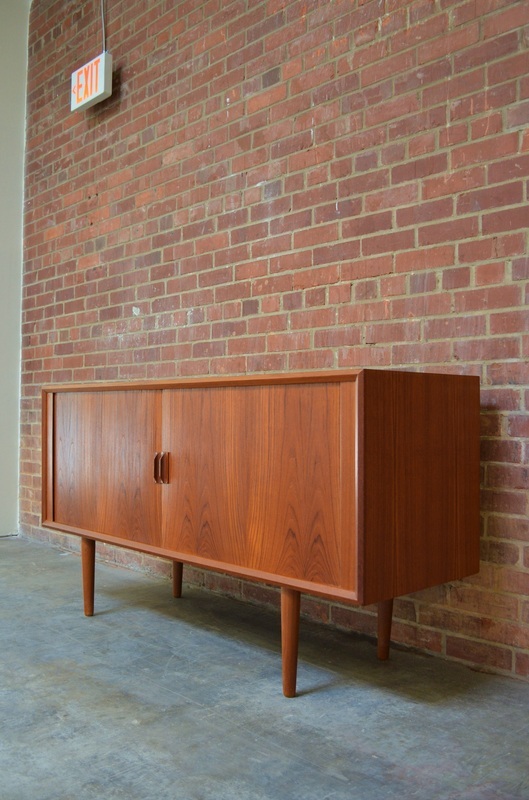 THIS LITTLE CREDENZA IS PERFECT FOR A LIVING ROOM. IT IS 59" WIDE SO IT WILL ACCOMODATE MOST TELEVISIONS. IT HAS PLENTY OF ROOM INSIDE FOR YOUR STEREO STUFF. SOMEONE DRILLED HOLES IN THE BACK FOR CORDS. IT HAS A FEW MINOR IMPERFECTIONS BUT NOTHING MAJOR, IT'S READY TO GO! 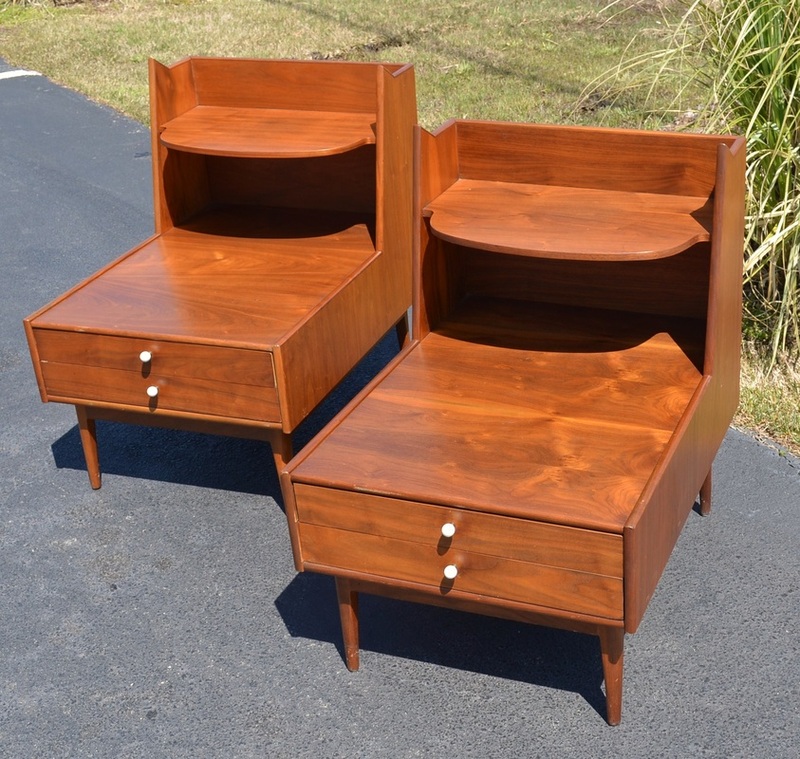 THESE NIGHT STANDS WERE PRODUCED BY PLYMODERN, THE COMPANY THAT LATER MORPHED INTO THE PLYCRAFT COMPANY. THIS EARLY, IMPORTANT SET IS EXTREMLY HARD TO FIND AS THEY WERE ONLY PRODUCED FOR ONE YEAR. 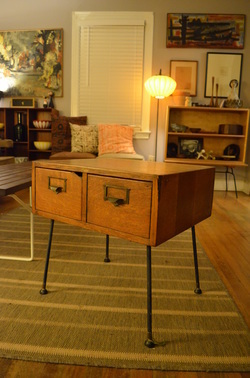 MORE INFOMATION CAN BE FOUND HERE: http://portland-deco.blogspot.com/2011_01_01_archive.html . THIS SET HAS SEVERAL VENEER CHIPS AND WILL NEED RESTORATION. NO CHIPS, CRACKS OR REPAIRS ON THIS BEAUTIFUL LITTLE VASE. IT HAS GREAT COLORS AND IS PERFECT FOR A COUPLE OF FLOWERS ON YOUR DESK! THIS BENCH IS IN SUPER SOLID STRUCTURAL CONDITION. THE FINISH IS WORN IN SOME AREAS AND THEIR IS A PIECE OF SANDPAPER STUCK TO THE TOP (SEE PIC). 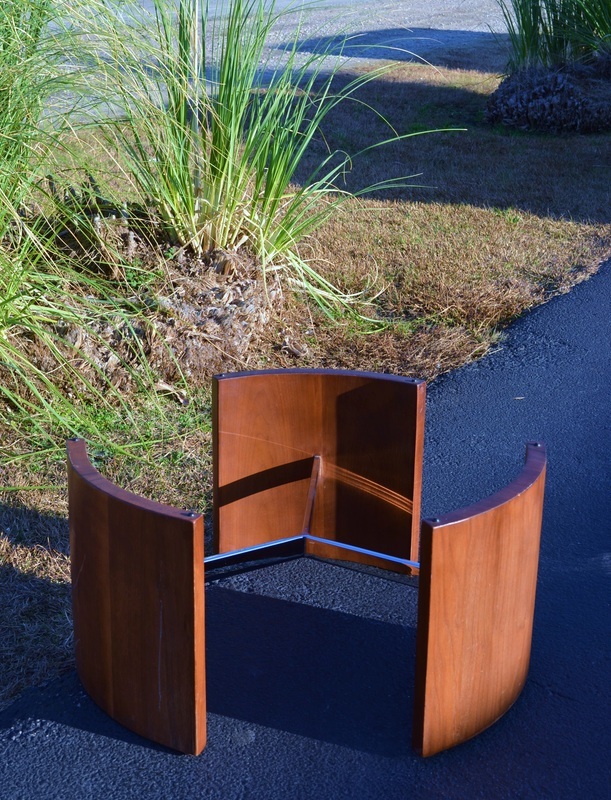 IT SHOULD BE A QUICK AND EASY REFINISH! WE HAVE TWO OF THESE DESKS RIGHT NOW. THEY HAVE BEEN STRIPPED AND PENETROLED. THEY LOOK AMAZING IN PERSON! WE ARE FAIRLY CERTAIN THE FABRIC IS GIRARD BUT CAN'T BE 100% CERTAIN. IT HAS THE RIGHT PATTERN AND THE MATERIAL IS WOOL. IT IS IN GREAT SHAPE AND READY TO USE! 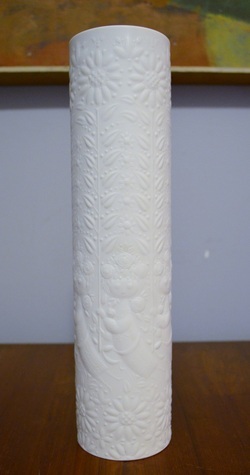 THIS VASE IS IN EXCELLENT CONDITION AND IS STUNNING IN PERSON! 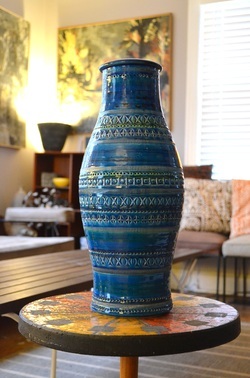 THIS VASE HAS A DEEP BLUE COLOR WITH YELLOW APPLIED AROUND. VERY NICE CONTRAST IN PERSON. 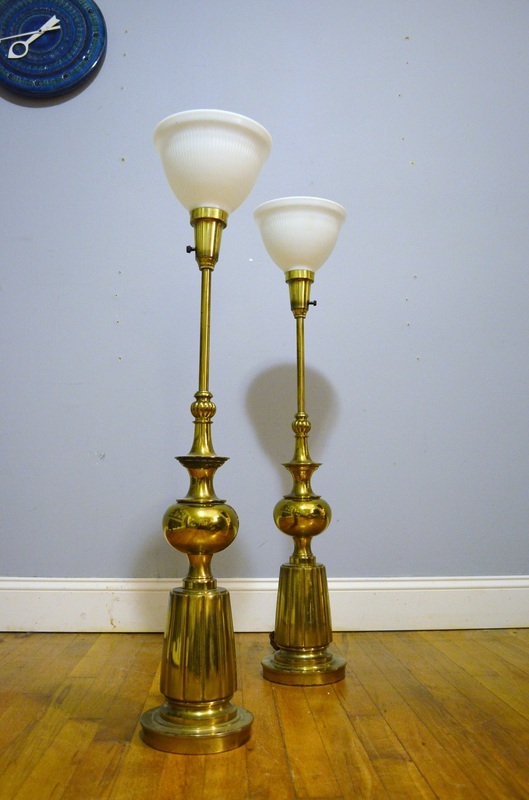 THIS PAIR IS SUPER LOW AND IN GREAT SHAPE. 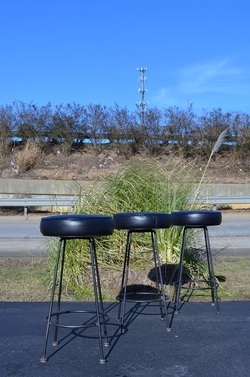 THEY WILL NEED SOME VERY MINOR BLACK TOUCH UP PAINT IN A FEW SPOTS BUT THEY ARE IN OVERALL GREAT READY TO USE CONDITION! 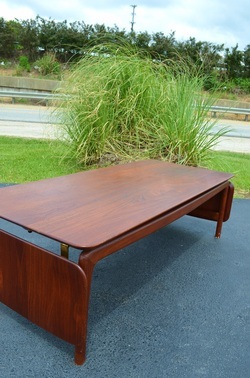 THIS SOLID WALNUT COFFEE TABLE IS BEAUTIFUL AND READY TO ENJOY! THESE ALUMINUM, BRAZILIAN ROSEWOOD AND WALNUT ARMCHAIRS ARE IN REALLY NICE CONDITION. THE CREAM COLORED VINYL IS IN GREAT SHAPE. 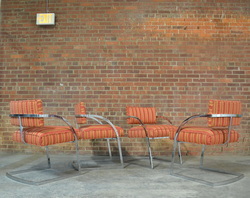 THEY ARE READY TO USE AS IS OR YOU CAN ADD $350 FOR YOUR CHOICE OF NEW UPHOLSTERY! IT WILL ADD ABOUT TWO WEEKS. THIS SMALL STOOL HAS LOTS OF GREAT WEAR. IT IS ADJUSTABLE AND LOOKS GREAT! YES, THIS CHAIR IS BEAT UP BUT IT IS A FIRST YEAR. 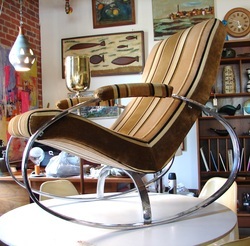 IT HAS THE THREE BOLT ARMREST PATTERN, SILVER CLIPS, ALL DOWN CUSHIONS AND THE BRASS PART IN THE BASE. ONE SIDE WAS DRILLED AND THE SEAT CUSHION HAS SEEN BETTER DAYS. IT IS MISSING ALL THE BUTTONS BUT IT IS AS ORIGINAL AND NERDY AS IT GETS! YOU CANNOT BUY AN EARLIER VERSION OF THIS CHAIR. 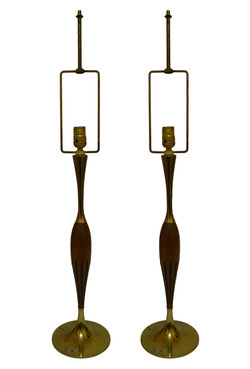 THIS PAIR OF EXCEPTIONAL IS IN GREAT SHAPE AND THEY WORK JUST AS THEY SHOULD. THEY BOTH RETAIN ALL THEIR ORIGINAL PARTS WITH VERY MINIMAL SIGNS OF AGE. ONE LAMP HAS A BIT OF MILD WEAR TO THE CAT TAILS. 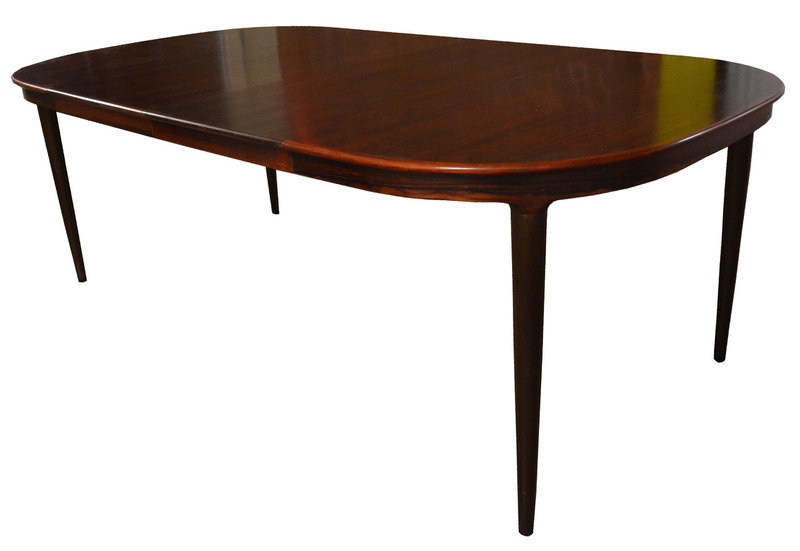 THIS AMAZING DINING TABLE HAS SUPER SOLID BRASS HARDWARE AND IS CONSTRUCTED OF ALMOST ENTIRELY SOLID TEAK. IT LOOKS SPECTACULAR AND IS IN GREAT USABLE CONDITION. THE TOP DOES HAVE SOME MILD VARIATION IN COLOR AND A SMALL SEPARATION LINE ALONG THE TOP BUT NOTHING MAJOR. JUST GOOD, HONEST, LIVED IN WEAR! 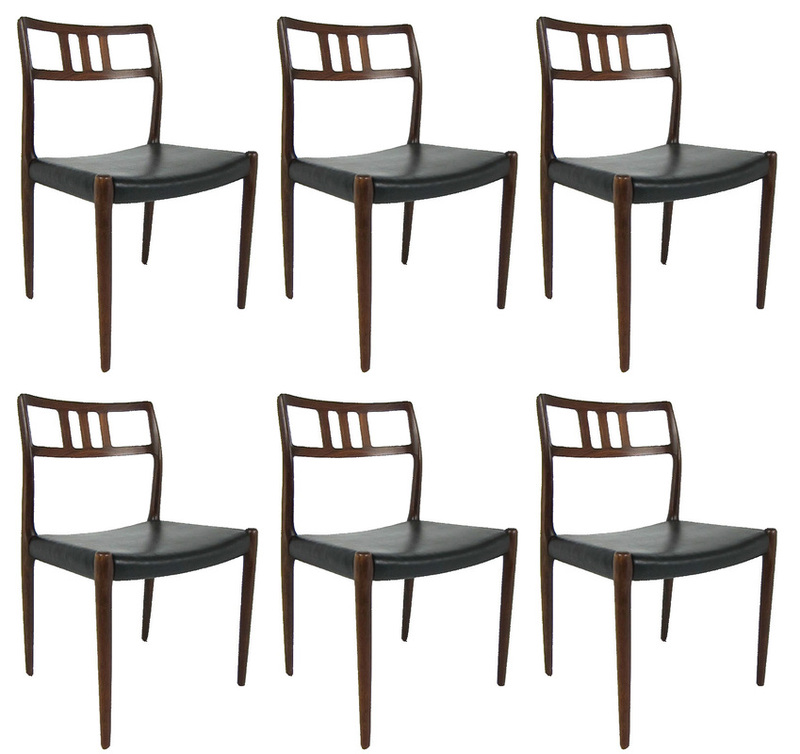 THIS SET OF EIGHT DINING CHAIRS IS IN ABSOLUTELY STUNNING CONDITION. THEY SEEM TO HAVE BEEN BARELY USED. 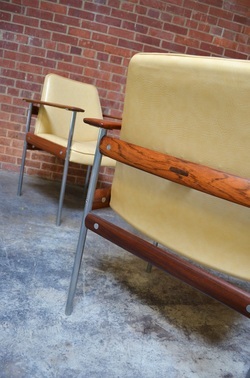 THE ORIGINAL UPHOLSTERY IS NEARLY FLAW FREE ALONG WITH THE FINISH. THEY HAVE SOME LIGHT WEAR TO THE LEGS BUT IT IS VERY, VERY MINOR. THESE CHAIRS ARE ABSOLUTELY STUNNING IN PERSON. THE SOLID TEAK SCULPTED FRAMES ARE BEAUTIFUL. 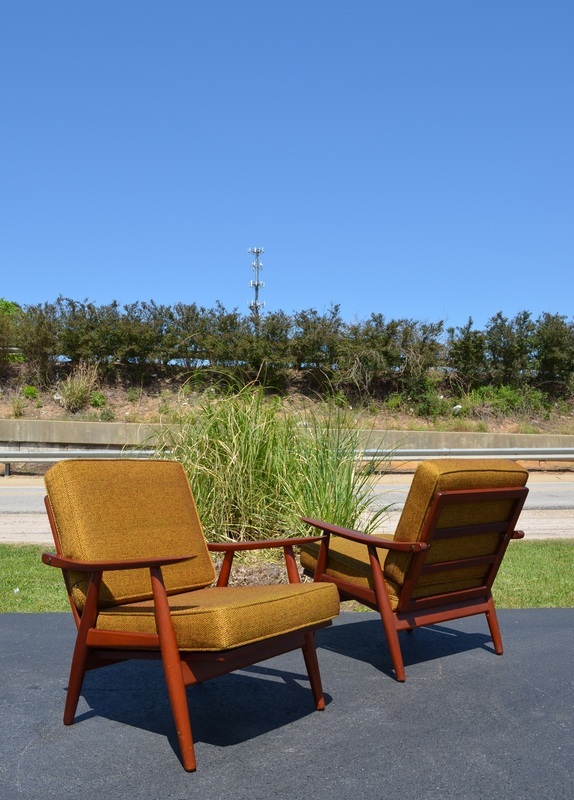 THE BRAND NEW HIGH QUALITY NAUGAHYDE UPHOLSTERY IS IN FLAWLESS CONDITION. THERE ARE A COUPLE OF MINOR CONDITION ISSUES BUT NOTHING MAJOR. THESE ARE SUPER SOLID. THIS CHAIR HAS A BRAND NEW COVER SET. 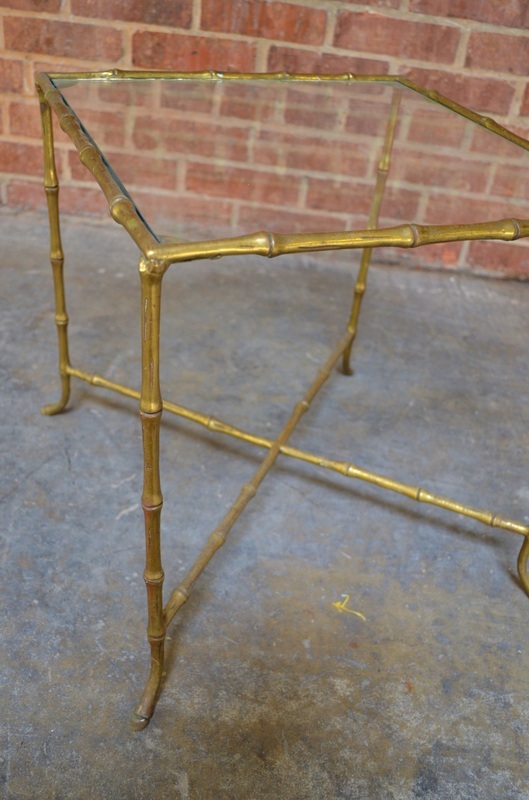 THE FRAMES ARE FREE FROM BREAKS, WELDS OR OTHER REPAIRS. THE PAINT ON THE OTHER HAND WILL NEED SOME ATTENTION. THEY WILL EITHER NEED TO BE TOUCHED UP WITH SOME SPRAY PAINT OR YOU COULD GO ALL OUT AND HAVE THEM SAND BLASTED AND POWDERCOATED. THIS SOFA WILL NEED NEW UPHOLSTERY THE FABRIC IS WORN AND THE FOAM IS HARD. IF YOU'D LIKE IT DONE ADD $800 FOR A TOTAL OF $2450 IN YOUR FABRIC. 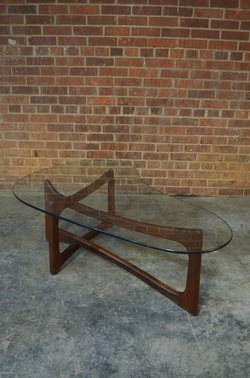 THE SOLID WALNUT FRAME IS IN EXCELLENT CONDITION. 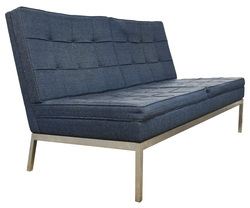 THIS SOFA WOULD LOOK GREAT FLOATED IN A ROOM. 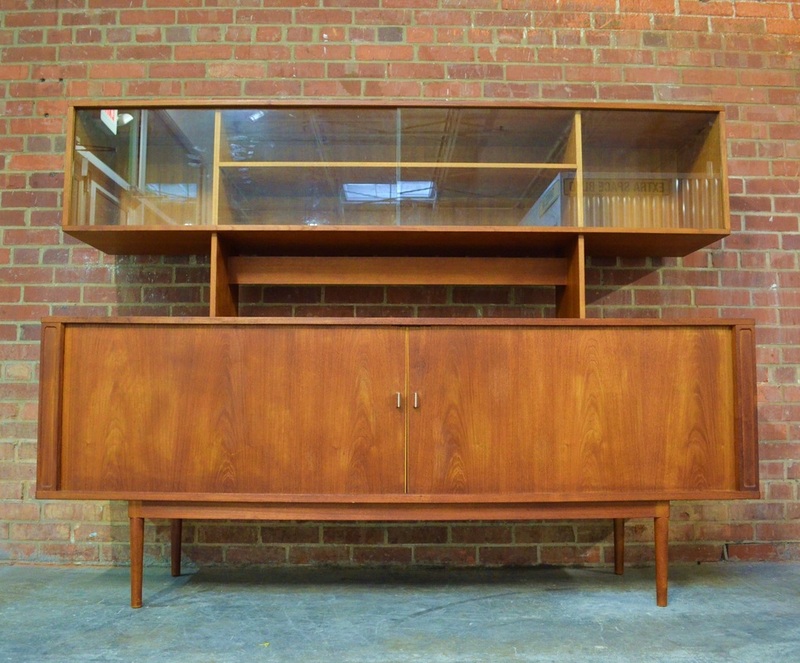 THE EXPOSED FRAME IN THE BACK IS STUNNING! 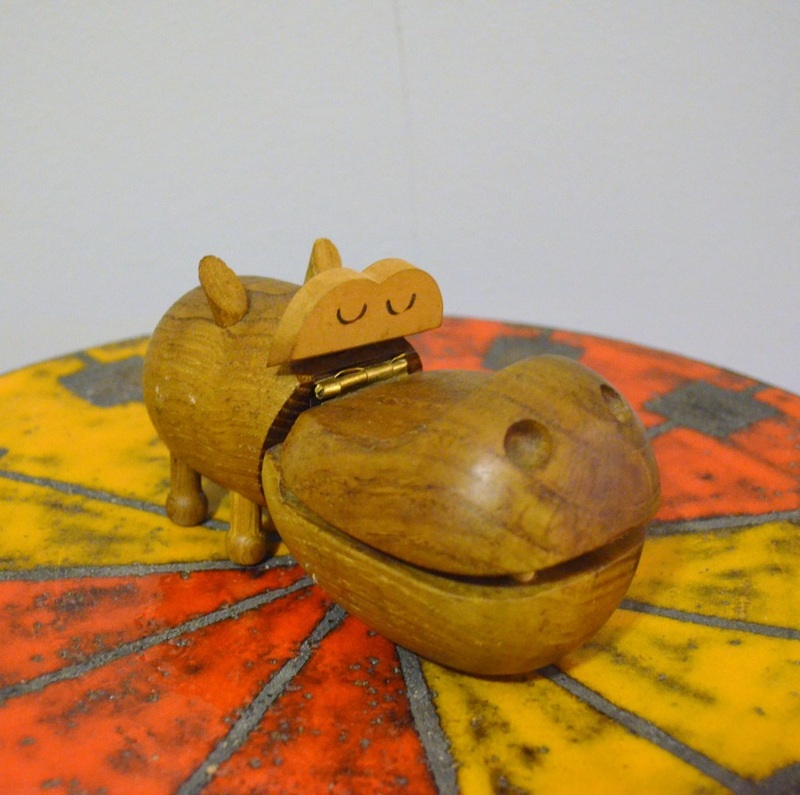 REALLY COOL LITTLE HIPPO. UNFORTUNETLY HE IS MISSING HIS TAIL AND THE HINGES ARE A LITTLE BENT. OVERALL HE STILL SHOWS VERY WELL. THIS SET IS IN DECENT SHAPE AND READY TO USE! 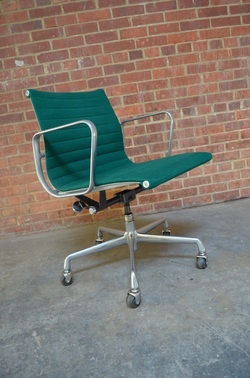 THIS IS THE SAME ONE DON DRAPER USES ON MAD MEN! IT HAS GREAT LINES AND IS IN EXCELLENT CONDITION. 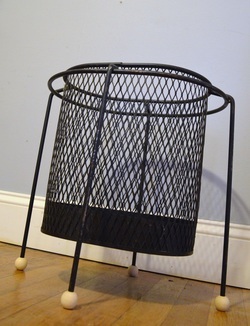 THIS EARLY DANSK BUCKET IS IN REALLY NICE CONDITION WITH A DEEP RICH PATINA. IT HAS AN ORANGE LINER. 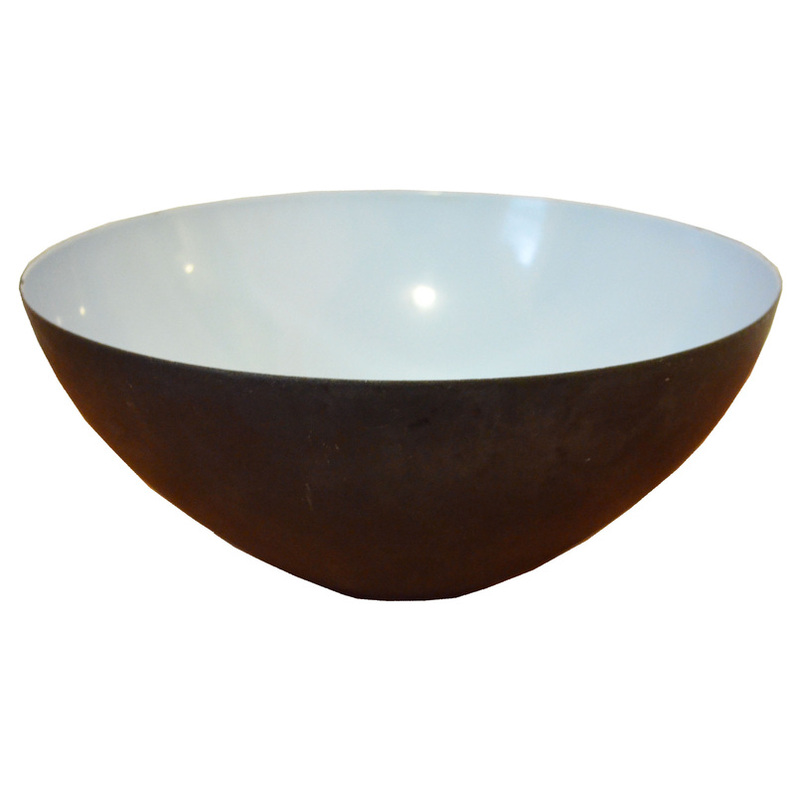 THIS LARGE THREE FOOTED BOWL IS IN EXCELLENT ORIGINAL CONDITION AND RETAINS ITS ITTALA TAG. THIS CUTTING BOARD USUALLY BRINGS $200+ ON EBAY BUT THIS ONE HAS A DRY SPLIT THAT GOES DOWN THE MIDDLE. YOU CAN FIX IT AND CLEAN IT UP OR JUST USE IT LIKE IT IS! WE ARE UNCERTAIN WHO MADE THESE BUT LORIDS LONBORG SEEMS LIKE A LIKELY CANDIDATE. THEY HAVE WEIGHTED SCREWS ON THE BOTTOM TO KEEP THEM UPRIGHT. WE HAVE ONE SET IN THE BOX (SOLD), ONE SET THAT IS ODDLY UNCUT (SOLD), ONE SET OUT OF THE BOX AND ABOUT 14 RANDOM CARDS. INQUIRE FOR PRICING OF EACH SET. 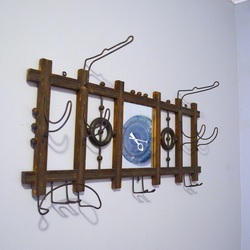 THIS IS A GREAT LOOKING COAT RACK. 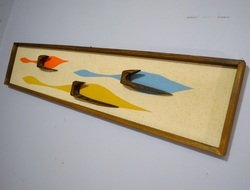 IT IS MISSING ONE OF THE HOOKS ON THE RIGHT SIDE IN THE PICTURE. YOU COULD USE IT AS IS OR REMOVE THE OTHER ONE. 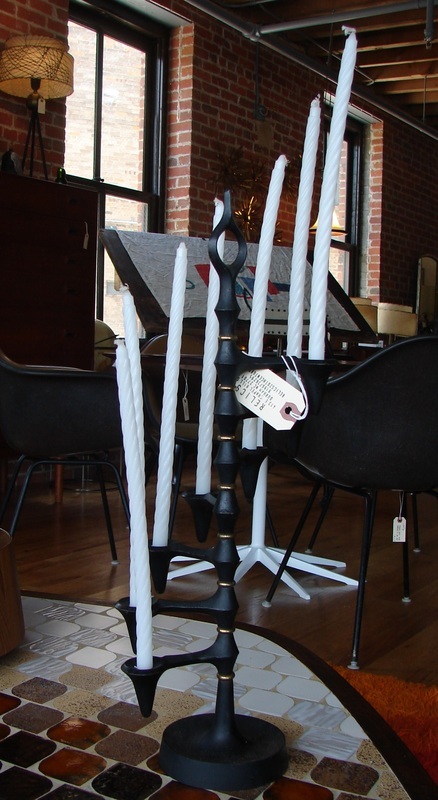 OR YOU COULD MAKE A NEW PIECE WITH A COAT HANGER. EITHER WAY IT LOOKS SPECTACULAR! 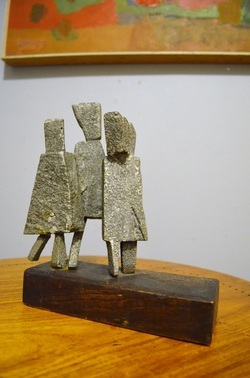 THIS SMALL SCULPTURE HAS GREAT LOOKS AND IS IN EXCELLENT CONDITION. 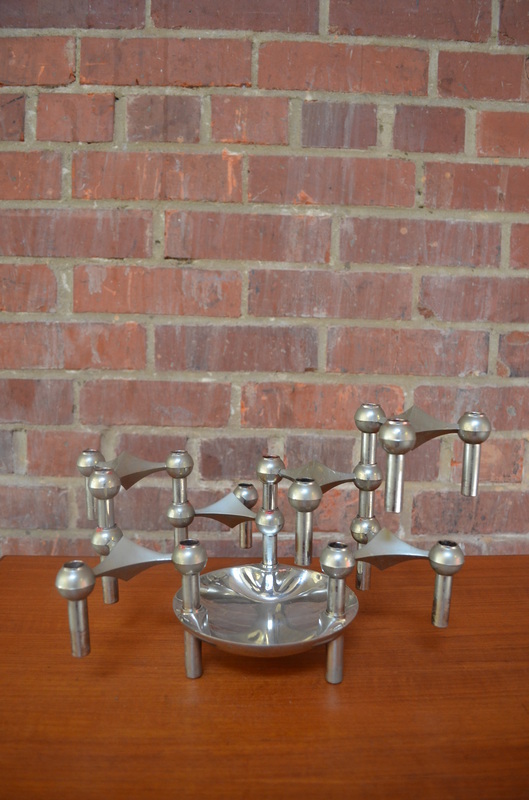 WE THINK IT IS MADE OF ALUMINUM. 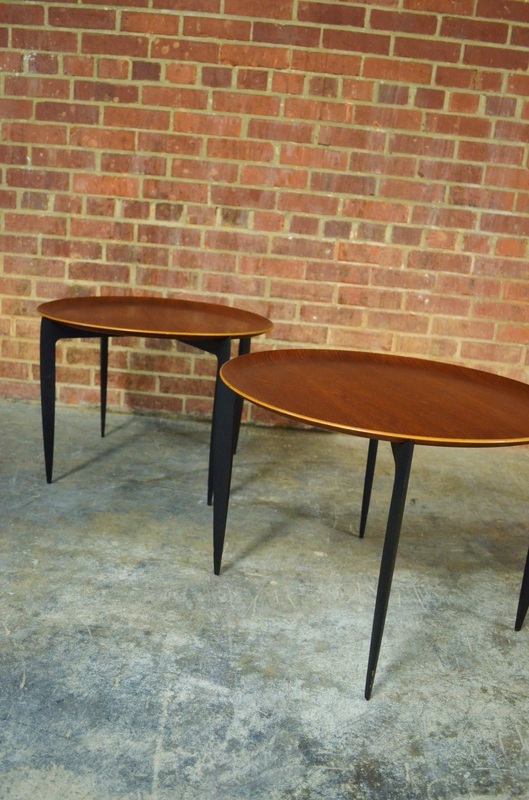 THIS UNUSUAL SET OF NESTING TABLES IS IN GREAT SHAPE. THEY CAN BE CONFIGURED IN MANY DIFFERENT WAYS AND ARE CONSTRUCTED ALMOST EXACTLY THE SAME AS THE KAI KRISTIANSEN CUBE TABLES. THESE CHAIRS WILL NEED SOME WORK. THEY ARE ONE OF THE MOST DIFFICULT COLORS TO FIND SO THE PRICE IS RIGHT! THEY ARE VERY SUN FADED BUT THE NARROW MOUNT SHOCKS ARE IN PLACE. YOU WILL NEED TO SAND THEM DOWN AND APPLY PENETROL FOR THEM TO BE PRESENTABLE. THEY HAVE MINOR EDGE WEAR AS WELL. 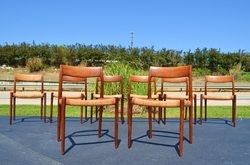 THIS SET OF SOLID TEAK DINING CHAIRS IS IN GREAT SHAPE. THERE ARE A FEW WIGGLY JOINTS THAT COULD BE REGLUED. 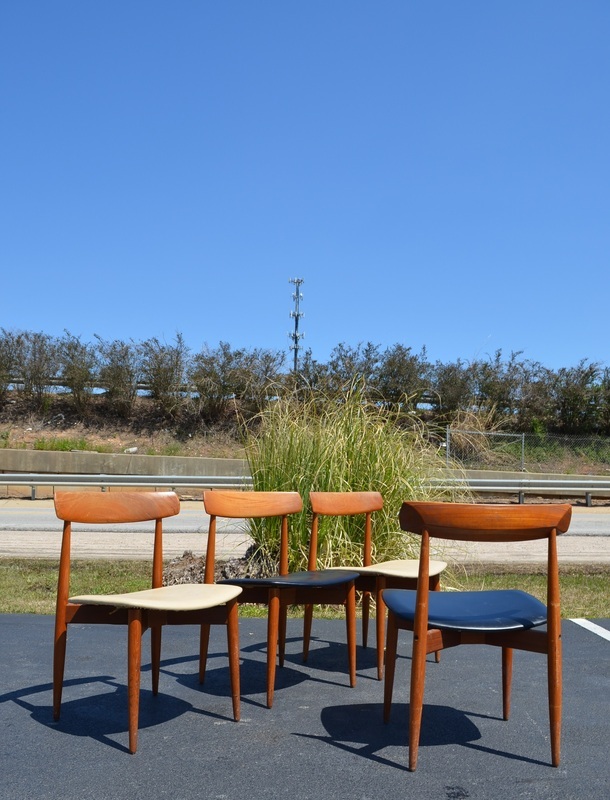 OVERALL THEY ARE IN GREAT SHAPE AND CAN BE USED AS IS, THE UPHOLSTERY IS IN NEARLY PERFECT SHAPE. 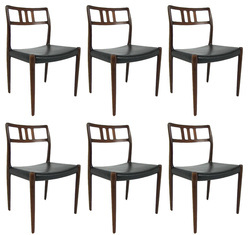 THERE IS A FIFTH SIDE CHAIR THAT YOU CAN HAVE IF YOU WANT IT AS WE KNOW NOONE REALLY NEEDS FIVE CHAIRS. THIS CHAIR IS IN NICE VINTAGE CONDITION, VERY USABLE. THERE IS A BIT OF CHIPPING TO THE WHITE PAINT BUT NOTHING UNSIGHTLY. IT COULD BE TOUCHED UP EASILY. 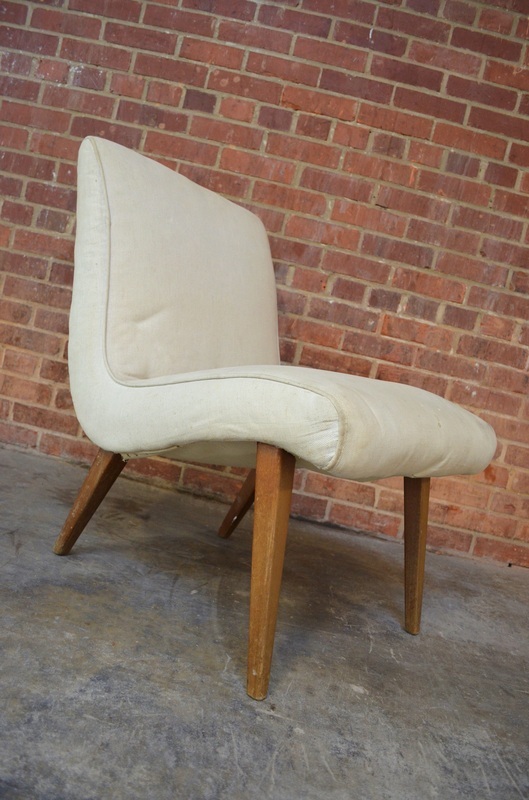 THIS SAD LITTLE CHAIR NEEDS SOME NEW FABRIC. IT WAS DONE IN A LIGHTWEIGHT COTTON BY SOMEONE WHO DID NOT KNOW WHAT THEY WERE DOING. 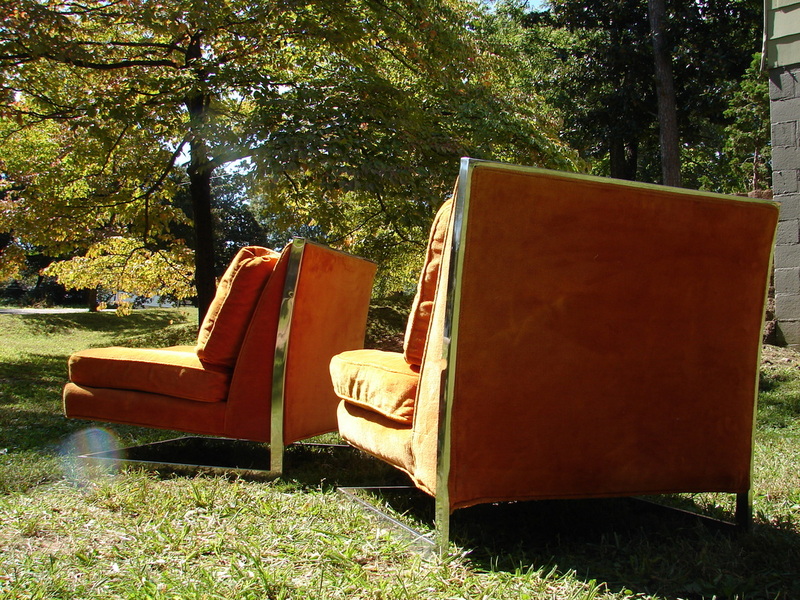 THE FOAM IS GOOD AND SO IS THE CHROME, YOU SHOULD HAVE PLENTY OF ROOM IN THE PRICE TO GET FABRIC AND UPHOLSTERY DONE! WE CAN RECOMMEND A GOOD PLACE TO GET IT DONE RIGHT WHILE KEEPING COST IN MIND! THIS CHAIR IS IN EXCELLENT CONDITION. THE UPHOLSTERY NEEDS A REDO BUT THE CANE IS IN GREAT SHAPE. 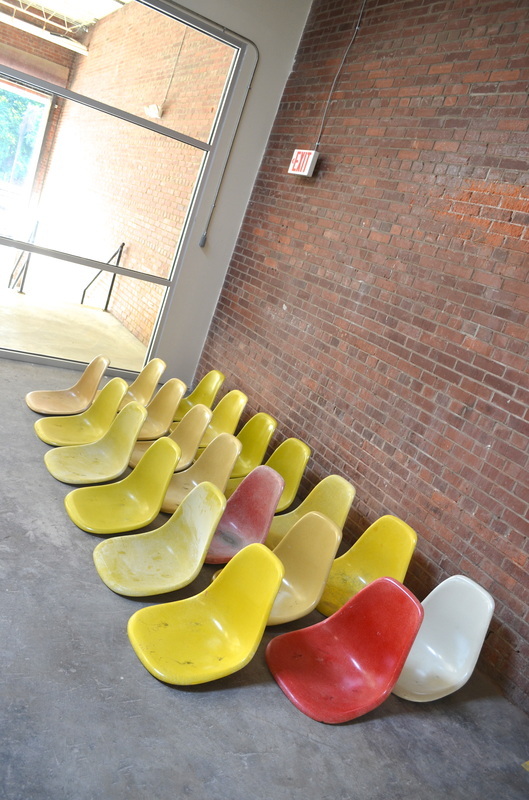 THESE GREAT CHAIRS HAVE BEEN COMPLETELY REDONE. THEY WERE SANDED, PRIMED AND PAINTED BLACK. 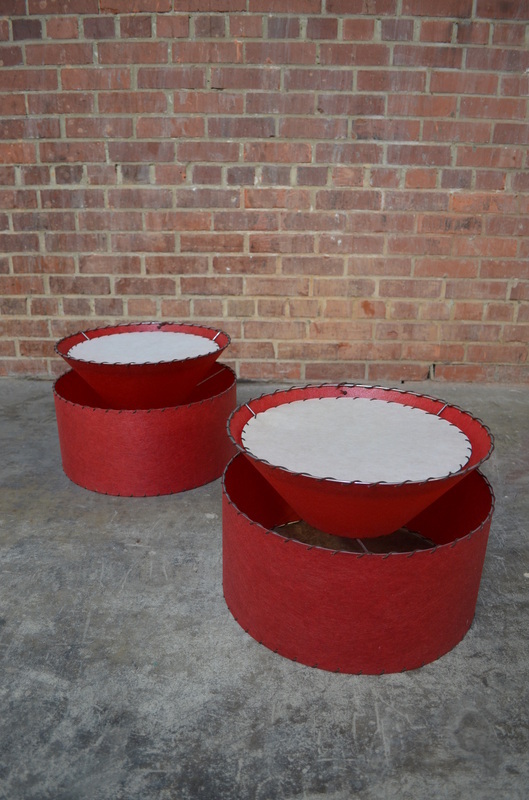 THE SEATS WERE REUPHOLSTERED IN A NICE COTTON BRICK RED FABRIC. 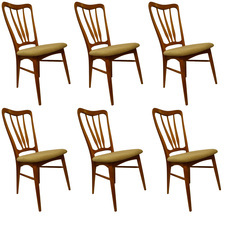 THIS IS BASICALLY A NEW SET OF CHAIRS. 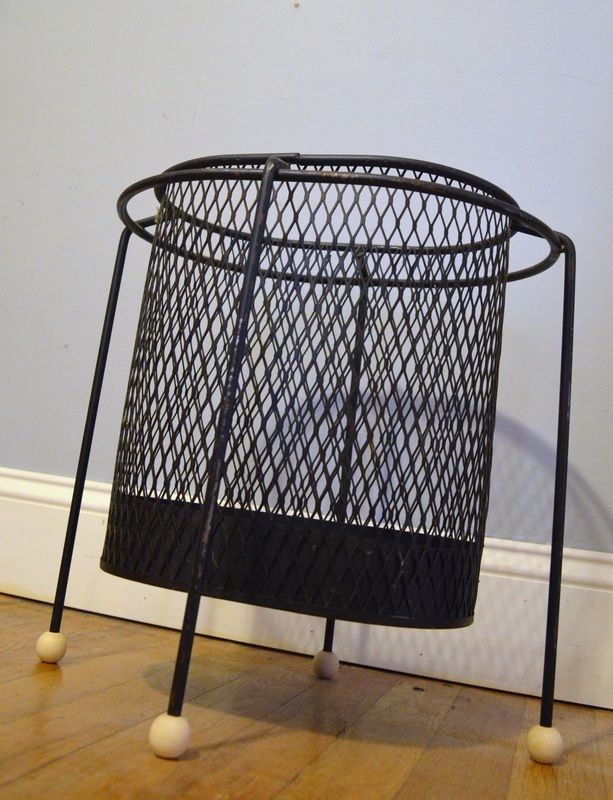 THIS BASKET IS IN NICE READY TO USE CONDITION. 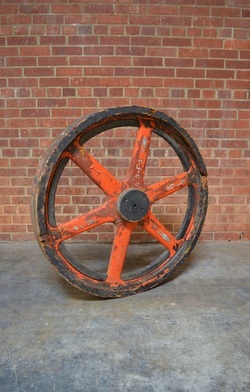 THE WHEELS SHOW A DECENT AMOUNT OF WEAR AND AGE BUT THEY STILL WORK! THIS LAMP IS IN NEAR MINT CONDITION. 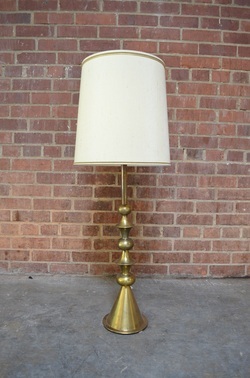 THE SHADE IS ORIGINAL AND THE BRASS, SOMEHOW, IS BRIGHT AND SHINY. THE ONLY BLEMISH ON THE LAMP IS THE DEFLECTOR ON THE BOTTOM WAS THE VICTIM OF A 100 WATT BULB. IT IS ON THE BOTTOM AND CAN'T BE SEEN, IT WOULD BE EASY TO CUT A NEW PIECE OF PLASTIC TO REPLACE IT. IT HAS A THREE WAY SWITCH. SORRY FOR THE TERRIBLE PICTURE. WE SET UP THE TABLE, TOOK ONE SHOT AND THE BATTERY DIED... 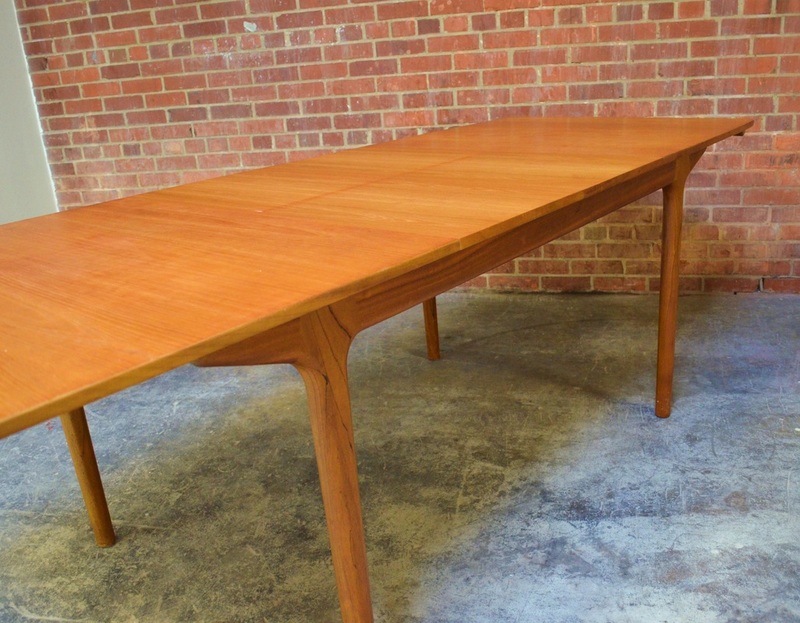 ANYWAY, THIS IS ONE OF THE BEST DINING TABLES YOU CAN BUY AND IT IS IN EXCELLENT CONDITION WITH TWO LEAVES. 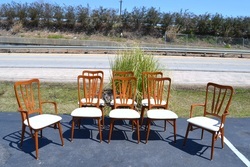 WE HAVE THE MATCHING SET OF EIGHT SORO STOLE DINING CHAIRS TO GO WITH THE TABLE COMING UP FOR SALE AS WELL! 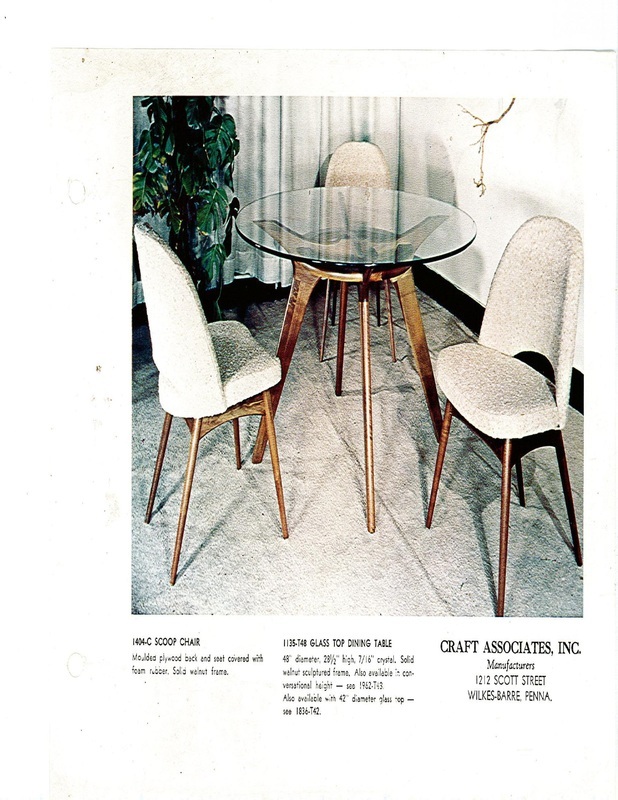 THIS TABLE HAS A FEW CHIPS TO THE FORMICA. 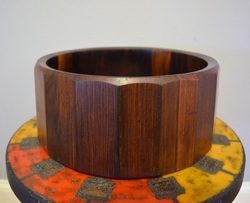 IT WOULD LOOK GREAT WITH A WLNUT VENEER TOP! 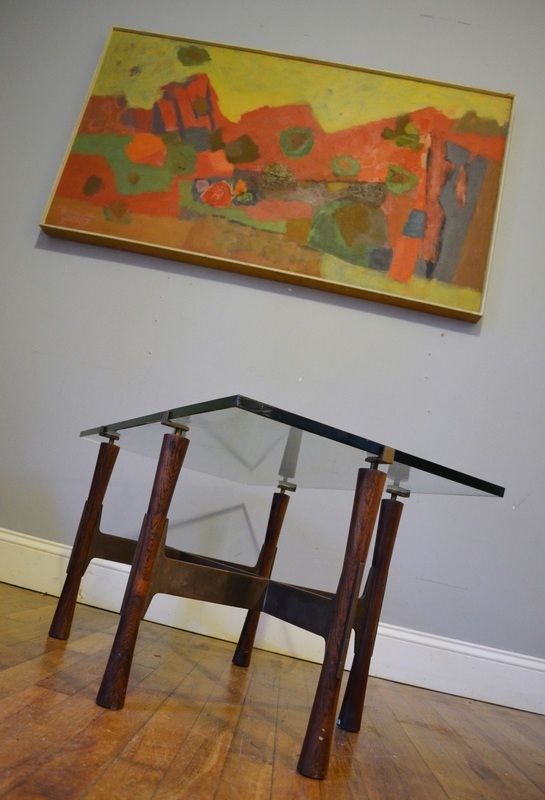 THIS TABLE SEEMS LIKE IT MUST BE A RISOM PIECE BUT WE CANNOT BE SURE. 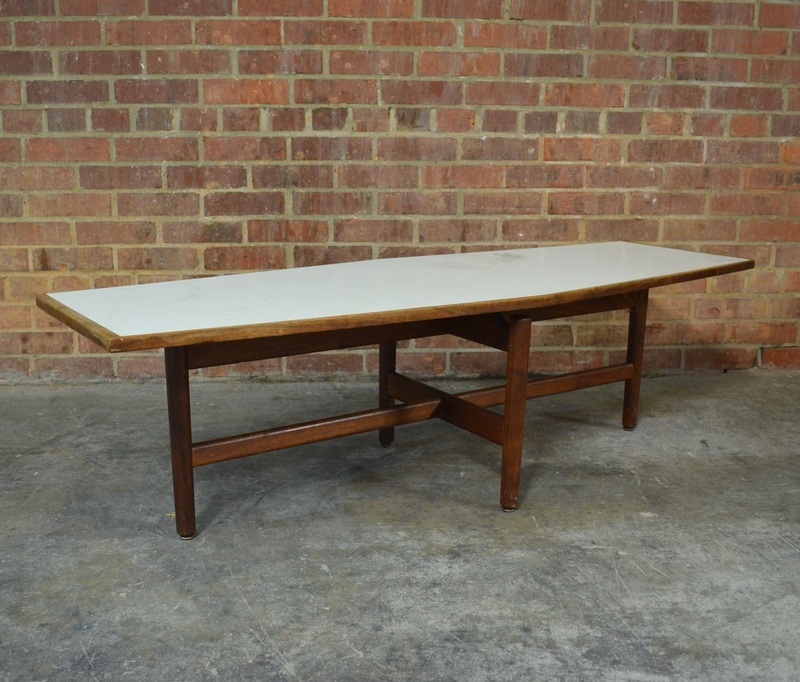 IT HAS WHITE FORMICA SURROUNDED BY WALNUT WITH A SOLID WALNUT BASE. IT NEEDS TO BE CLEANED, REFINISHED AND REGLUED. IT SHOULD BE A GREAT WEEKEND PROJECT! 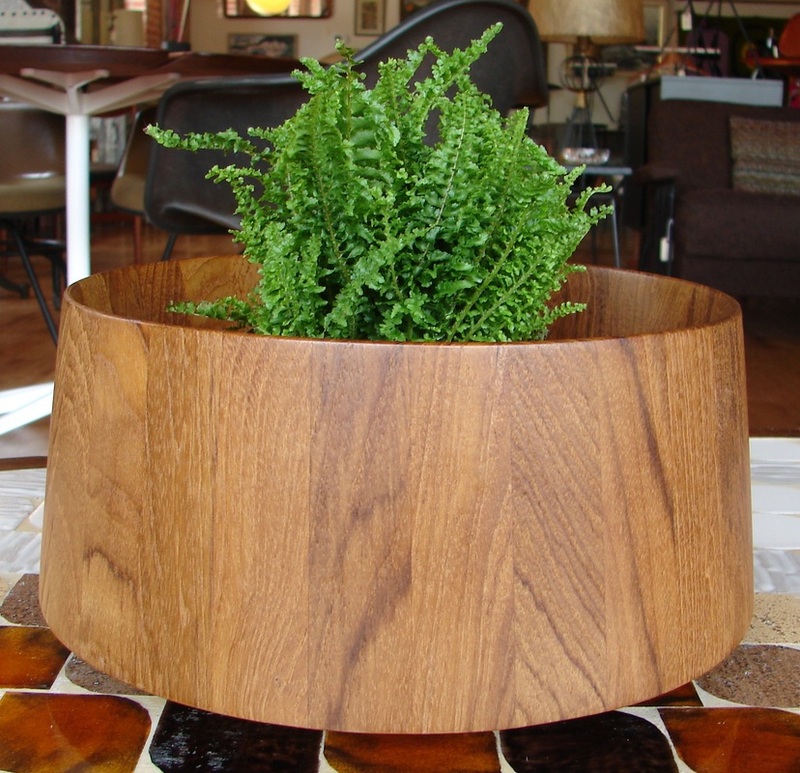 THE TOP IS A HEXAGON SHAPE AND THE WOOD COMES AWAY FROM THE TOP ON THE BASE TO CREATE A FLOATING EFFECT. 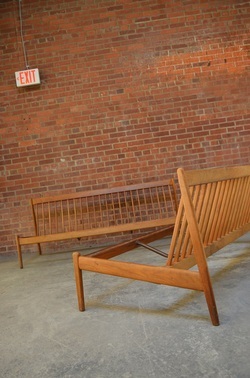 THESE DAYBEDS ARE IN GREAT SHAPE AND ARE MARKED WITH THE DUX LABEL. THEY BREAK DOWN FOR EASY TRANSPORT. THEY HAVE NO STRAPS OR CUSHIONS. WE'RE NOT SURE IF THIS IS LEGIT OR NOT BUT IT CERTAINLY LOOKS THE PART AND HAS THE RIGHT DIMENSIONS. 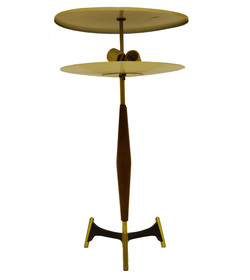 AN ALMOST IDENTICAL ONE OF THESE BROUGHT OVER $1700 AT A MODERN DESIGN AUCTION IN 2003. 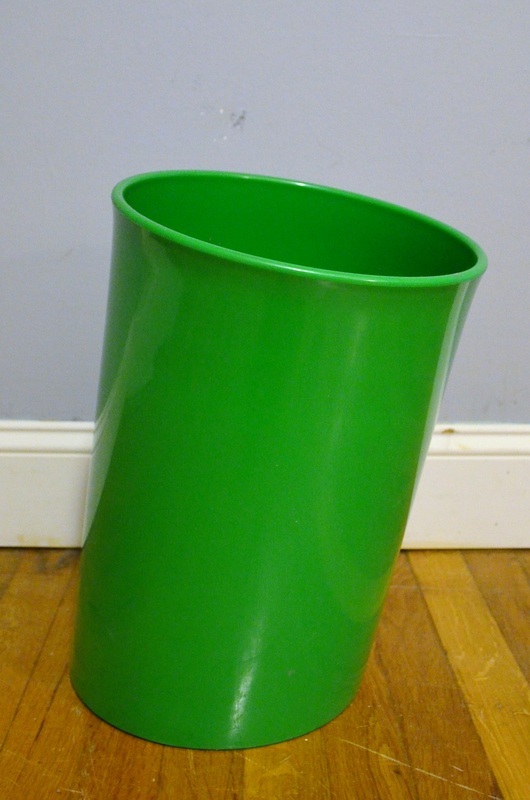 IT'S A GREAT LITTLE TRASH CAN ABOUT 15" BY 10". SUPER STEAMPUNK! THIS THING IS IN GREAT SHAPE AND IS READY TO USE. 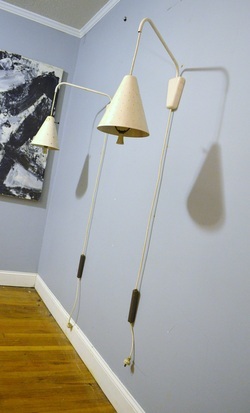 THIS PAIR OF LAMPS IS IN ROUGH SHAPE. 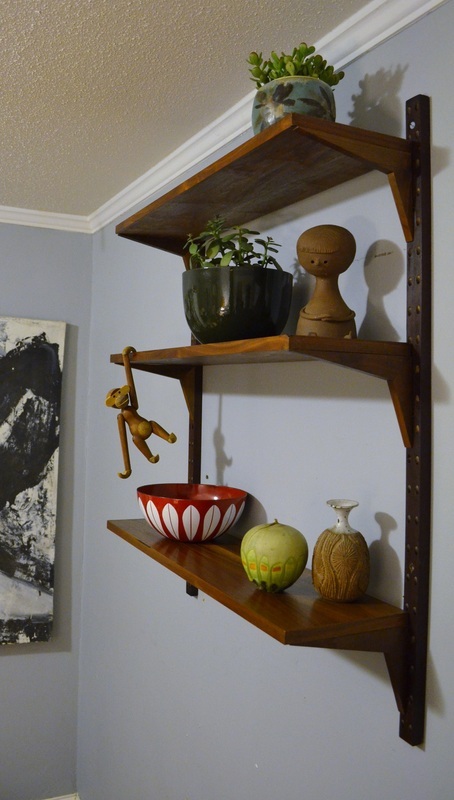 THEY WERE BADLY PAINTED AND THE BRACKETS TO MOUNT THEM TO THE WALL ARE MISSING. THEY ARE JUST PERCHED ON SCREWS IN THE PHOTO. YOU WILL NEED TO FABRICATE SOMETHING TO MOUNT THEM. 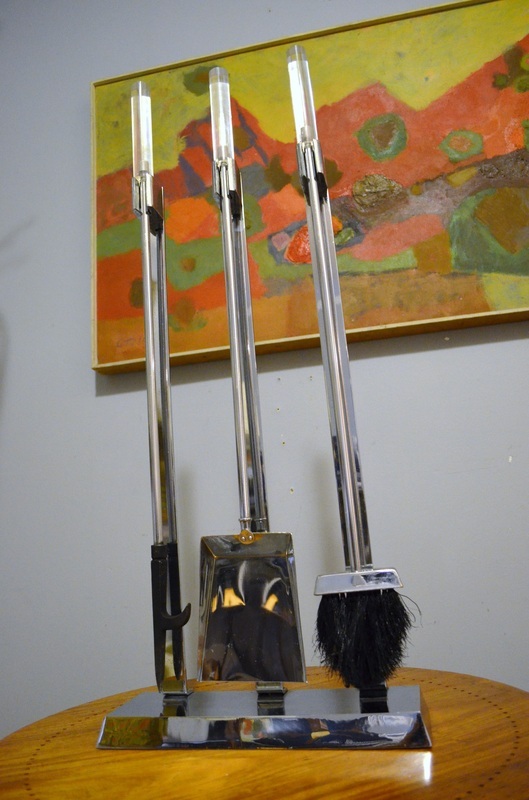 YOU WILL ALSO WANT TO REFINISH/STRIP THEM. THEY OPERATE AS THEY SHOULD AND THE CORD IS FINE. 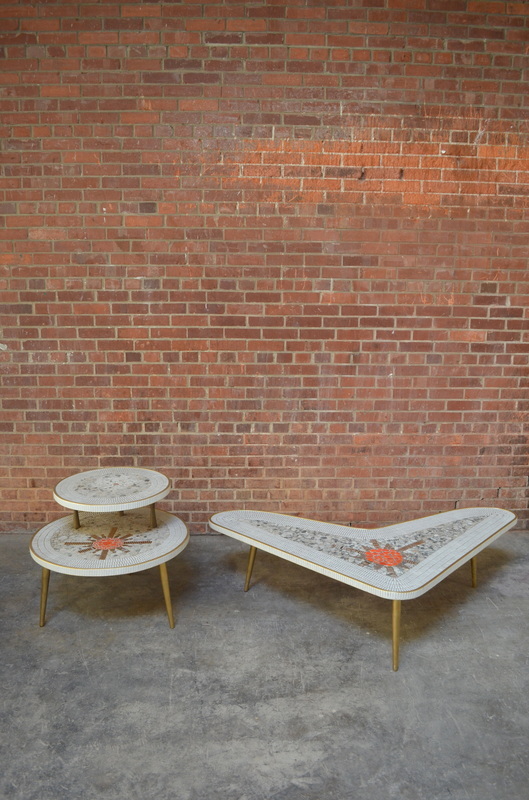 THESE WOULD BE GREAT FLANKING A SOFA! 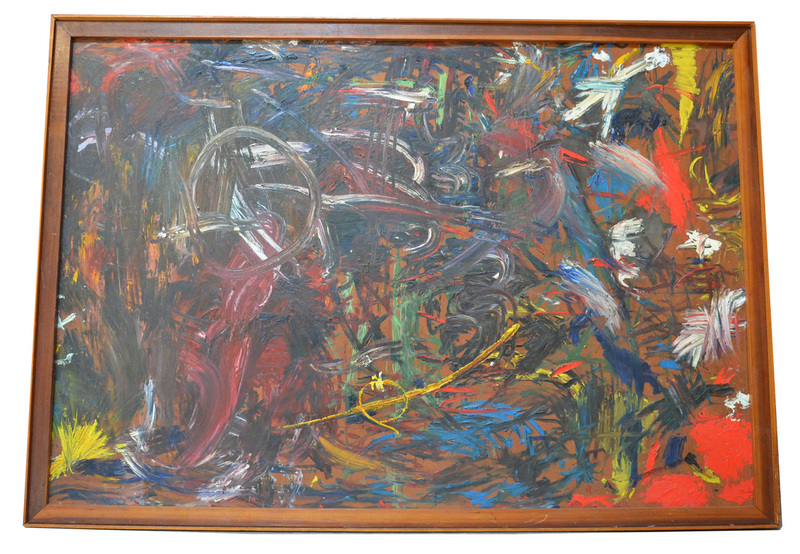 THIS INCREDIBLE RARE SIGNED PIECE IS IN EXCELLENT UNUSED CONDITION! 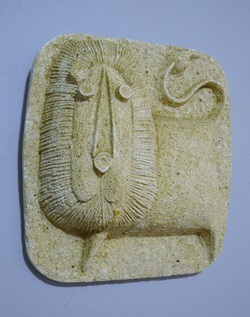 IT IS DATED 1972. THIS SUN IS ABSOLUTELY BEAUTIFUL. 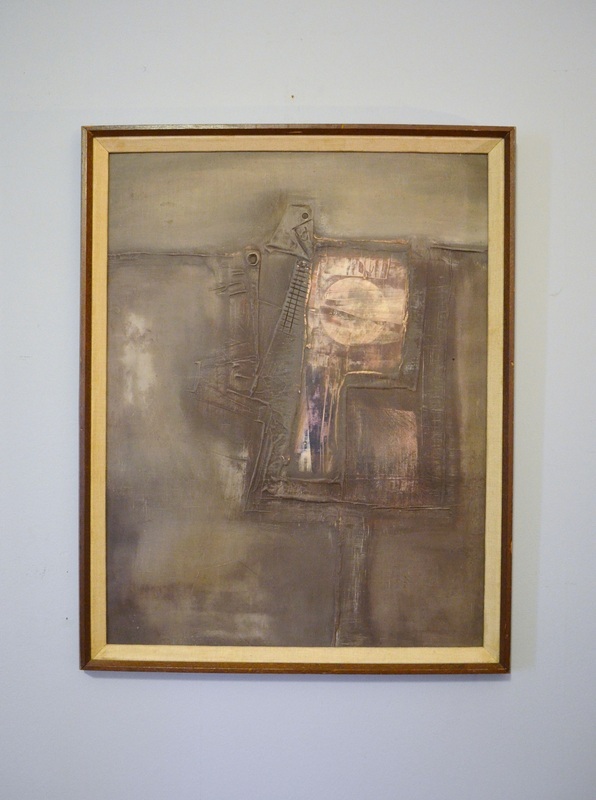 IT HAS BEEN HUNG AND HAS PIN HOLES IN THE CORNERS ALONG WITH SOME LIGHT FADING TO THE CLOTH BUT NOT THE IMAGE. THERE ARE ALSO A COUPLE OF SMALL BROWNISH SPOTS. OVERALL IT IS IN EXCELLENT CONDITION BUT IT DOES SHOW SOME VERY MINOR WEAR. IT IS SIGNED AND DATED 1972. 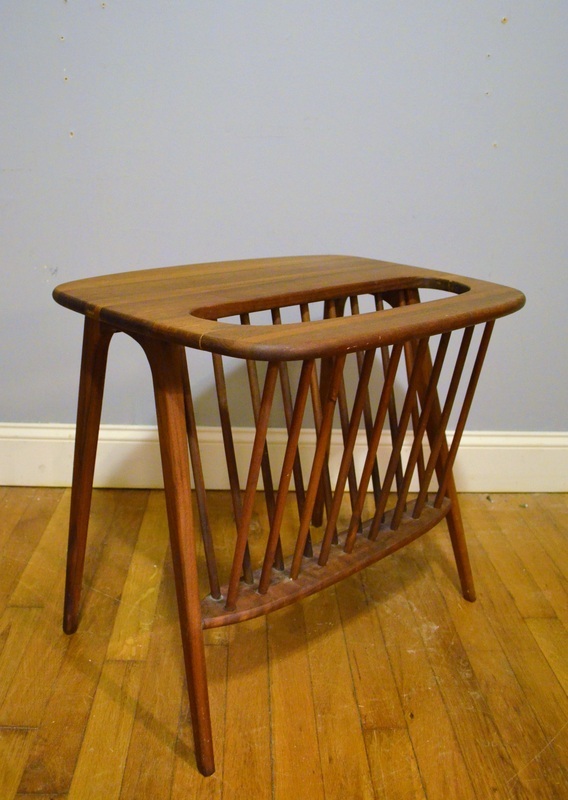 THIS SOLID WALNUT SIDE TABLE IS IN GREAT SHAPE AND IS READY TO ENJOY! THIS BEAUTIFULLY CONSTRUCTED SOLID TEAK MIRRO IS IN EXCELLENT SHAPE. IT HAS A COUPLE OF VERY MINOR IMPERFECTIONS BUT NOTHING UNSIGHTLY. THE CORNERS ARE EXPERTLY JOINED. 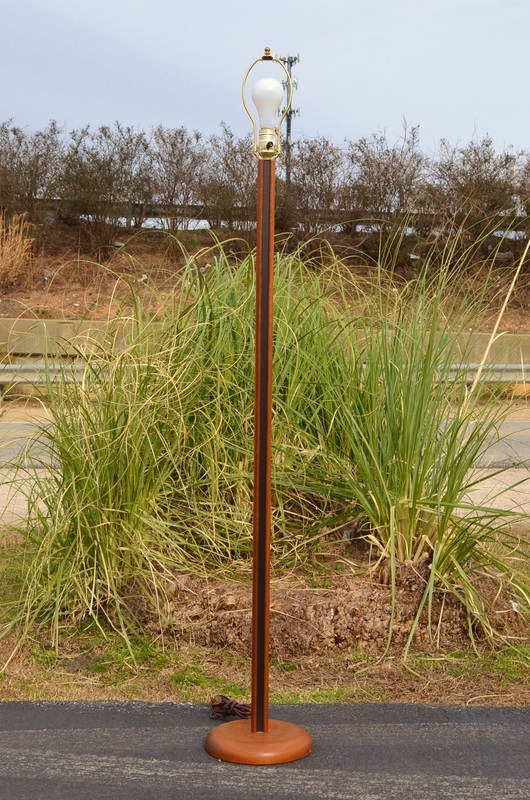 THE MIRROR CAN BE HUN HORIZONTALLY OR VERTICALLY. IT IS 39.5 INCHES BY 20.75 INCHES. THIS INCREDIBLY RARE PIECE OF MID CENTURY MODERN HISTORY IS THE ONLY ONE WE COULD FIND ANYWHERE. THIS COULD AND MAY VERY WELL BE THE ONLY KNOWN EXAMPLE OF THIS OBSCURE DESIGN. THE ORIGINAL PAINT HAS SOME WEAR BUT IT IS ORIGINAL! 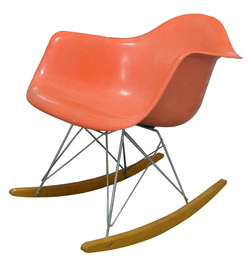 ITEMS LIKE THIS ARE SURE TO SKYROCKET IN VALUE AS THE 20TH CENTURY DESIGN CRAZE CONTINUES TO GET FIRED UP! THESE ARE IN GREAT SHAPE. THE PRICE IS A PAIR. 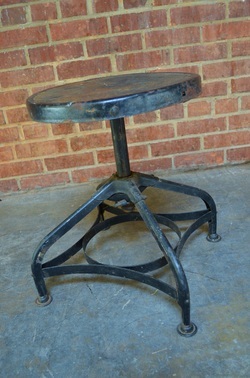 THIS SIDE TABLE IS IN EXCELLENT CONDITION WITH TONS OF PATINA AND NO REAL SIGNS OF WEAR, JUST AGE. THE ONLY CONDITION ISSUE IS THAT THE GLASS DOES HAVE A MINOR CHIP IN ONE CORNER. YOU CAN REPLACE IT FOR ABOUT $20 IF IT BOTHERS YOU. THIS EXCEEDINGLY RARE PAIR OF LAMPS IS IN EXCELLENT OVERALL CONDITION. THERE IS SOME VERY MINOR PAINT LOSS TO THE ORIGINAL FINIALS BUT NOTHING MAJOR. THEY HAVE THREE WAY SOCKETS AND WORK AS THEY SHOULD. THEY HAVE THEIR ORIGINAL SHADES BUT THEY ARE FADED AND HAVE WATER SPOTS. 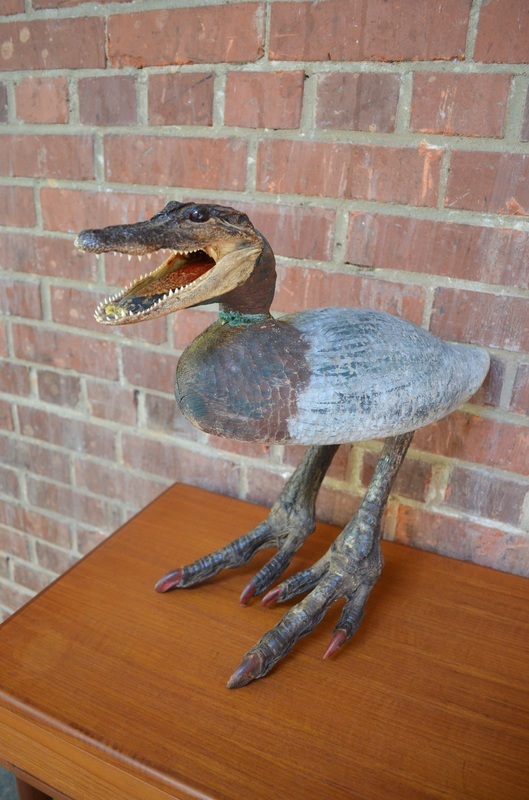 YOU COULD HAVE THE METAL USED TO REMAKE THEM OR USE FABRIC PAINT IF YOU'D LIKE TO KEEP THEM 100% ORIGINAL. 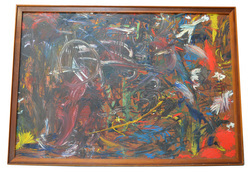 THIS PAINTING IS SIGNED AND DATED 1967, THE SCENE IS EXCELLENT AND SO IS THE WORK. IT HAS SOME CRAZING AND MINOR PAINT LOSS BUT IT REALLY DOESN'T DETRACT. 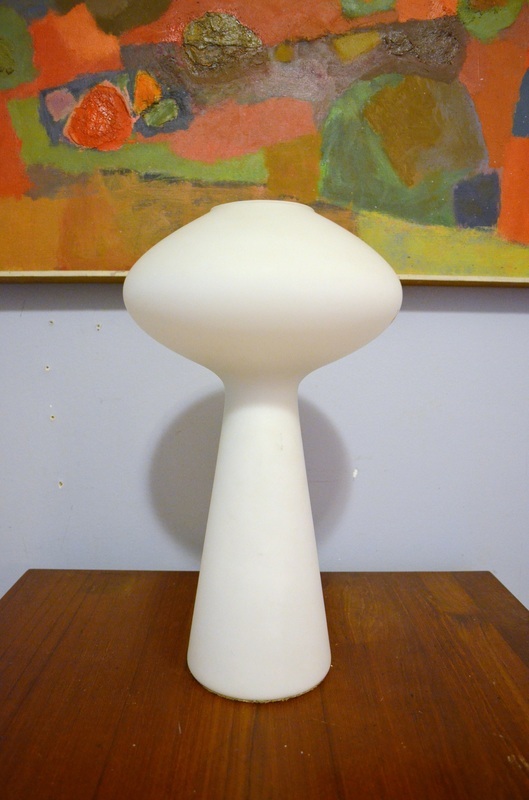 WE ARE UNSURE OF THE VALUE OF THIS PARTICULAR VASE. IT HAS THE EARLY LABEL AND IS SIGNED ON THE BOTTOM. WE ARE GOING TO SEND IT TO AUCTION ON EBAY AND IF YOU WIN IT LOCALLY YOU CAN TAKE OFF 11% OF THE FINAL AUCTION VALUE IF YOU CAN PAY CASH. IT IS IN PERFECT CONDITION OTHER THAN THE NORMAL SHELF WEAR TO THE BASE. 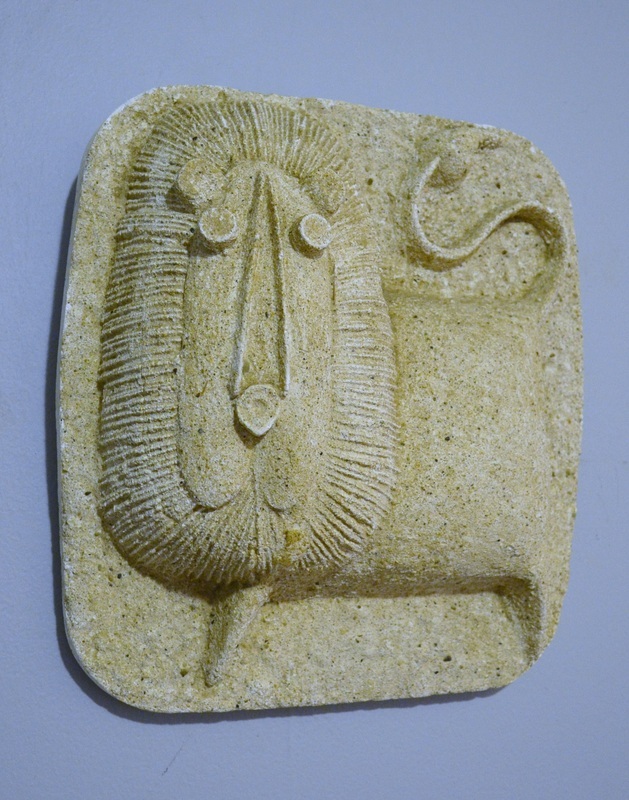 THIS CUTE LITTLE LION IS IN GREAT SHAPE AND IS READY TO EITHER HANG OR MOUNT IN A FRAME! 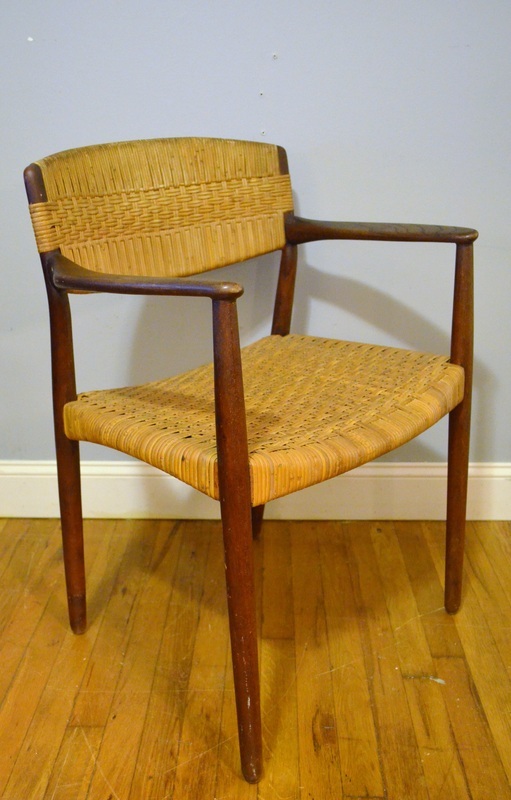 THIS SOLID TEAK AND RATTAN CHAIR IS IN EXCELLENT CONDITION. 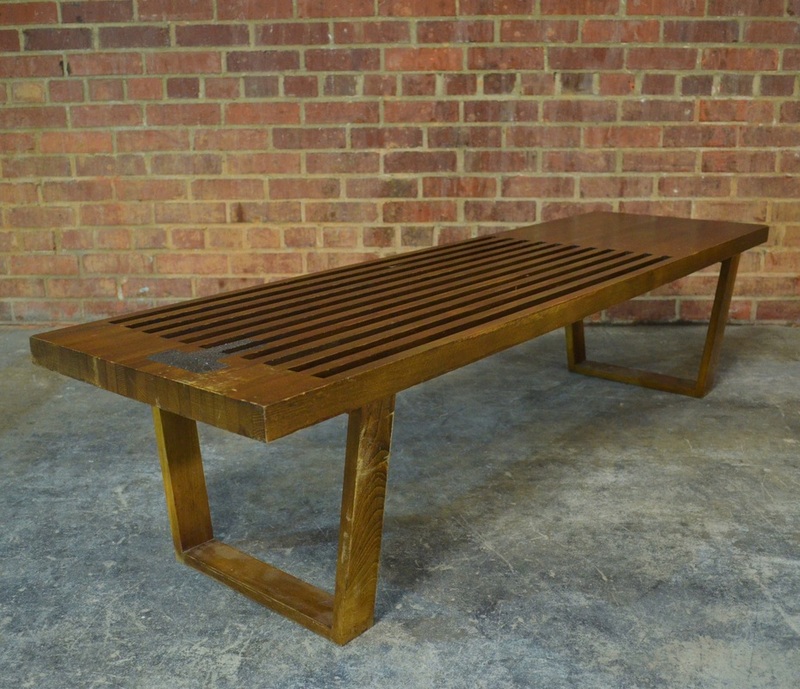 THE TEAK HAS A DEEP, RICH, WARM PATINA. 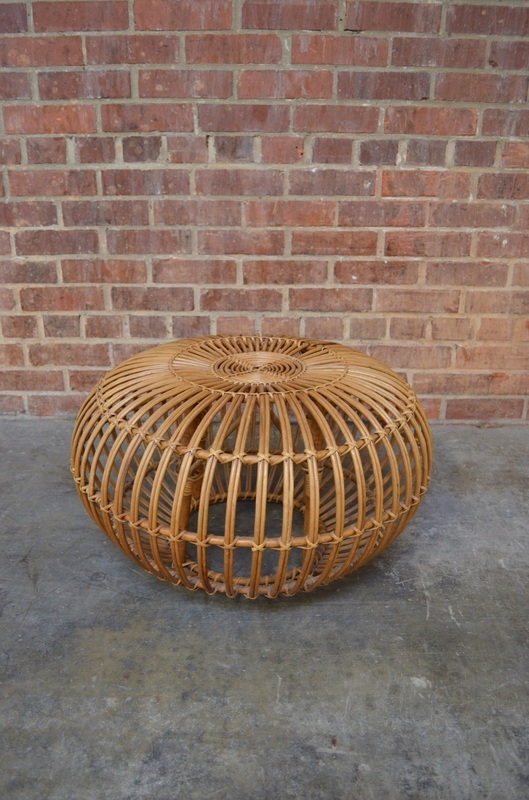 THE RATTAN IS IN GREAT SHAPE WITH NO BREAKS, IT HAS SOME DISCOLORATION IN AREAS AND PROBABLY ISN'T SUITED FOR HEAVY USE BUT IT LOOKS AMAZING! 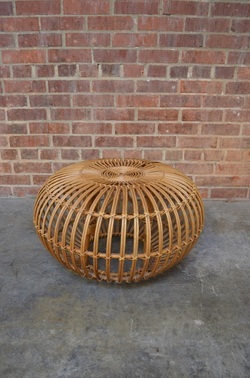 EXTREMELY WELL CONSTRUCTED WITH LOTS OF LITTLE DETAILS SUCH AS THE TAPERED FRONT RUNNER THAT THE RATTAN COVERS. 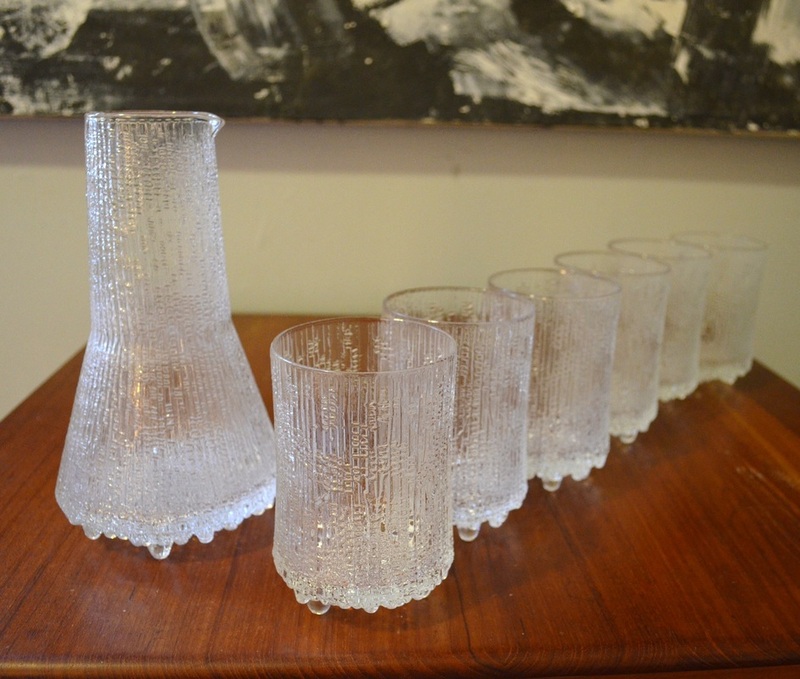 YOU'LL GET SIX GLASSES AND THE CARAFE ALL IN EXCELLENT CONDITION. 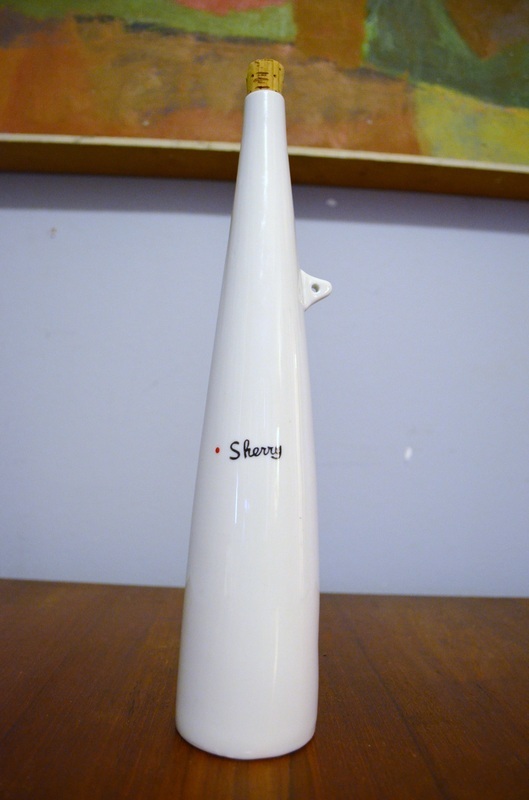 THE CARAFE STILL RETAINS MOST OF ITS LABEL. THIS GREAT SET IS IN LESS THAN PERFECT SHAPE. OVERALL IT NEEDS TO BE REPAINTED AND THE POKER TOOL MET AN UNFORTUNATE REPAIR. THE HANDLE BROKE AND SOMEONE DID A LESS THAN PERFECT REPAIR. YOU CAN HAVE IT FIXED CORRECTLY, DO IT YOURSELF OR JUST USE THESE AS PARTS FOR ANOTHER SET YOU HAVE. 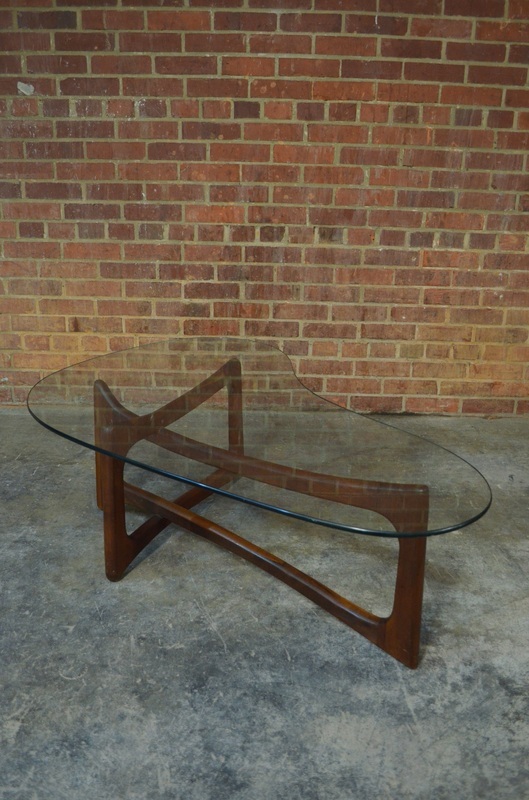 THIS COFFEE TABLE IS IN DECENT SHAPE, IT DOES HAVE A BIT OF MILD WEAR THROUGHOUT BUT IT STILL SHOWS VERY WELL. THE TILES ARE REALLY SPECTACULAR IN PERSON. 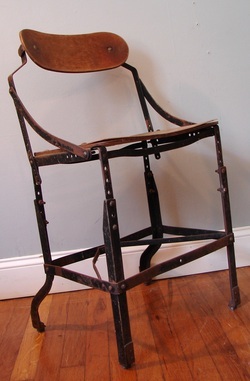 THIS CHAIR IS IN SIMILAR CONDITION TO THE OTHER ONE WE HAVE RIGHT NOW. IT'S UPHOLSTERY NEEDS A BIT MORE ATTENTION DUE MOSTLY TO PILLING. ONE OF THE CASTERS HAS A CHIP IN THE WHEEL AND ANOTHER IS A LITTLE LOOSE. OVERALL THE CHAIR STILL ROLLS FINE, THE BLEMISHES ARE SIMPLY COSMETIC. 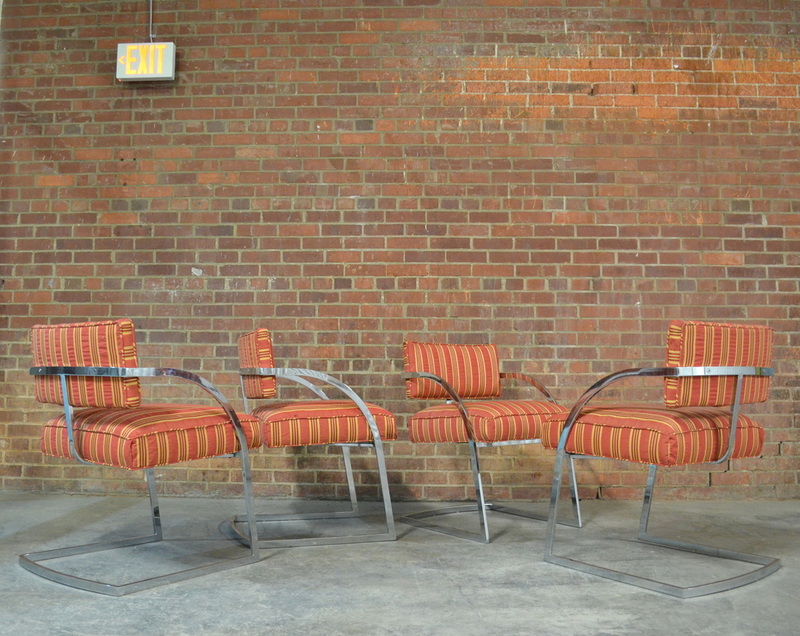 WE WEREN'T ORIGINALLY PLANNING ON SELLING THIS SET OF CHAIRS BUT WE JUST DON'T HAVE ANY USE FOR THEM AND DON'T WANT TO HOARD THEM IN THE ATTIC. THEY ARE IN NEARLY SPOTLESS CONDITION WITH THE ONLY REAL BLEMISHES BEING WHITE PAINT SCUFF MARKS FROM BEING TAKEN THROUGH DOORWAYS. THERE ARE A COUPLE OF MINOR CORD BREAKS BUT THEY ARE FAR FROM NEEDING TO BE REPLACE. 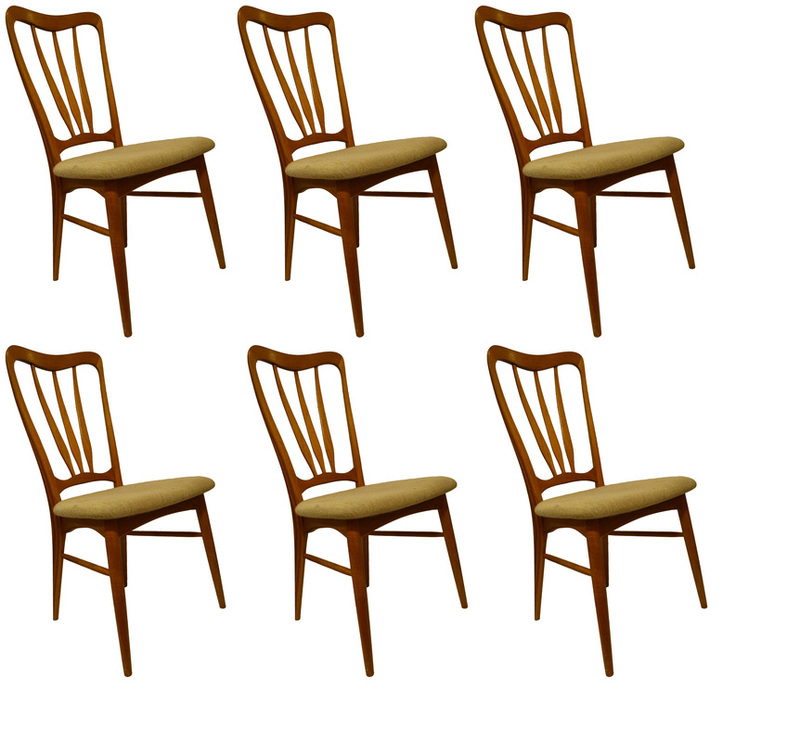 YOU GET TWO ARMCHAIRS AND FOUR SIDE CHAIRS. WE'VE NEVER SEEN ANOTHER ONE OF THESE. 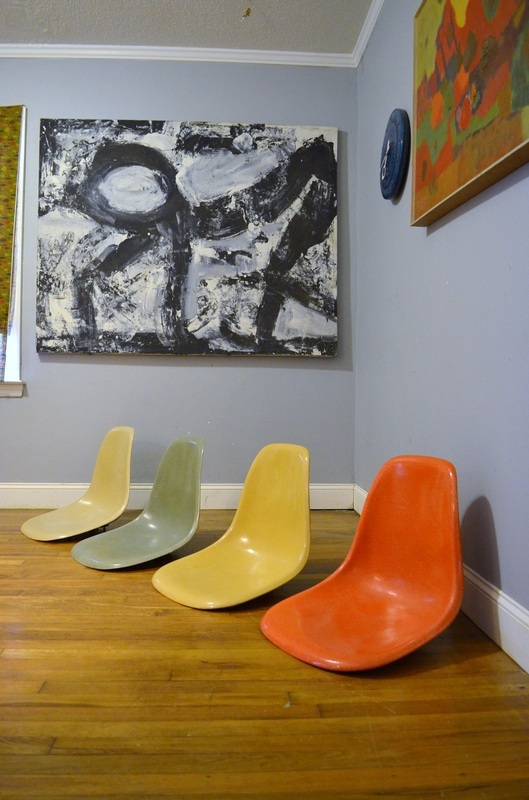 IF YOU OWN A COOL ART GALLERY THIS WOULD LOOK SPECTACULAR. IT HAS SOME MINOR PAINT LOSS IN AREAS BUT OVERALL IS IN GREAT SHAPE. IT IS SIGNED AND DATED 1987. 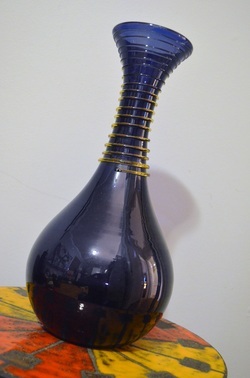 EXCEEDINGLY RARE BOTTLE BY KENJI FUJITA. 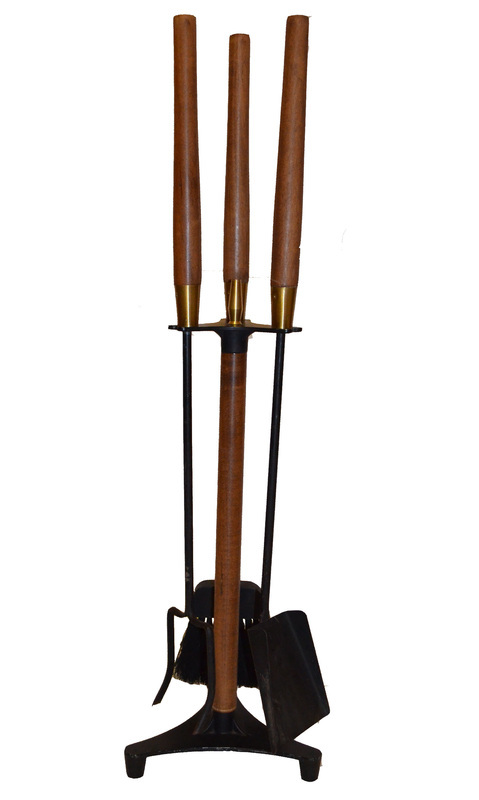 IT IS IN GREAT SHAPE, YOU WILL WANT TO ADD THE MISSING LEATHER TIE AVAILABLE FROM ANY SHOE LACE SHOP! THIS REALLY COOL PAIR OF LAMPS IS IN GREAT SHAPE, THEY BOTH WORK AS THEY SHOULD. THEY HAVE FIBERGLASS DIFFUSERS INSIDE THAT MAKE THEM GIVE OFF A NICE DIM GLOW. ONE SHADE LOOKS LIKE IT SAT IN THE SHADE MORE THAN THE OTHER ONE. 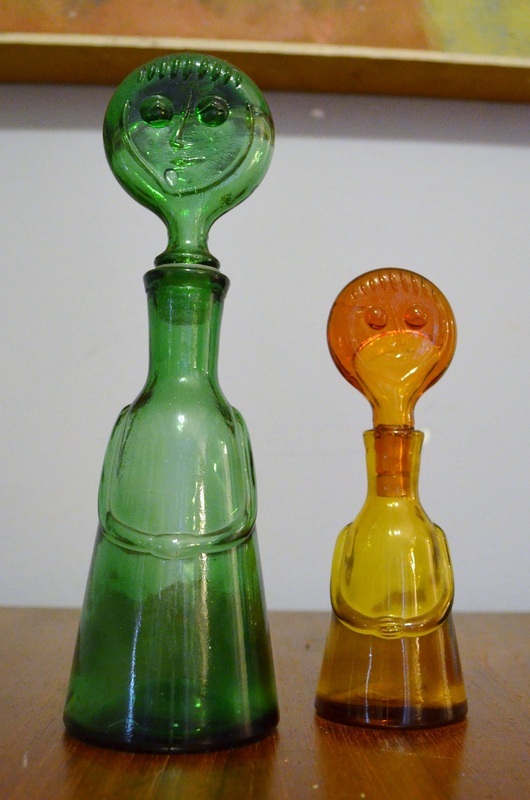 THEY ARE BOTH ORIGINAL BUT THE ONE ON THE LEFT IS MORE FADED. 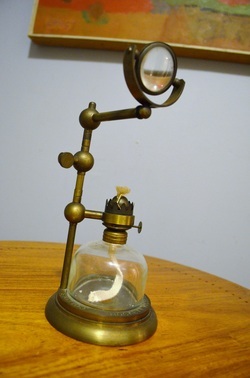 REALLY COOL LITTLE PAIR OF LAMPS. THEY NEED SHADES BUT THEY WILL BE VERY INEXPENSIVE. THEY NEED THE KIND THAT SLIP RIGHT OVER THE BULBS. 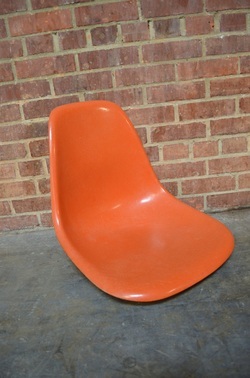 WE HAVE SOME THAT MAY WORK FOR YOU FOR AN EXTRA $40, THEY ARE 50'S FIBERGLASS. 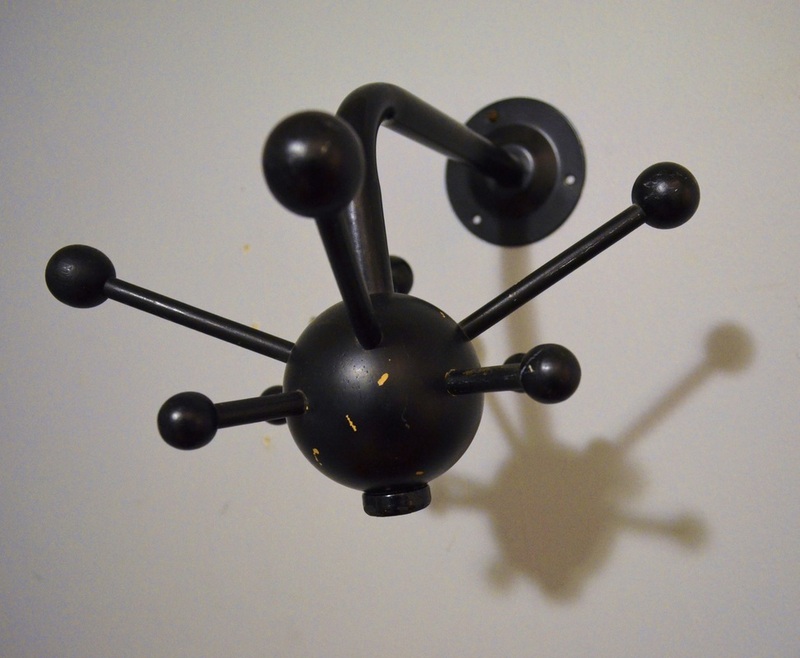 THIS COAT HOOK IS IN GOOD VINTAGE CONDITION. IT DOES HAVE SOME MINOR PAINT LOSS THROUGHOUT BUT IT SHOWS VERY WELL AND NOONE HAS TOUCHED IT UP SO THE PAINT IS ORIGINAL! THIS GIGANTIC ABSTRACT HAS TO BE SEEN IN PERSON TO BE TRULY APPRECIATED. THE PERSON WE PURCHASED THIS FROM SAID IT WAS DONE BY A LISTED LOCAL NC ARTIST BUT HAD FORGOTTEN THE NAME. WHETHER OR NOT THIS IS TRUE THE FACT REMAINS THAT THIS WAS EXPERTLY DONE IN THE PERIOD WE WOULD DESIRE IT TO HAVE BEEN COMPLETED! 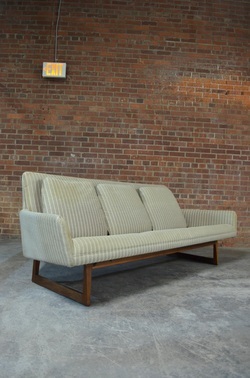 IT DOES HAVE A FEW WORN SPOTS THAT WE THINK ADDS TO THE APPEAL. IT IS 61 INCHES BY 47.75 INCHES. THIS CAT IS GREAT. WE THINK HE HAS AT LEAST 60 YEARS UNDER HIS BELT, POSSIBLY MORE. 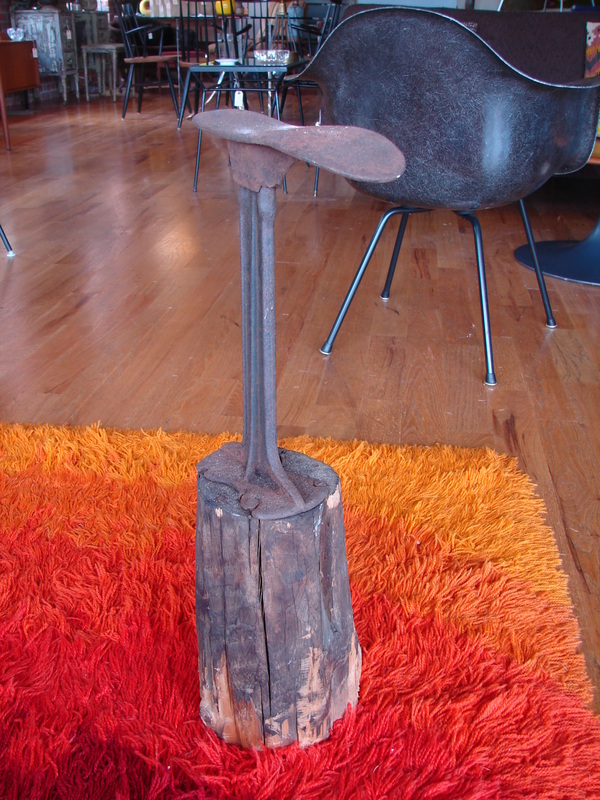 IT HAS GREAT WEAR AND TONS OF ORIGINAL PATINA. 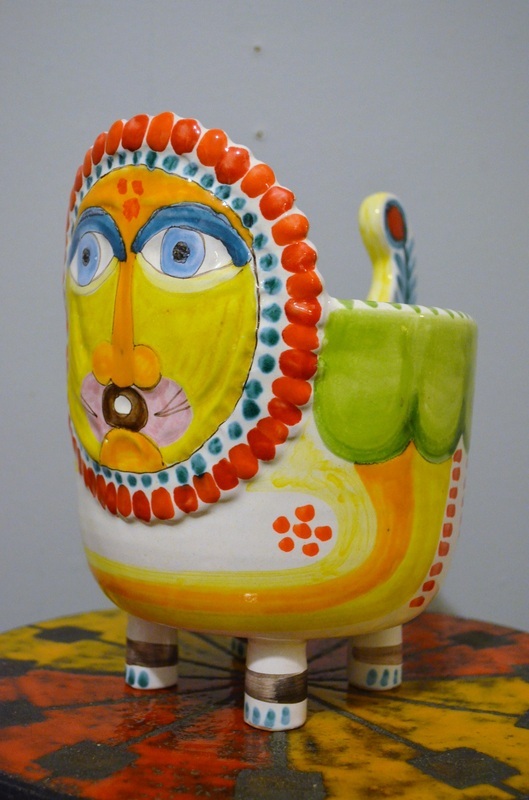 IT IS 25 INCHES TALL BY 13 INCHES WIDE. THIS FOUNDRY MOLD HAS GREAT WEAR AND COMES APART INTO TWO PIECES. IT IS 20 BY 19 BY 7.5 INCHES. THESE BOTTLES ARE IN NICE SHAPE. THE GREEN ONE IS NEARLY PERFECT BUT THE ORANGE ONE HAS A SMALL CHIP AT THE NECK. IT CAN'T REALLY BE SEEN WHEN ON DISPLAY. THIS PAIR IS IN GREAT SHAPE AND THEY ARE LABELED WITH THE ERA TAG. 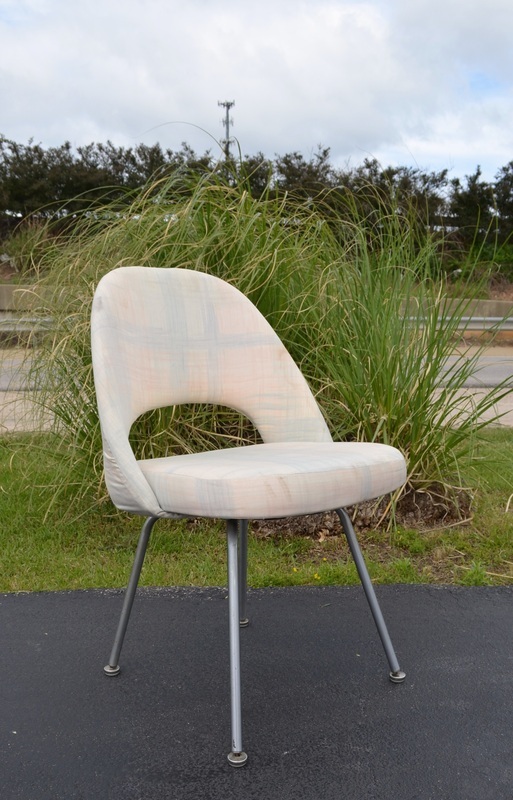 THIS CHAIR COULD STAND A GOOD CLEANING AND OILING AND THE FABRIC WOULD BE A SUPER EASY CHANGE IF YOU DON'T LIKE IT! 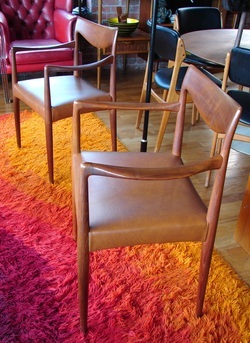 THIS MATCHING SET OF DINING CHAIRS IS IN NICE SHAPE. THEY ALL RETAIN THEIR RUBBER FEET AND THEY ARE ALL IN READY TO USE CONDITION! THIS SET OF CHAIR IS IN SUPERB CONDIITION. THEY ARE IN NEARLY PERFECT SHAPE WITH THE ONLY ISSUE BEING A SMALL REPAIR ON ONE OF THE ARMCHAIRS THAT WAS DONE VERY WELL AND IS EXTREMELY HARD TO NOTICE. 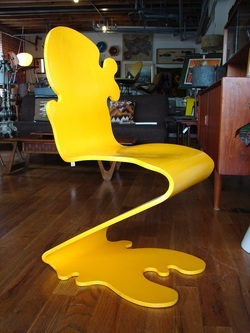 THIS CHAIR IS REALLY COOL. IT ALL FUNCTIONS AND THE TABLE BELOW THE HEADREST CAN BE REMOVED AND PLACED GOING THE OTHER DIRECTION IF YOU REMOVE THE HEADREST. THE HARDWARE ON THIS IS REALLY BEEFY AND VERY WELL MADE. 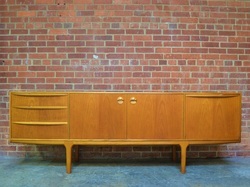 THIS IS THE BIG ONE AND IT IS IN PERFECT SHAPE OTHER THAN THE CORD BEING A BIT DIRTY! 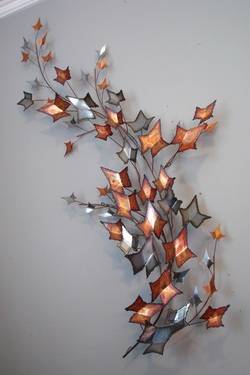 IT IS VERY PRETTY WHEN LIT. 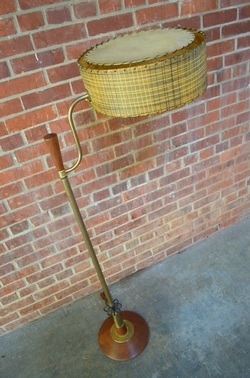 THIS BRASS COLORED FLOOR LAMP IS IN EXCELLENT CONDITION. ALL YOU NEED TO DO IS ADD A SHADE! 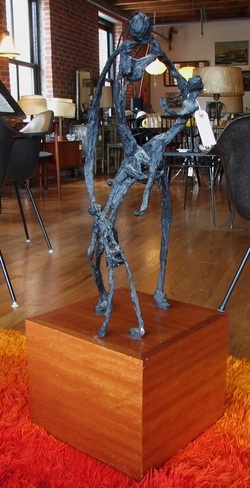 THIS TABLE TOP SCULPTURE IS IN EXCELLENT, NEARLY PERFECT ORIGINAL CONDITION. IT IS SIGNED AND DATED. THIS LITTLE GUY IS IN GREAT SHAPE AND IS 6.5 INCHES LONG. 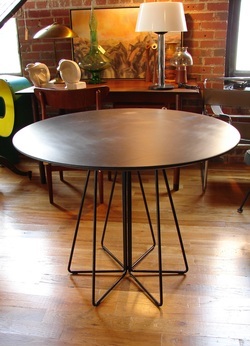 THIS TABLE IS ABSOLUTELY STUNNING IN PERSON. THE BRAZILIAN ROSEWOOD LEGS HAVE A TAPER IN THE MIDDLE AND THE GRAINING IS BEAUTIFUL. THE BRASS HAS A DEEP RICH PATINA AND THE GLASS IS SUPER THICK AND IN DECENT USABLE CONDITION ALTHOUGH IT COULD EASILY BE REPLACED. 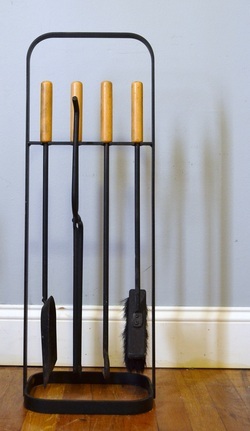 WE ARE CERTAIN THIS IS BY A HIGH END MAKER LIKE DUNBAR BUT HAVE NOT BEEN ABLE TO TRACK IT DOWN. 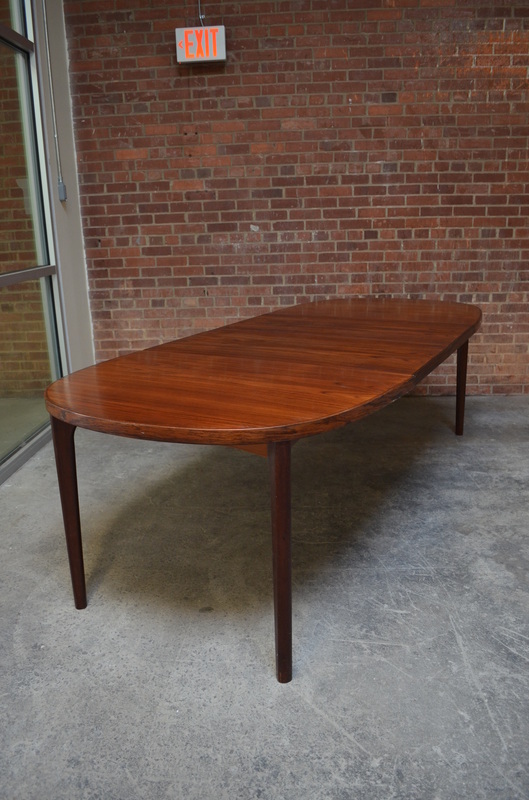 THIS INCREDIBLY RARE UMANOFF TABLE IS IN GREAT SHAPE. IT HAS ONE SEAM SPLIT BUT IT COULD BE REGLUED EASILY. 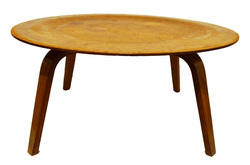 EVERYONE ASKS FOR SOLID TEAK WHEN BUYING DANISH FURNITURE. 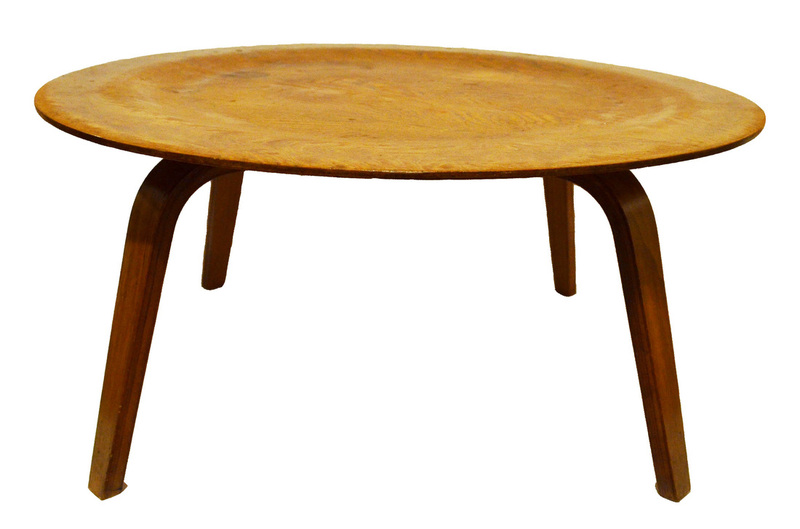 99 TIMES OUT OF 100 DANISH FURNITURE IS ALL VENEERED. IT WAS MOSTLY DONE SO WITH EXPERT CRAFTSMANSHIP . VENEER IS NOT A SIGN OF POOR QUALITY, BUT SOLID TEAK DANISH FURNITURE WAS THE TOP OF THE TOP OF THE LINE! 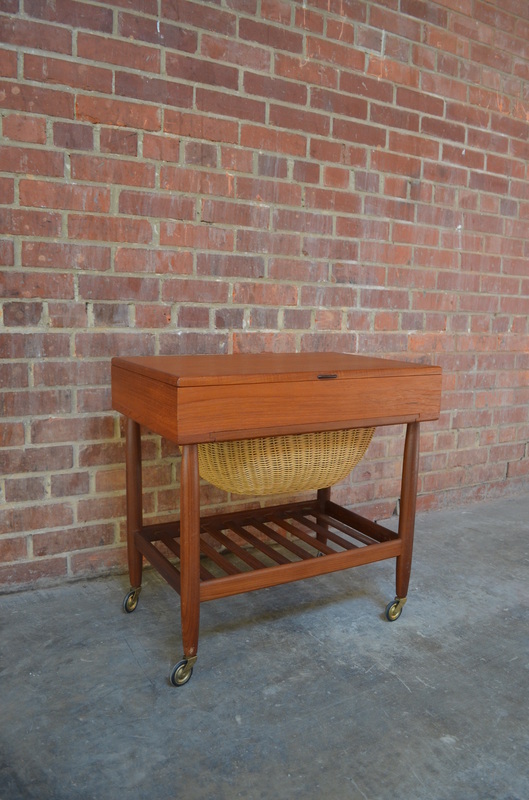 THIS HAS A GORGEOUS SOLID TEAK TOP WITH BOOKMATCHED FOLD DOWN SIDES AND GREAT BRASS HARDWARE. THIS TABLE WAS MANUFACTURED BY ONE OF THE BEST, FRANCE AND DAVERKOSEN! IT IS IN VERY NICE SHAPE OVERALL WITH ONLY MINOR SIGNS OF WEAR. 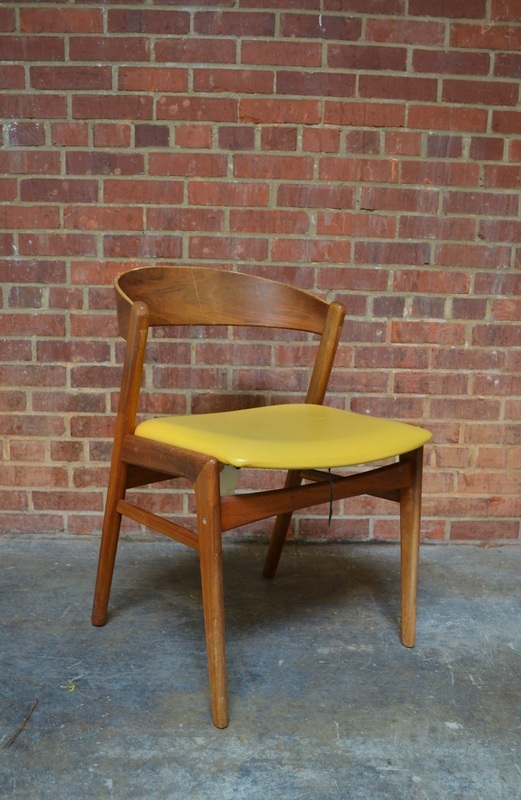 THIS CHAIR WAS REUPHOLSTERED AT SOME POINT IN A BRIGHT YELLOW FABRIC. IT IS STILL IN DECENT SHAPE WITH A COUPLE OF SPOTS THAT NEED SOME MINOR CLEANING AND SOME LIGHT FADING THAT IS EXTREMELY HARD TO NOTICE. THIS IS A REALLY GREAT LOOKING SET THAT NEEDS A BIT OF ATTENTION. THEY WILL NEED TO BE REFINISHED AND THE SEATS SHOULD PROBABLY BE REDONE. THIS SOFA IS GREAT! THESE HAVE BEEN IN ALL THE MAGAZINES LATELY AND THEY ARE GETTING MUCH HARDER TO COME BY. THIS ONE IS IN EXCELLENT STRUCTURAL SHAPE BUT AS YOU WOULD EXPECT NEEDS FABRIC. WE CAN HAVE IT DONE IN YOUR CHOICE OF MATERIAL FOR AN ADDITIONAL $725 WITH A TWO OR SO WEEK TURN AROUND TIME. THIS CHAIR IS IN REMARKABLY GOOD SHAPE. THE FABRIC IS STILL BRIGHT AND UNFADED. IT HAS NO HOLES, RIPS, TEARS OR DAMAGE OF ANY KIND. THE WOOD ON THE BOTTOM COULD USE A CLEANING AND OILING. THE TAGS ARE MISSING BUT WE FEEL CONFIDENT THAT THIS IS A MILO DESIGN ALTHOUGH IT IS NOT 100% GUARANTEED. 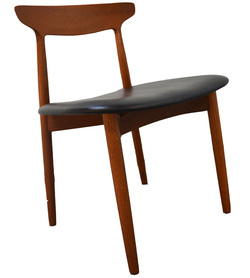 THIS IS AN EXCELLENT EXAMPLE OF THIS CHAIR. 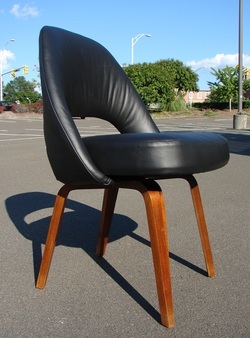 THE SEAT HAS BEEN REUPHOLSTERED IN HIGH QUALITY BLACK LEATHER. THE WALNUT HAS A DEEP DARK PATINA AND THE CANING IS NEARLY PERFECT. 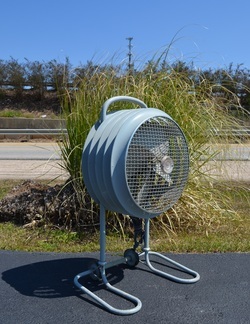 THIS FAN IS IN GREAT SHAPE WITH VERY LITTLE WEAR. IT WORKS AND WE BELIEVE IT HAS BEEN RECENTLY RE-WIRED. IT IS HEIGHT ADJUSTABLE. THIS IS ESSENTIALLY A BRAND NEW SOFA. 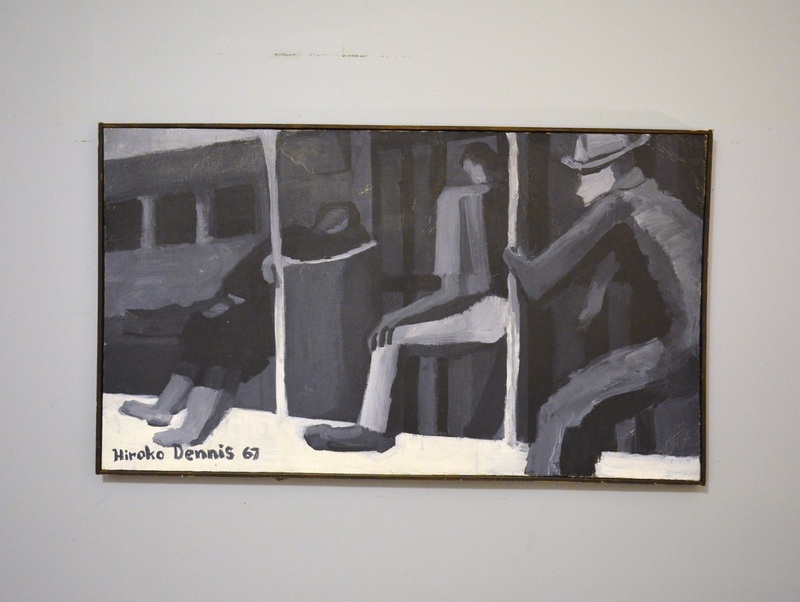 THE FRAME WAS COMPLETELY TAKEN BACK TO THE METAL, PRIMED AND PAINTED BLACK. THE CUSHIONS ARE BRAND NEW AND A NEW DECKING WAS MADE FOR THE BOTTOM. THE LIGHT GREY FABRIC IS IN PERFECT CONDITION AND THE CUSHIONS HAVE PIPING ALL THE WAY ROUND. 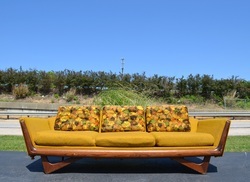 THIS SOFA IS READY TO GO AND BEAUTIFUL! 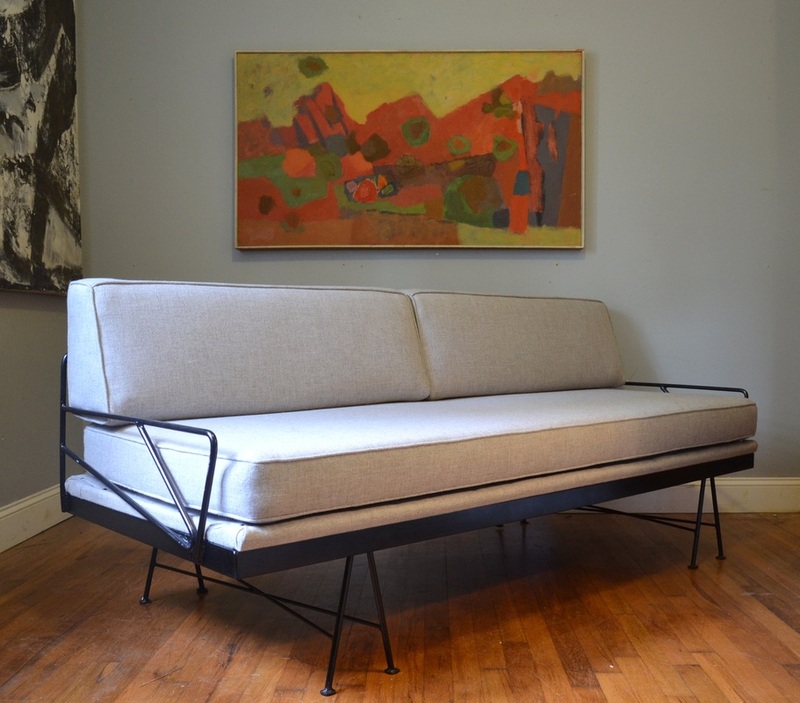 YOU CAN USE THE SOFA WITH OR WITHOUT THE DECKING IF YOU PREFER A LOWER PROFILE. 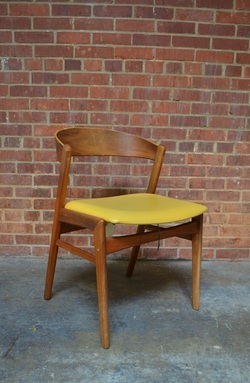 THIS CHAIR WAS REUPHOLSTERED AT SOME POINT IN A BRIGHT YELLOW FABRIC. IT IS STILL IN DECENT SHAPE WITH A COUPLE OF SPOTS THAT NEED SOME MINOR CLEANING AND SOME LIGHT FADING THAT IS EXTREMELY HARD TO NOTICE. THE BASE HAS A FEW CHIPS TO THE VENEER. 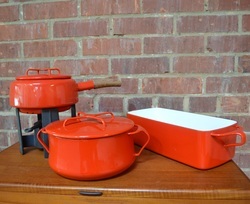 THIS SET IS IN VERY NICE VINTAGE CONDITION. IT HAS SOME NORMAL WEAR THROUGHOUT BUT NOTHING UNSIGHTLY, JUST NORMAL WEAR FOR ITS AGE. 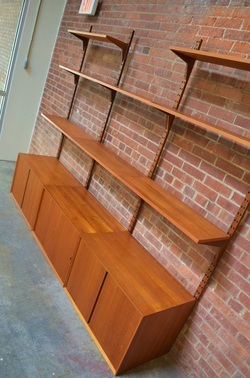 IT HAS THREE HUGE SHELVES THAT WOULD MAKE A GREAT DESK SURFACE, ONE MEDIUM SIZE, FOUR SMALL AND TWO EXTRA SMALL SHELVES. YOU CAN CONFIGURE IT ANY WAY YOU LIKE. THIS SET IS IN REALLY NICE SHAPE. IT HAS A BIT OF MILD WEAR CONSISTENT WITH AGE BUT NOTHING UNSIGHTLY. THIS EARLY QUISTGAARD DESIGNED CANDLESTICK IS IN GREAT SHAPE. IT HAS A MILD PATINA STARTING AND LOOKS GREAT ALL LIT UP! 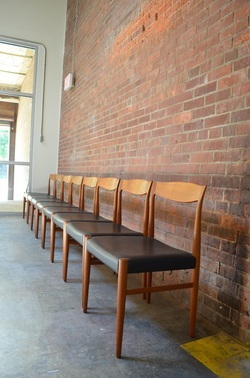 THERE'S SOMETHING ABOUT TEAK AND BLACK THAT JUST WORKS. THE SOLID TEAK HAS THE BLACK IN THE MIDDLE ON THE FRONT AND BACK. IT IS IN NEARLY PERFECT CONDITION. 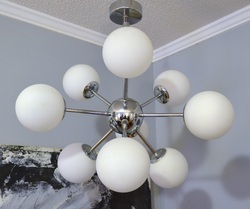 THIS CHANDELIER IS IN EXCELLENT CONDITION. IT HAS ITS ORIGINAL FITTER AND LOOKS TO HAVE BEEN WIRED RECENTLY. THE METAL WILL NEED TO BE POLISHED AND IT HAS ONE SMALL DING ON THE FITTER. THIS LAMP IS NEW IN THE BOX. IT IS FROM THE 2004 REISSUE. IT IS A BRICK COLOR WITH A BLACK BASE. 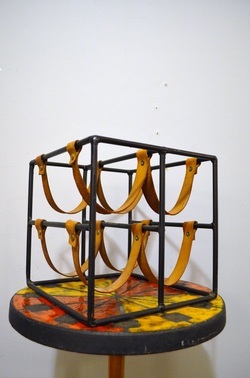 THIS WINE RACK IS IN GREAT SHAPE AND HAS VERY MINIMAL WEAR FOR ITS AGE. NICE PAINTING IN GREAT SHAPE, READY TO HANG. THIS SOLID TEAK SEWING TABLE IS IN GREAT SHAPE. 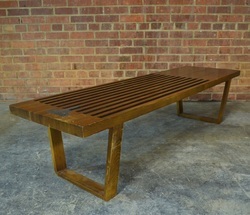 THE SOLID TEAK TOP DOES HAVE A FEW MARKS BUT IT CHOULD BE EASILY BROUGHT BACK TO SHOW ROOM CONDITION. 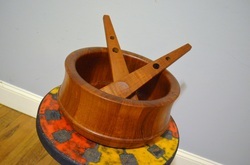 THE BASKET IS IN ALMOST NEW CONDITION WITH NEARLY NO WEAR OR COLOR CHANGE. 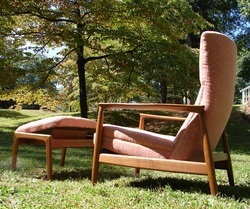 A RARE AND DIFFICULT TO FIND WEGNER PIECE! 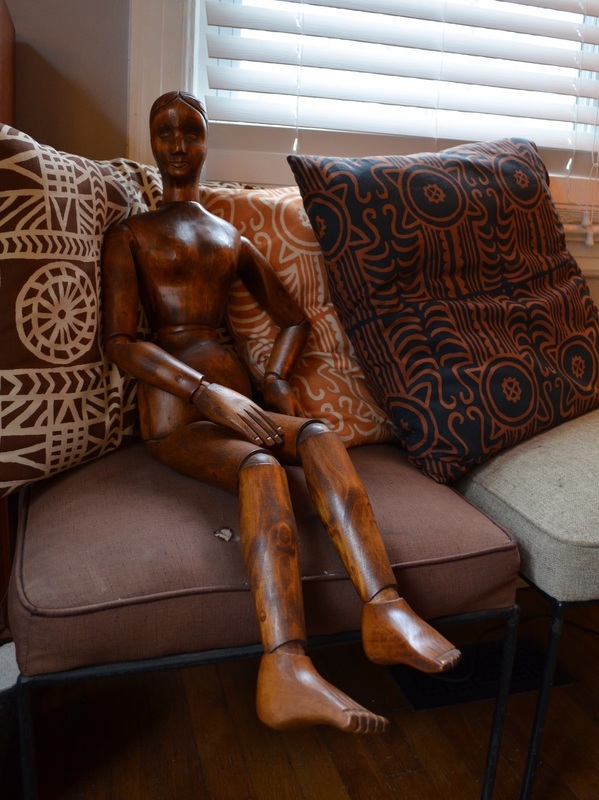 THIS AMAZING DOLL IS FULLY ARTICULATED AND ENDED UP FINDING HER MALE VERSION! THEY ARE NOW SITTING SIDE BY SIDE! 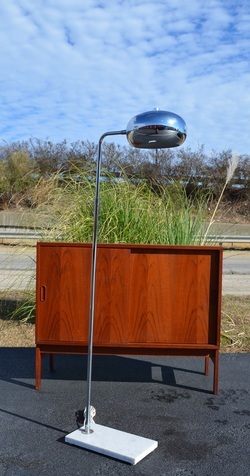 THIS LAMP IS IN EXCELLENT CONDITION. IT HAS A NICE BADGE ON THE BOTTOM THAT SAYS IT WAS MADE IN SWEDEN. THE ORIGINAL NAUGAHYDE IS IN GREAT SHAPE WITH NO HOLES. 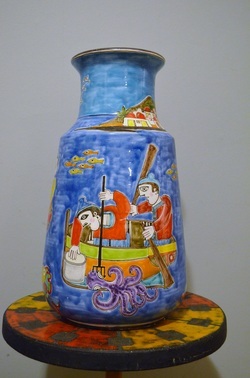 IT IS 30.5 INCHES TALL AND THE PAINT PROBABLY NEEDS TO BE REDONE. 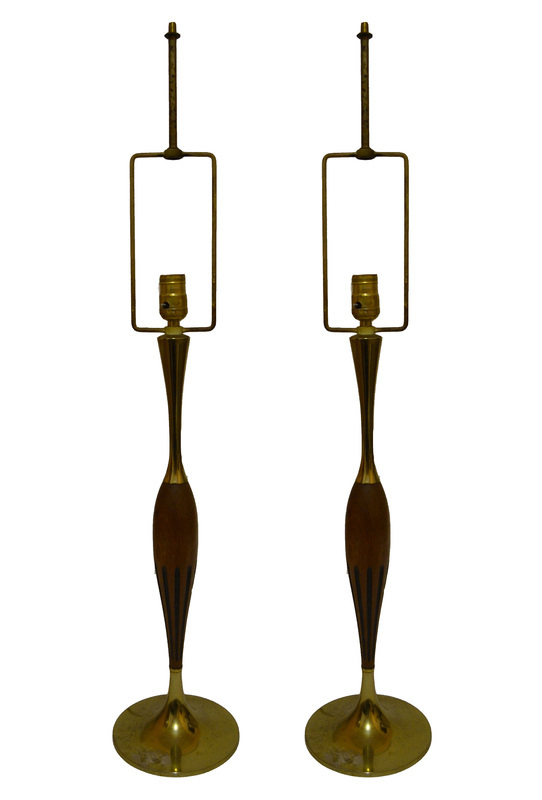 THE TOP SWIVELS. LARGE SETS OF BLUE YELLOW AND ORANGE. 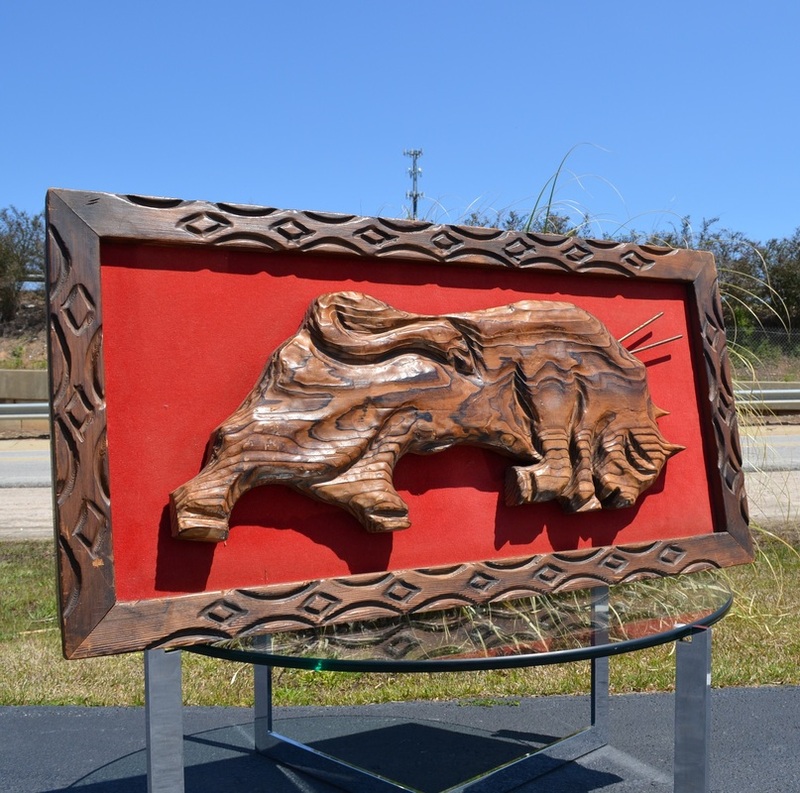 THEY ARE INDIVIDUALLY PRICED OR CAN BE PURCHASED AS ONE LARGE LOT. WE WILL HAVE MORE OF THESE COMING AS WELL! 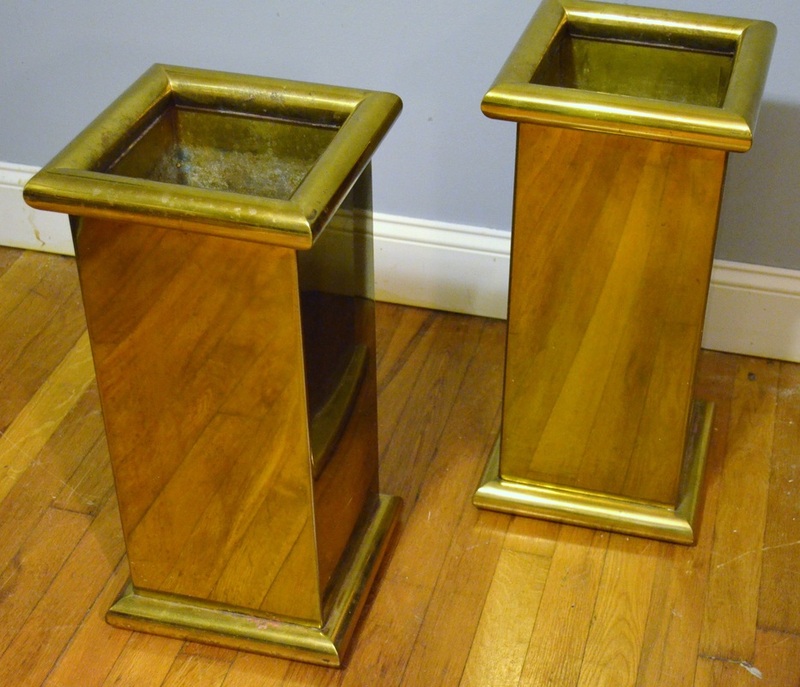 THESE SOLID BRASS PLANTERS ARE BUILT LIKE TANKS. THEY HAVE A NICE INSERT ON THE TOP SO YOU CAN TAKE THE PLANT OUTSIDE. THEY WERE MANUFACTURED IN ATLANTA GA BY THE ARCHITECTURAL BRASS COMPANT. 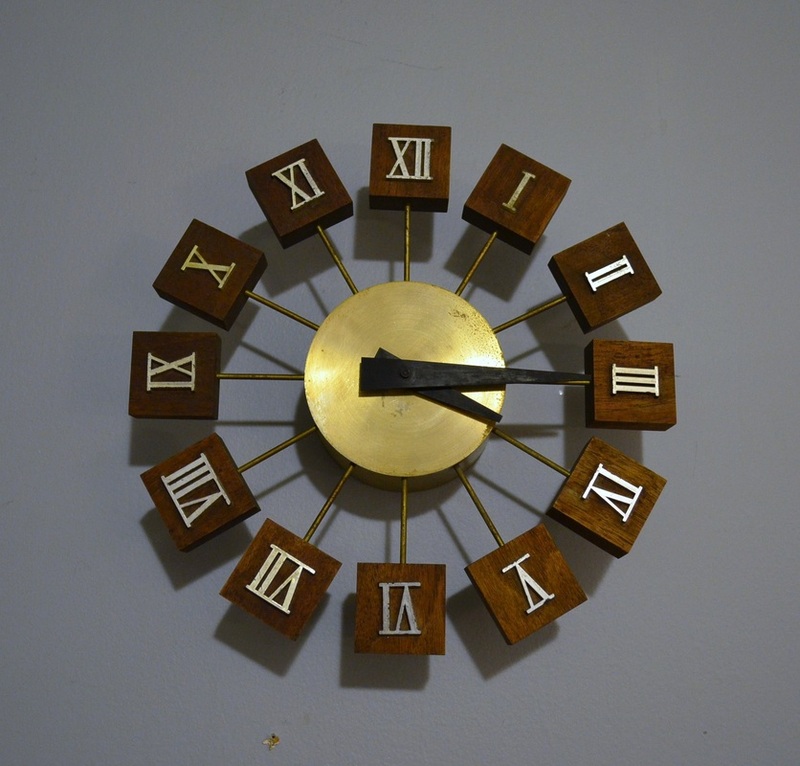 THIS EXCEEDINGLY RARE CLOCK IS IN DECENT VINTAGE CONDITION. 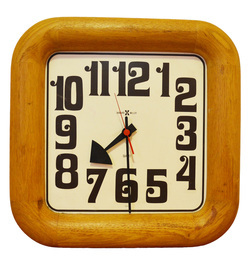 THE NUMERALS CAN BE SPUN BACKWARDS SO THAT ONLY WOOD SHOWS. 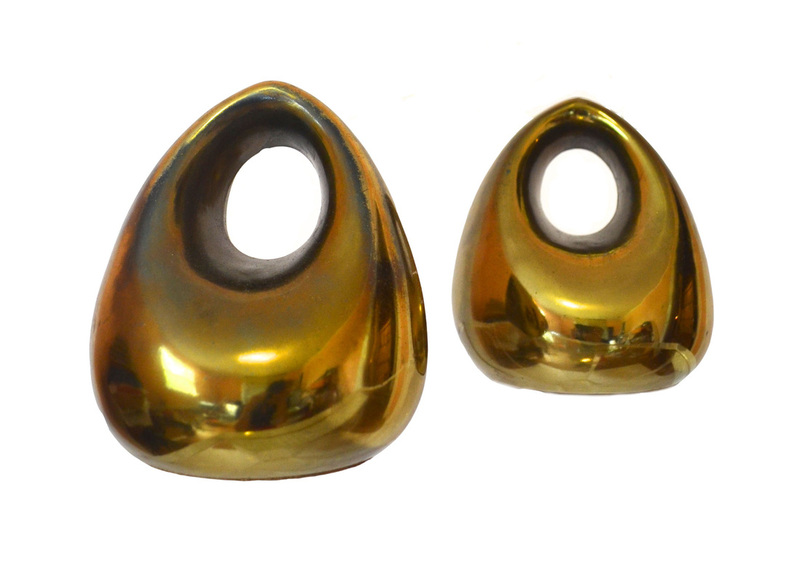 WE COULD NOT FIND A DEFINETIVE SOURCE TO SAY UMANOFF BUT SINCE OTHER DOCUMENTED UMANOFF DESIGNS FOR HOWARD MILLER USED IDENTICAL NUMBERALS WE ARE 99.9% SURE THIS MUST BE AN UMANOFF DESIGN FOR HOWARD MILLER AS THE HOUSING AND HANDS ARE CERTAINLY HOWARD MILLER. SUPER CLEAN AND INCREDIBLY RARE BOOK ENDS. EVERYONE HAS THE JACKS AND THERE ARE TONS OF THEM OUT THERE, THESE ARE FROM THE SAME SERIES AND ARE IN INSANELY GOOD SHAPE. 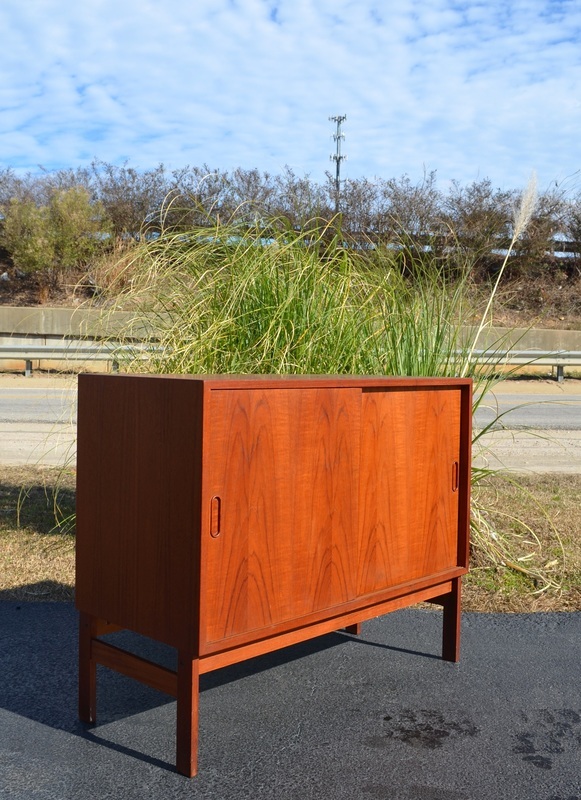 THIS LITTLE CREDENZA IS IN EXCELLENT CONDITION WITH PLENTY OF STORAGE. 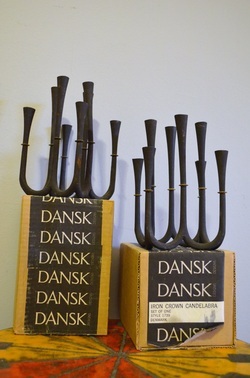 IT WAS PROBABLY A HANSEN AND GULDBORG PRODUCTION, IT HAS THE HANGERS FOR USE WITH A SHELF SYSTEM THEY MADE. THIS ONE CAME WITH THE LEGS YOU SEE. IT HAS A NICE DANISH FURNITURE CONTROL COIN LABEL ON THE INSIDE OF THE CABINET. WE HAVE A BUNCH OF DANISH SHELVING COMING. THIS WAS THE FIRST BIT WE WERE ABLE TO CLEAN AND PHOTOGRAPH. THIS IS THE ONLY SET NOT MARKED. EVERYTHING ELSE WAS MARKED DANISH SO I'M ASSUMING THAT IS THE CASE WITH THIS SET AS WELL. EITHER WAY IT HAS BEAUTIFUL VENEER AN IS IN GREAT SHAPE, NO PERFECT BUT VERY, VERY GOOD. 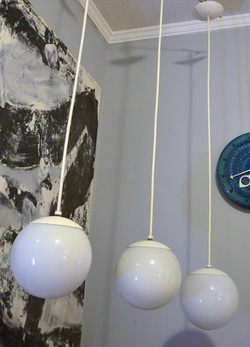 THEY CAN BE HUNG HOWEVER YOU'D LIKE THEM AND ONLY TAKE TWO SCREWS A PIECE. 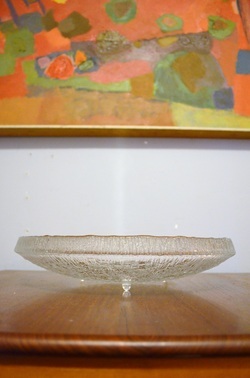 NICE LARGE SIZE FOR DISPLAYING FRUIT OR A COOL PLANT. HE HAS A SMALL CHIP ON THE BACK OF ONE FOOT. THIS IS ONE OF THE LARGEST PIECES OF FANTONI WE'VE EVER SEEN. 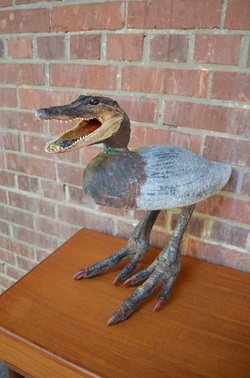 WE COULDN'T FIND ANYTHING AT AN AUCTION HOUSE THAT RESEMBLED IT IN SIZE SO GET IT BEFORE WE SEND IT UP NORTH TO AUCTION! THIS SCULPTURE IS UNBELIEVABLE IN PERSON! 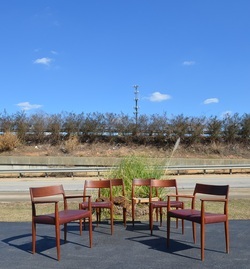 THIS SET COMES WITH TWO ARMCHAIRS AND FOUR SIDE CHAIRS. THEY ARE ALL VERY STURDY WITH NO WIGGLY JOINTS. 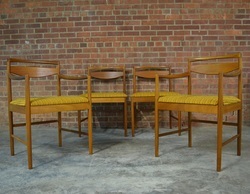 THE FINISH NEEDS TO BE CLEANED AND TEAK OILED AGAIN BUT OVERALL THEY ARE IN EXCELLENT CONDITION WITH VERY LITTLE WEAR. THEY WILL NEED NEW UPHOLSTERY ON THE SEATS. 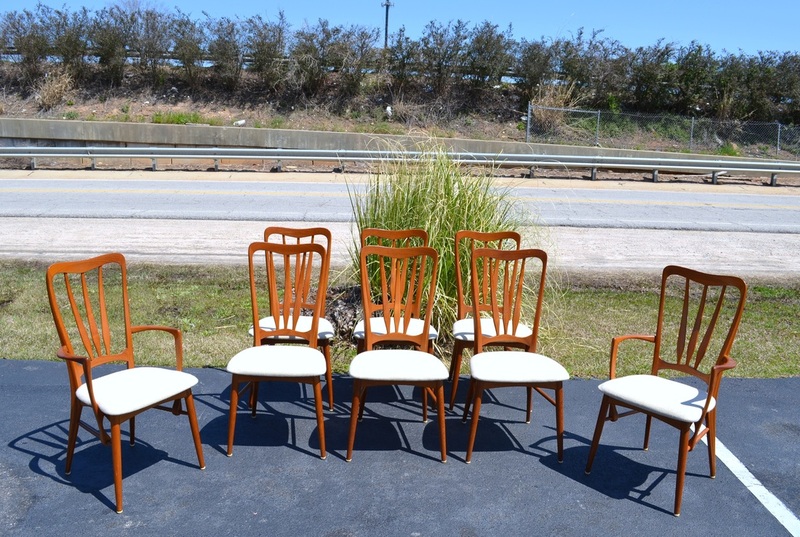 PICK YOUR FABRIC AND WE WILL HAVE IT DONE PROFESSIONALLY FOR $350 INCLUDING LABOR AND LOCAL DELIVERY, ADD $100 FOR CLEANING AND REOILING THE CHAIRS. 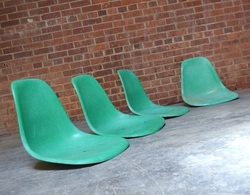 SO FOR $1500 YOU WILL GET A BRAND NEW SET IN NEARLY PERFECT CONDITION READY FOR DECADES MORE USE! 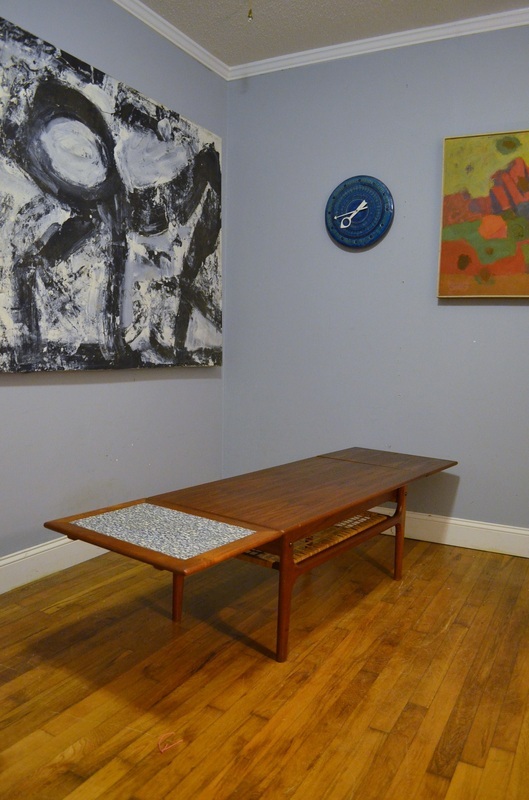 THIS TABLE GOES PERFECTLY WITH THE NEWLY UPHOLSTERED SET OF RICHARD MCCARTHY CHAIRS AVAILABLE IN SEATING! IT IS IN NICE CONDITION WITH A BIT OF MILD WEAR THROUGHOUT. BRAZILIAN ROSEWOOD AND BLACK IRON, COULDN'T BE BETTER! IT IS 36 INCHES WIDE BY 28.5 TALL BY 54 WIDE. 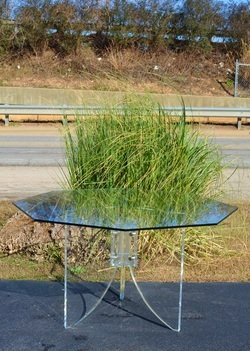 WHEN YOU TAKE OUT THE HIDDEN BUTTERFLY LEAF THE TABLE EXPANDS TO 72 INCHES WIDE. IT IS IN EXCELLENT ORIGINAL CONDITION. IT HAS A COUPLE OF MINOR SPOTS BUT NOTHING MAJOR AND THE VENEER IS SUPER THICK SO YOU COULD EASILY REDO IT WITH NO WORRIES. 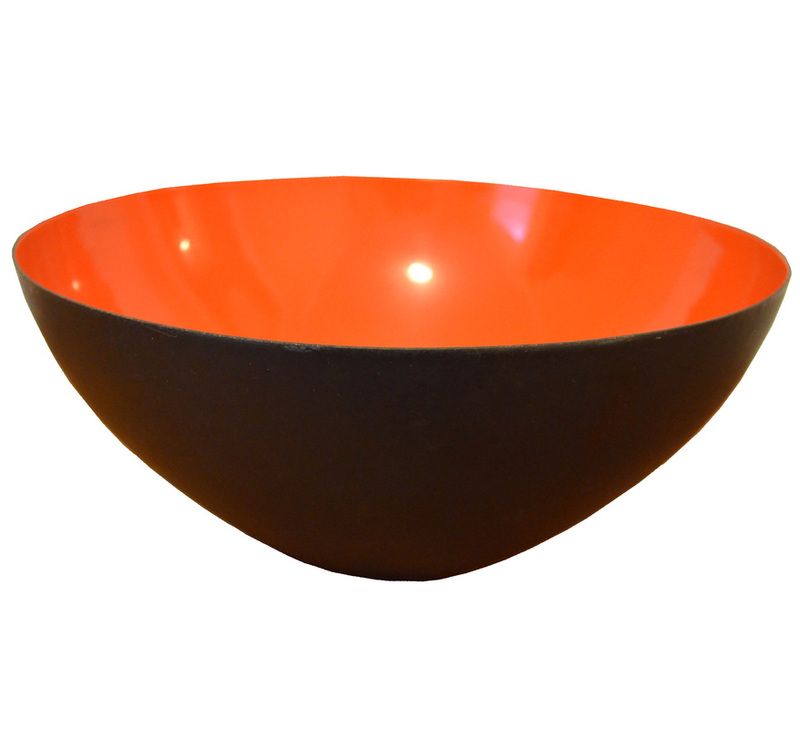 THIS BOWL IS 8.75 INCHES BY 3.75 INCHES. IT HAS A COUPLE OF MINOR DINGS AROUND THE RIM BUT NOTHING MAJOR. 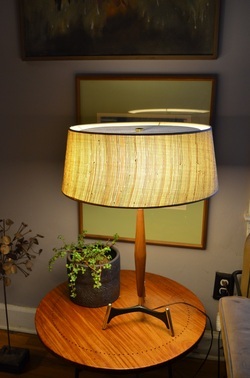 WE HAVE SEEN THIS LAMP ATTRIBUTED TO SONNEMAN IN THE FLOOR AND TABLE TOP VERSION AND THE BUILD QUALITY POINTS TO THIS BEING TRUE BUT IT MAY BE ANOTHER MAKER. EITHER WAY IT IS IN EXCELLENT CONDITION AND WORKS FLAWLESSLY. WE'RE FAIRLY CERTAIN THIS IS A SONNEMAN FLOOR LAMP. 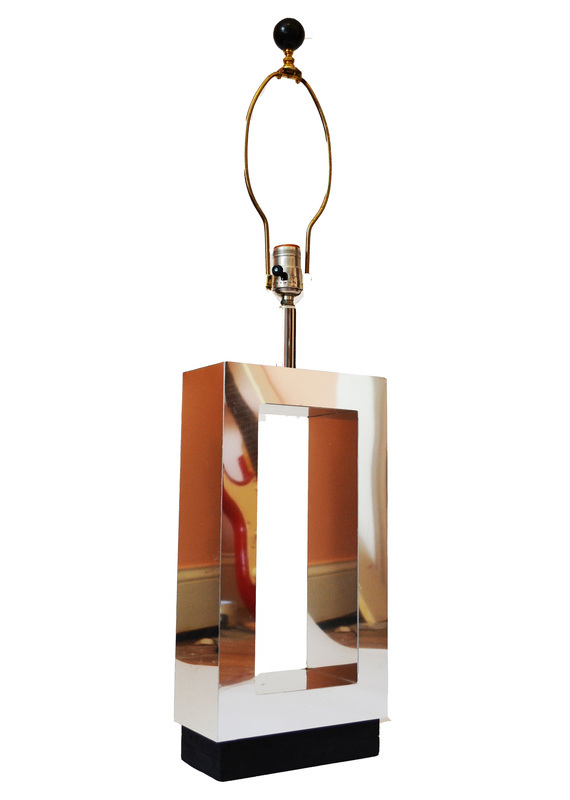 IT HAS A REALLY NICE MARBLE BASE AND AN EXTREMELY WELL BUILT SHADE AND SWIVEL MECHANISM. PERFECT READING LIGHT! 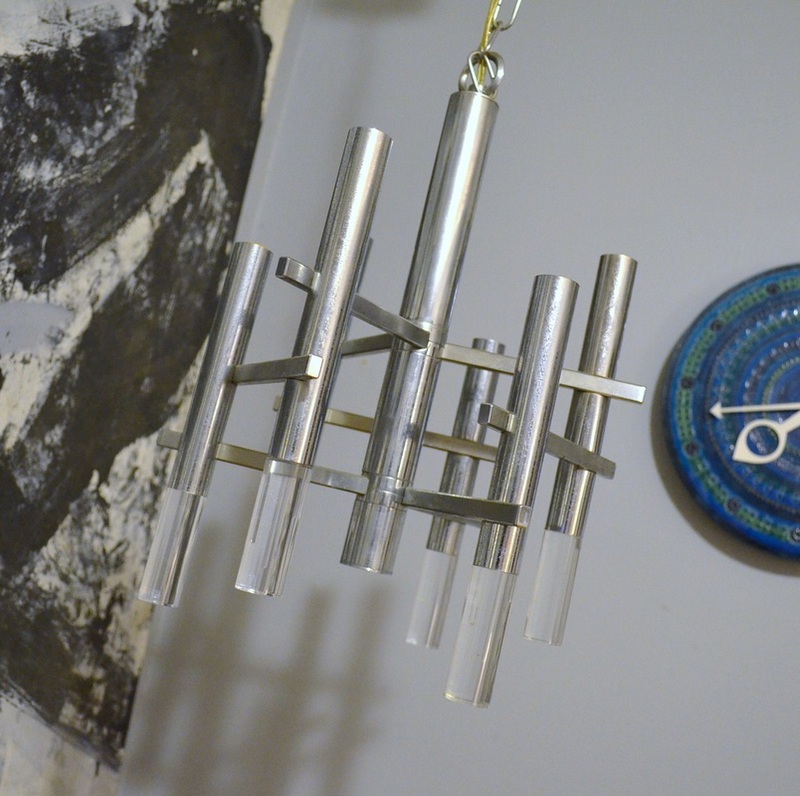 THIS CHANDELIER IS IN GREAT SHAPE, READY TO HANG IN YOU HOME! 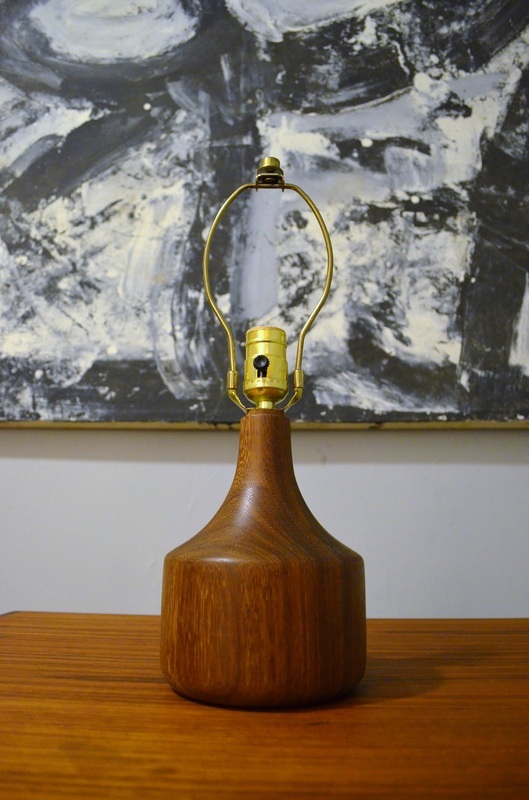 THIS LITTLE LAMP IS IN LIKE NEW CONDITION. ALL IT NEEDS IS A SHADE! 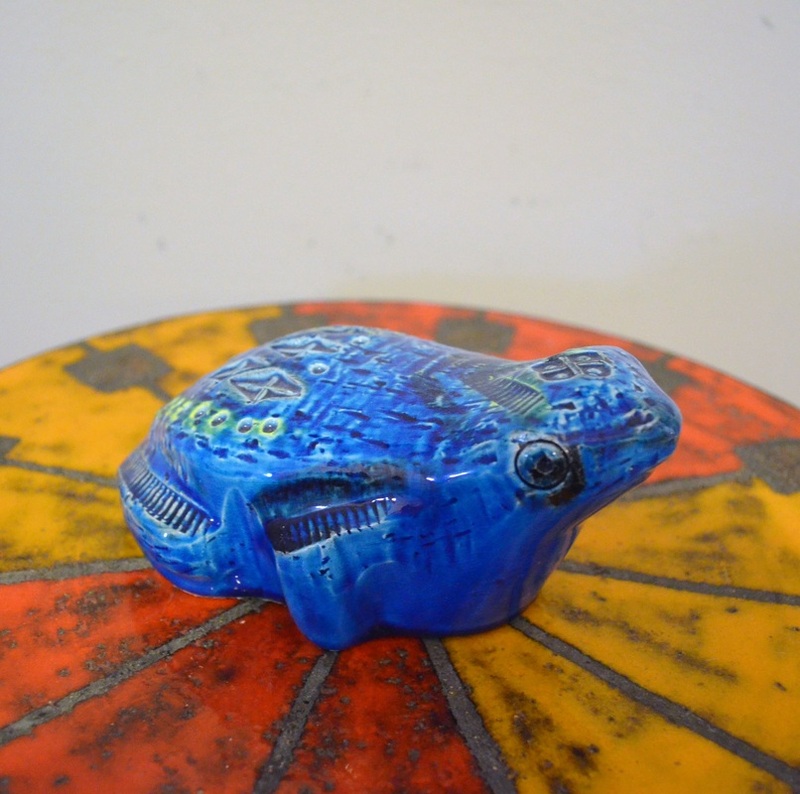 THIS IS ONE OF THE COOLEST FOUNDRY MOLDS I'VE EVERY COME ACROSS. 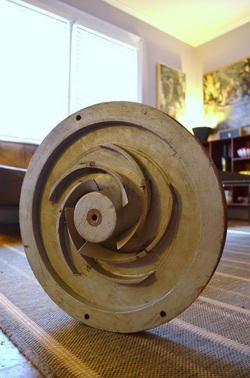 THE PARTS IN THE MIDDLE ARE ALUMINUM AND THE REST IS WOOD. IT IS 16 BY 4 INCHES. FOR THE LONGEST TIME THESE WERE COMMONLY MISATTRIBUTED TO PAUL MCCOBB. IT'S NICE WHEN A LESSER KNOWN DESIGNER GETS THEIR DUES! THIS SET IS IN SUPERB CONDITION. THE WOOD IS NEARLY FLAWLESS AND THE BRAND NEW FOAM AND GREY BOUCLE FABRIC SET THIS SET OFF. YOU WILL NOT FIND A NICER EXAMPLE OF THIS SET ANYWHERE! 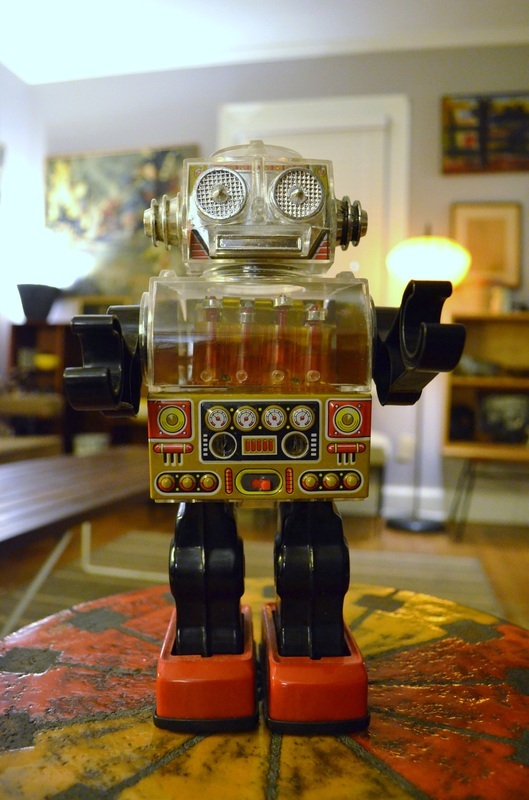 THIS INCREDIBLY RARE DESIGN IS PERFECT FOR THAT SERIOUS COLLECTOR. IT RETAINS THE ORIGINAL PAINT, IT HAS A FEW BUMPS HERE AND THERE BUT NOTHING THAT DETRACTS FROM THE OVERALL DESIGN. THIS CHAIR IS IN EXCELLENT CONDITION OVERALL. IT DOES HOWEVER NEED A POWERWASHING AND THE CHROME CLEANED. THE FOAM WILL NEED TO BE REPLACED AS WELL. OVERALL THE FABRIC SHOULD TURN OUT TO BE NEARLY NEW LOOKING. IT IS A REALLY NICE GREEN/BROWN/YELLOW MIX. 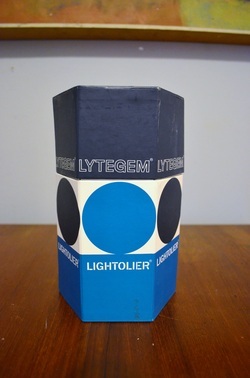 IT IS ALMOST CERTAINLY ONE OF THE GIRARD DESIGNED COLORS. SO FOR ABOUT A TOTAL INVESTMENT OF $300 AFTER REPAIRS YOU SHOULD BE ABLE TO MAKE THIS CHAIR AS GOOD AS NEW! 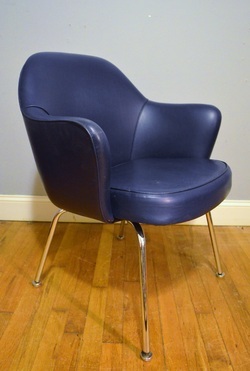 OR JUST GO AHEAD AND HAVE IT TOTALLY REDONE IN BRAND NEW FABRIC OR LEATHER. THIS CHAIR COMES WITH THE EXTREMELY HARD TO FIND GIRARD CROSS WEAVE PATTERN FABRIC HE DESIGNED FOR HERMAN MILLER. THE CHAIR COMES WITH CASTERS OR THE GLIDES YOU SEE IN THE PICTURE. ADD $25 IF YOU'D LIKE BOTH OPTIONS. THERE IS ONE SMALL RED SPOT ON THE SEAT THAT WE WERE UNABLE TO REMOVE, IT'S NOT THAT BAD AND IS HARDLY NOTICEABLE IN NORMAL DAY TO DAY USE. THE ARMS HAVE NORMAL WEAR. EVERYTHING FUNCTIONS GREAT AND NOTHING IS MISSING! SUPER RARE AND AWSOME COLOR! 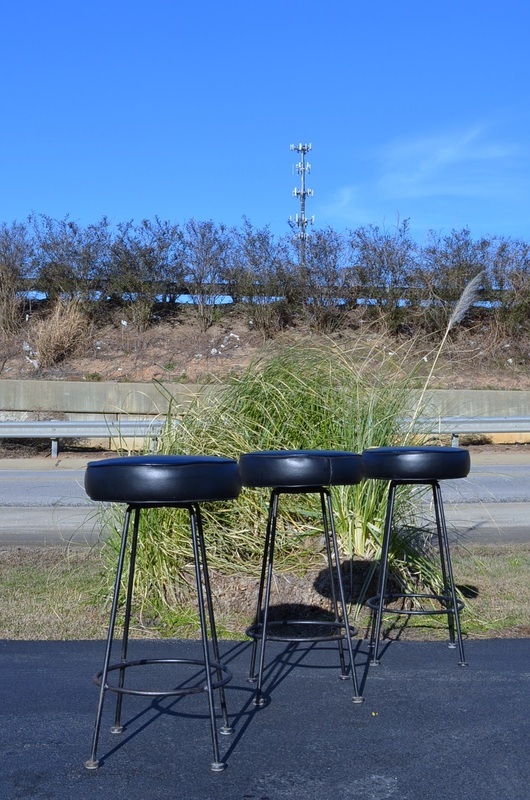 THIS SET OF BAR STOOLS IS IN EXCELLENT CONDITION. THEY SWIVEL AND THE BLACK VINYL IS FLAW FREE. THEY WILL PROBABLY NEED TO BE REPAINTED. 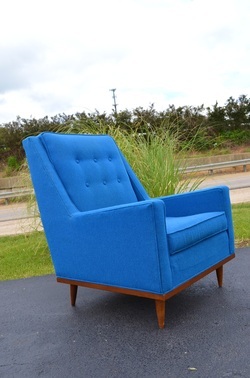 THIS BRIGHT BLUE ROCKER IS IN EXCELLENT CONDITION. IT HAS A NEW BASE AND THE VINYL ONLY HAS A FEW MINOR IMPERFECTIONS. THE BACK OF THE SHELL IS A GREENISH GREY COLOR. THIS CHAIR COMES WITH ITS ORIGINAL TAG. THE VINYL UPHOLSTERY IS IN GREAT SHAPE. IT IS NEARLY FLAW FREE. THE CHROME IS NICE AND SHINY AND THE FOAM IS STILL SPRINGY. 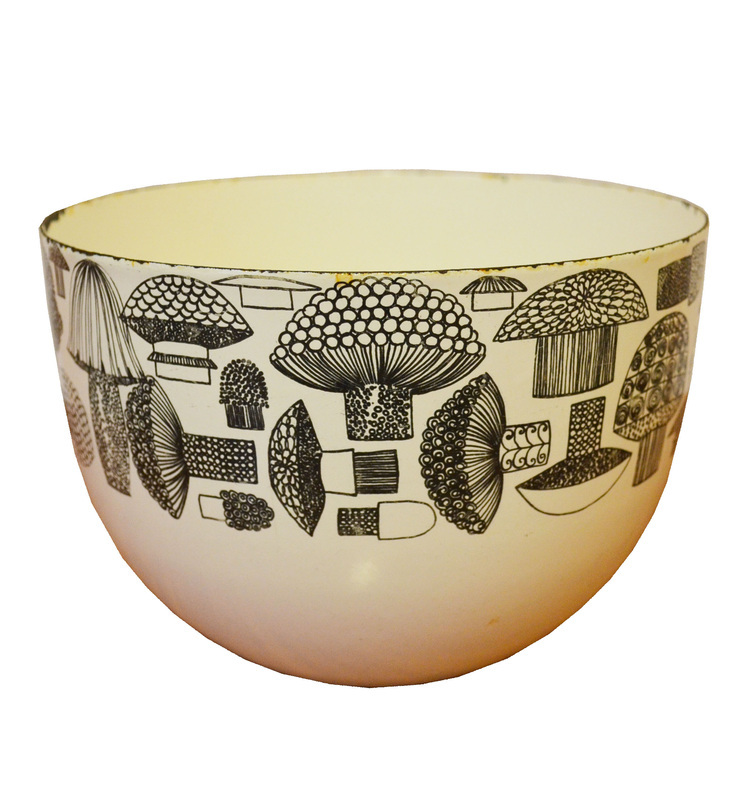 THIS BOWL IS IN NICE SHAPE WITH THE EARLY FOUR DUCKS LABEL. IT HAS A BIT OF MILD SEPARATION IN THE BOTTOM BUT UNLESS YOU FLIP IT UPSIDE DOWN IT ISN'T VISIBLE. IT IS 10.5 BY 4.75 INCHES. THIS END TABLE IS IN EXCELLENT CONDITION. 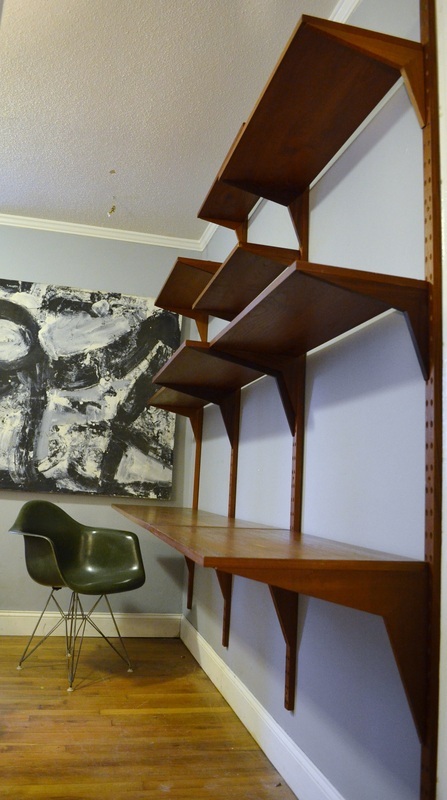 THE TOP WAS LIGHTLY REFINISHED. A FEW MINOR SPOTS STILL SHOW THROUGH BUT THEY ARE VERY MINOR. 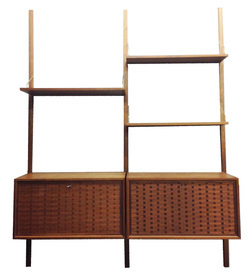 THE RATTAN MAGAZINE SHELF HAS NO BREAKS. THE LEGS HAVE BEEN CLEANED AND OILED AND ARE VERTIALLY FLAWLESS. 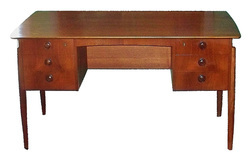 THIS DINING TABLE IS IN VERY GOOD CONDITION. IT HAS VERY MINIMAL WEAR AND IS VERY STURDY. IT NEEDS A GOOD CLEANING AND REOILING OR JUST USE IT AS IS. IT HAS TWO LEAVES THAT SIT BELOW THE TOP. ONE OF THE BEST! 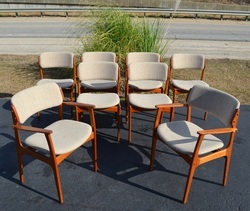 THIS SET IS IN GREAT SHAPE, THEY HAVE OATMEAL FABRIC AND VERY DARK GREY FIBERGLASS. 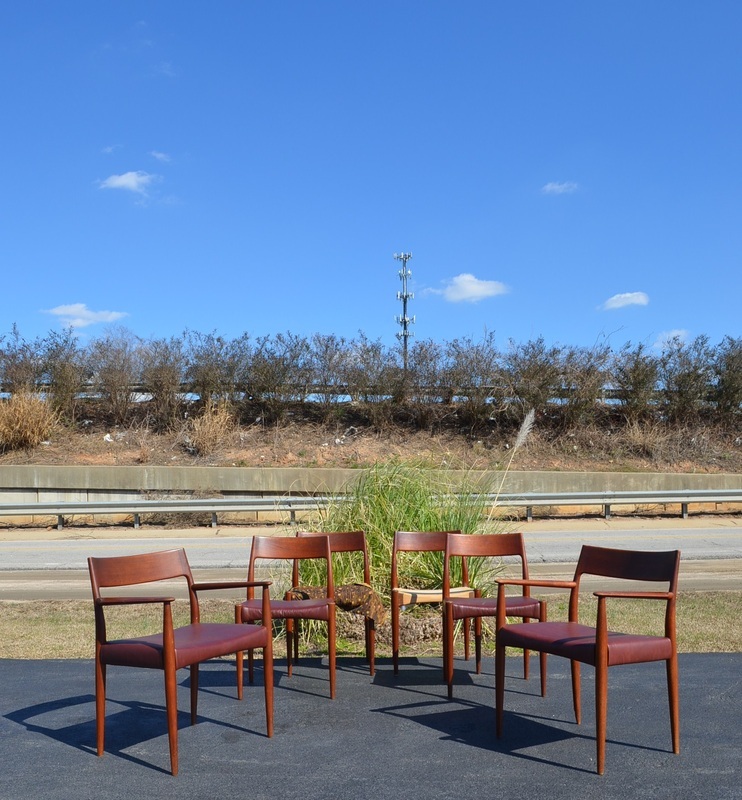 THE EIFFEL BASES CAME OFF A SET OF MODERICA CHAIRS THAT WERE USED OUTDOORS SO THEY HAVE SOME VERY MILD SURFACE RUST. THIS COULD PROBABLY BE REMOVED WITH A GOOD STEEL WOOL JOB. 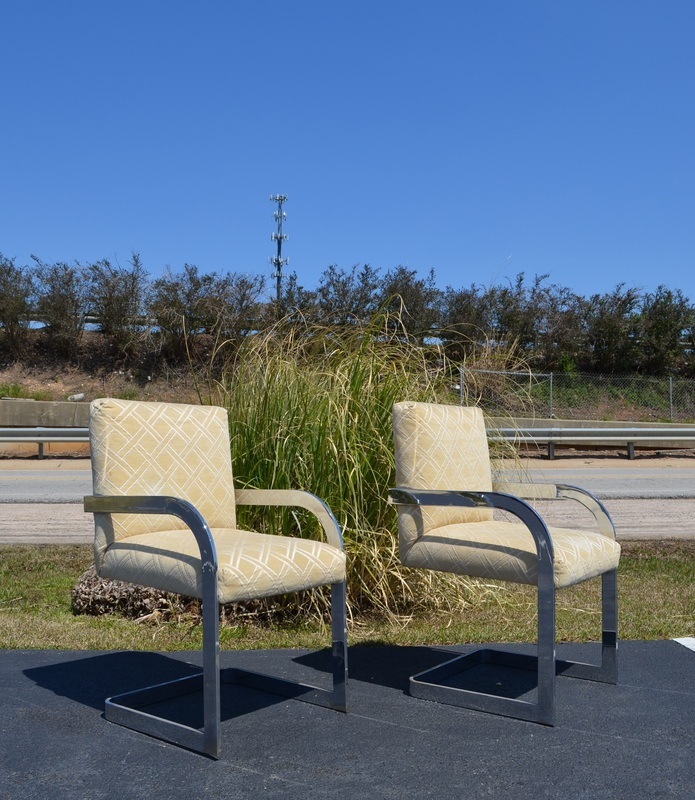 THE FABRIC IS VERY CLEAN, NEARLY PERFECT WITH THE EXCEPTION OF TWO SPOTS THAT COULD EASILY BE CLEANED OUT, THEY ARE VERY MINOR AND IT HAPPENED AFTER WE HAD THE FABRIC PROFESSIONALLY CLEANED. 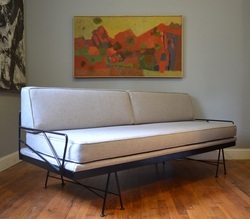 THIS SOFA IS OFTEN ATTRIBUTED TO FREDRIK KAYSER BUT WE HAVE NEVER SEEN AN ACTUAL AD TO PROVE THIS. 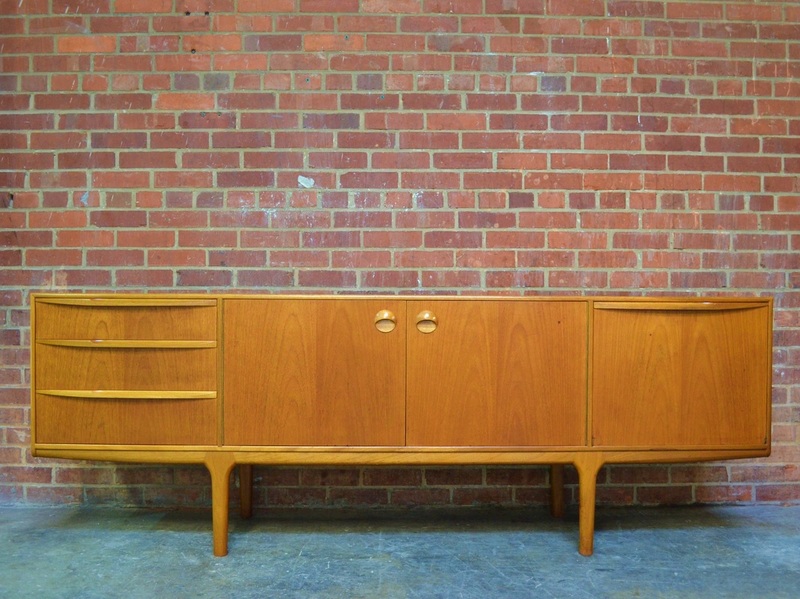 EITHER WAY THIS IS A GORGEOUS PIECE IN EXCEPTIONALLY GOOD ORIGINAL CONDITION. THE ORIGINAL UPHOLSTERY IS NEARLY FLAWLESS AND THE SPRINGS ARE IN DECENT SHAPE. A FEW SPRINGS ON ONE SIDE STARTED TO GET A BIT STRETCHED AND WERE MOVED SO THAT IT IS IN LONGER AN ISSUE. 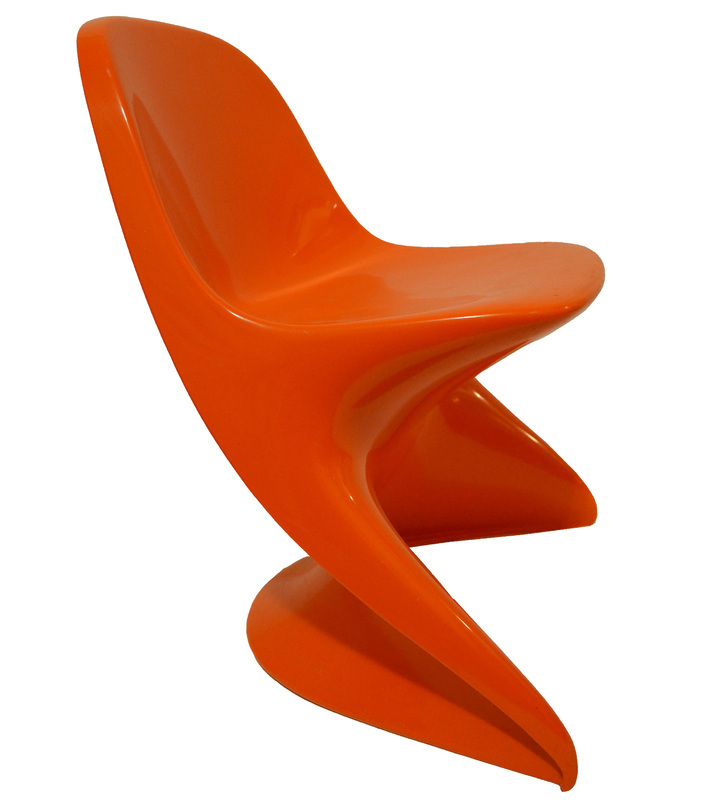 THIS CHAIR ORIGINALLY RETAILED FOR NEARLY $5K AND IS CURRENTLY OUT OF PRODUCTION. 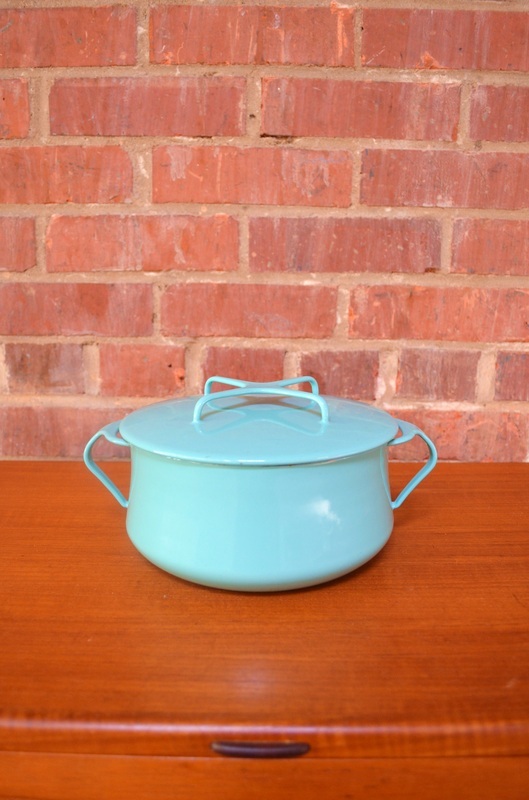 YOU CAN GET THIS NEARLY MINT CONDITION EXAMPLE, IN A GREAT COLOR FOR LESS THAN HALF PRICE! 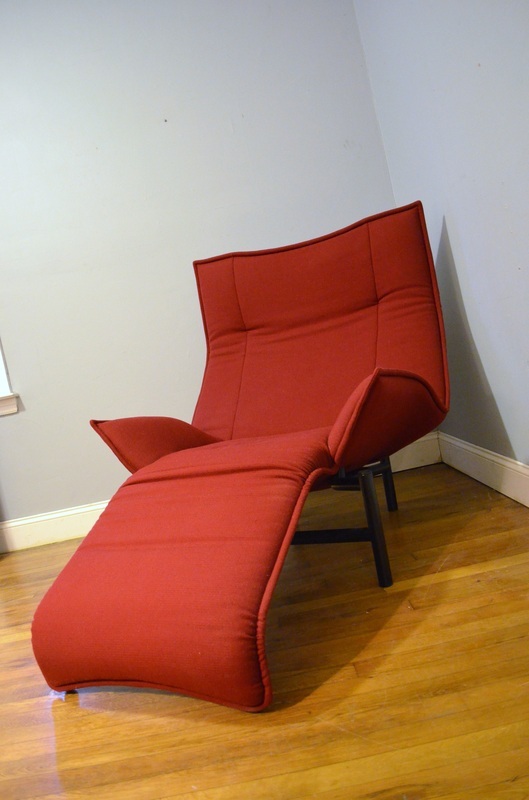 IT IS INSANELY COMFY AND VERSITLE. THIS GLOBE IS GREAT, THE SOLID BRASS FRAME HAS A WONDERFUL PATINA AND IS EXTRA LARGE. THE GLOBE HAS A FEW MINOR IMPERFECTIONS BUT NOTHING UNSIGHTLY. 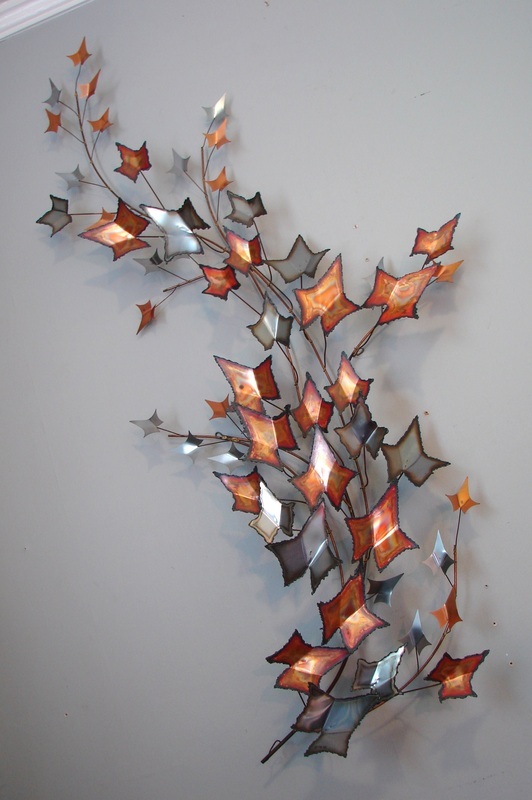 THIS UNIQUE LAMP WAS PROBABLY MADE FROM SEVERAL DIFFERENT PIECES BUT THE OVERALL EFFECT IS REALLY COOL. IT WORKS JUST LIKE IT SHOULD! YOU'VE JUST GOT TO SEE THIS ONE IN PERSON. IT IS UNSIGNED BUT DEFINETLY A HIGH END PIECE. IT'S TRULY AMAZING, THE DETAIL AN LINES ARE AMAZING. IT HAS A COUPLE OF MINOR BLEMISHES BUT NOTHING MAJOR. 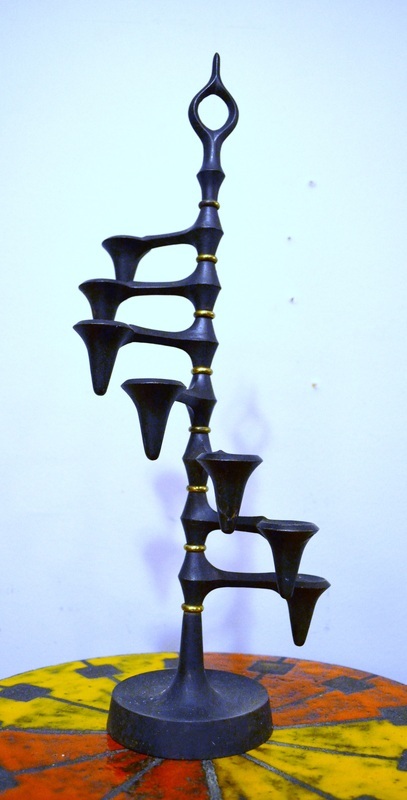 THE TOTAL HEIGHT IS 33.5 INCHES AND THE SCULPTURE ITSELF IS 23.5 INCHES TALL. 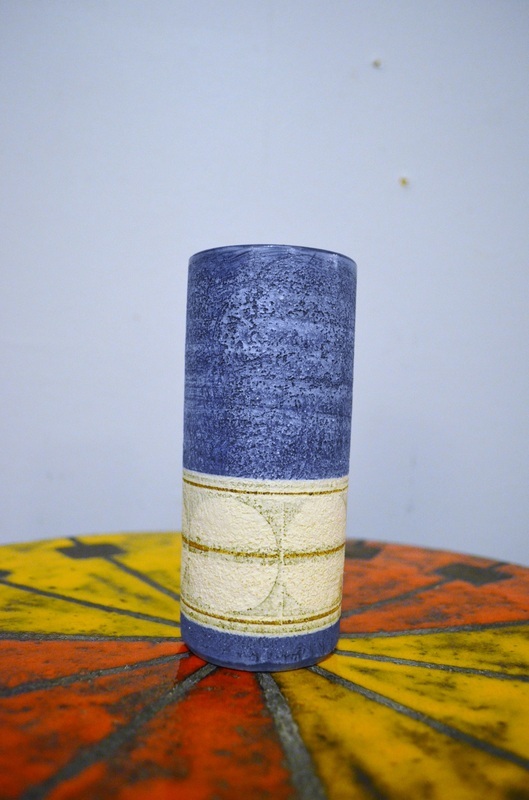 THIS SMALL VASE IS SIGNED ON THE BOTTOM AND IS PERFECT WITH THE EXCEPTION OF ONE TINY, TINY NICK ON THE LIP. THIS SMALLER SIZED BELL IS IN GREAT SHAPE! IT IS SIGNED AND READY TO HANG. 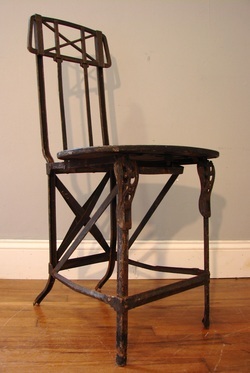 THIS CHAIR IS REALLY STURDY AND HAS A BEAUTIFUL PATINA THROUGH AND THROUGH. 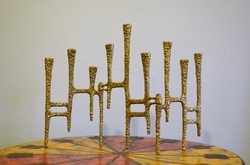 THE SCULPTED WOOD SEAT IS VERY UNUSUAL FOR THESE CHAIRS. 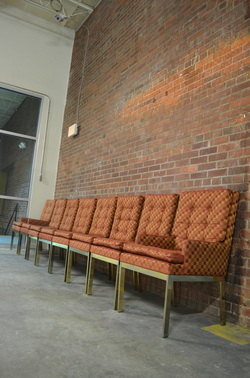 THIS ORIGINATED IN AN ABANDONED WAREHOUSE IN BURLINGTON. THE SET IS IN NEARLY PERFECT CONDITION, FRESHLY CLEANED AND OLIVE OILED, READY TO USE! THESE TOOLS ARE AWSOME. THEY HAVE A SUPER CLEAN AND SIMPLE LOOK AND ARE IN GREAT VINTAGE CONDITION. THIS HUGE VASE IS A MASSIVE 16.25 INCHES TALL BY 6.5 INCHES WIDE. I COULDN'T FIND ANY BLEMISHES. IT IS MARKED FLAVIA, MADE IN ITALY. 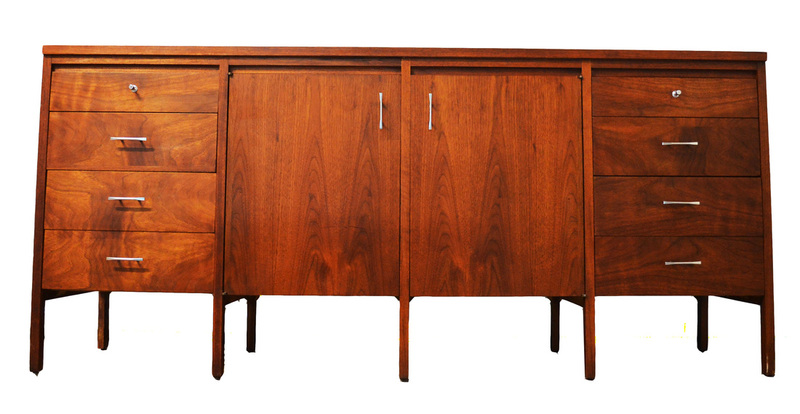 THIS TEAK CREDENZA IS ABSOLUTELY STUNNING. IT IS IN EXCELLENT CONDITION WITH ONLY A COUPLE OF EXTREMELY MINOR ISSUES. THE REMOVABLE UPPER HUTCH PORTION CAN BE REMOVED IF YOU'D LIKE TO USE THIS WITH A TV RATHER THAN IN YOUR DINING ROOM. 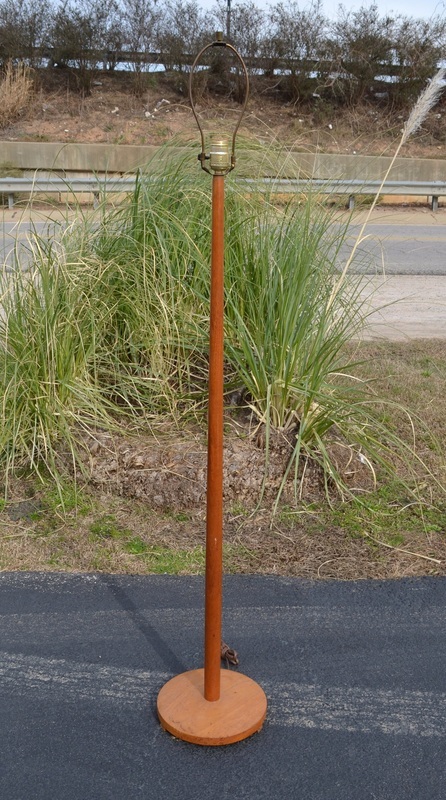 THE BOTTOM PORTION IS 80 INCHES BY 19 INCHES DEEP BY 31.5 INCHES TALL. THE TOP IS 59INCHES BY 25 INCHES TALL BY 11 INCHES DEEP. THIS EXTRA LARGE VASE IS SPECTACULAR. IT HAS A PAINTED SCENE ALL THE WAY AROUND. 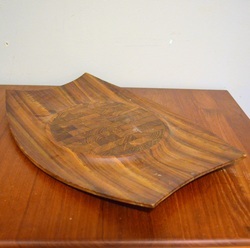 IT HAS A FEW SMALL CHIPS AT THE BOTTOM ON ONE SIDE BUT OVERALL IT IS IN EXCELLENT CONDITION. IT IS ABOUT A FOOT AND A HALF TALL. 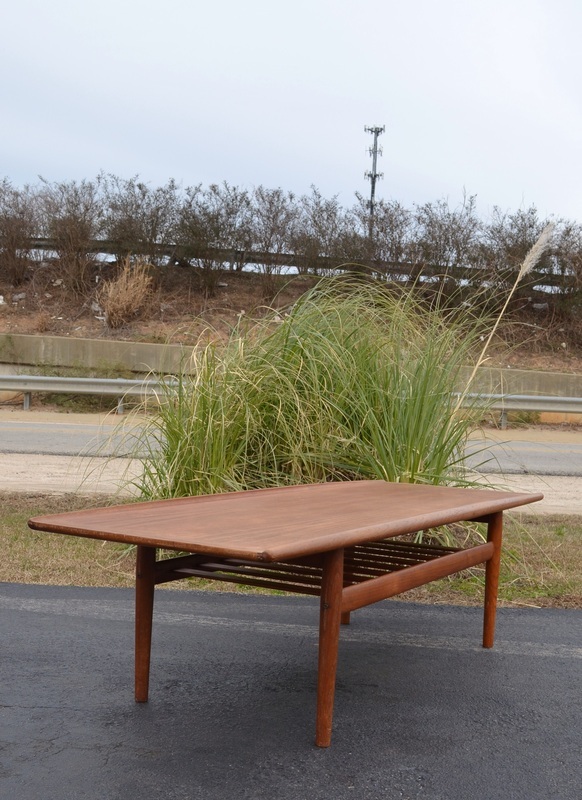 SUPER RARE PIECE IN EXCELLENT CONDITION. 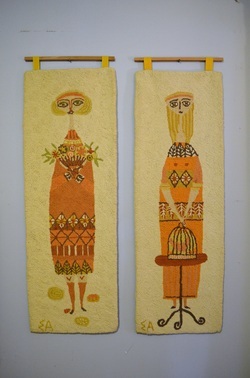 THE FABRIC BACKING HAS A BIT OF MILD FOXING BUT NOTHING THAT DETRACTS FROM THE OVERALL APPEAL. 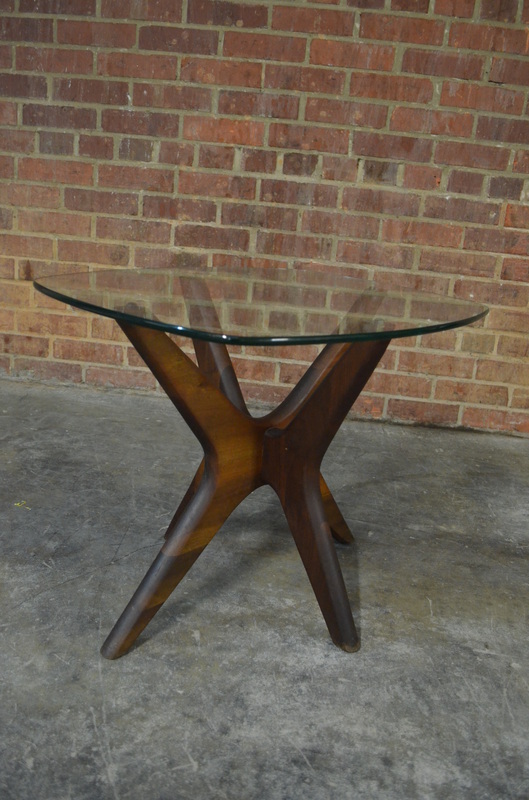 THIS INCREDIBLY RARE TABLE IS IN GREAT SHAPE FOR ITS AGE AND STILL RETAINS ITS EARLY KNOLL BOWTIE LABEL. THE WOOD IS IN GREAT SHAPE AND IT HAS NO CHIPS. 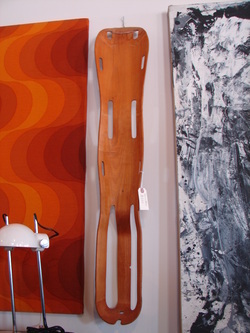 SOMEONE POLYURATHANED THE TOP BUT NOT THE LEGS, YOU WILL PROBABLY WANT TO REMOVE THIS AND APPLY AN OIL FINISH. THE BANDING ON THE TOP WILL ALSO NEED TO BE GLUED IN A SMALL AREA, NOTHING MAJOR WE JUST DON'T HAVE THE TIME TO GET IT DONE RIGHT NOW! 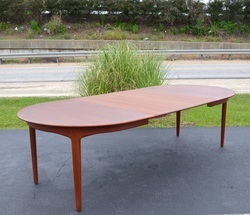 THIS EARLY KNOLL TABLE HAS A 54" WALNUT VENEER TOP THAT IS COMPLETELY UNTOUCHED AND IN EXCELLENT CONDITION. 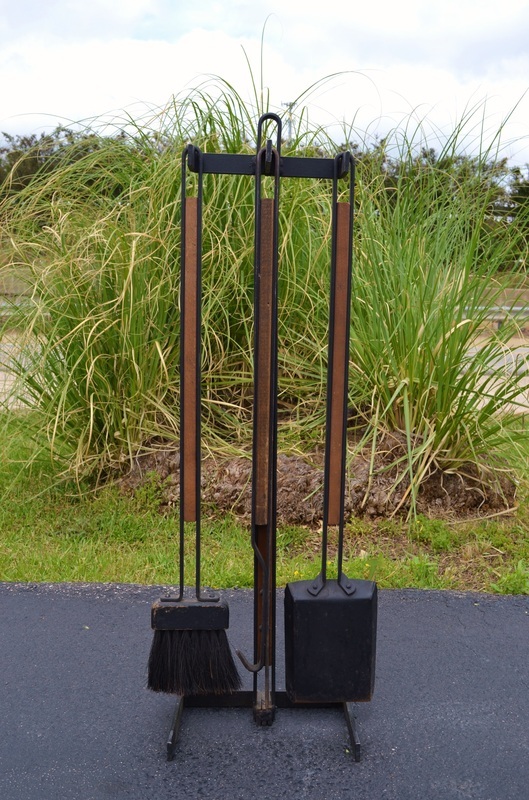 YOU WILL WANT TO CLEAN AND OIL IT FOR YEARS OF BEAUTY! 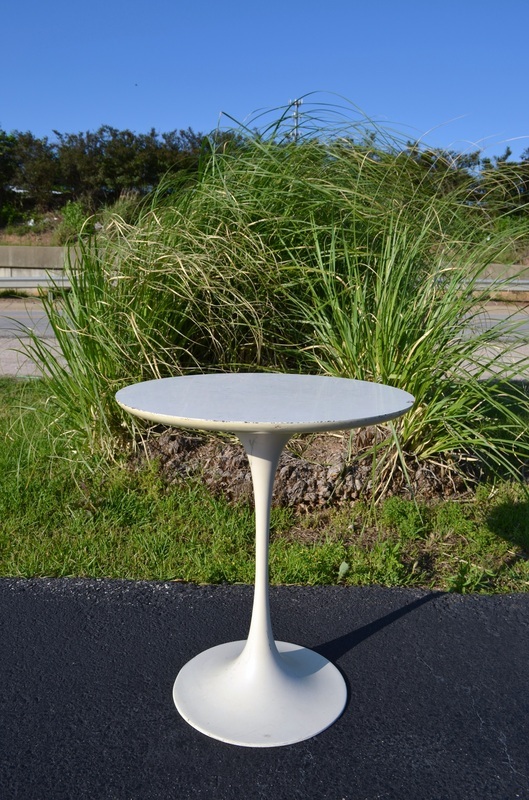 THE BASE HAS A COUPLE BLEMISHES AND A ROUGH SPOT IN THE MIDDLE BUT OVERALL IT IS IN EXCELLENT CONDITION GIVEN ITS 50+ YEARS OF AGE. 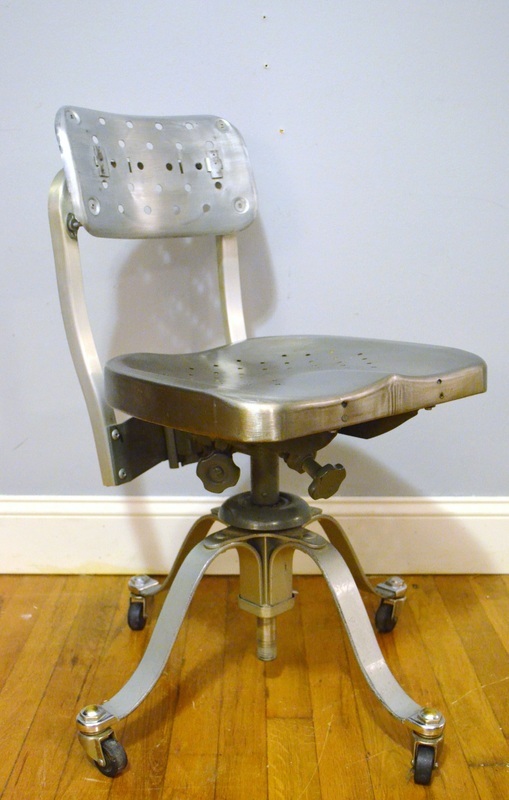 THIS DESK CHAIR HAS BEEN SANDED AND PENETROL APPLIED TO STOP ANY RUST. IT IS REALLY COMFY AND LOOKS AMAZING. ONE CASTER HAS A CHIP WHICH WE ARE GOING TO REPLACE NEXT TIME WE GO TO THE SECRET ANTIQUE CASTER DEALER OUT IN THE BOONIES! NEWLY REUPHOLSTERED IN BLACK LEATHER. 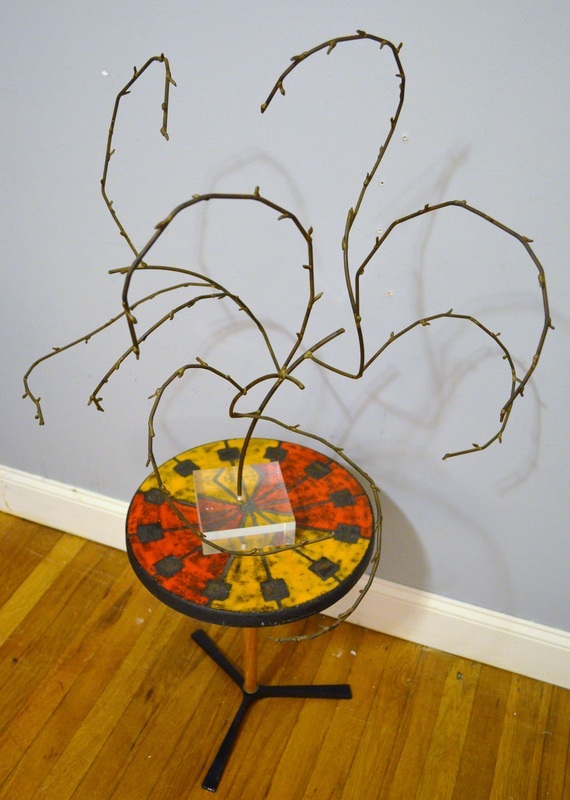 THIS CHAIR IS READY FOR YEARS AND YEARS OF LOVE! RETAINS ITS EARLY KNOLL LABEL. 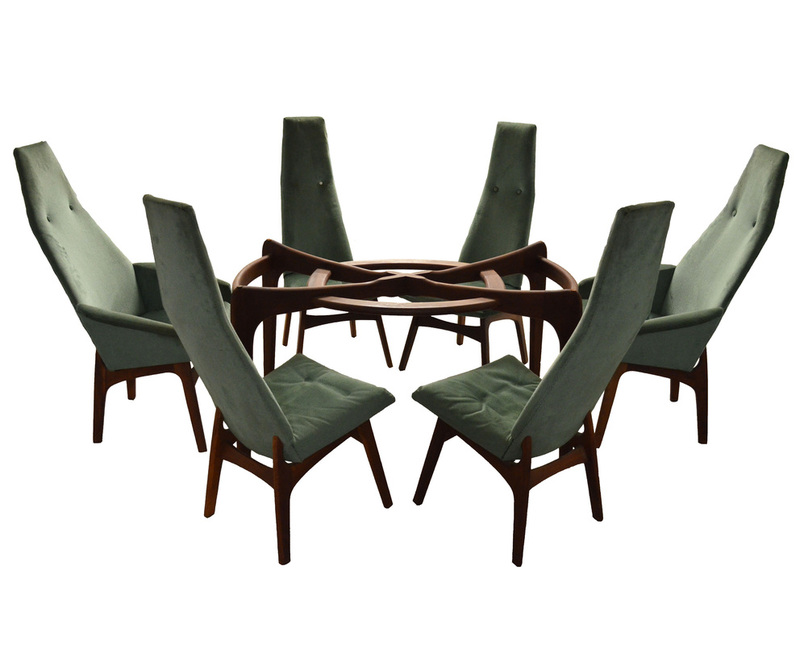 THIS LARGE SET OF EIGHT ERIK BUCK DINING CHAIRS IS IN NEARLY PERFECT CONDITION. THEY ARE VERY TIGHT, STURDY AND NEARLY FLAW FREE. 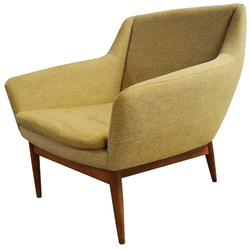 THE OATMEAL COLORED UPHOLSTERY HAS NO HOLES, WEAR OR BLEMISHES OF ANY KIND. THE UPHOLSTERY ON THESE IS STILL VERY USABLE. IT HAS A COUPLE SMALL IMPERFECTIONS BUT NOTHING MAJOR. THE FRAMES ARE IN OKAY SHAPE, THEY HAVE SOME FINISH LOSS AND NEED TO BE OILED AT THE LEAST. THE STRAPS ALSO NEED REPLACING, THEY ARE NOT FAGAS STRAPS. 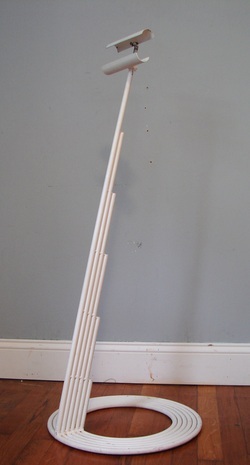 THEY ARE SIMPLE PULL AROUND A HOLE STRAPS SO IT WILL BE CHEAP AND EASY. 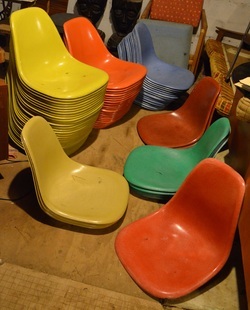 YOU GET ALL FOUR COMPLEMENTARY COLORED CHAIRS, ALL THE BOLTS, ALL NARROW MOUNT AND THEY'RE IN GREAT SHAPE! ADD YOUR FAVORITE BASES AND YOU'RE READY TO GO! WHILE THE UPHOLSTERY JOB ON THIS WAS RECENTLY DONE IT WILL ALMOST CERTAINLY NEED TO BE RE-DONE FOR OBVIOUS REASONS... LUCKILY IT RECEIVED ALL NEW FOAM AND WEBBING. SO THE REUPHOLSTERY SHOULD END UP BEING MUCH LESS EXPENSIVE. WE CAN HAVE IT DONE FOR $800 IN YOUR FABRIC! IT SHOULD TAKE ABOUT 2-3 WEEKS TO HAVE IT DONE. BETTER PIC TO FOLLOW. 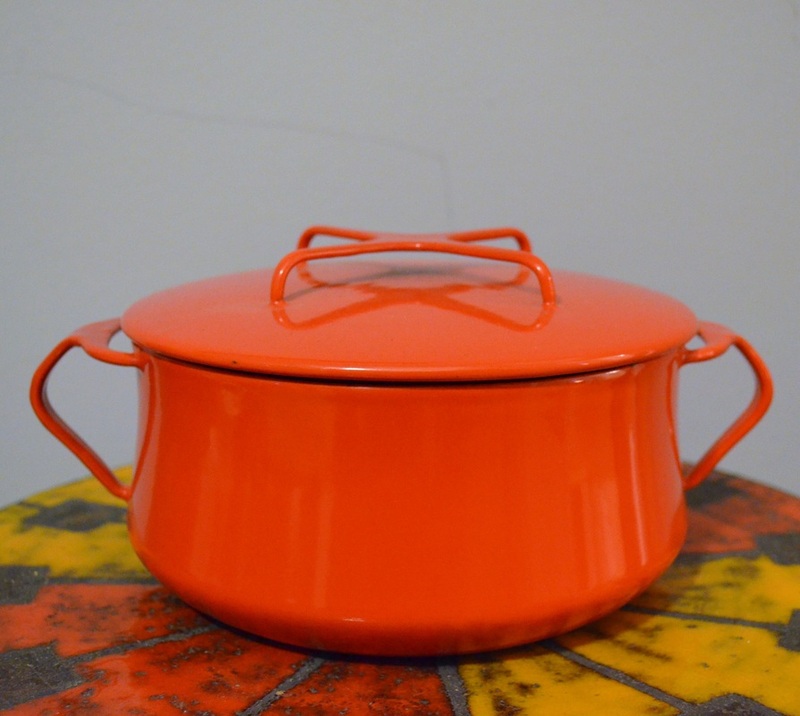 THIS POT IS IN EXCELLENT CONDITION. IT IS BRIGHT RED, IT HAS A COUPLE OF SMALL DINGS BUT NOTHING MAJOR. ONE OF THE FINEST EXAMPLES OF HARRIS STRONGS WORK YOU CAN EVER HOPE TO FIND. 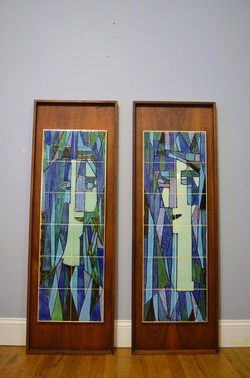 THE TILE IS IN PERFECT CONDITION AND THE RECESSED SOLID WALNUT FRAMES ARE ABSOLUTELY STUNNING IN PERSON. OFTEN THIS SET IS SHOWN IN MORE "STANDARD" FRAMES BUT THIS PAIR IS IN SOME OF THE NICEST WALNUT WE'VE EVER SEEN. 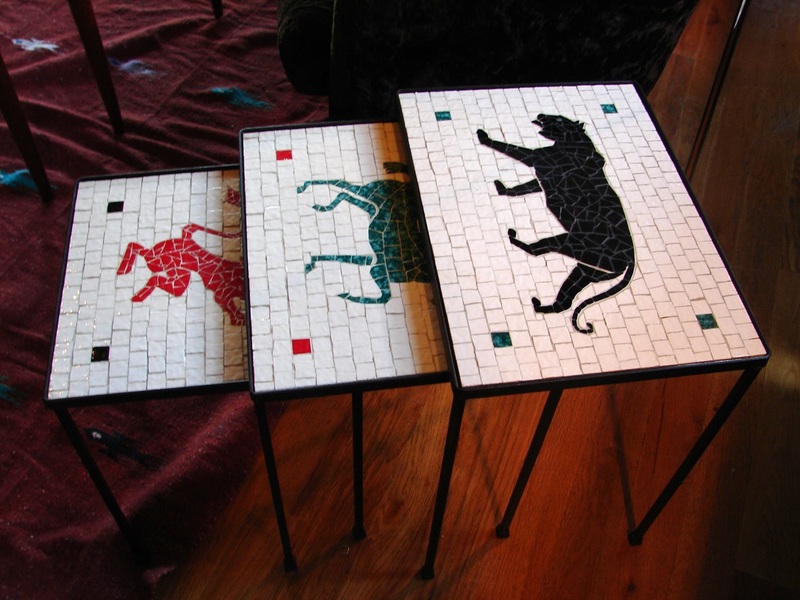 THE TILES ARE BEAUTIFUL AND FULL OF DEEP RICH COLOR. THEY ARE 48.25 INCHES BY 16.5 BY A SHADE OVER 1.5 INCHES. THIS ISN'T SOMETHING WE WOULD USUALLY BUY BUT THIS ONE WAS TOO NICE TO PASS UP. 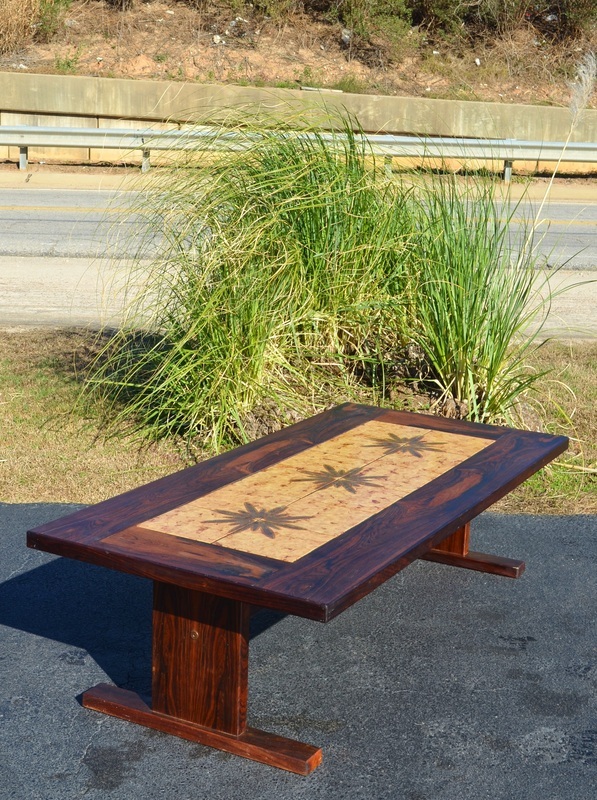 THIS HANDMADE TABLE CAME FROM THE ORIGINAL ESTATE OUT IN ALAMANCE COUNTY, WE ARE UNSURE OF THE EXACT AGE BUT IT LOOKS LIKE ITS BEEN KICKING AROUND FOR AWHILE. 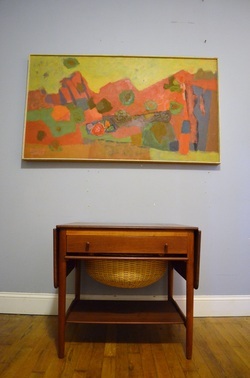 THE TOP IS MADE FROM TWO BOARDS AND IT HAS A HUGE DRAWER. THE ENTIRE TABLE HAS GREAT LITTLE DETAILS ALL THROUGHOUT AND IS SUPER SOLID! 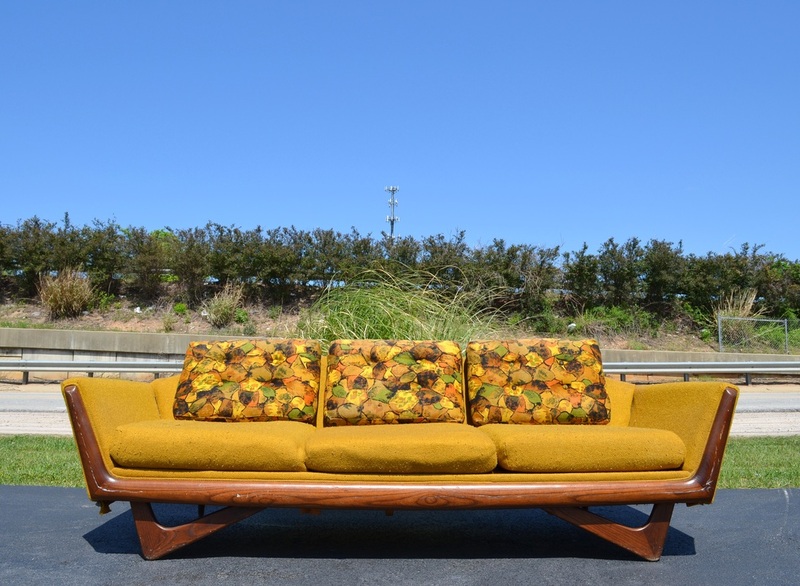 THIS INCREDIBLE SOFA IS JUST AS WE FOUND IT. WE HAVEN'T TOUCHED IT ONE BIT. THE HEAVILY WORN LEATHER IS GORGEOUS WITH TONS OF BEAUTIFUL WEAR FROM AGE. OBVIOUSLY YOU WILL WANT TO CLEAN THE UPHOLSTERY AND HAVE THE LEATHER TREATED. THE WOOD IS IN GOOD SHAPE WITH ONE SMALL CRACK STARTING AND A FEW SCRATCHES HERE AND THERE. IT WILL ALSO NEED TO BE CLEANED AN TREATED. 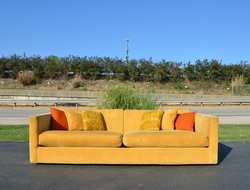 IF YOU BUY THE SOFA AND THE MATCHING CHAIRS WE WILL SELL THE SET FOR $1400 TOGETHER. 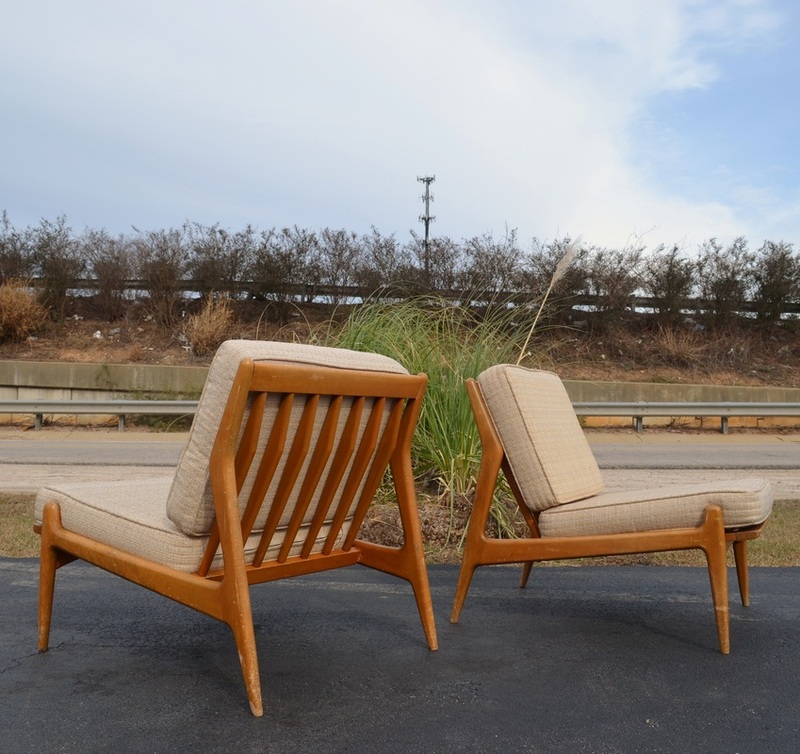 THIS INCREDIBLE PAIR OF CHAIRS ARE JUST AS WE FOUND THEM. WE HAVEN'T TOUCHED THEM AT ALL. THE HEAVILY WORN LEATHER IS GORGEOUS WITH TONS OF BEAUTIFUL WEAR FROM AGE. 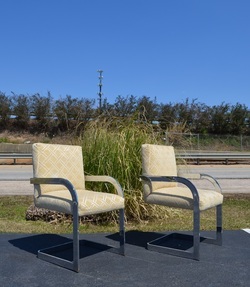 THE CHAIRS HAVE SOME WHITE MARKS THAT CAN BE EASILY CLEANED OFF WITH WATER. YOU CAN SEE THEM IN THE PICTURES. WE TESTED A COUPLE OF AREAS AND IT SHOULD BE NO PROBLEM. 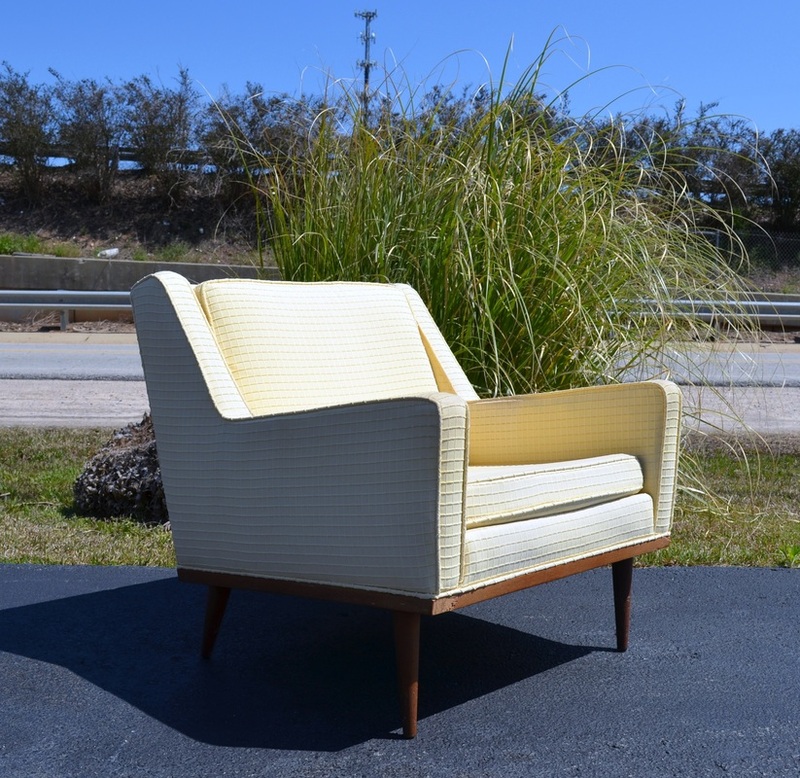 BVIOUSLY YOU WILL WANT TO FULLY CLEAN THE UPHOLSTERY AND HAVE THE LEATHER TREATED. THE WOOD IS IN GOOD SHAPE WITH A FEW SCRATCHES HERE AND THERE. ONE ORIGINAL BOLT IS MISSING ON ONE CHAIR. THE WOOD WILL ALSO NEED TO BE CLEANED AN TREATED. 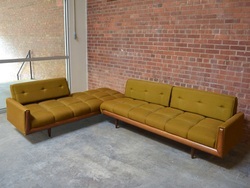 IF YOU BUY THE SOFA AND THE MATCHING CHAIRS WE WILL SELL THE SET FOR $1400 TOGETHER. THIS DRESSER HAS BEEN COMPLETLY REFINISHED. 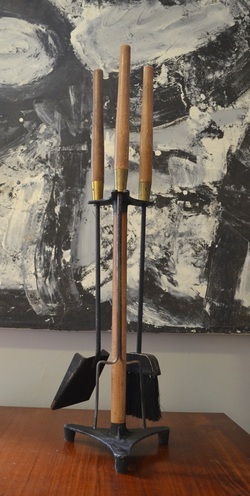 THE CASE AND PULLS WERE SANDED, FILLED, PRIMED AND PROFESSIONALLY EBONIZED. THE DRAWERS WERE SANDED AND REFINISHED WITH POLYURETHANE THAT LETS THE WALNUT SHINE THROUGH. 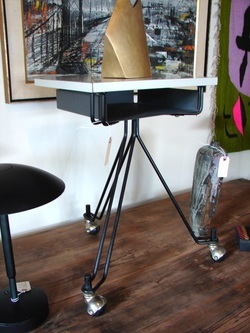 IT HAS HIDDEN CASTERS BELOW THE BASE TO ALLOW EASY MOVEMENT. THIS IS USUALLY AN $800+ COFFEE TABLE BUT THIS ONE IS A BIT UNFORTUNATE. THE VENEER ON TOP HAS SWOLLEN PAST THE SOLID TEAK EDGING. THE FRAME AND EDGING IS IN EXCELLENT CONDITION BUT YOU WILL NEED TO REPLACE THE MIDDLE VENNER. I WOULD RAZOR BLADE OUT THE VENEER PORTION AND ADD A PIECE OF BLACK FORMICA, IT WOULD LOOK AMAZING AND WOULD LAST FOREVER! THAT WAS THE ORIGINAL PLAN BUT WE HAVE WAY TO MANY OTHER PROJECTS LINED UP SO WE'VE GOTTA LET THIS ONE GO. THIS CHAIR IS IN GREAT SHAPE, IT HAS A COUPLE OF BROKEN STRANDS THAT COULD BE GLUED. 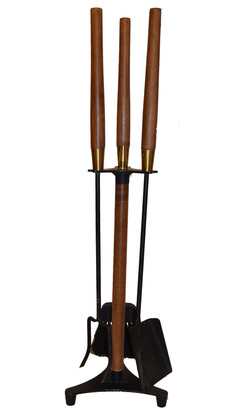 OR YOU COULD REPLACE THEM WITH NEW CANE OR UPHOLSTERY. 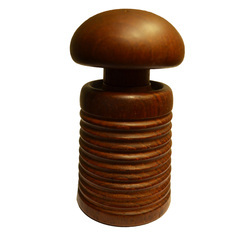 THIS QUARTERSAWN OAK LIBRARY CHAIR HAS EXCEPTIONAL HARDWARE. THE NAUGAHYDE BACKREST IS IN EXCELLENT CONDITION WITH CONTRASTING NAILHEADS AND GREAT PATINA. ALL THE HARDWARE FUNCTIONS AND IS VERY MECHANICAL LOOKING. THIS CHAIR IS MUCH MORE COMFORTABLE THAN YOU WOULD THINK! ORIGINAL HERMAN MILLER PRODUCED, (PROBABLY 60'S), OFF WHITE COLOR SHELL ON A REPRODUCTION BASE. THE SHELL HAS SOME VERY, VERY MINOR IMPERFECTIONS AND THE BASE IS 100% BRAND NEW! THIS EARLY TEAK ICE BUCKET HAS AN ORANGE LINER AND IS 12 BY 9 INCHES. YOU GET ALL SIX FOR $75. 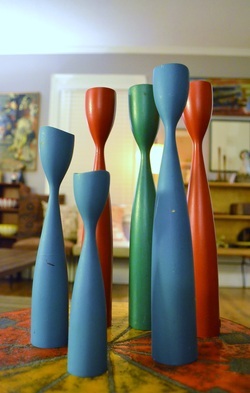 THEY ARE IN DECENT SHAPE, THE TALL BLUE ONE IS KIND OF BENT. IF YOU FACE THE BENT PORTION TOWARDS THE BACK YOU'LL NEVER NOTICE. THERE IS SOME VERY MINOR PAINT LOSS BUT NOTHING MAJOR. 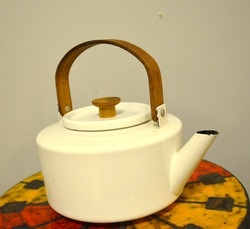 THIS TEA POT IS IN GREAT SHAPE WITH VERY LITTLE WEAR. THIS TABLE IS IN NICE SHAPE, IT HAS A FEW SCUFFS AND SOME MILD SIGNS OF AGING BUT NOTHING MAJOR. 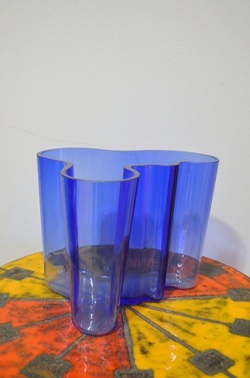 THE GLASS HAS A COUPLE OF KNICKS BUT IT CAN STILL BE USED OR IS EASILY REPLACEABLE. 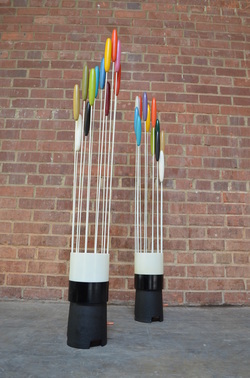 THE BASE IS 13.25 INCHES TALL BY 28 WIDE. 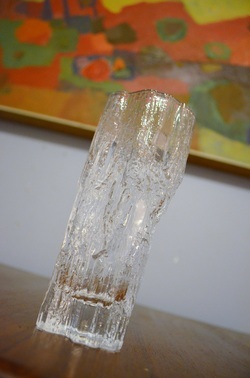 THE GLASS IS 36 INCHES WIDE. 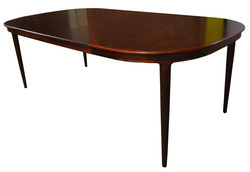 THIS 54" TOP DINING TABLE IS LIKELY A CHARLES HOLLIS JONES DESIGN. THE SHAPE CONSTRUCTION AND QUALITY ALL POINT TO THIS ATTRIBUTION BUT WE CANNOT BE 100% CERTAIN. THE GLASS HAS NO CHIPS, THE BASE HAS A FEW MINOR SCUFFS THAT CAN PROBABLY BE BUFFED OUT. 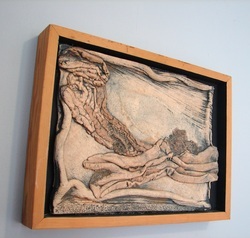 THIS SIGNED CURTIS JERE SCULPTURE DATES FROM 1981. IT IS IN EXCELLENT CONDITION OVERALL. IT HAS A LOT OF DEPTH AND CHARACTER. 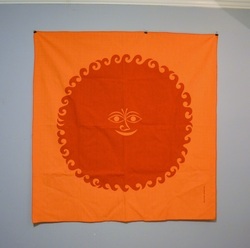 IT IS VERY LARGE AT 64 INCHES BY 23 INCHES. GREAT FORM AND PRESENCE. 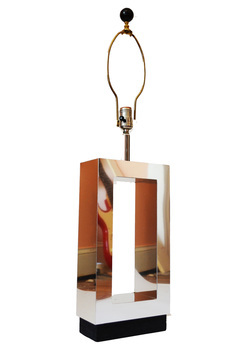 IF YOU NEED AN UNUSUAL DESIGN ELEMENT, THIS IS FOR YOU! IT IS 23 INCHES TALL. 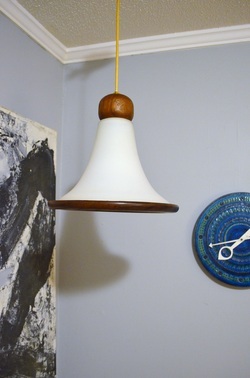 THIS LAMP IS IN AMAZING CONDITION GIVEN THE AGE. ALL THREE SHADES ARE NEARLY PERFECT, THE TOP WHITE SHADE HAS AN EXTREMELY TINY FLECK IN IT. OTHERWISE THE GLASS IS PERFECT. IT HAS A THREE WAY SWITCH AND IT ALL WORKS LIKE IT SHOULD! THIS THING IS REALLY WEIRD AND STRANGE AND LOOKS INCREDIBLE IN PERSON. 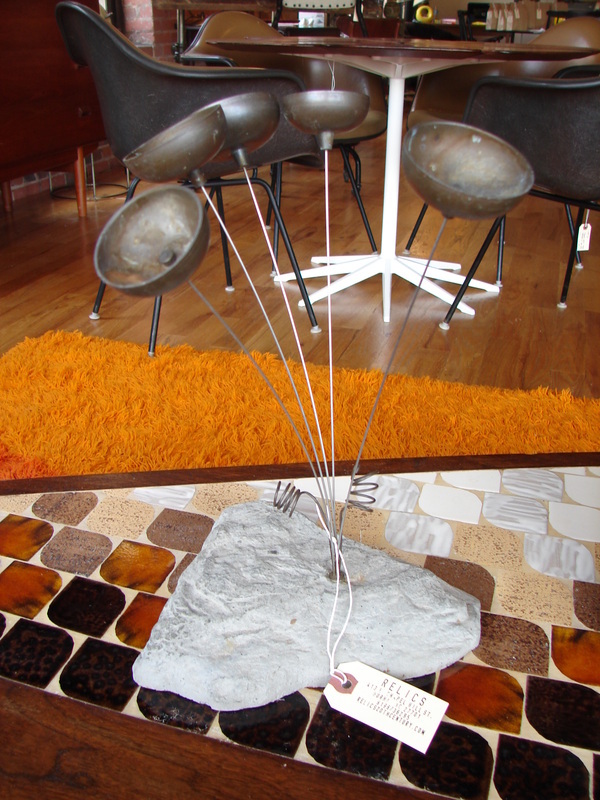 PERFECT FOR DISPLAYING YOUR UNUSUAL COLLECTION! IT HAS A CORD ON THE BACK SO THAT IT CAN BE HUNG. YOU REALLY NEED TO SEE THIS IN PERSON! 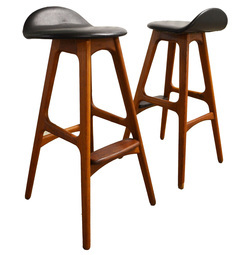 THESE STOOLS HAVE GREAT WEAR THROUGHOUT AND ARE EXTREMELY STURDY. THEY HAVE MANY DIFFERENT COLORS OF PAINT POKING THROUGH AND LOTS OF CHIPPED CRACKED AND SANDED FINISH. THE OUTSIDE HAS BEEN PROTECTED WITH A CLEAR COAT SO THEY SHOULDN'T LEAVE THEIR MARK ON YOUR FLOOR! 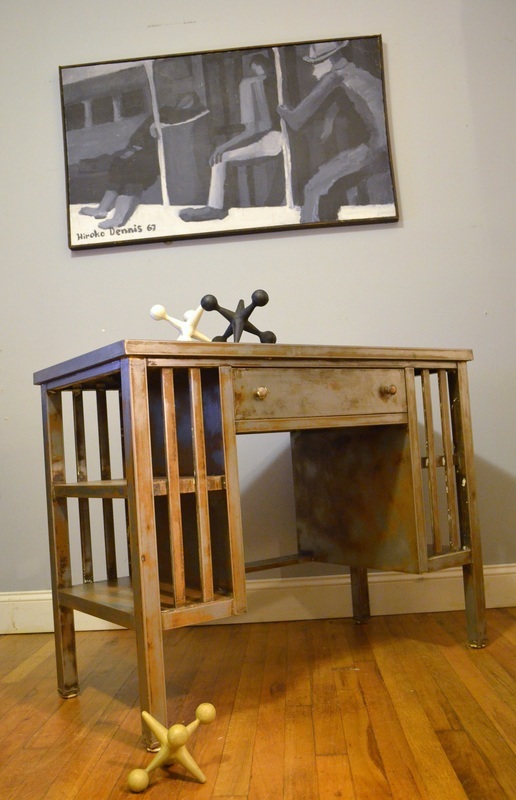 THIS LITTLE TABLE HAS TONS OF GREAT WEAR AND IS SUPER STURDY SINCE IT IS CONSTRUCTED OUT OF SOLID QUARTERSAWN OAK. 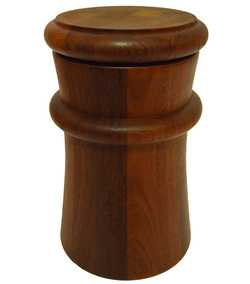 IT IS 19.75 INCHES TALL BY 20 WIDE BY 17 DEEP. 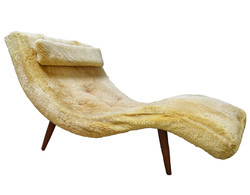 100% ORIGINAL FUZZY BROWN FABRIC AND SCULPTED WALNUT. JUST PERFECT! EXCELLENT SCULPTED TEAK FULL OF PATINA AND ONE OF THE MOST BEAUTIFULY WORN LEATHER SEATS WE'VE EVER SEEN. 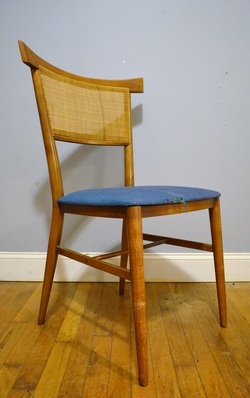 THIS CHAIR IS UNMARKED BUT SHARES MANY LINES WITH A LOT OF WEGNERS DINING CHAIRS. THIS LAMP IS IN NICE VINTAGE CONDITION WITH A COUPLE OF MINOR ISSUES THAT COULD BE EASILY FIXED. THE ORIGINAL HARP AND FINIAL ARE IN PLACE AND THE WIRING IS READY TO GO. ALL YOU NEED TO DO IS ADD A SHADE. THIS ORIGINAL BOWL IS IN EXCELLENT CONDITION, NEARLY PERFECT. IT CAN BE USED AS A PLANTER OR AS A SERVING PIECE. 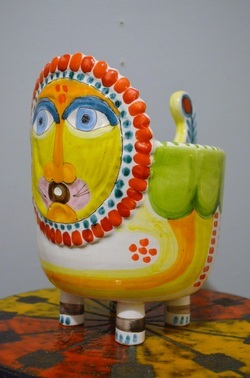 IT IS 5 INCHES TALL BY 10 INCHES WIDE. WE'VE SEEN THESE COMMONLY ATTRIBUTED TO PAUL MCCOBB BUT HAVE NEVER SEEN ANY FIRM PROOF TO THAT END. THEY ARE LABELED PLANTER INC. ON THE BOTTOM. ONE STILL RETAINS IT'S ORIGINAL BLUE PAINT ON THE INSIDE, THE OTHER HAS BEEN SCRUBBED CLEAN. 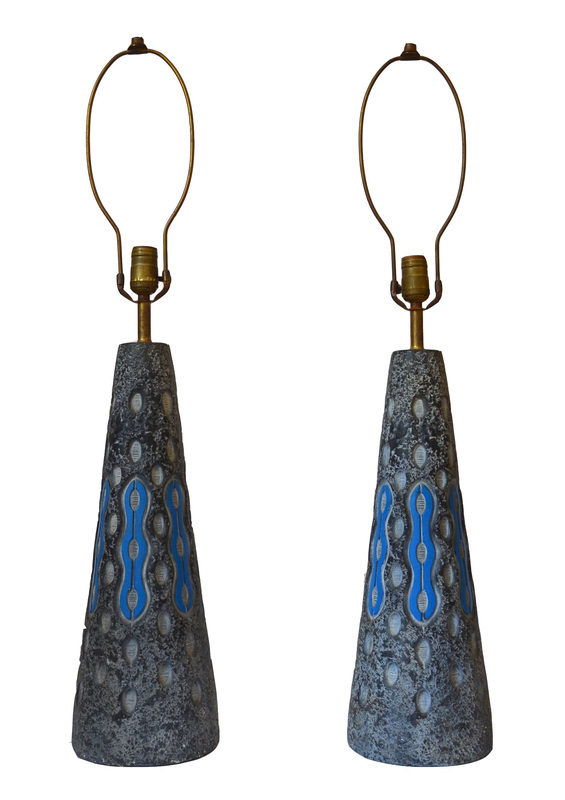 THEY ARE PRICED AT $175 EACH OR $325 FOR THE PAIR. 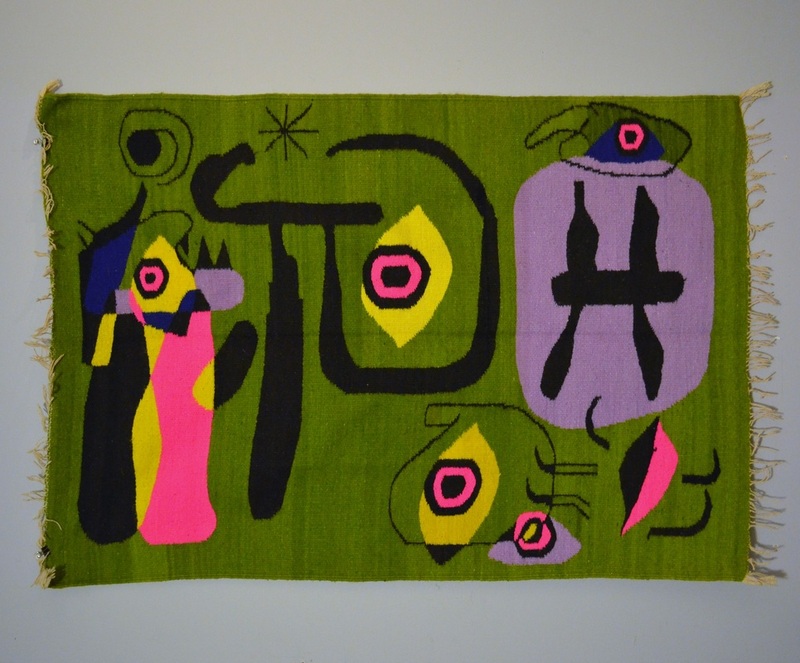 THIS RUG IS IN OVERALL GREAT SHAPE, IT HAS ONE SPOT ON IT THAT WE HAVE NOT ATTEMPTED TO CLEAN BUT GIVEN THE AGE A PROFESSIONAL CLEANING MAY BE IN ORDER ANYHOW. IT RETAINS THE ORIGINAL EGE LABEL AND LOOKS AS THOUGH IT HAS NEVER BEEN USED. 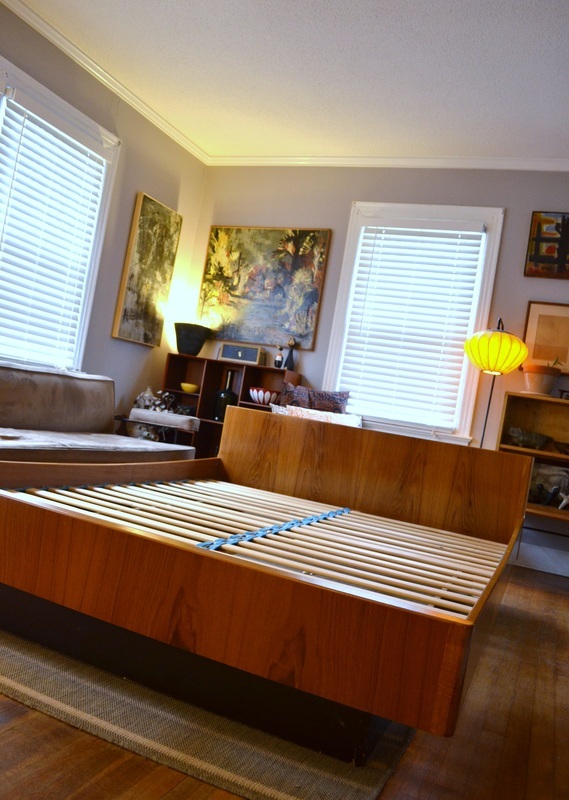 THIS PLATFORM BED IS IN EXCELLENT CONDITION. IT HAS A COUPLE OF TINY BLEMISHES BUT NOTHING MAJOR. IF YOU NEED DIMENSIONS SIMPLE ADD ABOUT 6 INCHES TO THE SIZE OF A QUEEN MATTRESS SINCE THIS IS A QUEEN SIZE BED. IT HAS BEEN RECENTLY CLEANED AND OILED. THE PLINTH BASE HAS SOME WEAR TO THE FINISH BUT IT COULD EASILY BE REPAINTED BLACK OR JUST TOUCH UP THE SPOTS THAT HAVE FINISH WEAR. 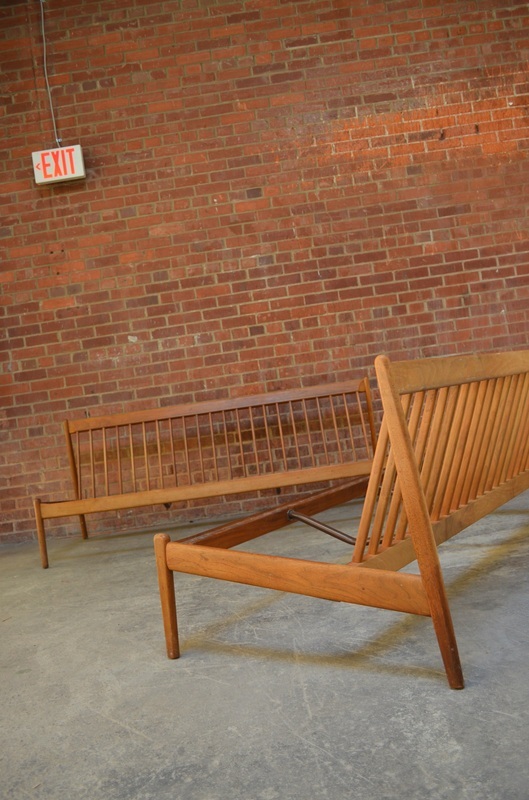 THE SIDE RAILS HAVE A GENTLE CURVE TO THEM IN A SLIGHT U SHAPE THAT LOOKS VERY SCULPTURAL IF YOU SET IT UP WHERE YOU CAN SEE THE SIDES OF THE BED. THIS SET IS IN GREAT SHAPE SHOWING VERY MINIMAL SIGNS OF AGE. THEY ARE BUILT LIKE TANKS AND OFFER INSANE AMOUNTS OF STORAGE. THE SET PRICE IS $550. YOU CAN BUY THE DRESSER ALONE FOR $475 OR THE NIGHT STAND FOR $225. GREAT CERAMIC PIECE IN EXCELLENT ORIGINAL CONDITION. NO CHIPS, CRACKS, DINGS OR DAMAGE OF ANY KIND. 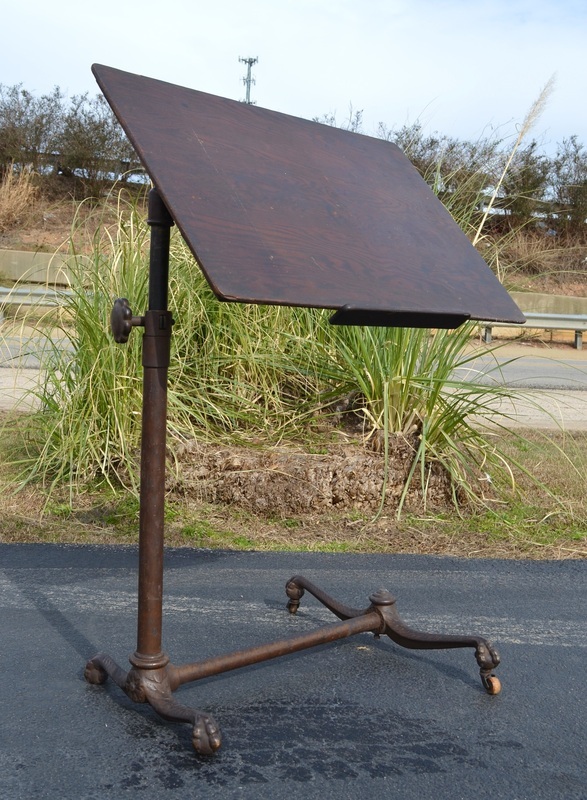 THIS STAND IS IN NEARLY PERFECT CONDITION. THE PAINT IS STILL NICE AND THE FORMICA IS IN GREAT SHAPE. THE WHEELS COULD USE A POLISH AND IT SHOULD LOOK LIKE NEW AGAIN! 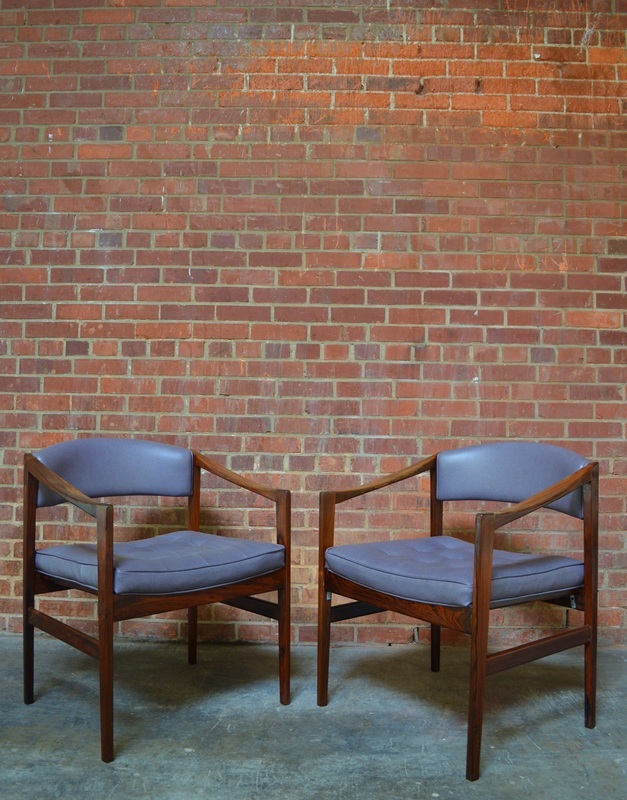 THIS PAIR OF CHAIRS HAVE ALL THE SIGNS OF BEING A MILO BAUGHMAN DESIGN FOR THAYER COGGIN BUT WE HAVE FOUND NO PROOF OF THIS ASSUMPTION. THEY JUST HAVE THE RIGHT LOOK AND BUILD QUALITY. 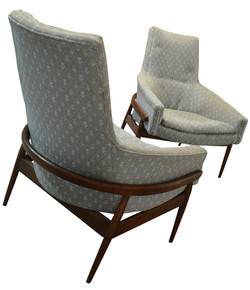 THIS PAIR RETAINS THE ORIGINAL UPHOLSTERY WHICH IS IN NICE USABLE CONDITION. ONE CHAIR HAS A SIDE THAT SAGS A BIT. IT WILL NEED SOME SORT OF REPAIR. THE REPAIR SHOULD BE OF MODERATE DIFFICULTY. NOT CRAZY HARD BUT ALSO NOT NOVICE WORK. 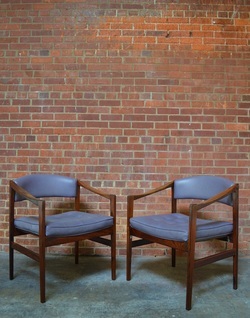 THIS PAIR OF CHAIRS IS IN STORAGE. 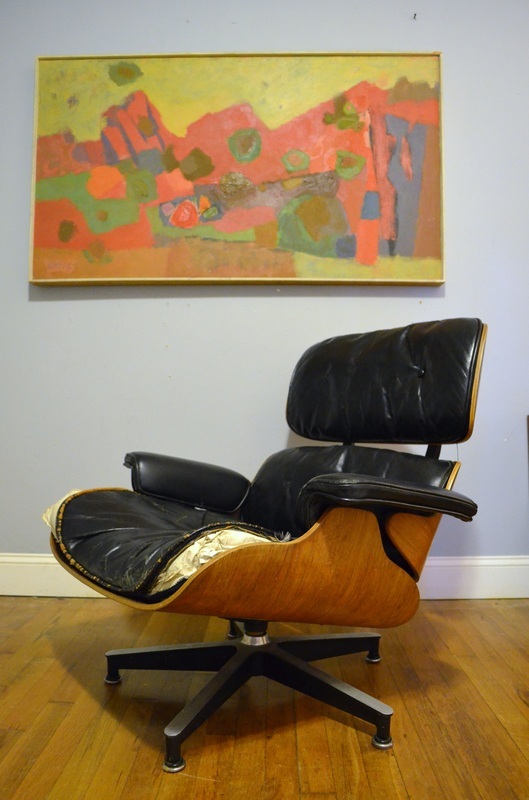 THIS RECLINER IS EXTREMELY COMFORTABLE AND GENEROUSLY PROPORTIONED. 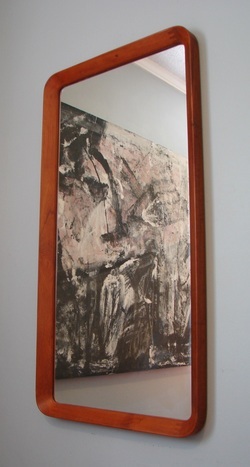 THE FRAME IS IN VERY GOOD CONDITION BUT THE FABRIC WILL NEED TO BE REPLACED. THE RECLINER CAN ROCK OR THERE IS A WALNUT TIPPED MECHANISM THAT LOCKS THE CHAIR INTO PLACE. THE OTTOMAN CAN FLIP UP AS SHOWN OR BE PLACED BACK DOWN. 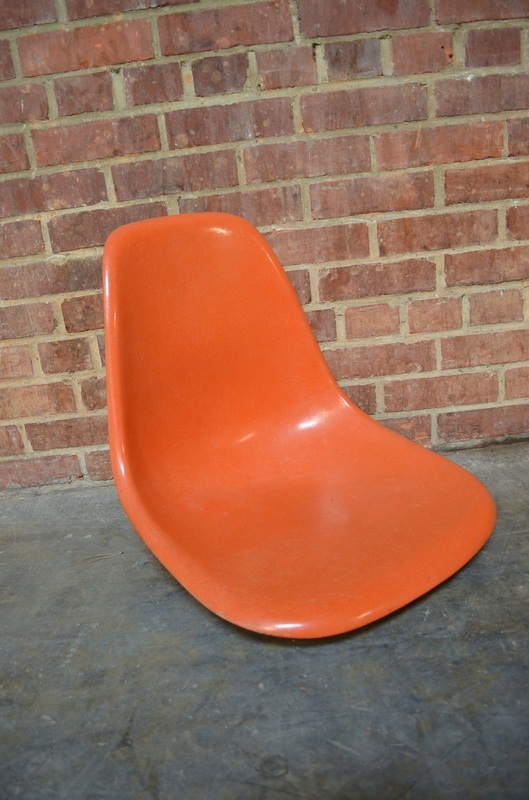 THIS CHAIR IS IN STORAGE. 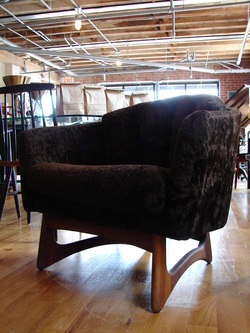 NEW UPHOLSTERY CAN BE DONE IN HOUSE FOR $475 IN CUSTOMERS OWN MATERIAL. 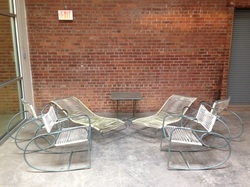 THESE CHAIRS BOTH RETAIN THEIR ORIGINAL NAUGAHYDE PADS AND 320 PARK AVE LABELS. THERE ARE NO BREAKS BUT THE PAINT HAS SOME WEAR THAT WE THINK ADDS TO THE APPEAL. 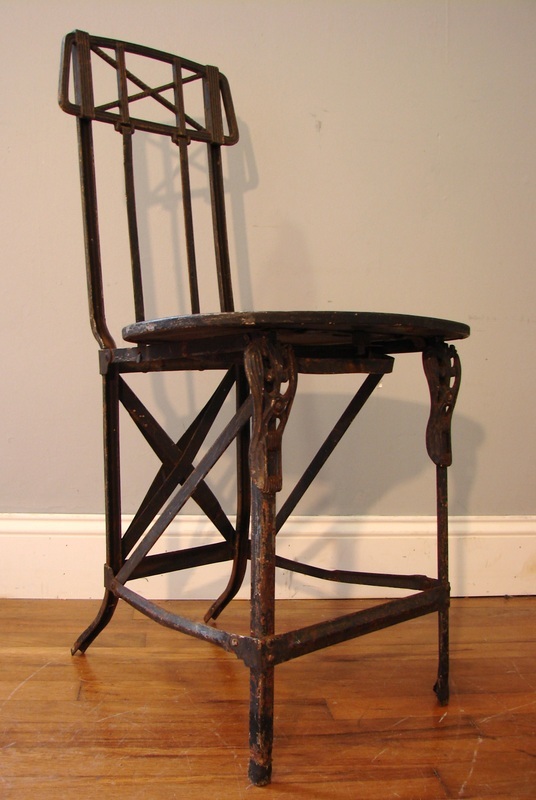 THIS CHAIR IS IN GREAT SHAP WITH A GOOD PATINA STARTING. 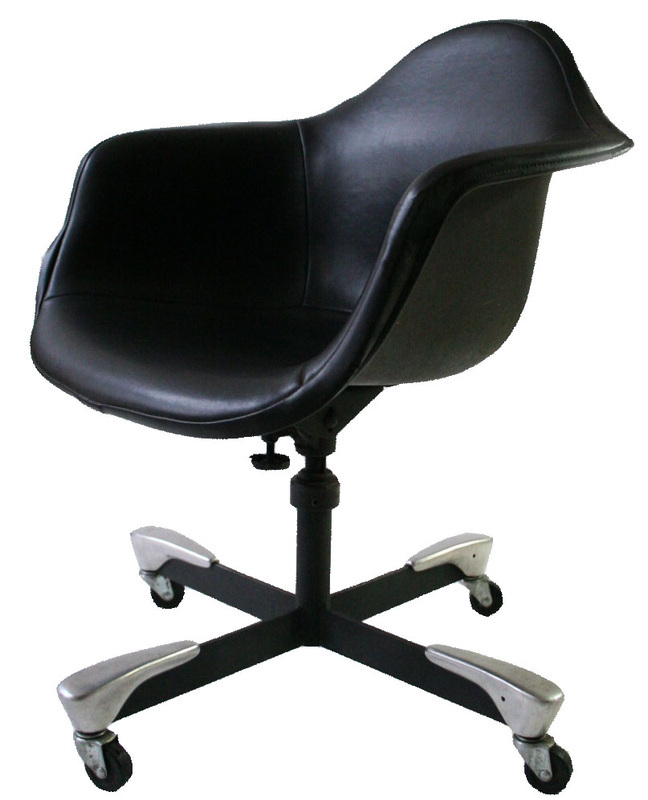 IT IS ADJUSTABLE AND IS SUPRISINGLY COMFORTABLE. 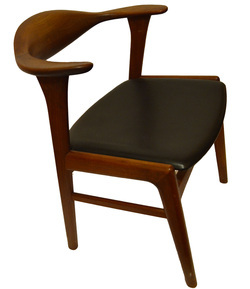 THE SCULPTURAL ARMS ON THIS CHAIR ARE GREAT. THE UPHOLSTERY IS IN GOOD SHAPE BUT IT IS A BIT FADED AND IN NEED OF A GOOD CLEANING. PROPERLY CLEANED THE COLOR SHOULD EVEN OUT SIGNIFICANTLY. 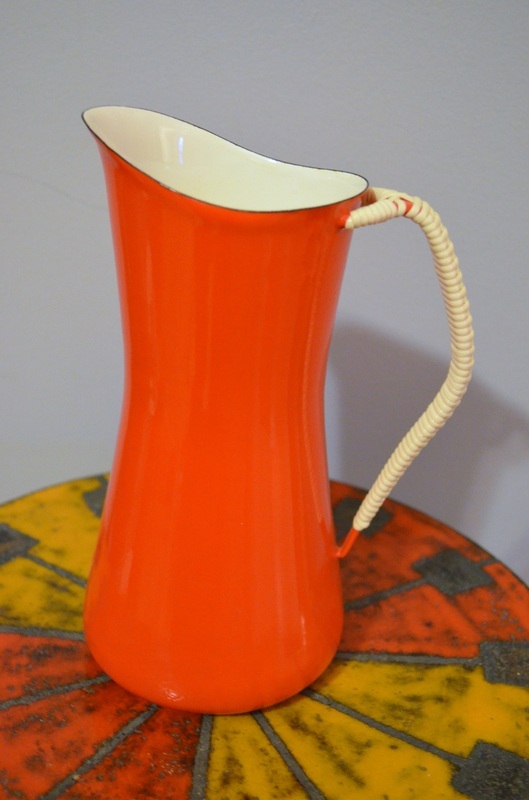 YOU COULD EVEN USE SOME FABRIC PAINT TO MAKE IT PERFECT AGAIN. THE WOOD IS IN DECENT SHAPE WITH NORMAL AGING TO THE FINISH. 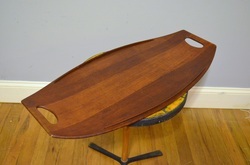 IF YOU REFINISHED THE WOOD AND HAD THIS RECOVERED IT WOULD LOOK AMAZING! THIS BOOKSHELF IS IN GREAT SHAPE. IT HAS NICE PEG LEGS MADE OF SOLID WALNUT AND THE THREE ADJUSTABLE SHELVES ARE IN NICE CONDITION. THE CONTRASTING BLACK BACK PANEL REALLY MAKES THE WALNUT SHINE! 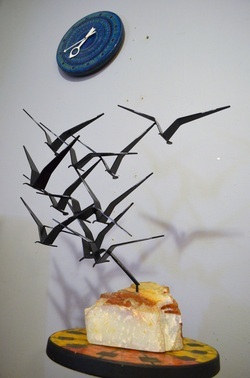 THIS SCULPTURE IS GREAT, VERY UNIQUE AND EXTREMELY WELL DONE. 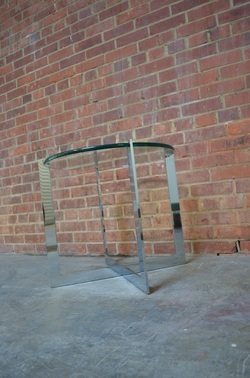 IT HAS NO BLEMISHES TO SPEAK OF AND THE LUCITE BASE JUST MAKES IT! WE ARE NOT SURE IF THIS IS ACTUALLY A WITCO PIECE OR NOT BUT IT CERTAINLY SEEMS LIKE IT. IT IS IN EXCELLENT CONDITION. THIS ORIGINAL PAIR OF END TABLES RETAIN THEIR ORIGINAL FINISH. THEY BOTH HAVE SOME IMPERFECTIONS, MOSTLY TO THE FINISH. 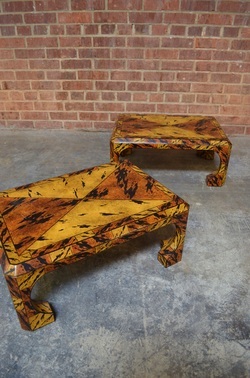 IF YOU SANDED THESE DOWN AND REDO THE FINISH THEY WILL BE ABSOLUTELY STUNNING! 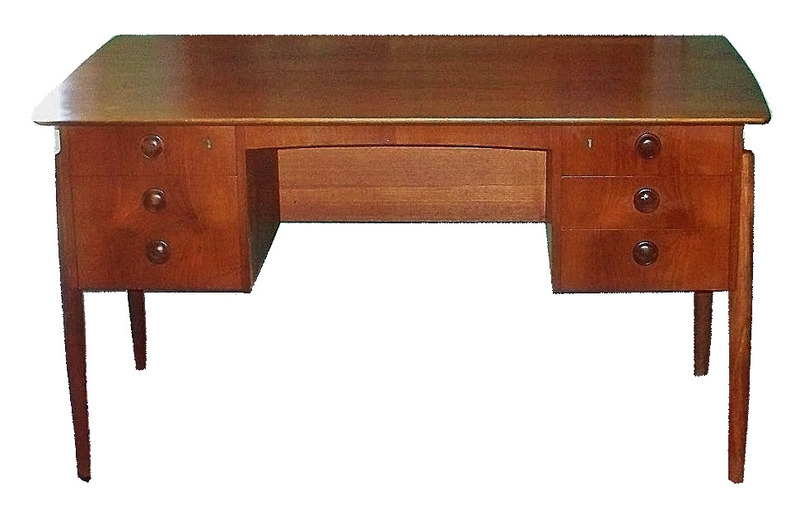 THIS GREAT SIMPLE DESK IS IN EXCELLENT, NEARLY PERFECT CONDITION. IT HAS A BURNT IN LOVIG STAMP AND A REALLY GREAT PAPER LABEL ON THE BACK. THE DESK IS NEARLY PERFECT WITH THE ONLY CONDITION ISSUE BEING THE MISSING KEY. 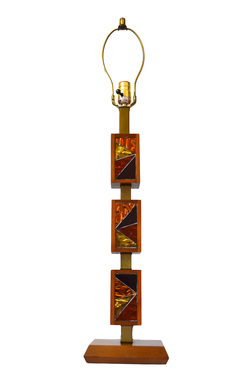 EVERYTHING FUNCTIONS ON THIS PIECE AND IT IS ALL THERE. THE OAK AND IRON ARE SUCH A PERFECT CONTRAST. THE MECHANISM IS REALLY COOL AND MECHANICAL LOOKING. THESE MAKE GREAT ART DISPLAY STANDS. 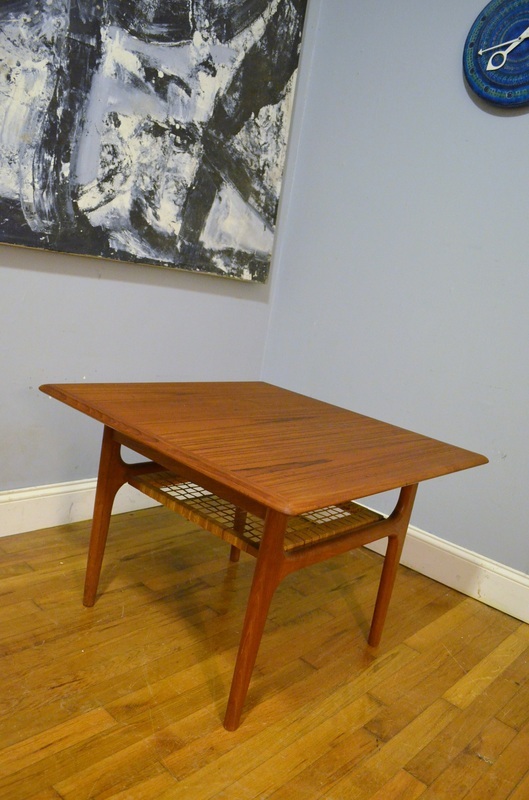 THIS IS ONE OF THOSE INCREDIBLY RARE DANISH TABLES THAT ACTUALLY USED SOLID TEAK. 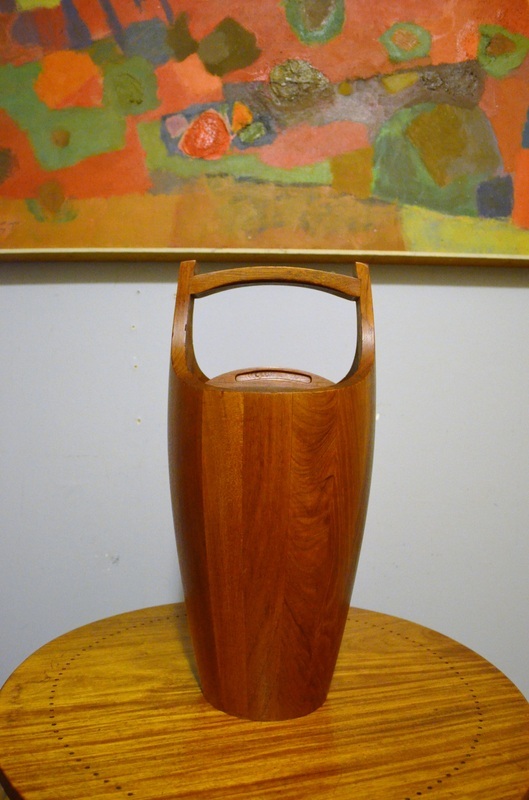 WE'RE NOT SAYING DANISH VENEER IS BAD BECAUSE ALMOST ALL OF THE BEST DANISH DESIGNS OUT THERE USED VENEER. A LOT OF PEOPLE ASK US FOR SOLID TEAK ITEMS. 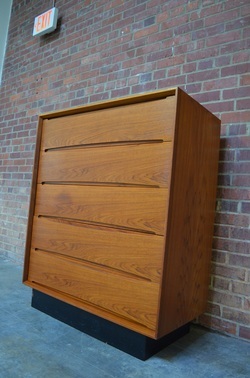 AMERICAN FURNITURE HAS GIVEN VENEER A BAD NAME BUT IF YOU DO WANT SOLID TEAK HERE THEY ARE! THESE TABLES ARE SUPER SCULPTURAL AND ARE IN EXCELLENT CONDITION. THEY BOTH HAVE THE FRANCE AND SON LABEL. THE PRICE IS FOR THE PAIR WHICH WE WILL NOT SPLIT UP. THIS CHAIR IS IN GREAT SHAPE, THE SLING COULD USE A GOOD CLEANING BUT IS STILL IN NICE, NEARLY NEW LOOKING CONDITION. THE FRAME IS READY TO GO. 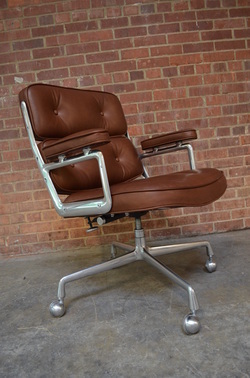 AFTER DOING A BIT OF RESEARCH IT APPEARS THAT THERE IS NO WAY TO KNOW 100% WHETHER THIS IS A TRUE KNOLL OR ONE OF THE EARLY REPRODUCTIONS OR IF IT WAS MANUFACTURED BY ONE OF THE COMPANIES THAT PREVIOUSLY HAD THE CONTRACT TO PRODUCE THIS CHAIR. EITHER WAY THIS IS A GOOD VINTAGE EXAMPLE OF THIS CLASSIC DESIGN. THIS GREAT LITTLE STOOL IS PERFECT. 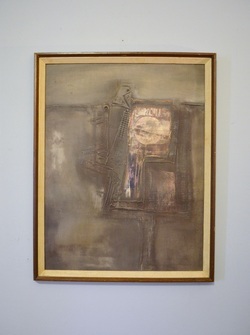 WE ARE ALMOST POSITIVE IT IS A HVIDT PIECE BUT CAN'T BE 100% CERTAIN. 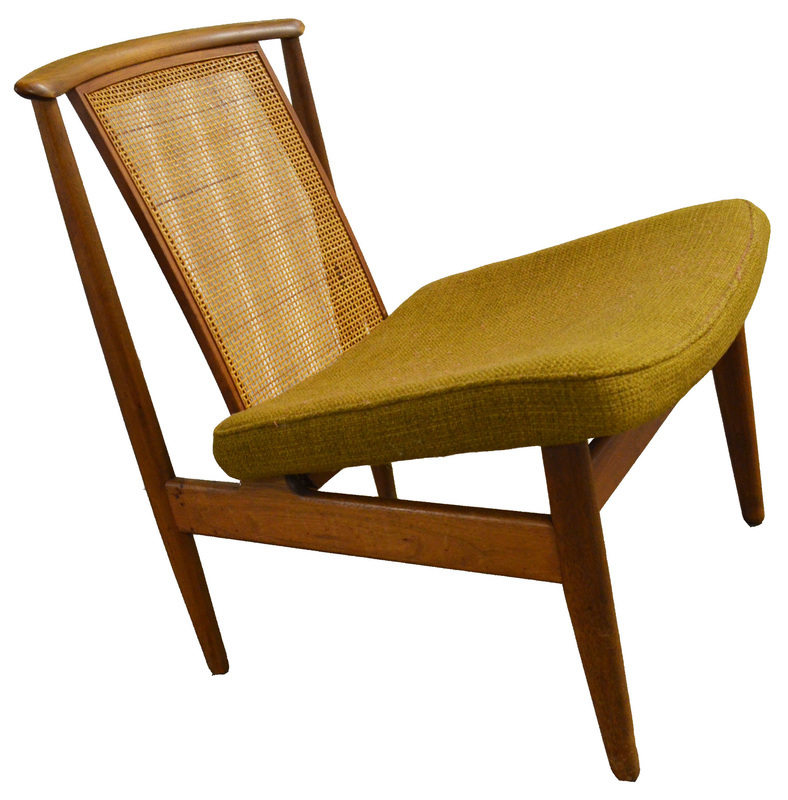 IT WILL MESH WELL WITH NEARLY ANY DANISH TEAK CHAIR FOR USE AS AN OTTOMAN. 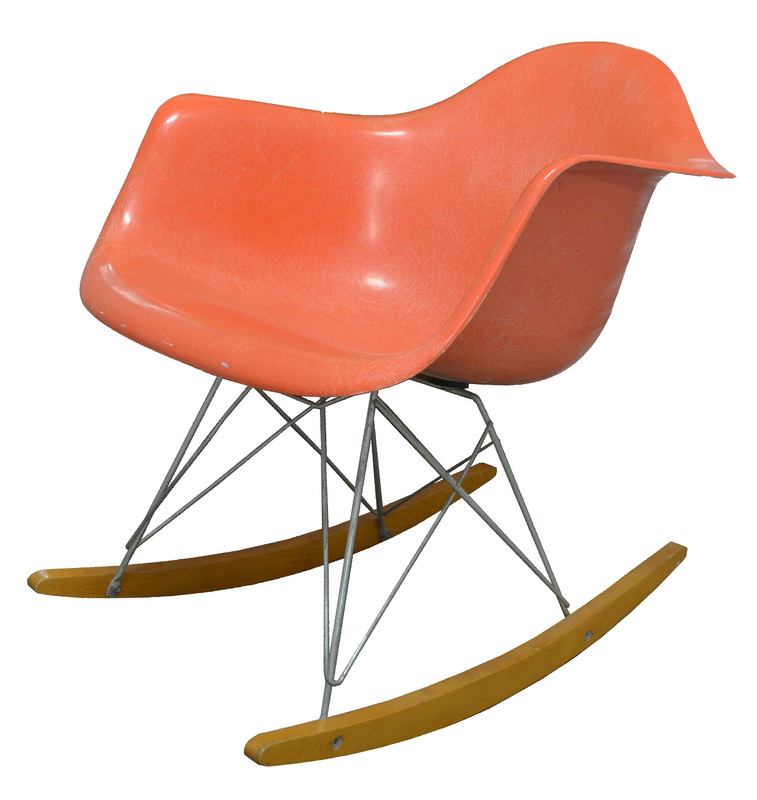 YOU CAN ALSO USE IT FOR SEATING OR JUST ABOUT ANYTHING ELSE. 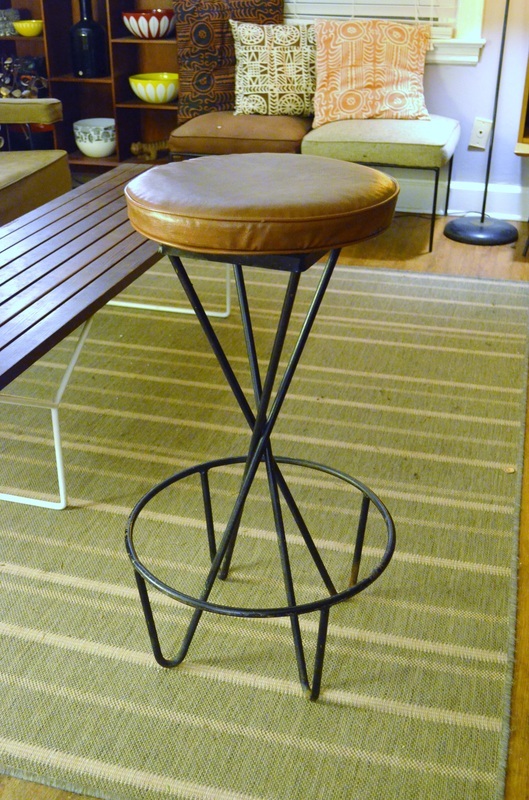 A COUPLE OF THE CORDS AR LOOSE BUT OVERALL THIS STOOL IS IN EXCELLENT CONDITION. 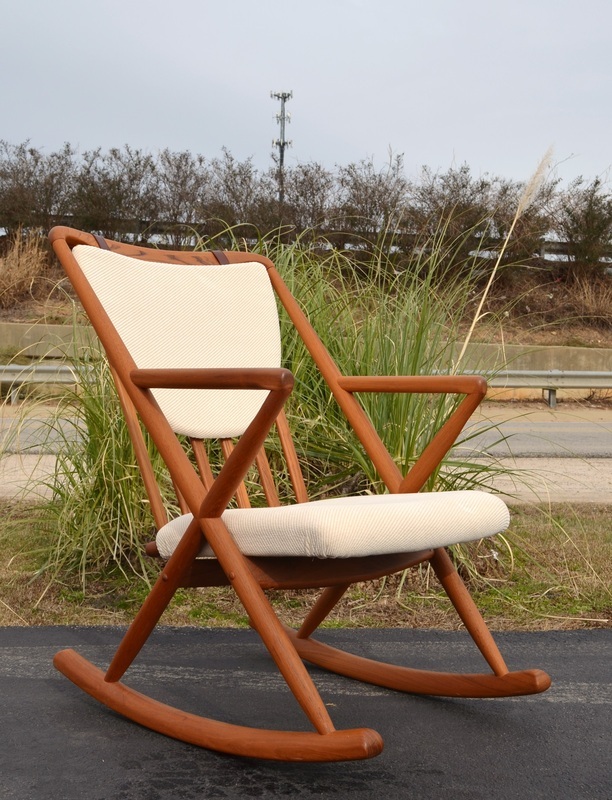 THIS ROCKER IS IN NEARLY PERFECT CONDITION. THE RARE GRIEGE SHELL HAS TONS AND TONS OF GORGEOUS VISIBLE FIBERS AND THE REPRODUCTION ROCKER BASE IS BRAND NEW. VERY COMFY AND STYLISH! 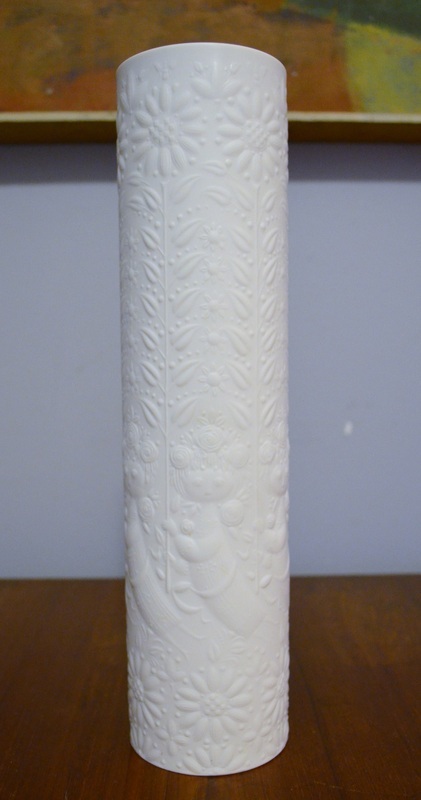 THIS CANDLESTICK IS IN LIKE NEW CONDITION. NORMALLY THESE ARE VERY BEAT UP AND HEAVILY WORN. 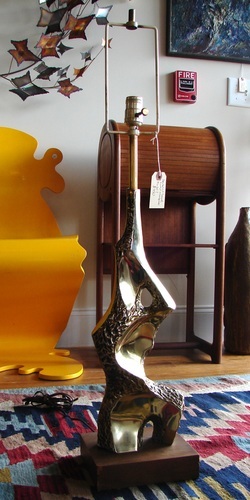 THIS ONE HAS BRIGHT PAINT AND THE BRASS STILL HAS A DECENT AMOUNT OF SHINE TO IT! IT COMES WITH THE CANDLES. THIS LAMP IS GREAT, IT FUNCTIONS JUST LIKE IT SHOULD. 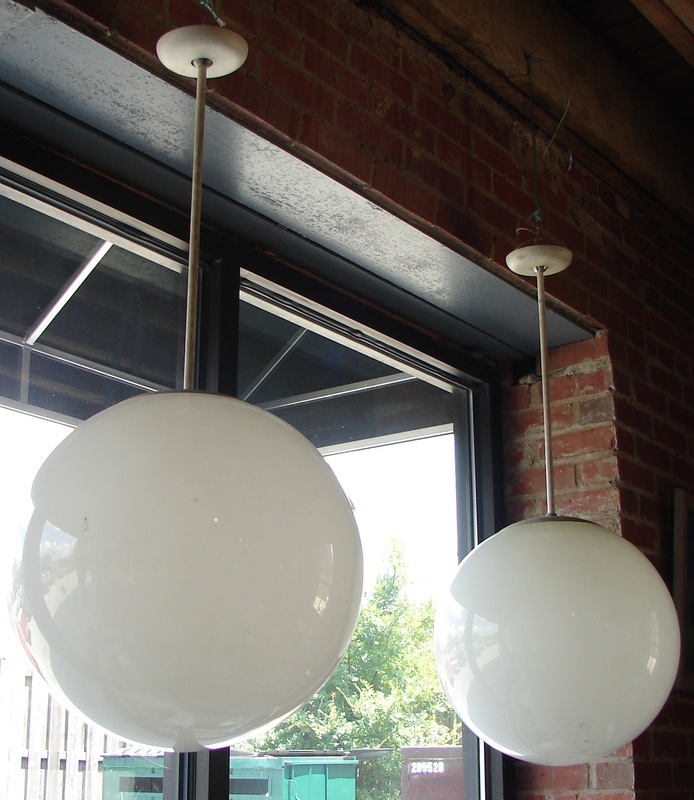 YOU CAN PULL IT DOWN FOR AN INTIMATE SETTING OR LIGHTLY PUSH IT UPWARDS AND THE CORD RETRACTS INTO THE CENTER PORTION TO GIVE YOU SOME HEADROOM. IT MUST BE HARDWIRED TO THE CEILING. 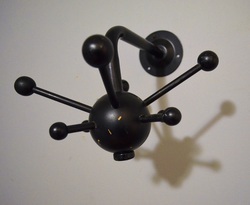 IT HAS A THREE WAY SWITCH WHICH CONTROLS THE THREE SOCKETS INSIDE THE LAMP ITSELF. THIS IS ONE OF THE MOST UNIQUE AND STUNNING COFFEE TABLES WE HAVE EVER HAD THE PLEASURE OF OWNING. 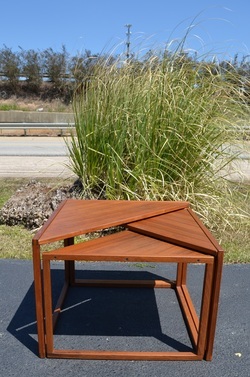 THE TEAK TOP AND OAK FRAMES MAKE SUCH A GREAT CONTRAST. 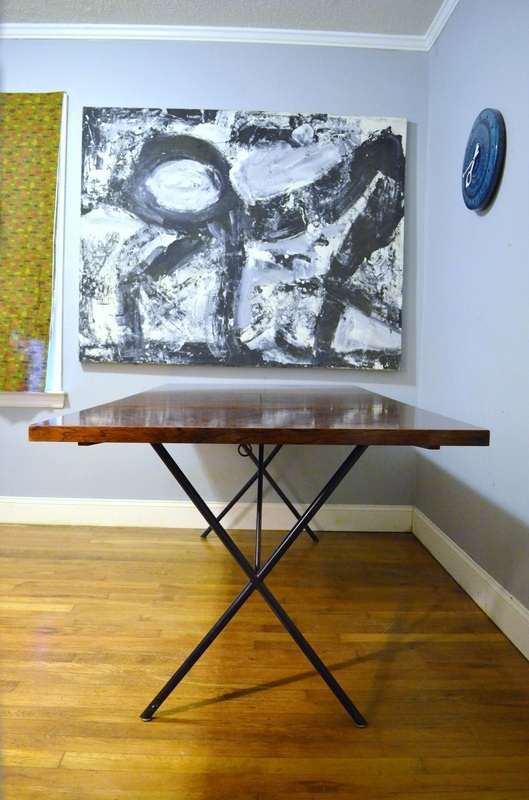 THE TABLES SLIDE INTO RAILS UNDERNEATH THE COFFEE TABLE AND ARE SUSPENDED FROM IT. THE CONSTRUCTION, CONDITION AND FORM OF THIS TABLE ARE ALL ABOUT AS GOOD AS IT GETS! 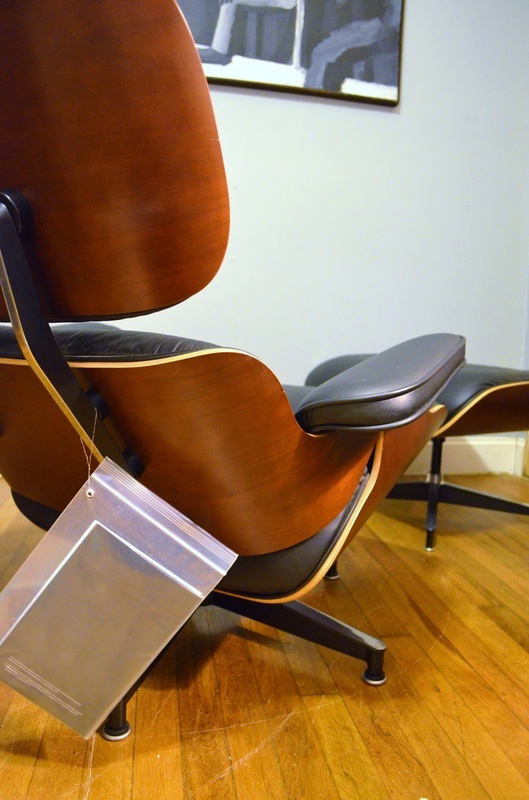 THIS DARK CHERRY EAMES LOUNGER IS FROM 2008 AND WAS ALMOST NEVER USED. IT IS ABOUT AS CLOSE TO MINT CONDITION AS YOU ARE GOING TO FIND. IT IS BASICALLY BRAND NEW. IT EVEN RETAINS IT'S ORIGINAL BOOKLETS THAT WERE NEVER REMOVED. THIS CHAIR IS 100% AUTHENIC AND SUPER COMFY! THIS LITTLE SET HAS A LOT OF GREAT STYLE. THE MOSAIC ANIMALS ARE VERY WELL DONE AND OVERALL THE TABLES ARE NEARLY PERFECT. VERY FREDERICK WEINBERG LOOKING. HERE IT IS, THE FAMOUS CHERNER ARM CHAIR! SO WONDERFUL TO LOOK AT BUT NOT REALLY MADE FOR SITTING IN... THIS EARLY EXAMPLE HAS THE "BERNARDO" LABEL. OVERALL THE CHAIR DOES LOOK NICE BUT IT DOES HAVE SOME ISSUES. 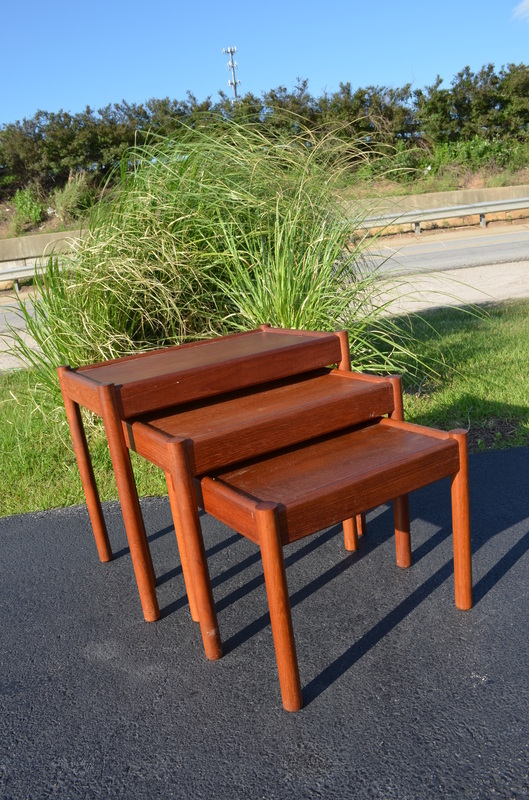 ONE OF THE LEGS HAS A CHIP ABOUT A HALF INCH SQUARE, IT'S BEEN REFINISHED, THE SEAT HAS SOME DENTS IN IT AND THE ARM PORTION HAS SOME SEPARATION OF THE PLYWOOD ACROSS THE BACK PORTION. THE ONLY OTHER MAIN ISSUE IS THAT THE BOLTS ARE NOT ORIGINAL. THE LEGS WERE REMOVED FROM THE BASE SO IT IS NOT VERY STABLE FOR SITTING IN, IT IS MORE TO LOOK AT UNLESS YOU DO SOME FAIRLY SERIOUS TIGHTENING UP. OTHER THAN THESE ISSUES THIS CHAIR LOOKS AMAZING IN PERSON AND MAKES A REAL STATEMENT. NICE HIGH END TABLE IN DECENT CONDITION. THE CHROME IS EXCELLENT BUT THE VENEER NEEDS A BIT OF ATTENTION. 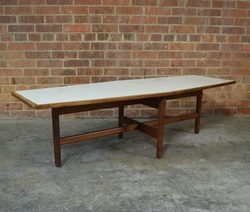 NICE PARCHMENT SHELL WITH A REPRODUCTION SOLID WALNUT RUNNER BASE. 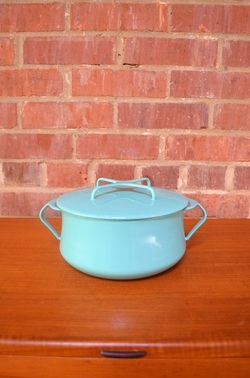 THE SHELL HAS A FEW SPOTS HERE AND THERE BUT OVERALL IT SHOWS VERY WELL FOR A VINTAGE EXAMPLE OF THIS HARD TO FIND COLOR. THIS EXCEEDINGLY HARD TO FIND GLOBE IS IN EXCELLENT CONDITION. IT HAS THE ORIGINAL WIRING BUT IT IS READY TO USE. 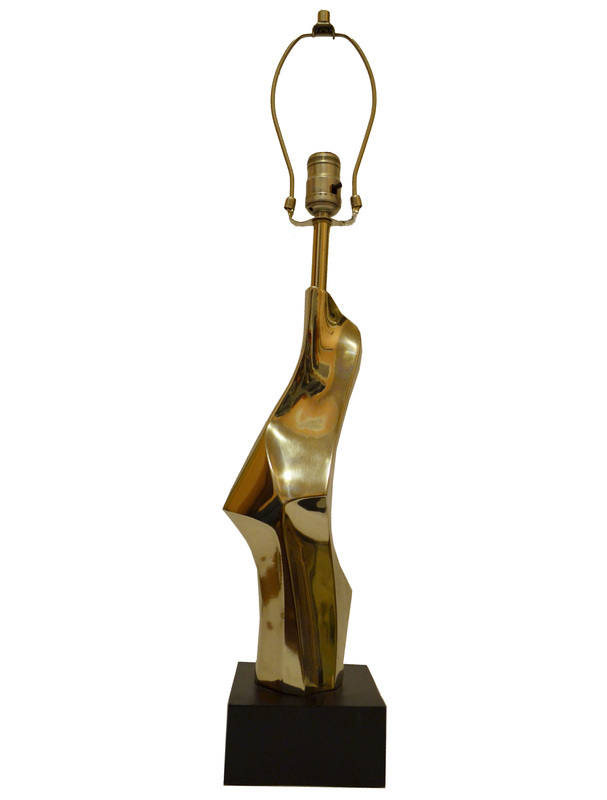 THE HARDWARE ON THIS LAMP IS INCREDIBLY NICE. 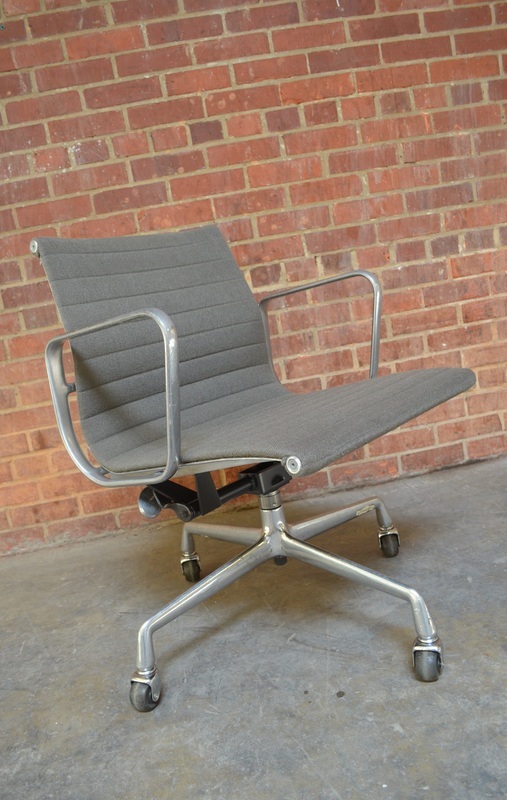 THIS IS A MODERN HERMAN MILLER PRODUCTION TABLE. IT IS IN NEARLY NEW CONDITION. IT HAS A BLACK FORMICA TOP AND ALUMINUM BASE. THIS CHAIR HAS EXCELLENT DETAILING THROUGHOUT. VERY UNUSUAL AND STRANGE. 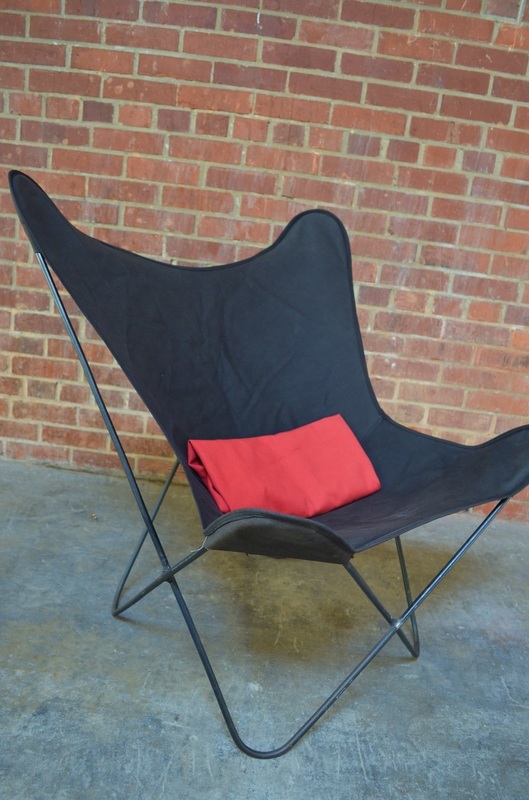 YOU JUST WOULDN'T THING SOMEONE WOULD PUT SO MUCH TIME INTO A FOLDING CHAIR. IT IS MISSING ONE BOLT BUT STILL FUNCTIONS AS IS. YOU CAN BUY THEM FOR $20 A PIECE OR $100 FOR ALL, THE ONE IN THE BOX AND THE GIRAFFE WILL BE $25. THIS COFFEE TABLE HAS BEEN COMPLETELY REFINISHED. IT WAS NOT IN GOOD SHAPE WHEN WE GOT IT BUT IT HAS BEEN REGLUED, REFINISHED AND COMPLETELY REDONE. THE GLASS IS FREE FROM CHIPS BUT THE SURFACE DOES HAVE A FEW LIGHT SCRATCHES THAT ARE ONLY NOTICEABLE WHEN YOU ARE LOOKING FOR THEM. 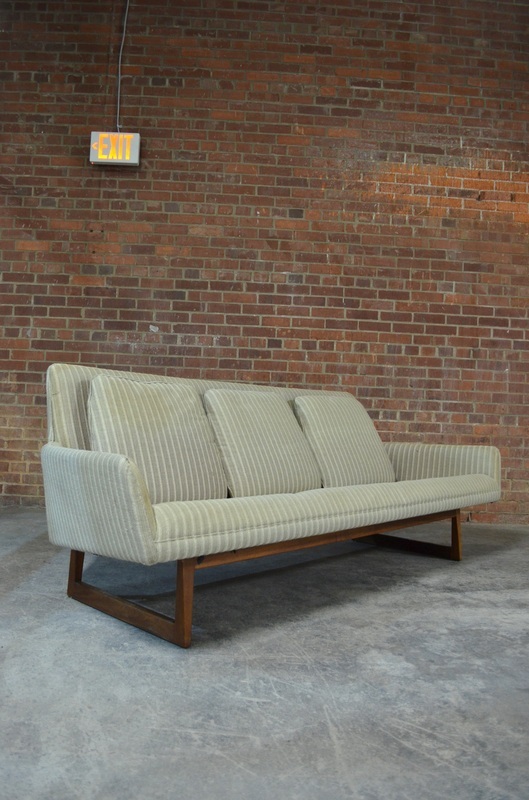 WE'RE PRETTY SURE THIS SOFA IS TEAK, THE LEGS DEFINETLY ARE BUT THE ARM RESTS SEEM LIKE THEY COULD BE MAHOGANY WITH A TEAK OIL FINISH. EITHER WAY THIS SOFA IS ABSOLUTELY STUNNING IN PERSON. THE FABRIC IS IN DECENT USABLE CONDITION. 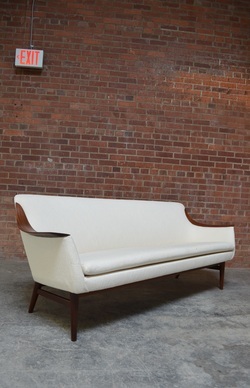 THE BACK HAS A FEW MINOR ISSUES AND THERE IS SOME FOAM STARTING TO HARDEN BUT OVERALL THIS IS SUCH A BEAUTIFUL SOFA! WE CAN HAVE IT RECOVERED IN YOUR MATERIAL FOR AN ADDITIONAL $775. THIS WILL INCLUDE NEW FOAM, STRAPS, LABOR AND BATTING. 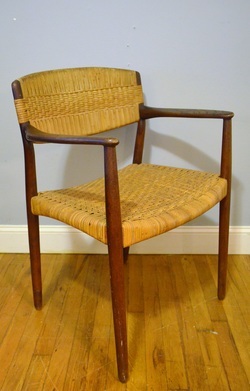 THIS INCREDIBLY SCARCE CHAIR IS IN DECENT SHAPE. THE NAUGAHYDE BACKING HAS A FEW HOLES AND THE MATERIAL COULD USE A CLEANING . THE ALUMINUM COULD ALSO STAND TO BE POLISHED BUT OVERALL THE CHAIR IS USABLE AND INSANELY COMFY! 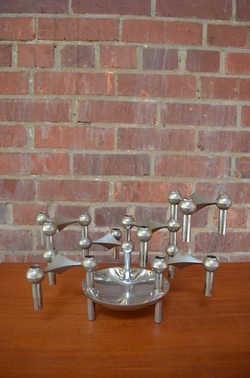 AMAZING ALUMINUM COFFEE TABLE BY OHIO ARTIST DONALD DRUMM. 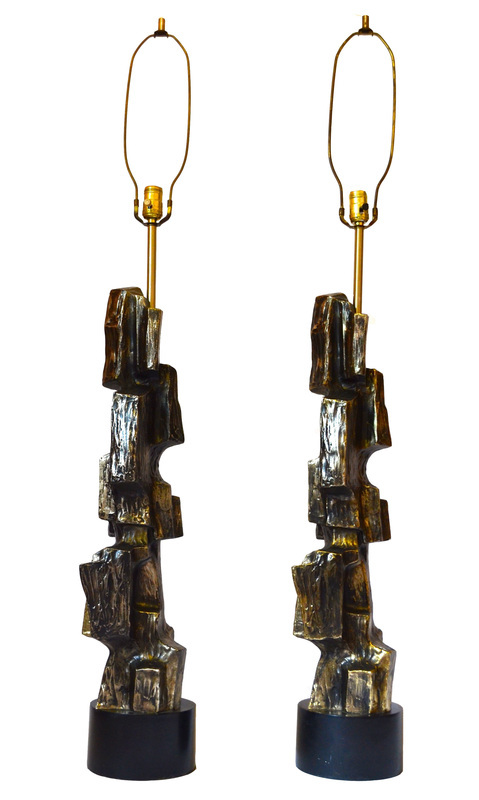 THIS IS A VERY HIGH END PIECE IN EXCELLENT CONDITION. IT COULD USE A CLEANING BUT IT'S ALL THERE READY TO USE. THE REPLACEMENT GLASS TOP HAS A COUPLE OF CHIPS BUT CAN BE SWITCHED OUT EASILY. 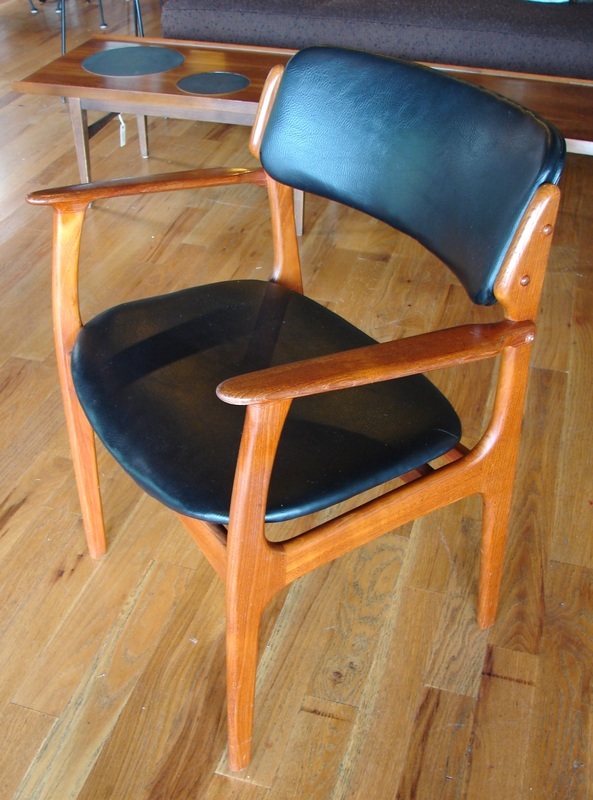 THIS GORGEOUS CHAIR HAS AN EARLY BURNT IN DANISH CONTROL LABEL. 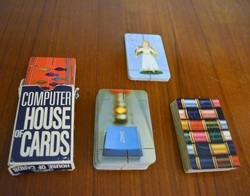 IT IS IN EXCELLENT USABLE CONDITION OVERALL. 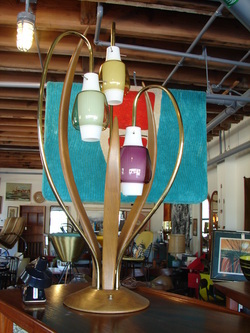 THIS LAMP IS IN EXCELLENT ORIGINAL CONDITION. IT IS ABSOLUTELY UNTOUCHED. 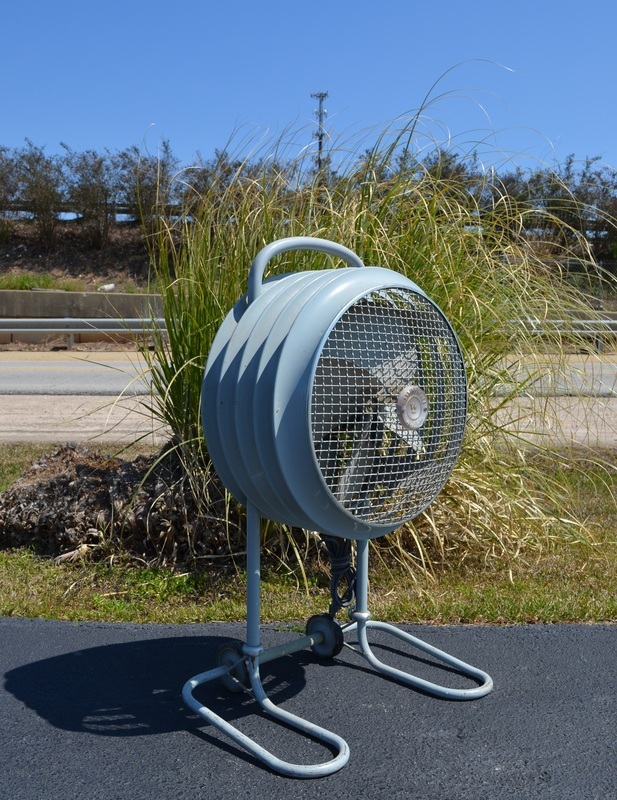 THE SHADE IS IN GREAT SHAPE AND IT WORKS JUST LIKE IT SHOULD. 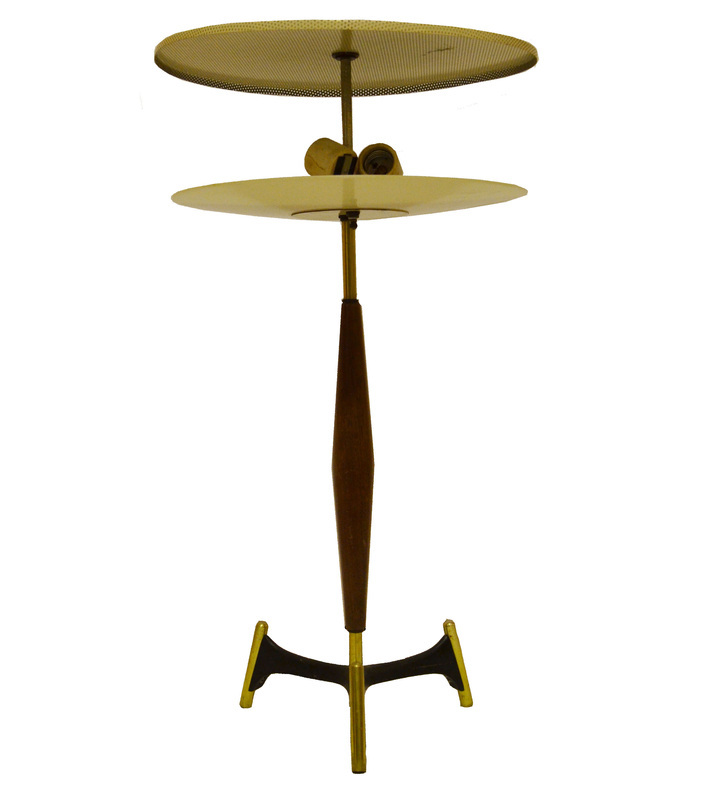 THIS DESIGN IS COMMONLY ATTRIBUTED TO BAUGHMAN BUT IT IS A SELIG IMPORT. THE FABRIC IS USABLE BUT BECOMING A LITTLE WORN. THERE ARE A COUPLE OF SMALL AREAS OF WEAR TO THE CHROME ON THE BOTTOM. 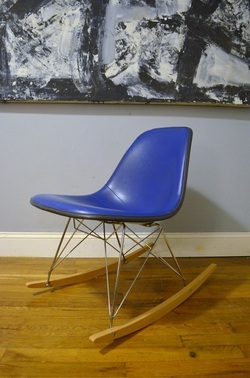 OVERALL THIS IS A KILLER LOOKING CHAIR EVEN WITH THE BLEMISHES. THIS VALET IS IN OVERALL GOOD CONDITION. IT DOES HAVE SOME LOSS TO THE FINISH IN AREAS AND SOME LIGHT WEAR. YOU JUST CAN HELP FEELING CLASSY SLIPPING A SPORT COAT OFF OF THIS! THIS IS THE LARGEST PIECE OF BLENKO WE'VE EVER HAD THE PLEASURE OF OWNING. IT STANDS JUST SHY OF 28 INCHES TALL. IT IS IN PERFECT CONDITION OTHER THAN WEAR ON THE BOTTOM FROM BEING MOVED. THE EMERALD GREEN GLASS IS BEAUTIFUL. THIS GORGEOUS SOLID TEAK SOFA IS IN EXCELLENT CONDITION. 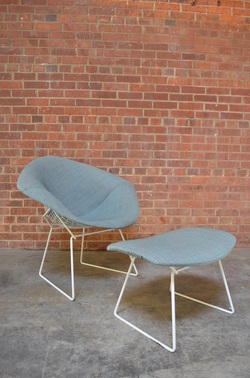 IT EVEN RETAINS IT'S ORIGINAL WOOL CUSHIONS. 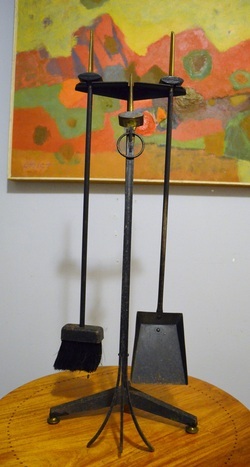 EXCELLENT SET IN VERY GOOD CONDITION. THERE ARE A FEW VERY MINOR IMPERFECTIONS BUT NOTHING MAJOR. 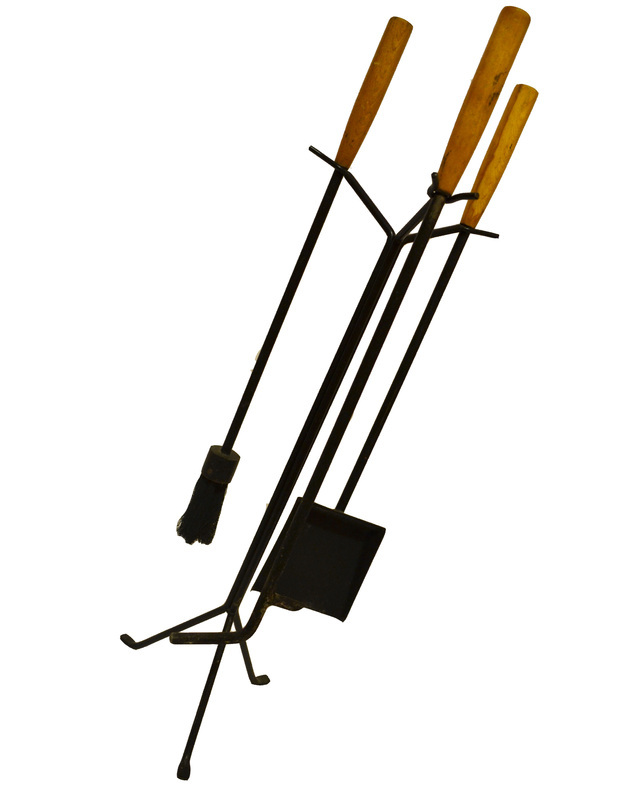 THE LEGS COME OFF WITH A SINGLE BOLT MAKING SHIPPING EXTREMELY EASY. 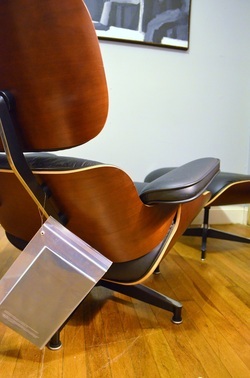 PROBABLY THE MOST FAMOUS CHAIR OF ALL TIME! THIS CHAIR IS IN DECENT SHAPE FOR IT'S AGE. ONE ARM HAS SOME CRACKING TO THE LEATHER. THE BOTTOM SHELL WAS SLIGHTLY DRILLED BUT BOLTS WERE NEVER INSTALLED. IT IS ALMOST IMPOSSIBLE TO TELL UNLESS YOU ARE LOOKING FOR IT. ONE SHOCK MOUNT HAS STARTED TO COME UNGLUED. OTHERWISE THIS CHAIR IS IN EXCELLENT CONDITION. WE DO NOT HAVE AN OTTOMAN. 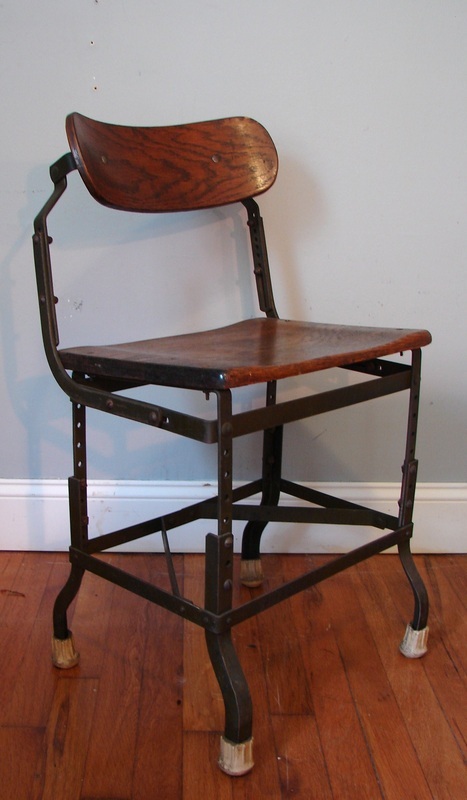 THIS VINTAGE CHAIR IS AUTHENTIC AND IN GREAT WORKING ORDER. THESE ARE SUPER COMFY AND WILL LAST A LIFETIME OR MORE! 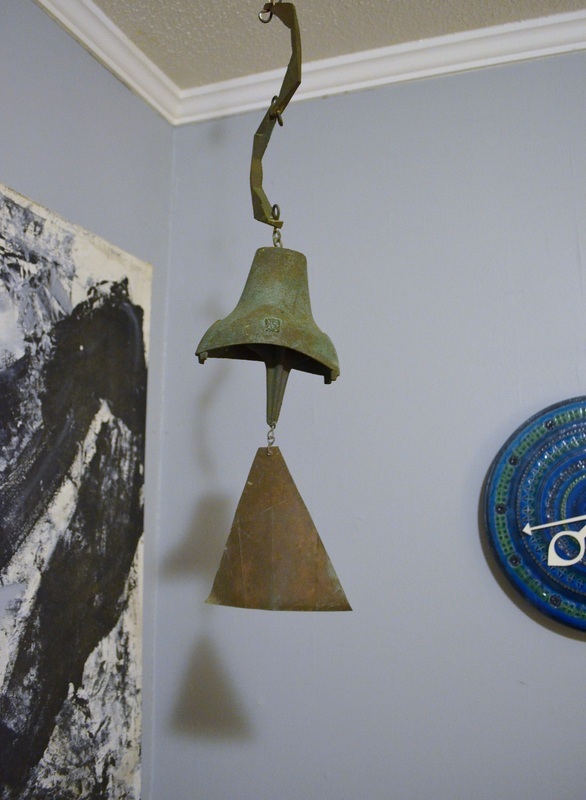 THIS VINTAGE SET OF WOODSTOCK GARDEN BELLS HAS SEEN DECADES OF USE. 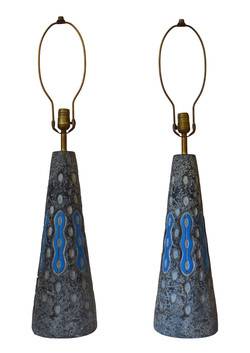 THE BELLS AR HEAVILY PATINATED AND SOUND WONDERFUL. THIS JERE SCULPTURE IS IN EXCELLENT CONDITION AND HAS A GREAT PATINA STARTING ON IT. WE COULDN'T FIND ANY DAMAGE TO IT. THIS TABLE IS IN 100% ORIGINAL, UNTOUCHED CONDITION. IT IS NEARLY FLAWLESS AND RETAINS THE TWO ORIGINAL LEAVES. IT COULD EASILY ACCOMODATE AT LEAST 8-10 PEOPLE. 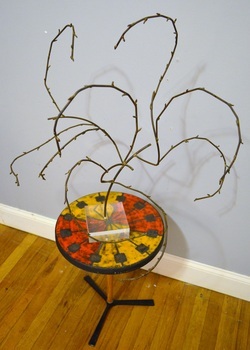 OR REMOVE THE LEAVES AND IT CAN BE USED AS A FOUR PERSON TABLE, A GREAT DESK OR CRAFT TABLE. 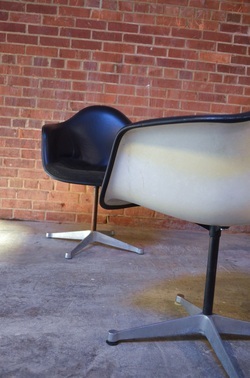 ORIGINAL EAMES SPLINT IN VERY GOOD ORIGINAL CONDITION. IT HAS A COUPLE OF MINOR BLEMISHES BUT NOTHING MAJOR. 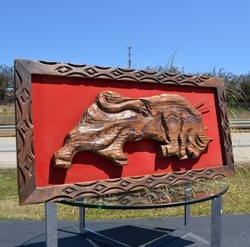 THIS WOULD LOOK GREAT MOUNTED! IF THIS DOESN'T SELL QUICK IT MAY DISAPPEAR BACK INTO OUR HOME, IT'S REALLY A NICE SCULPTURAL PIECE OF DESIGN HISTORY THAT'S EASY TO DISPLAY.